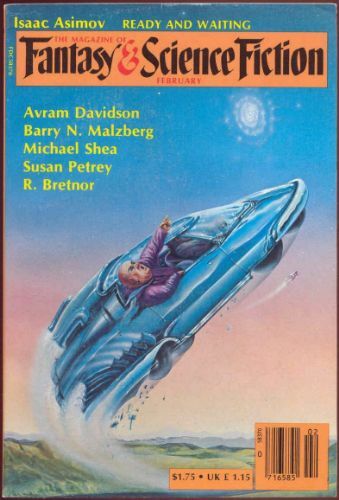 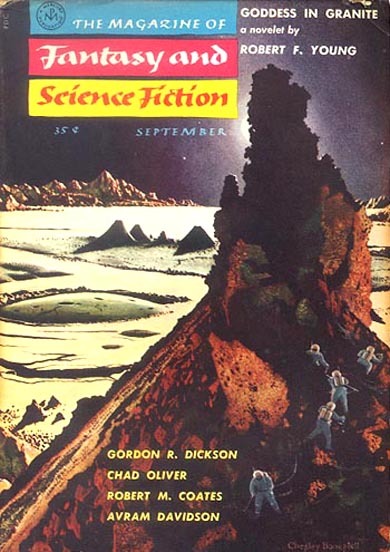 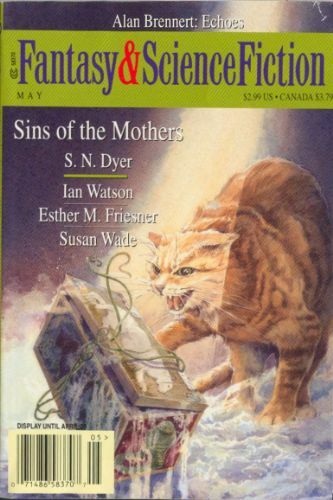 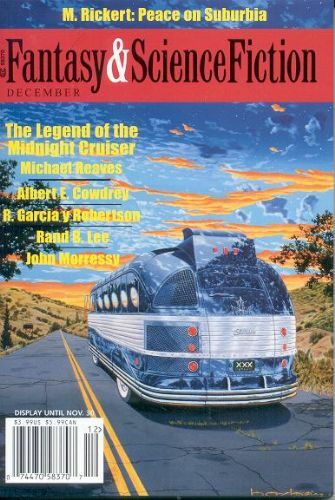 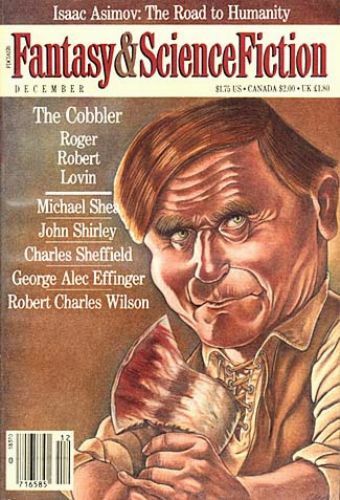 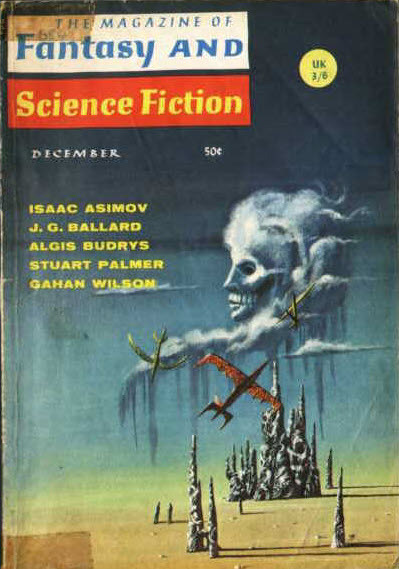 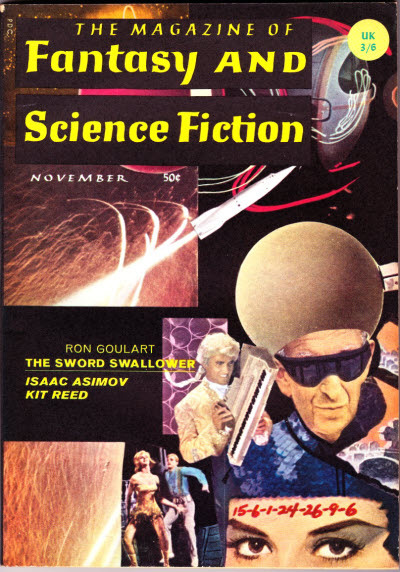 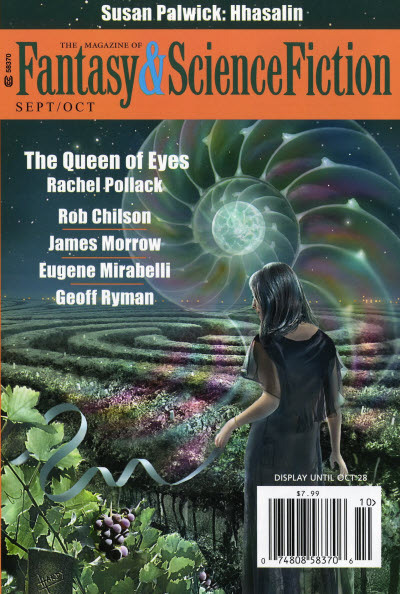 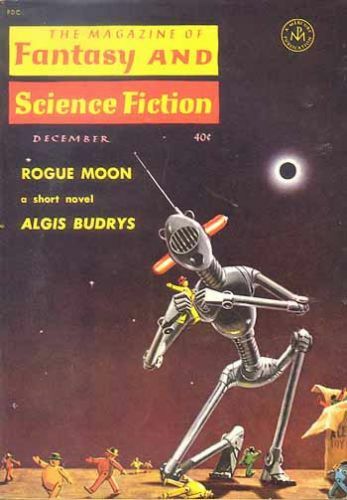 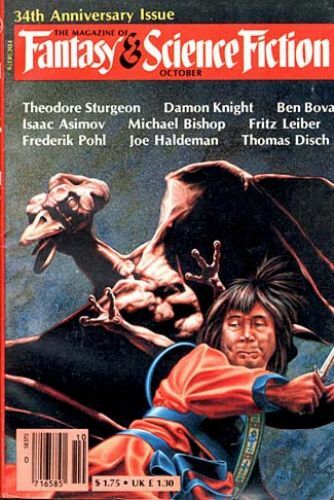 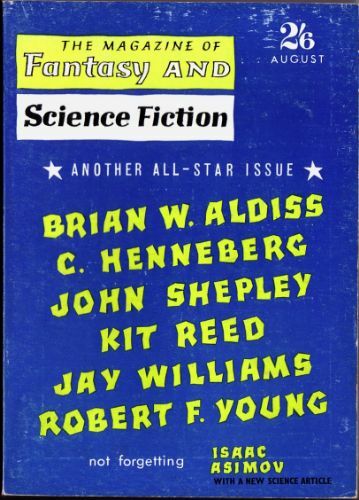 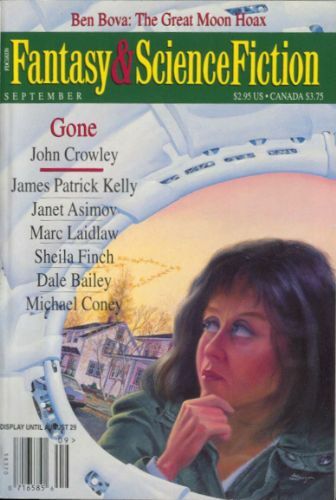 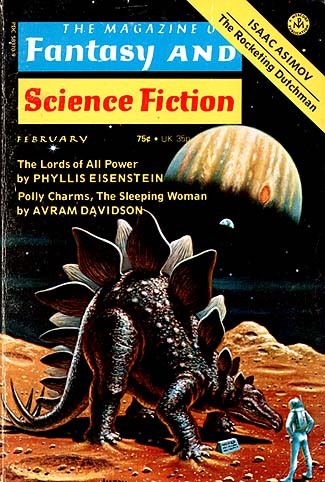 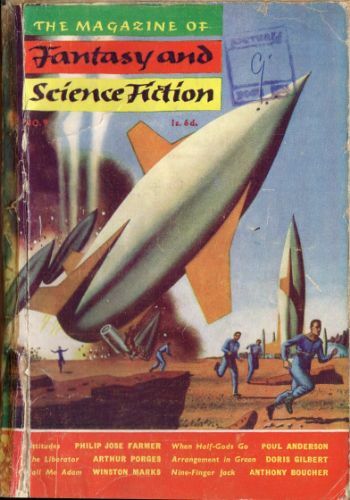 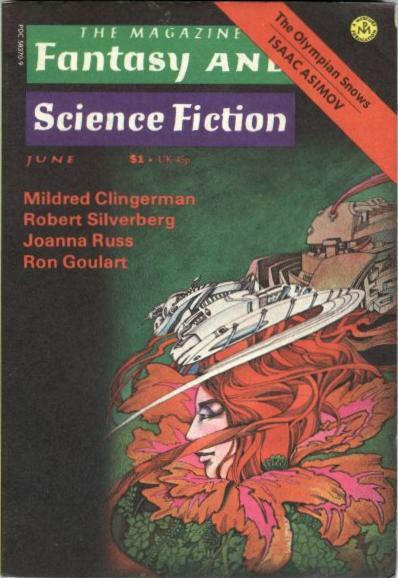 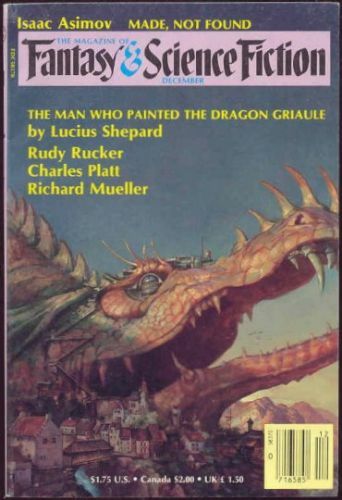 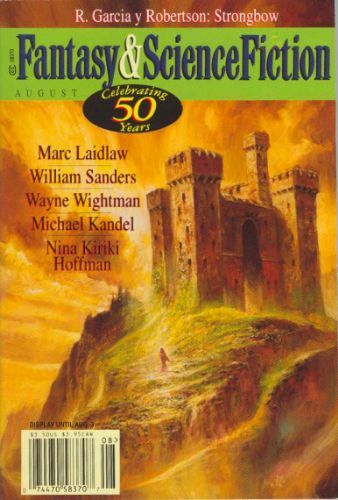 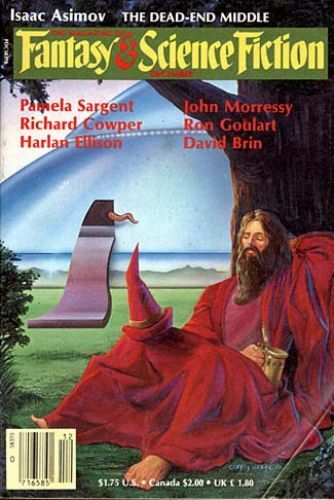 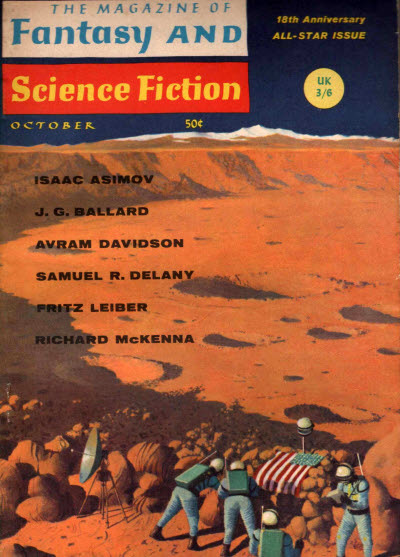 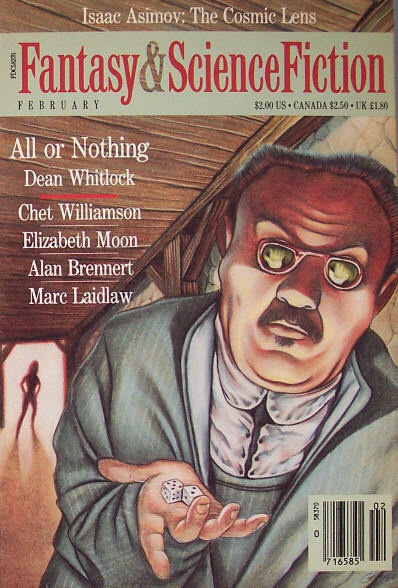 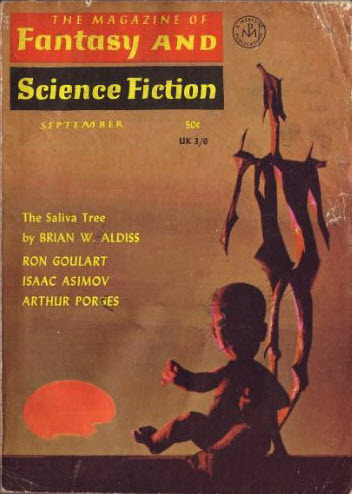 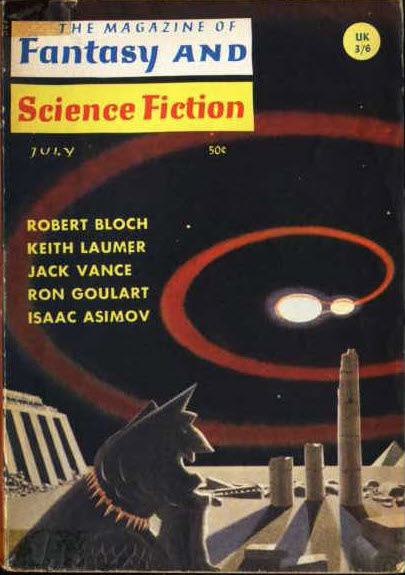 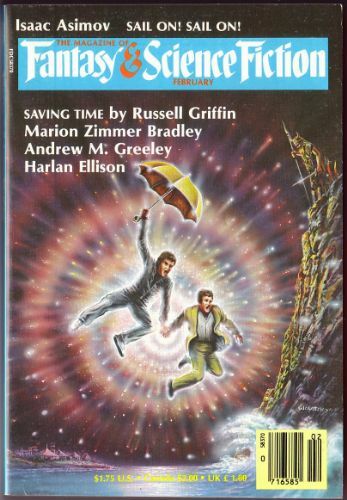 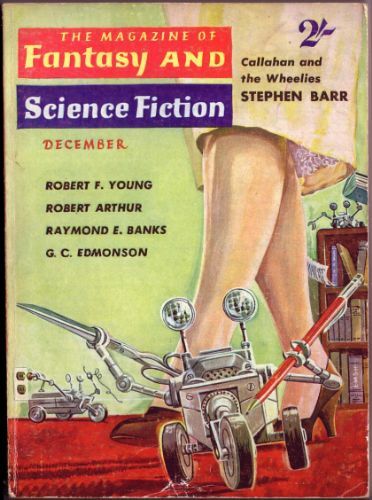 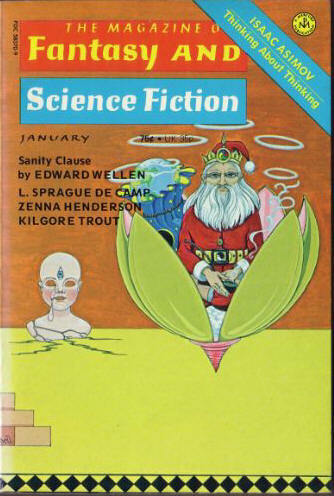 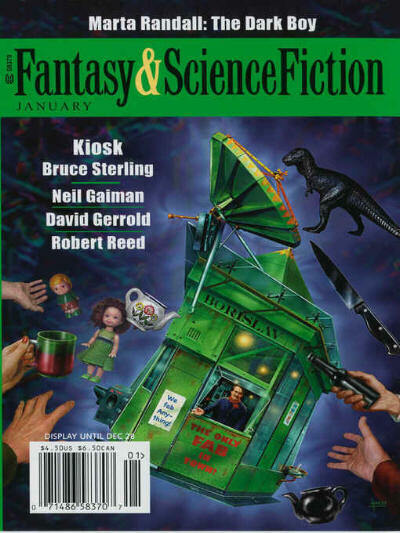 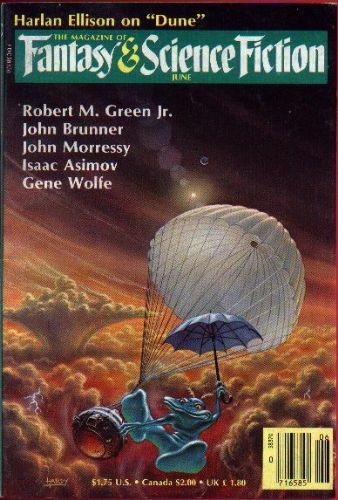 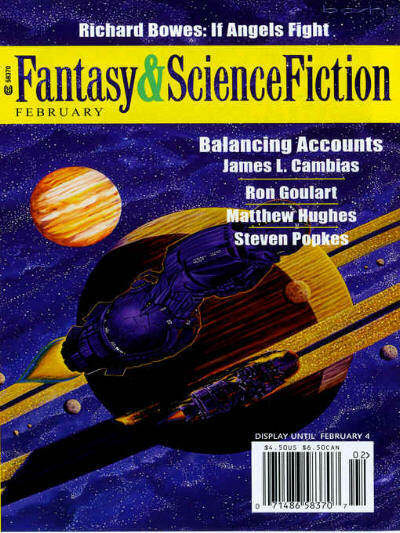 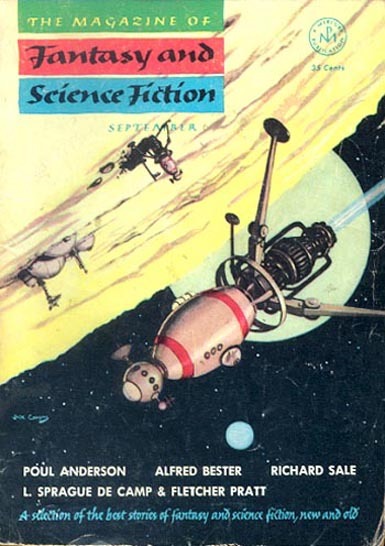 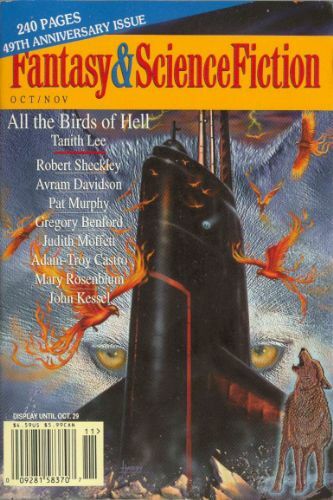 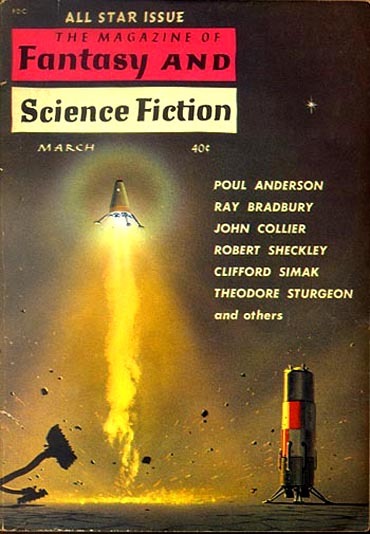 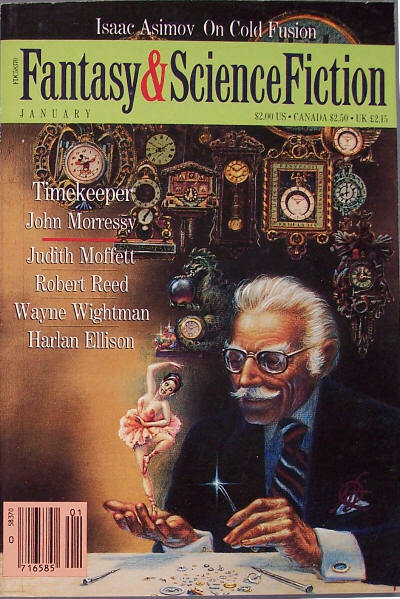 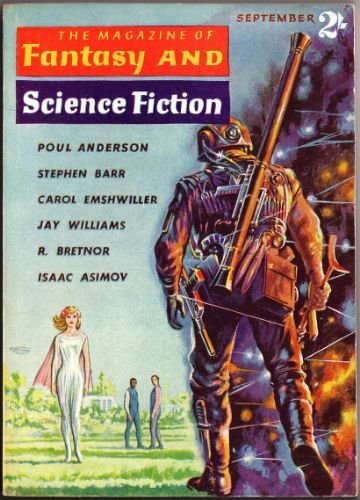 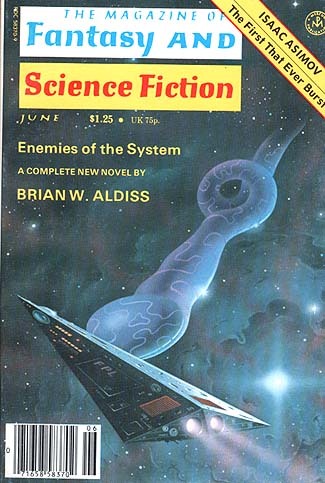 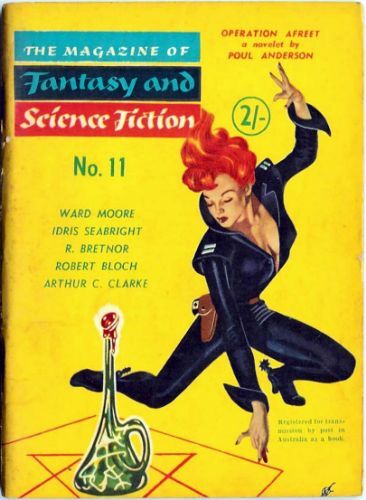 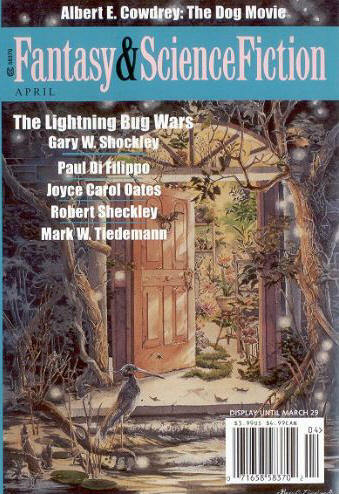 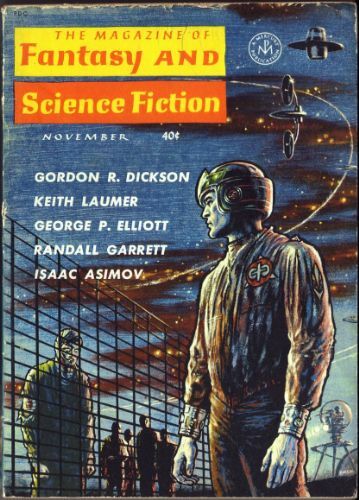 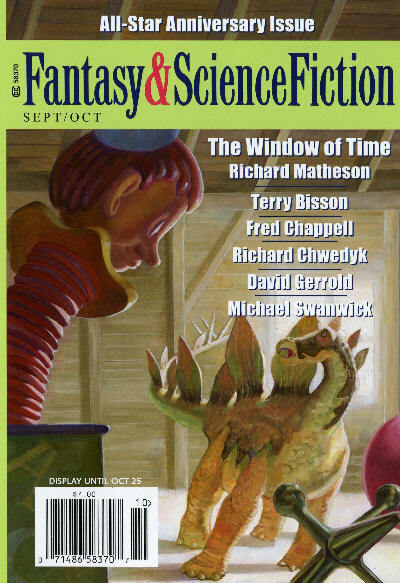 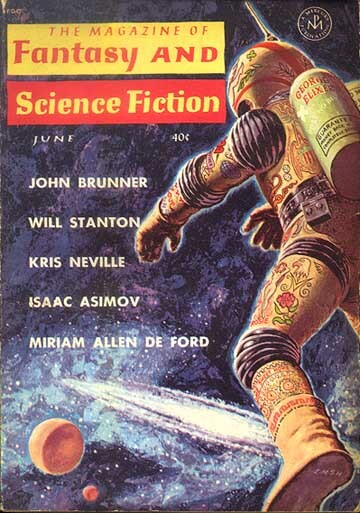 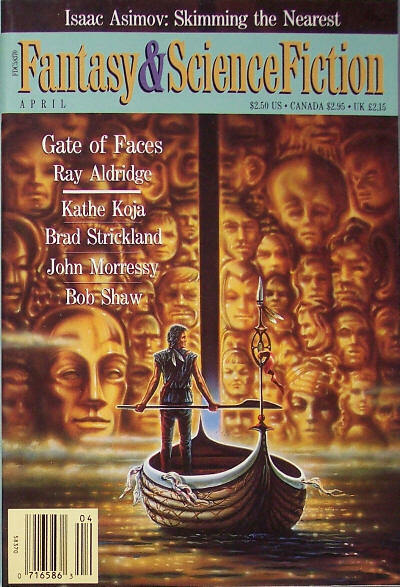 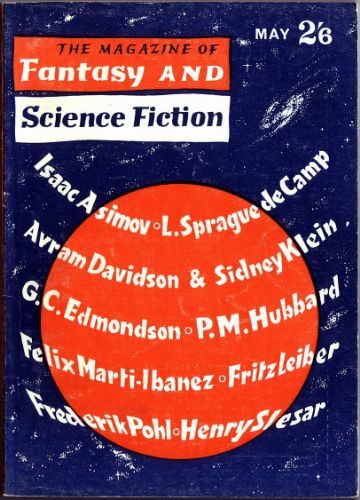 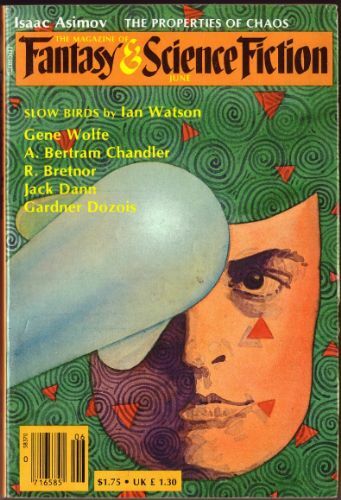 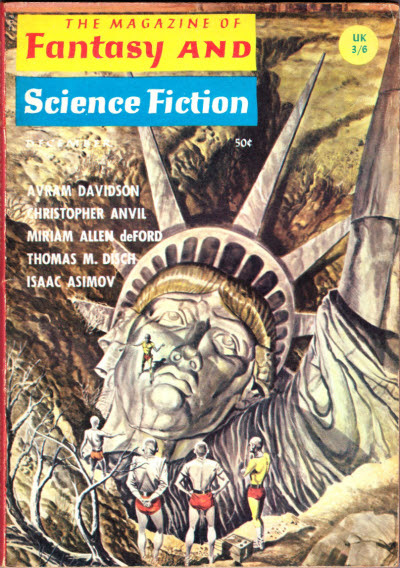 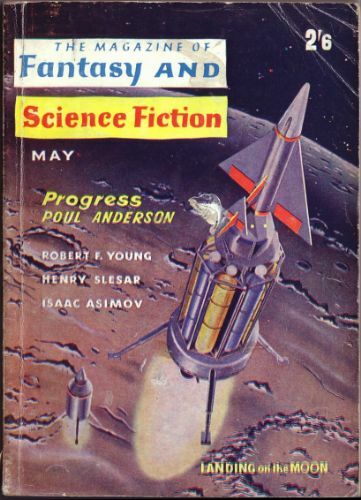 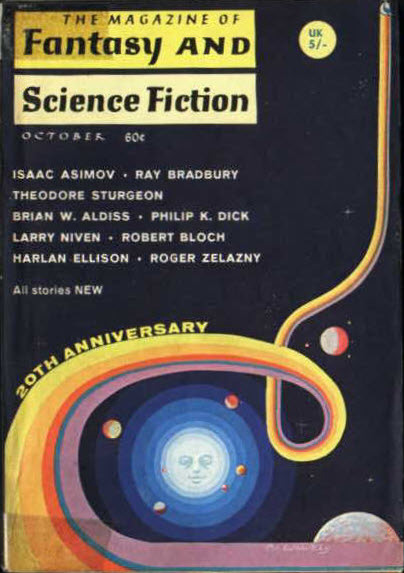 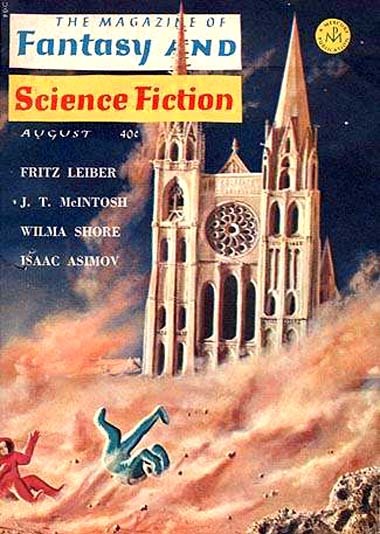 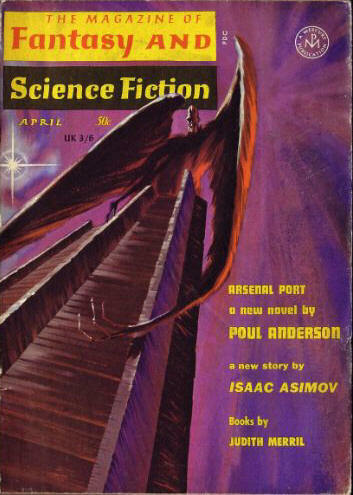 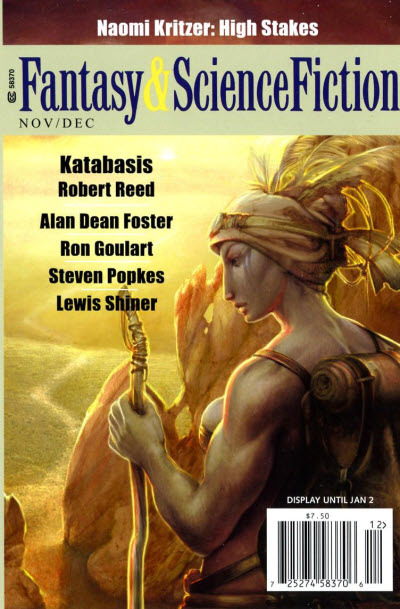 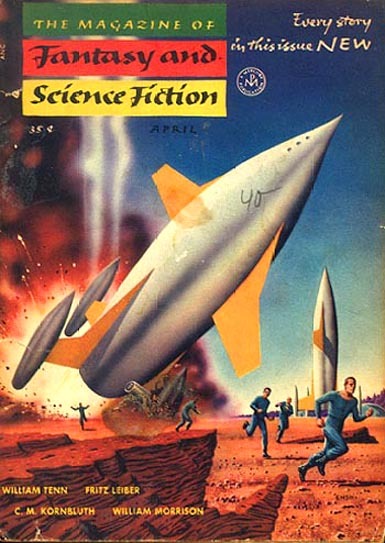 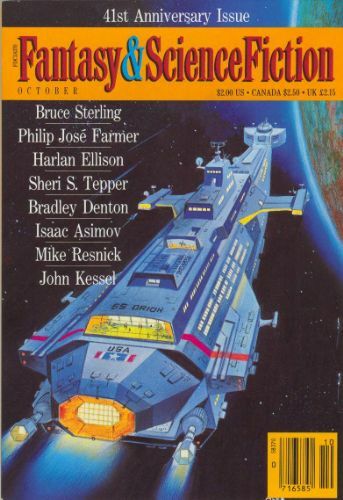 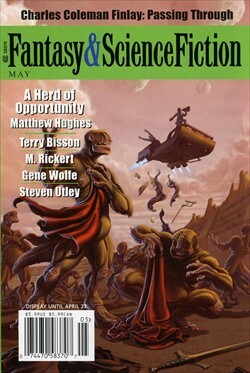 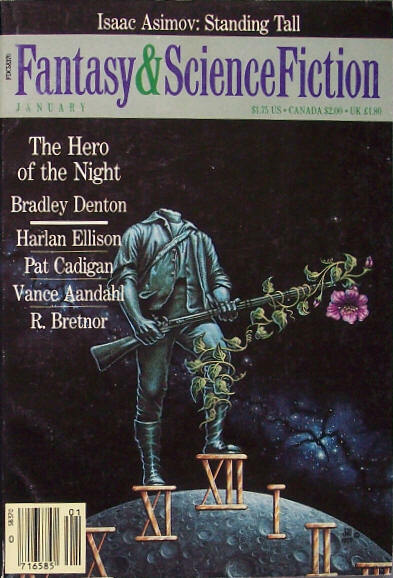 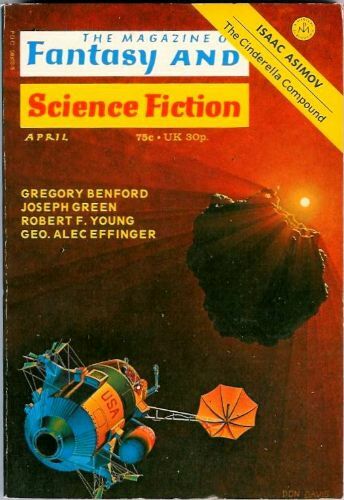 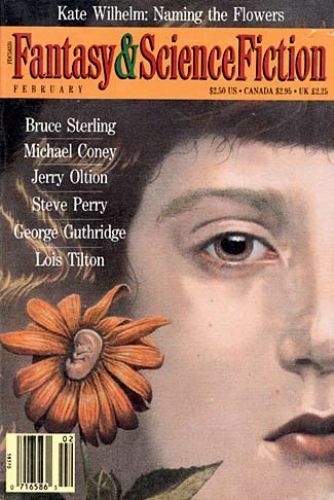 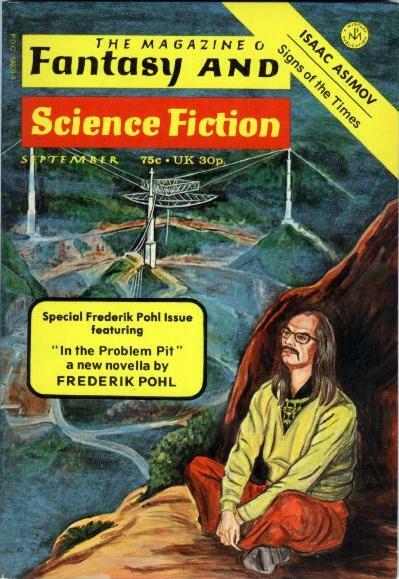 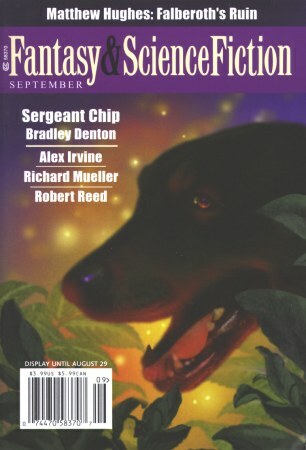 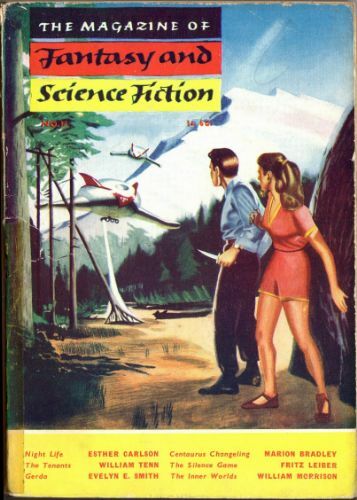 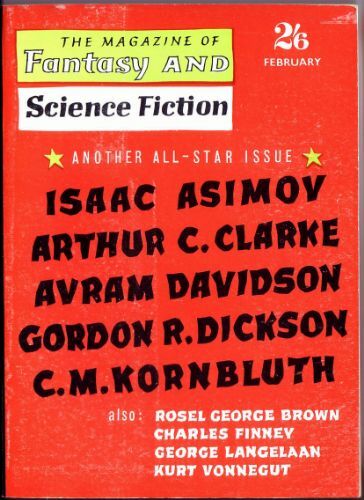 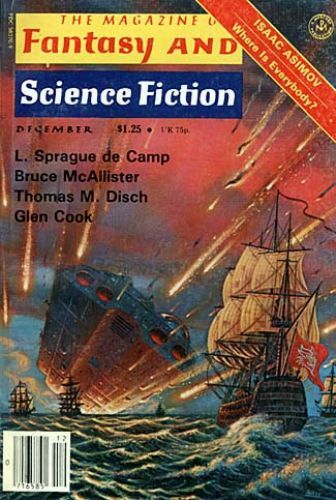 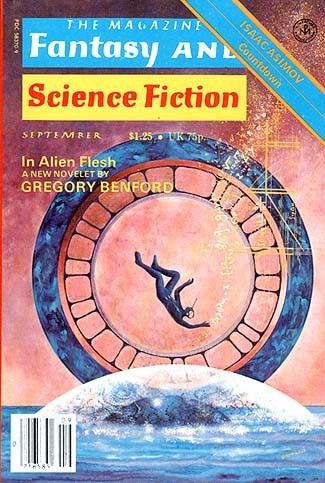 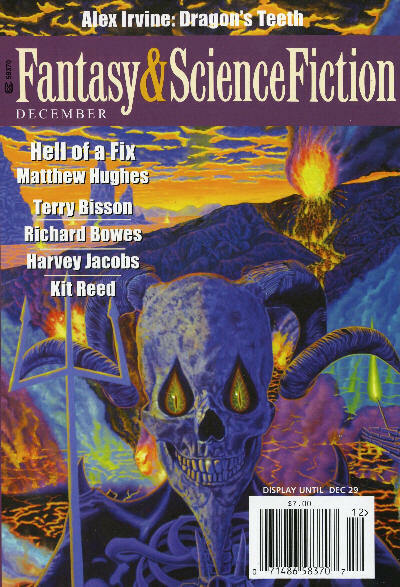 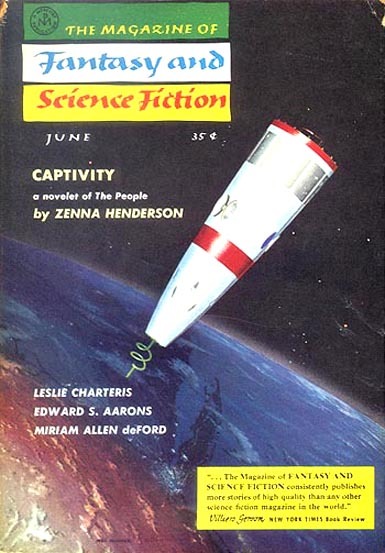 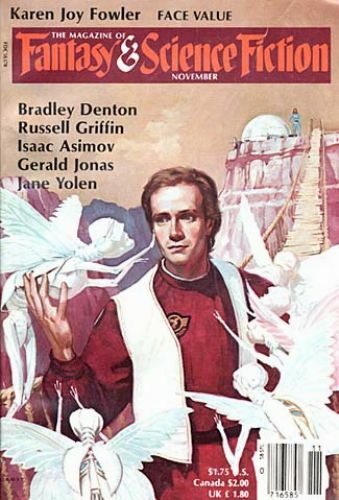 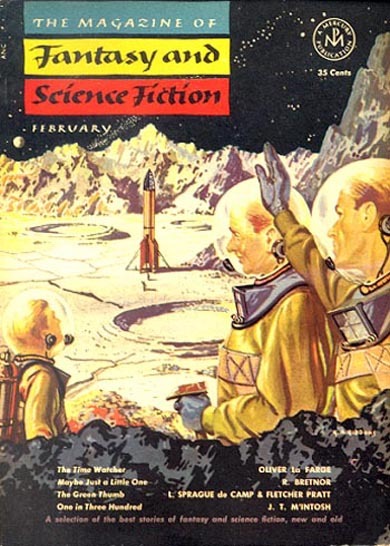 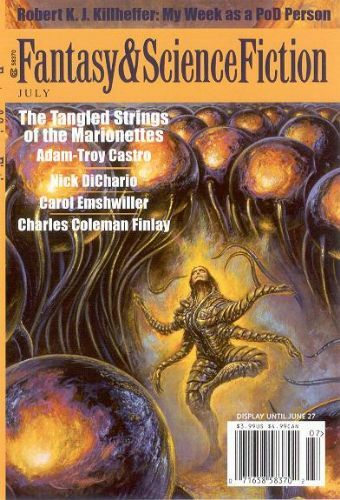 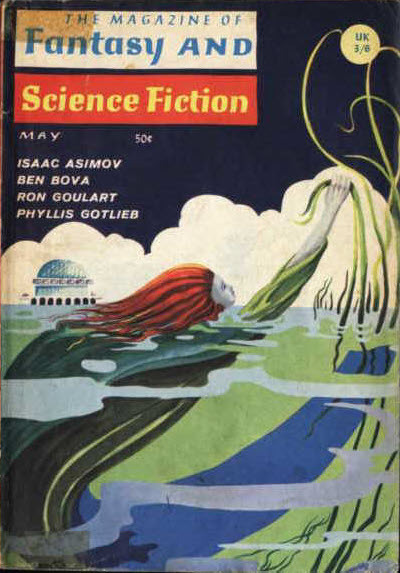 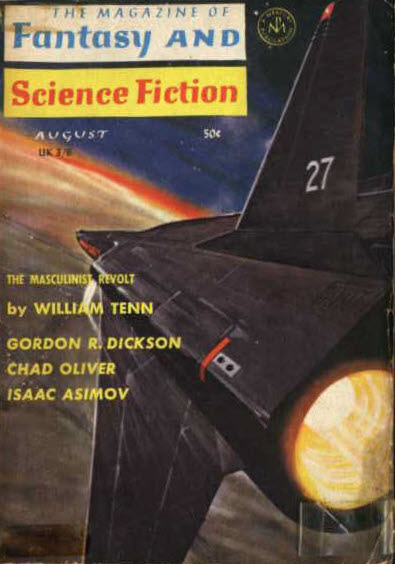 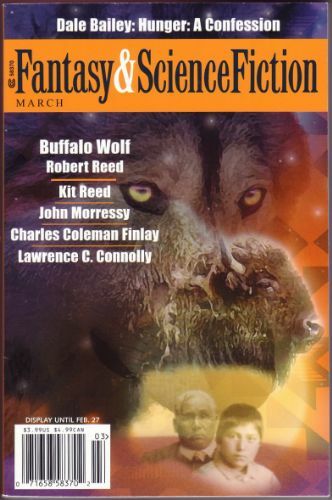 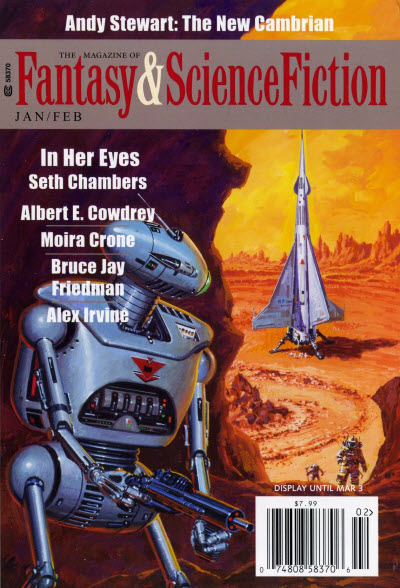 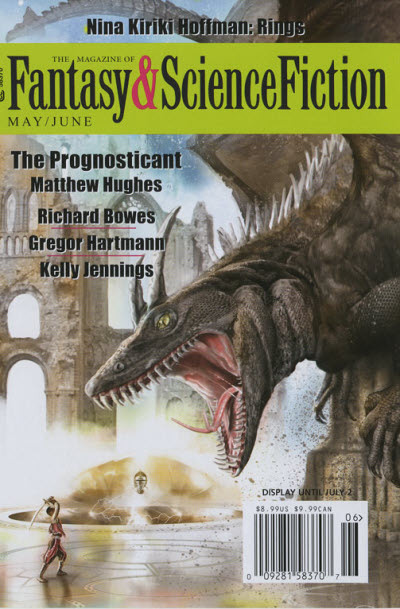 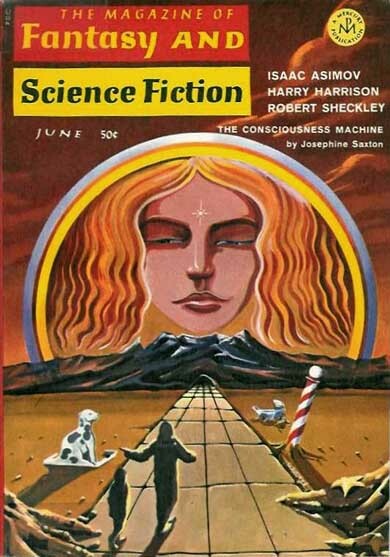 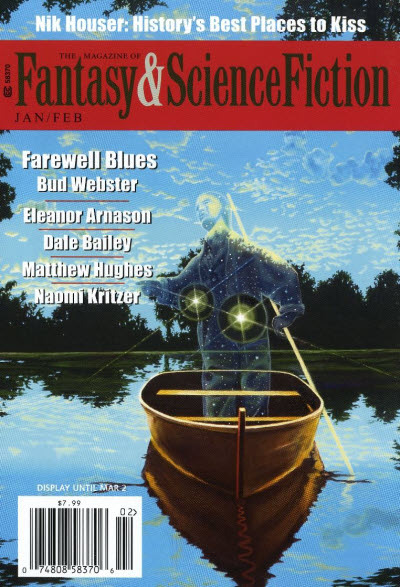 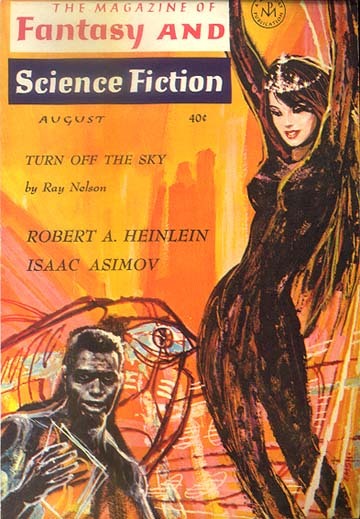 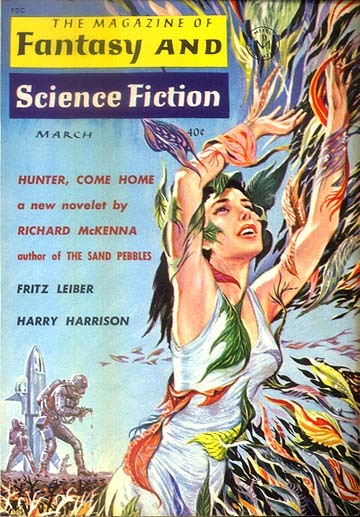 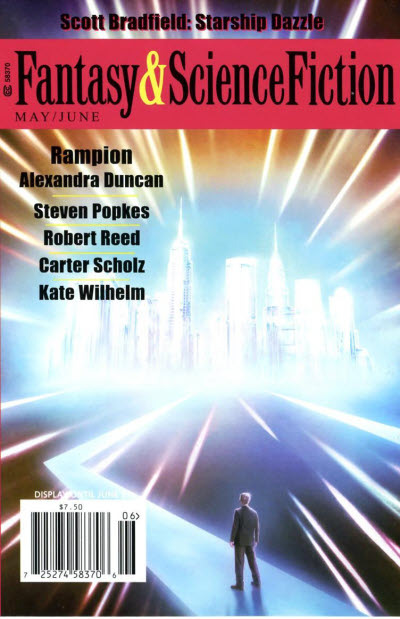 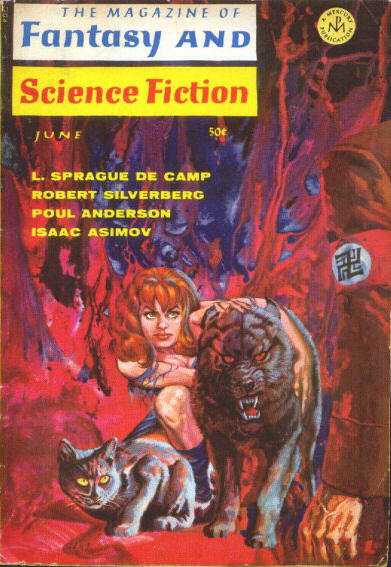 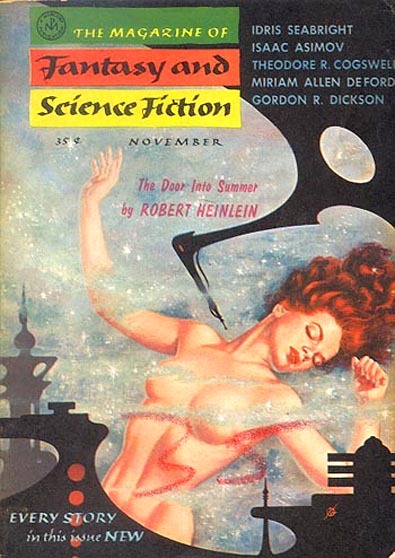 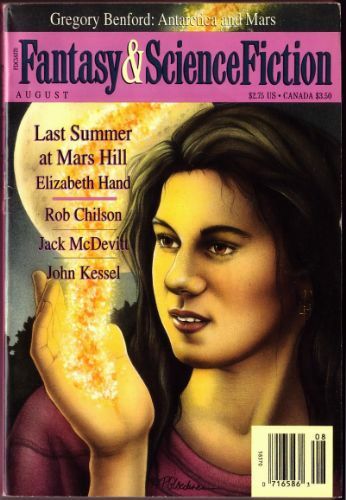 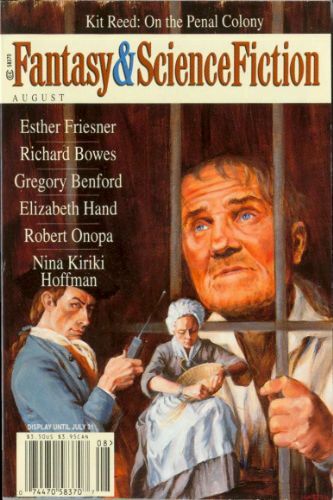 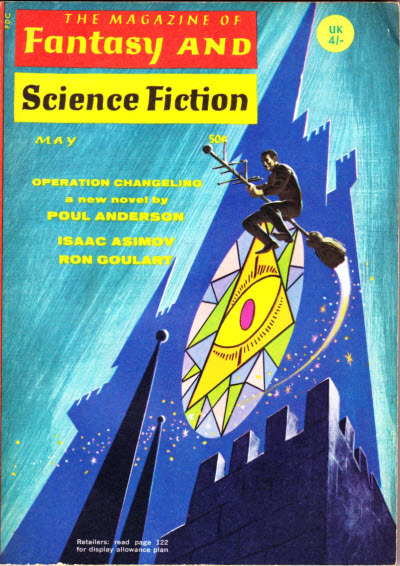 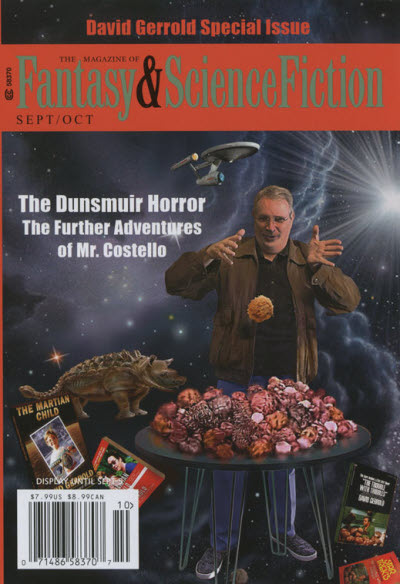 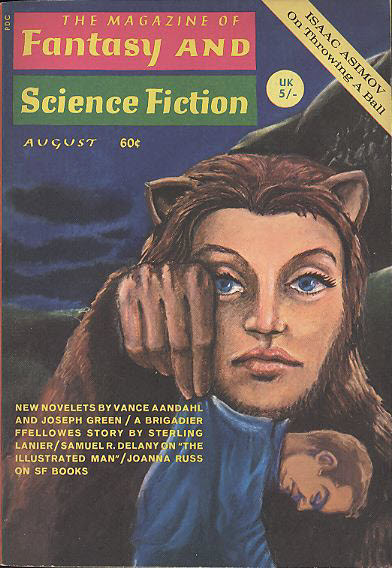 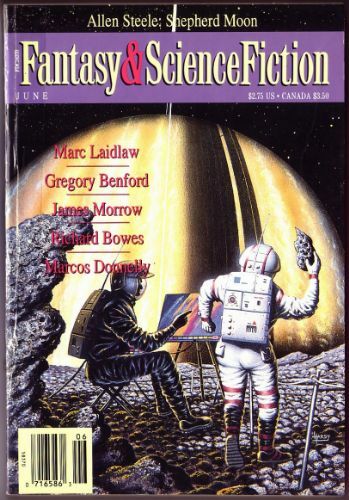 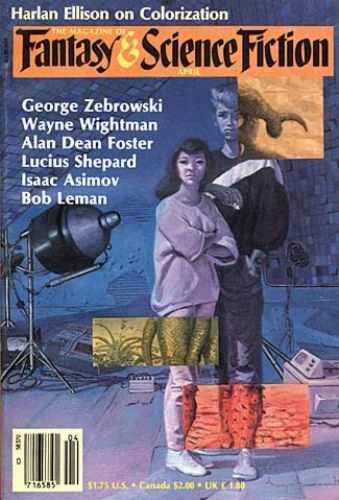 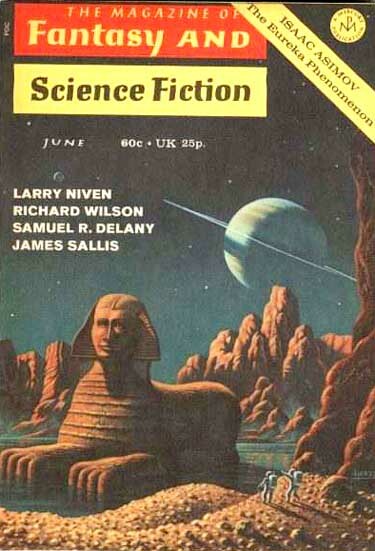 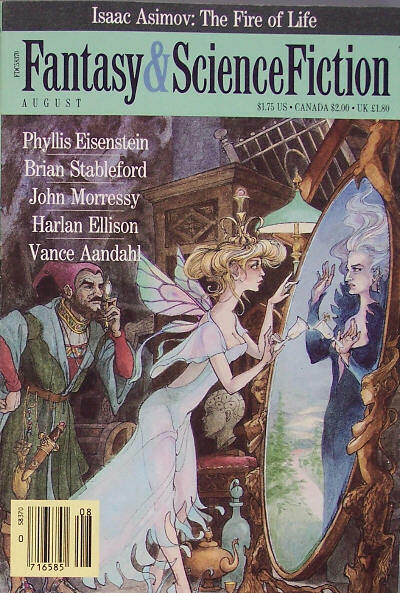 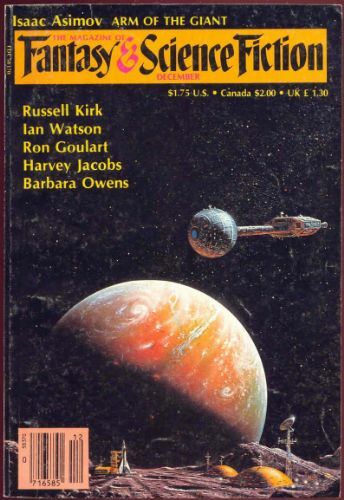 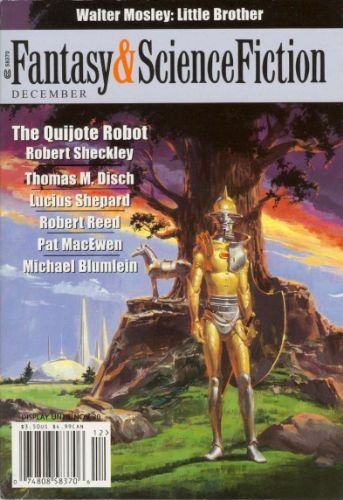 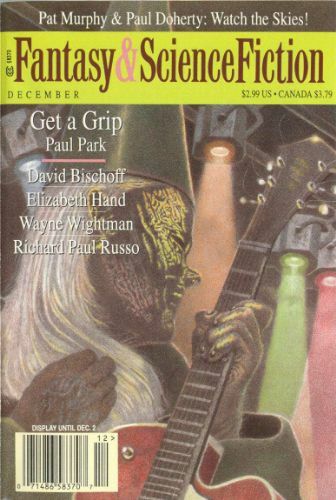 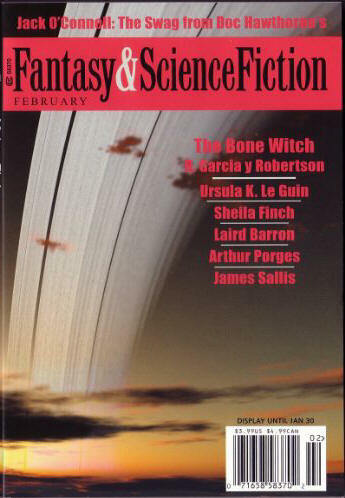 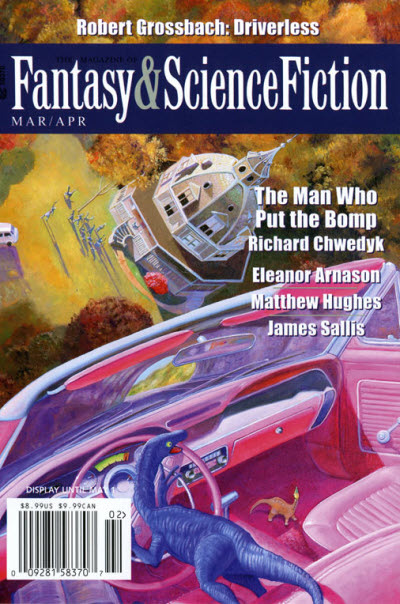 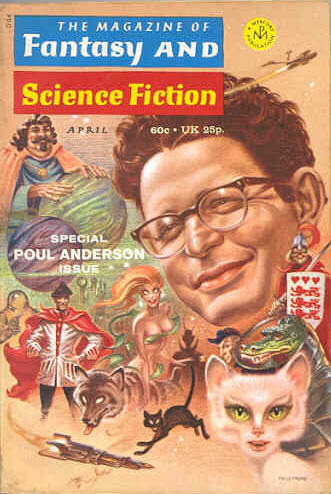 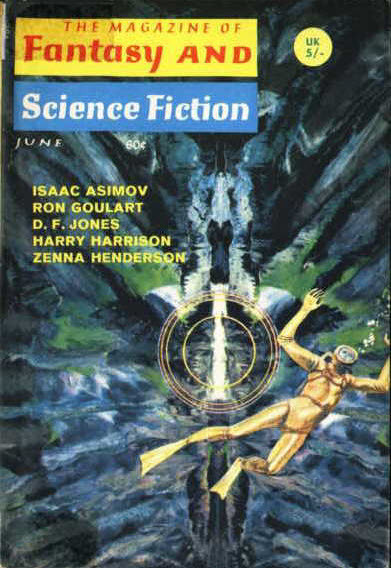 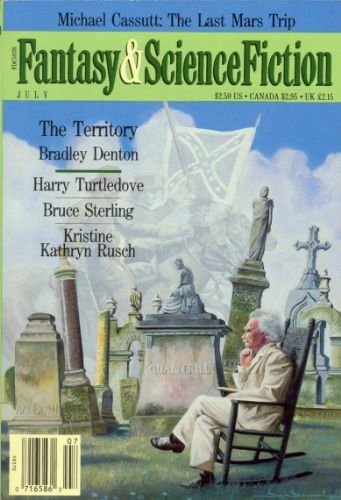 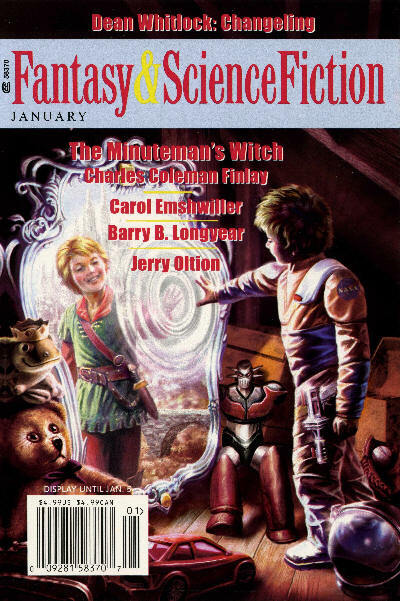 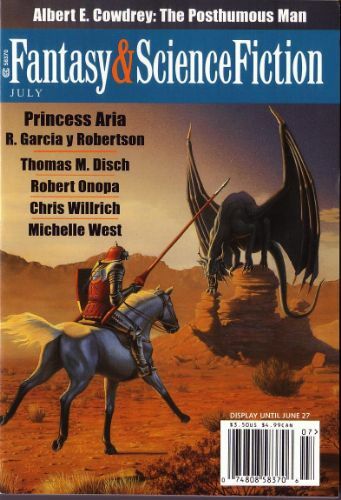 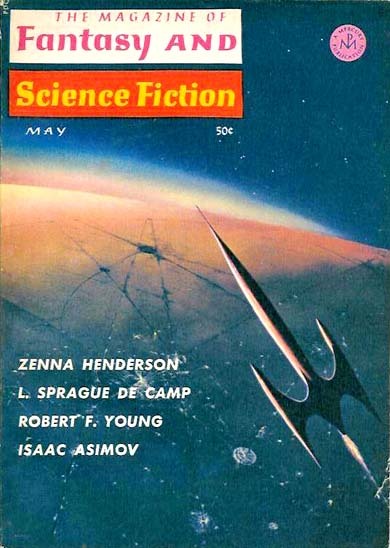 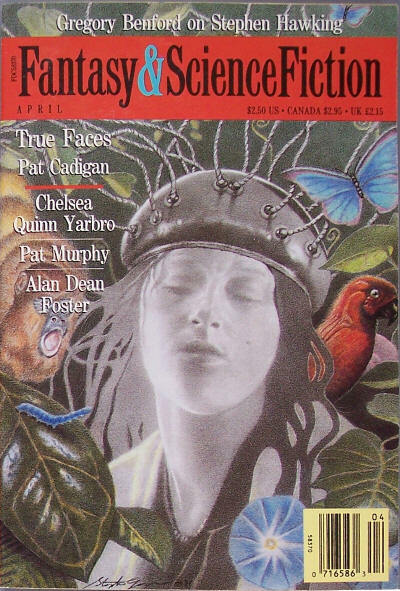 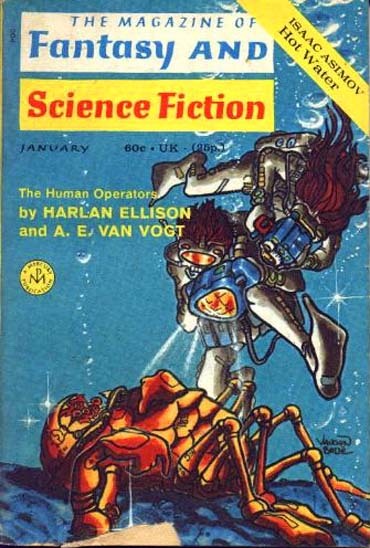 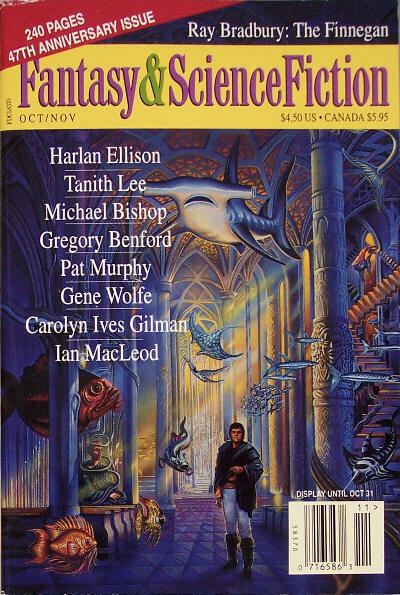 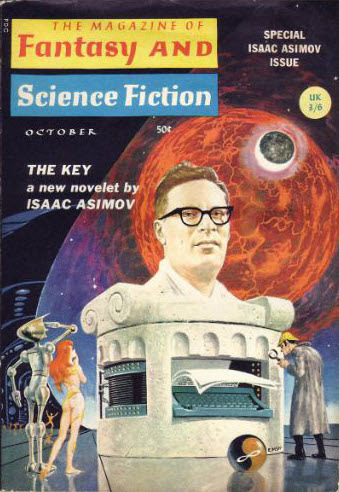 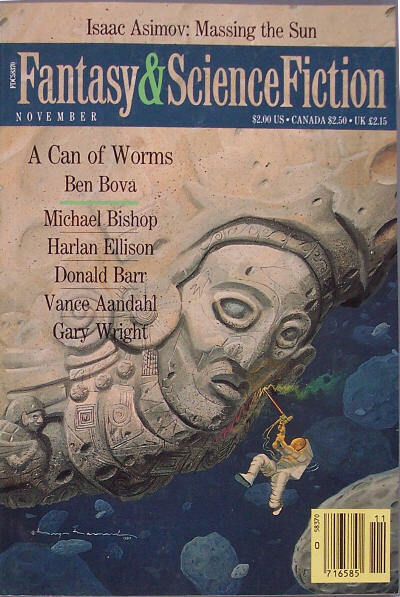 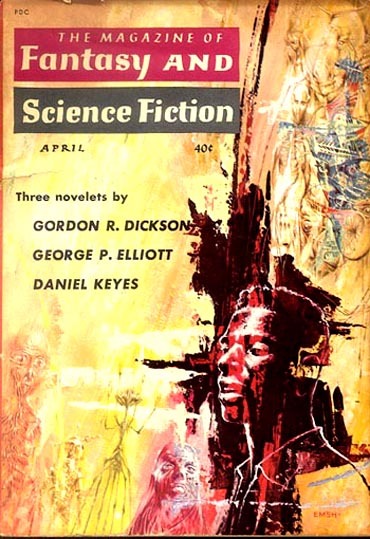 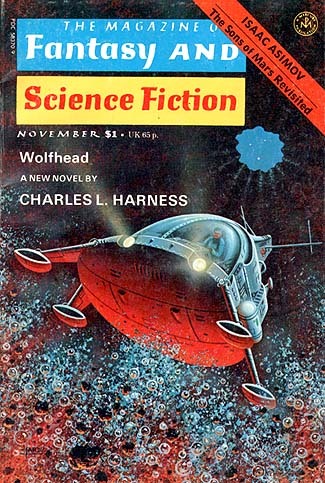 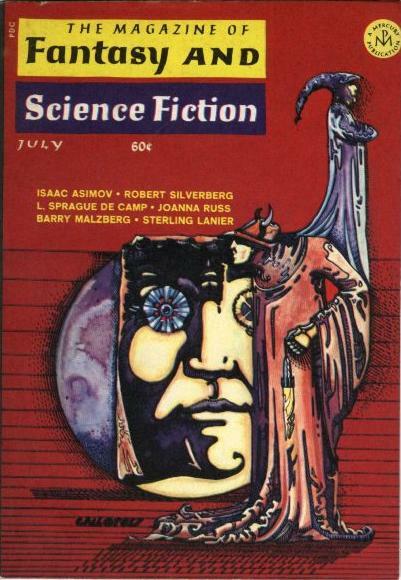 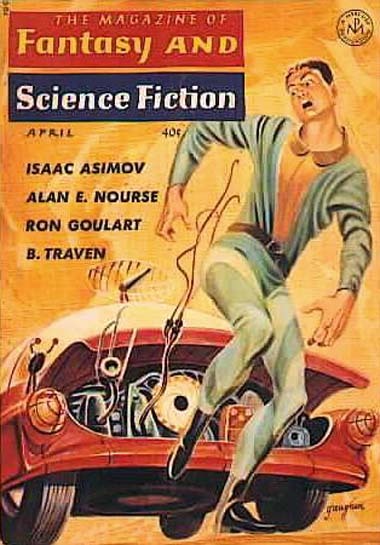 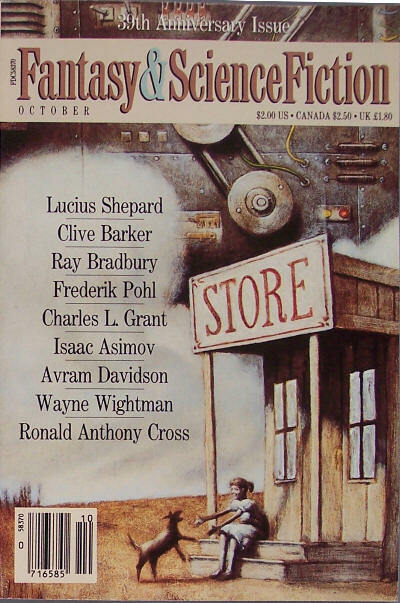 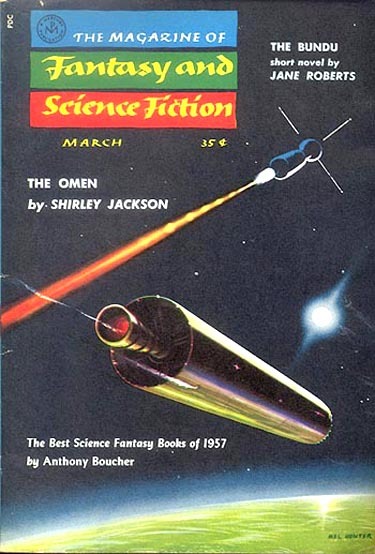 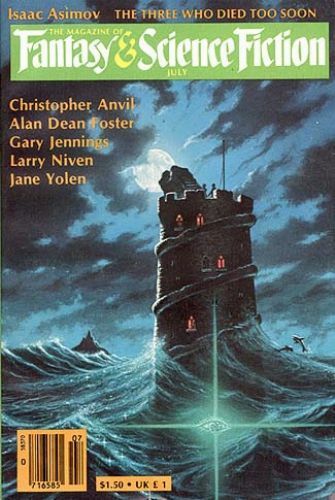 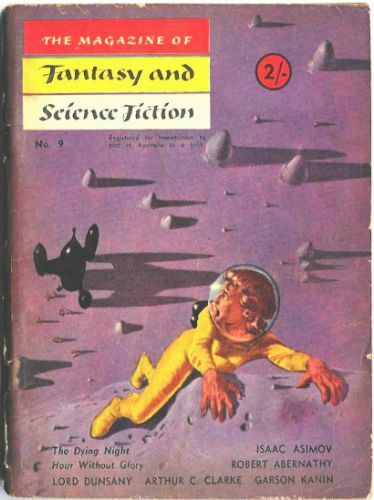 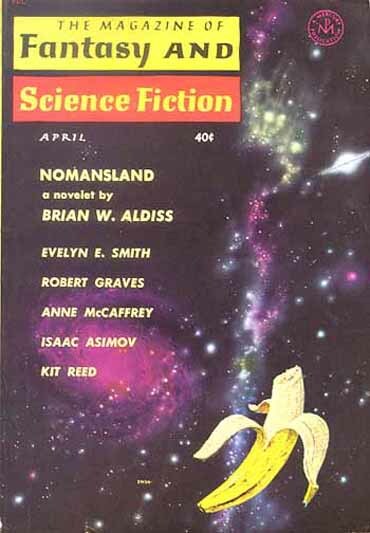 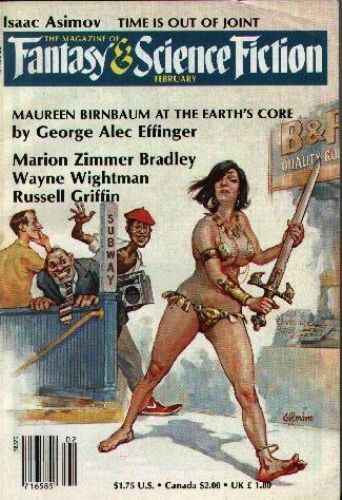 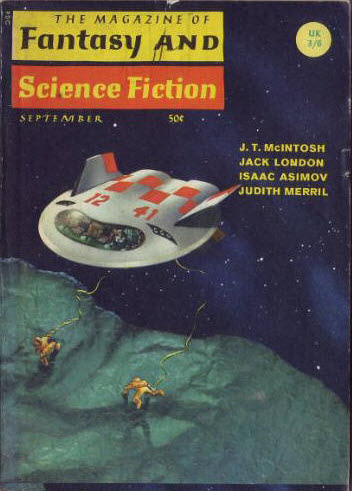 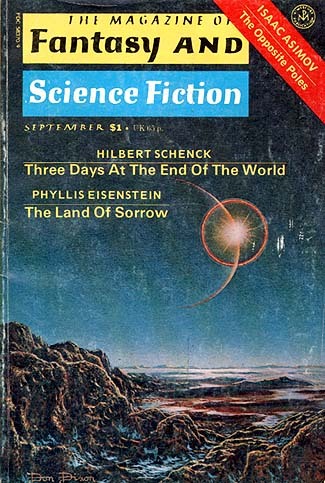 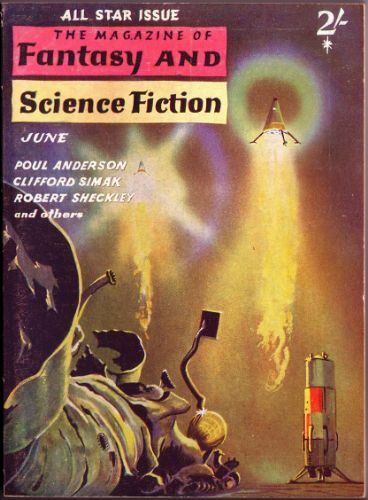 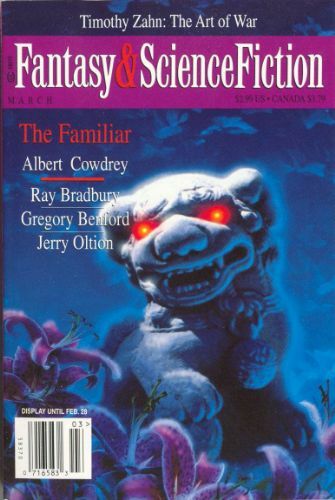 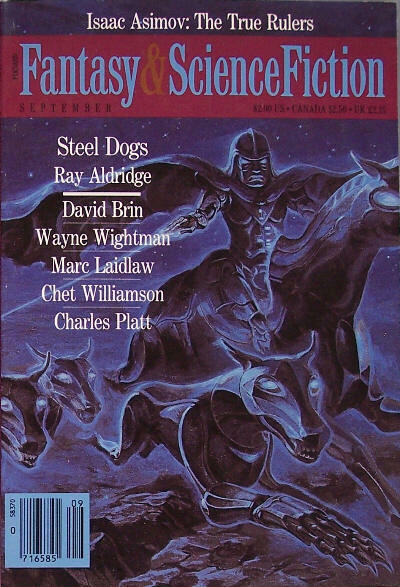 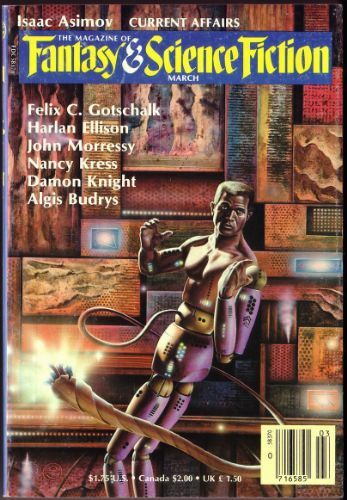 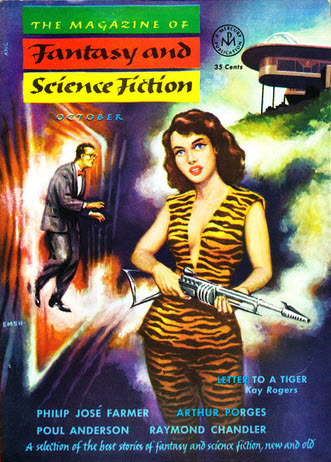 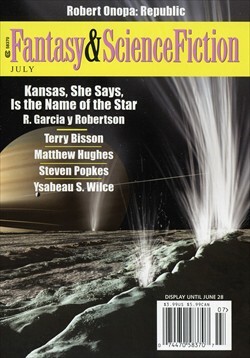 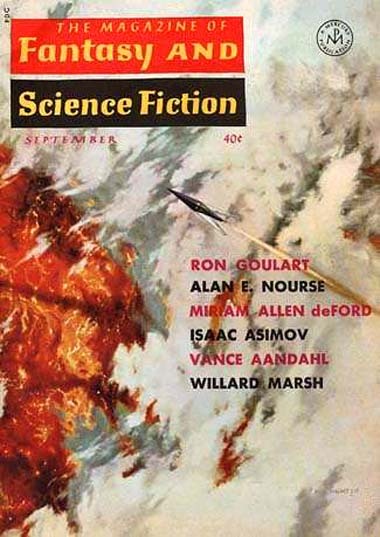 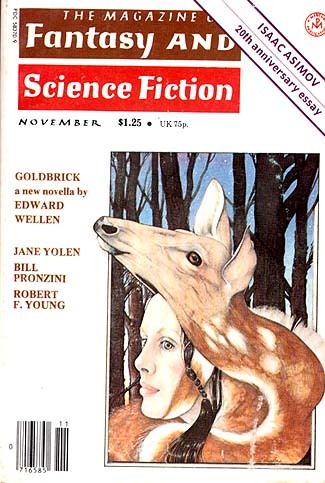 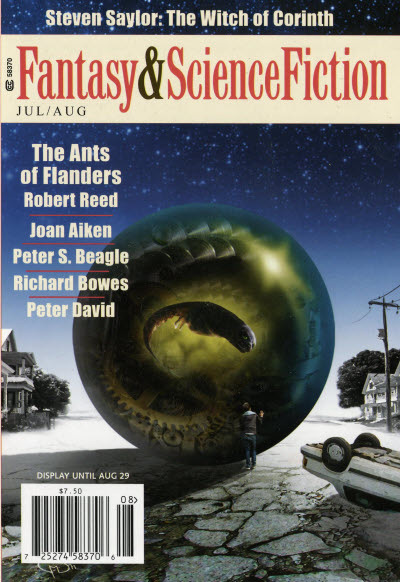 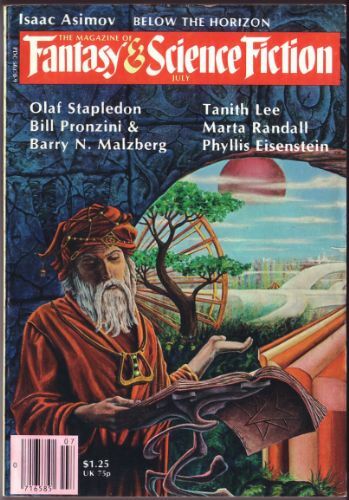 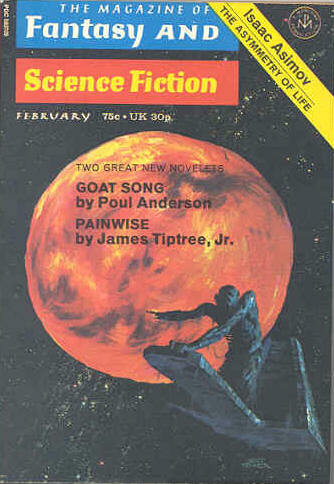 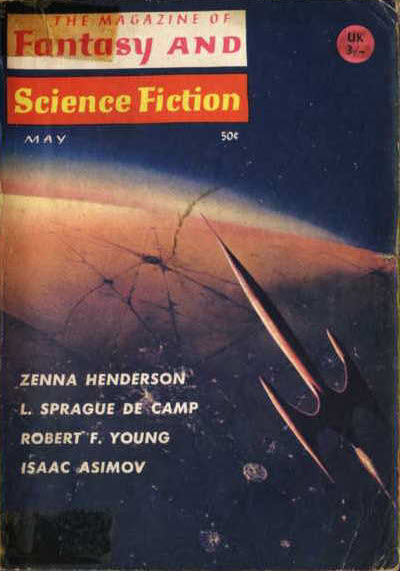 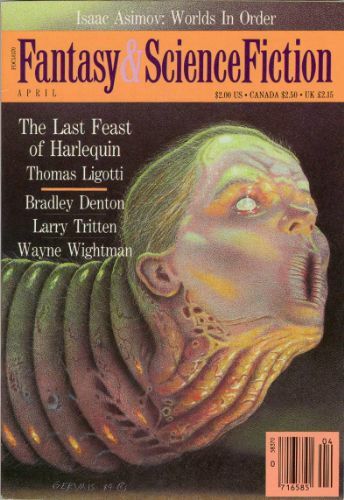 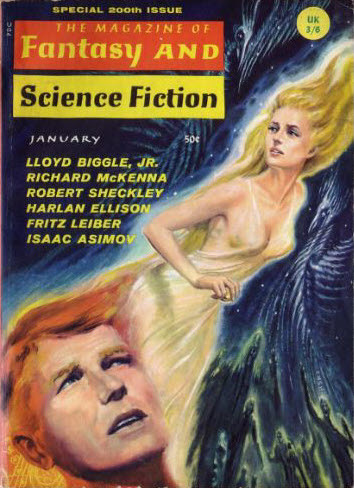 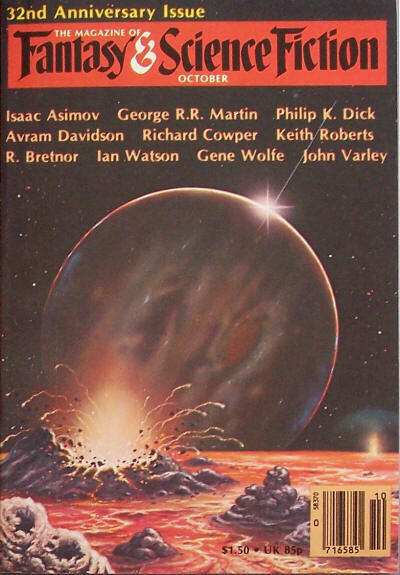 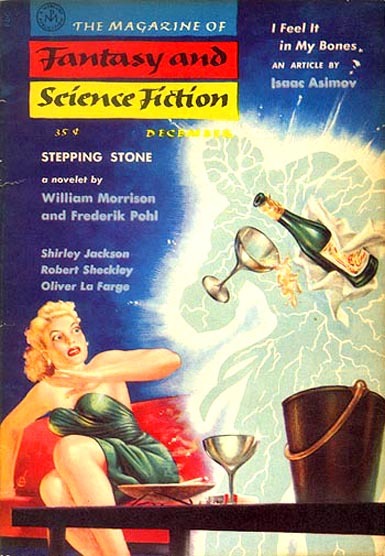 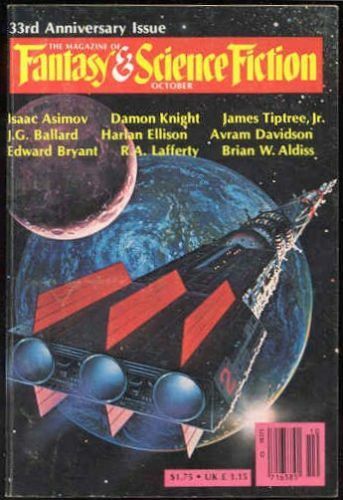 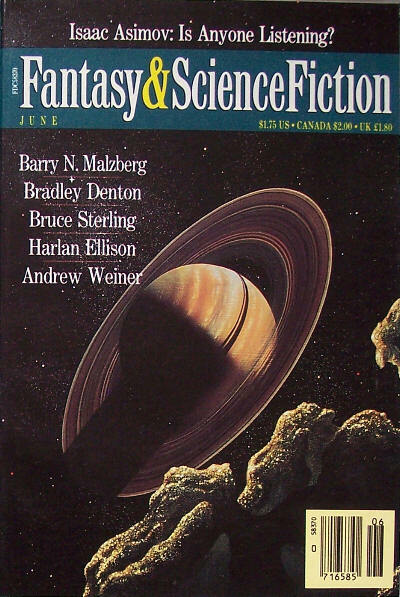 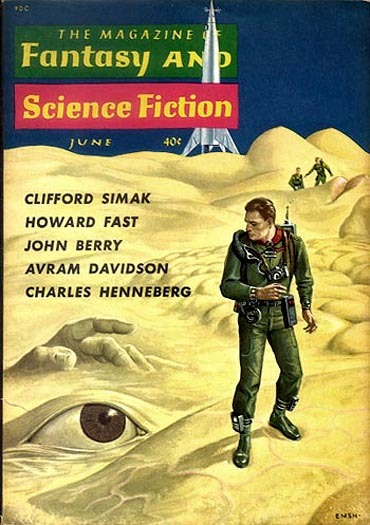 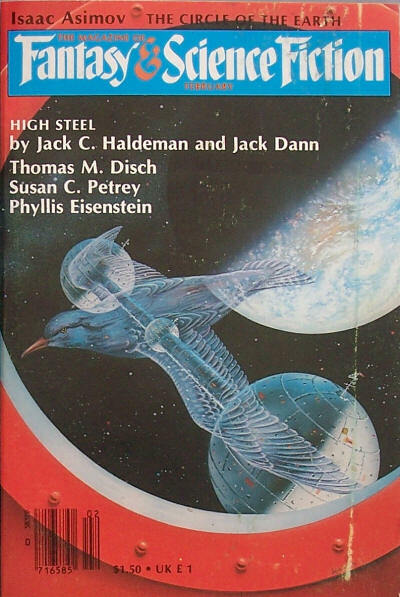 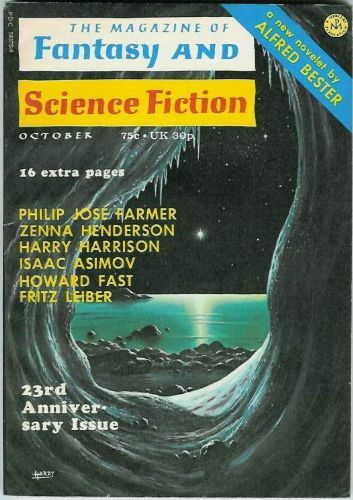 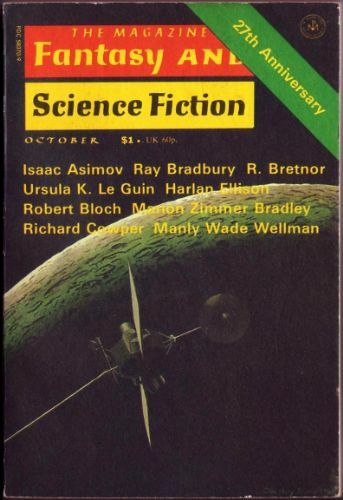 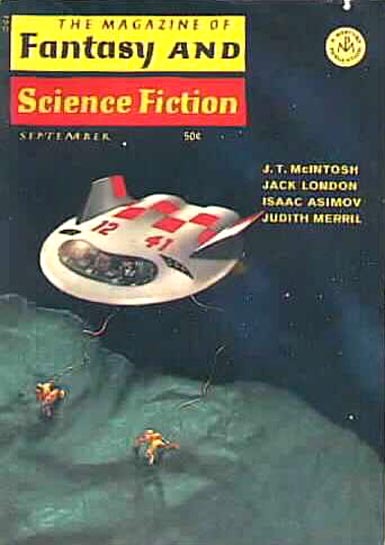 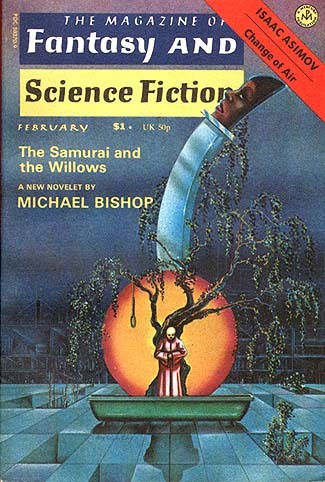 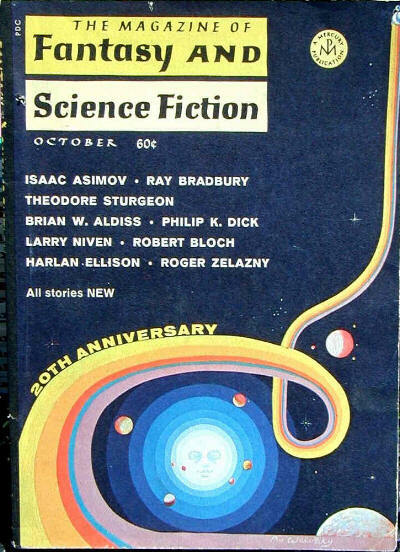 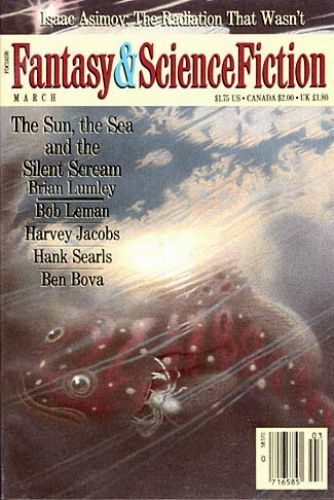 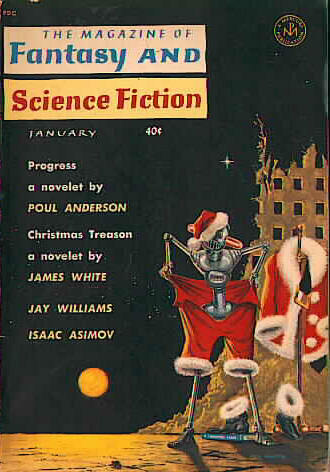 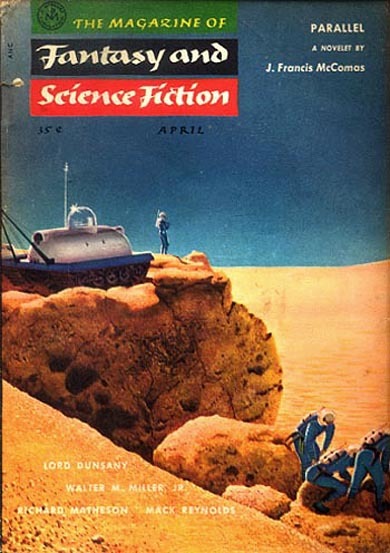 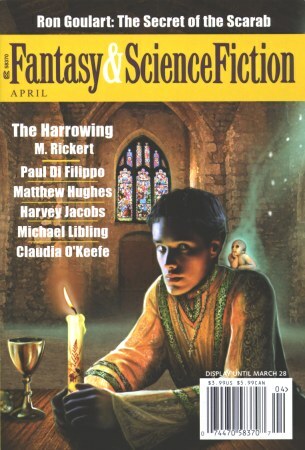 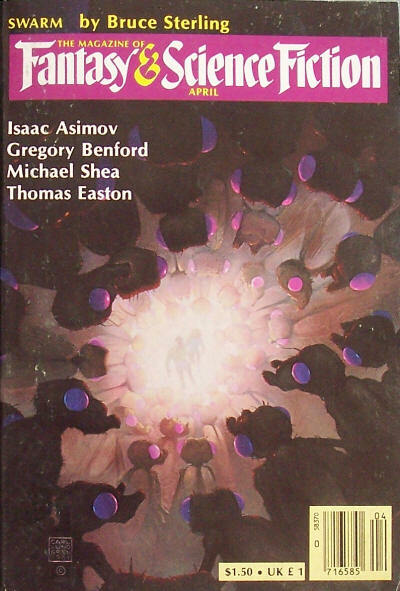 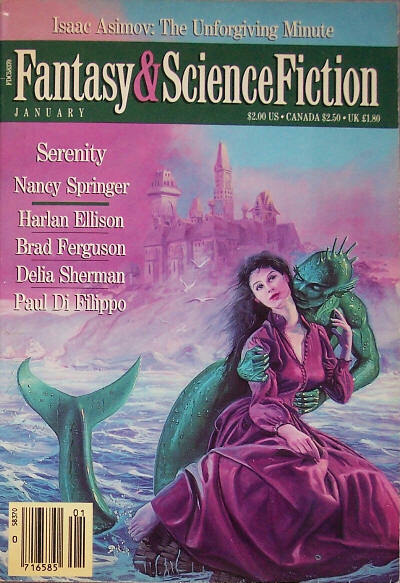 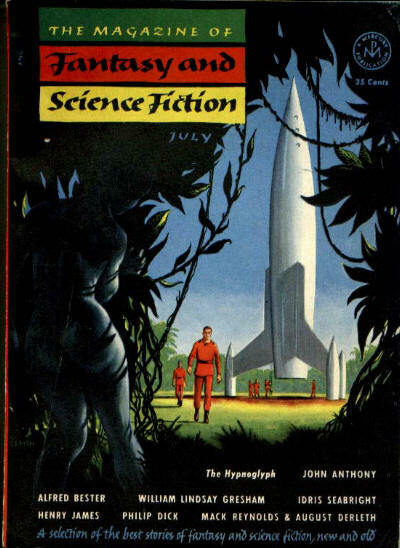 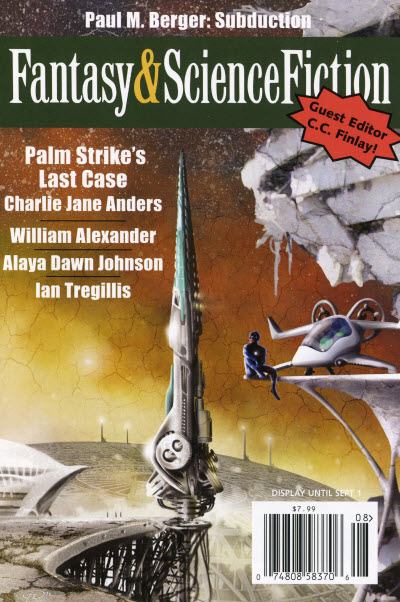 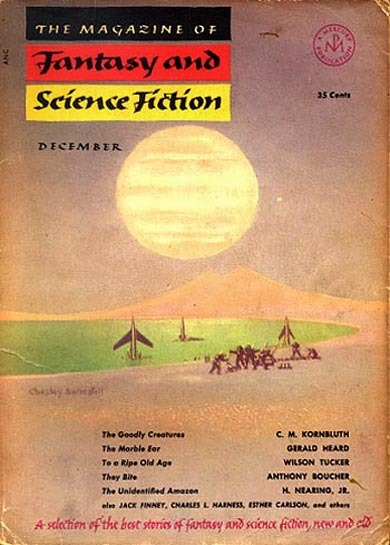 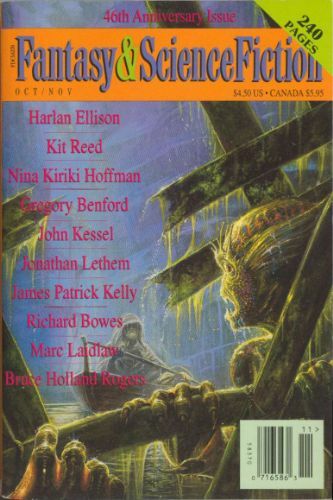 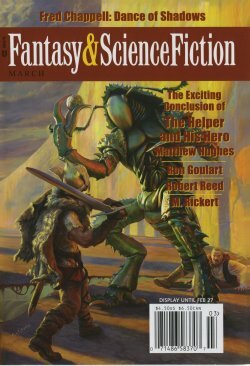 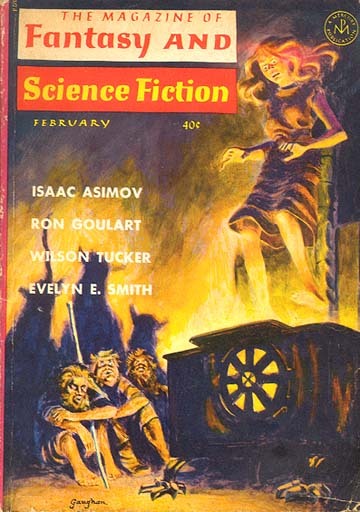 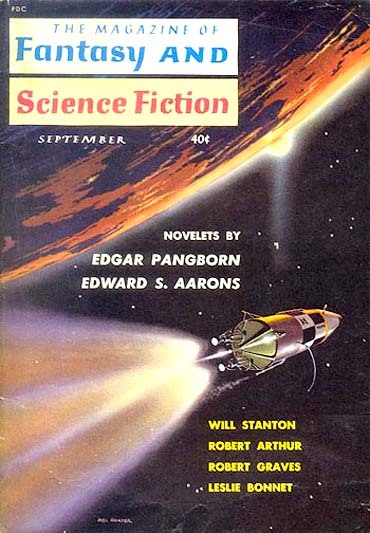 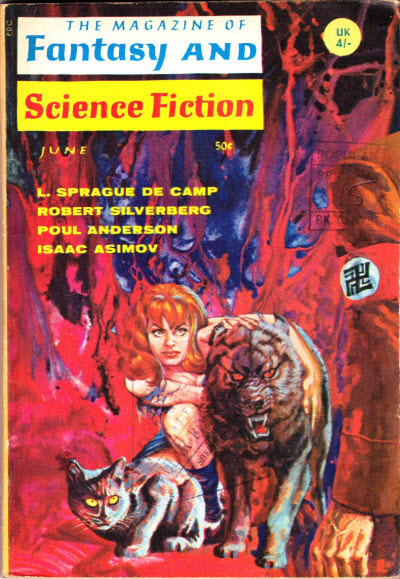 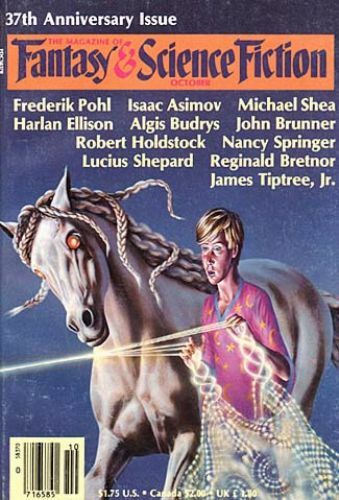 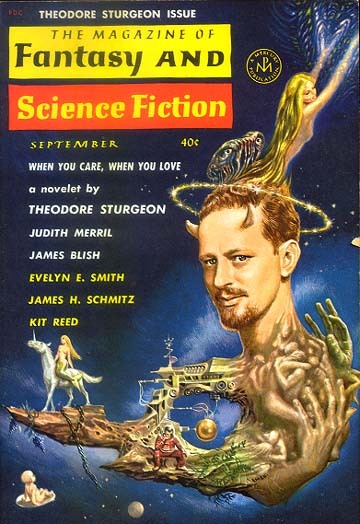 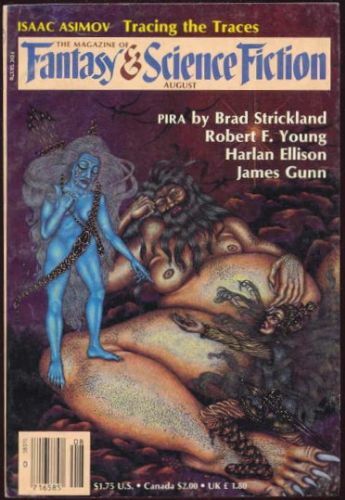 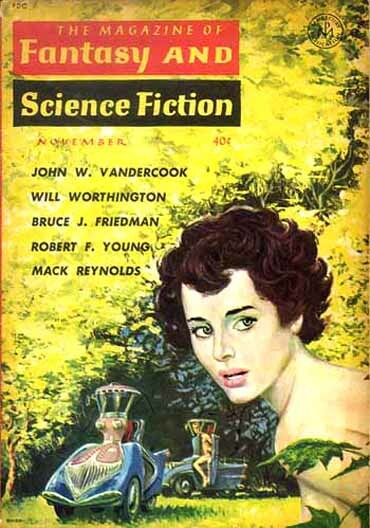 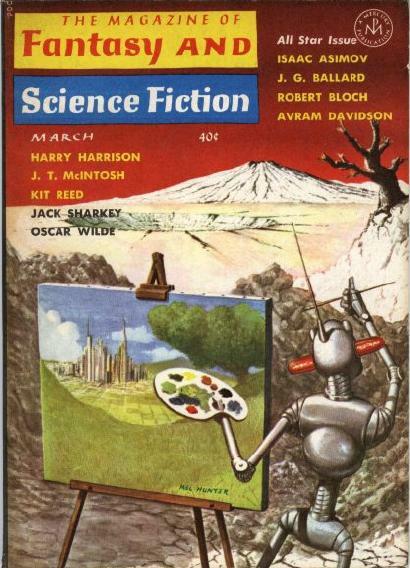 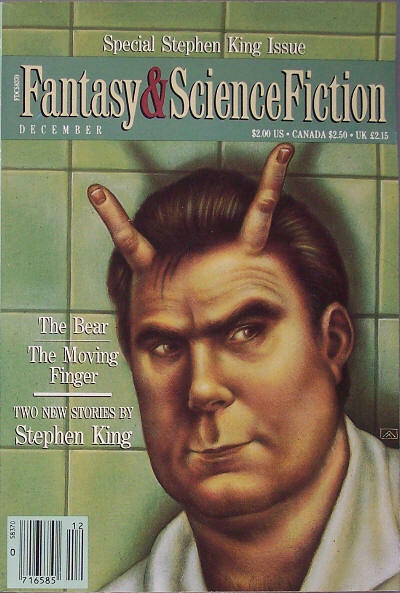 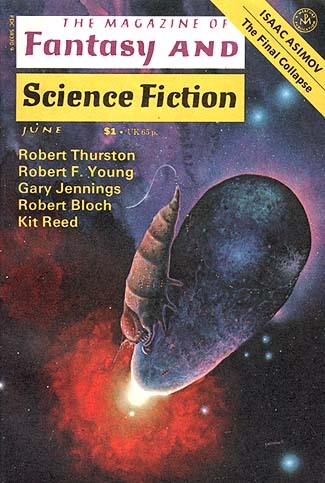 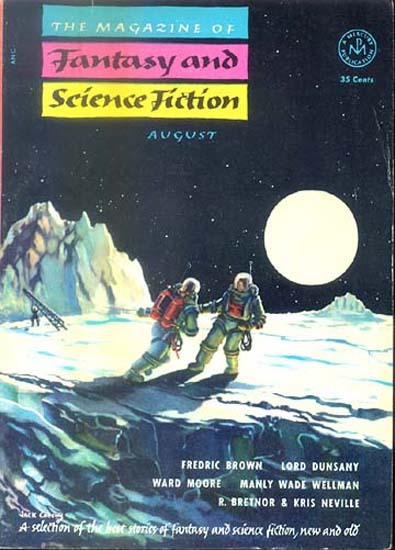 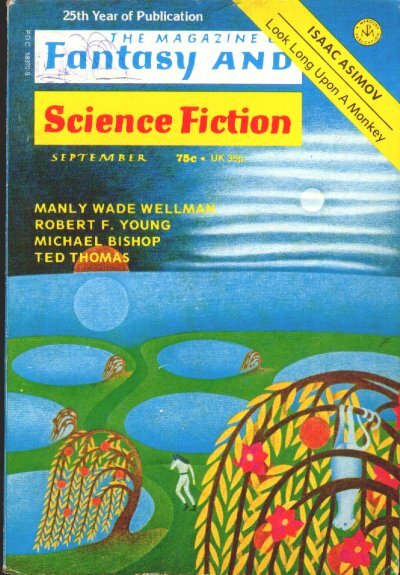 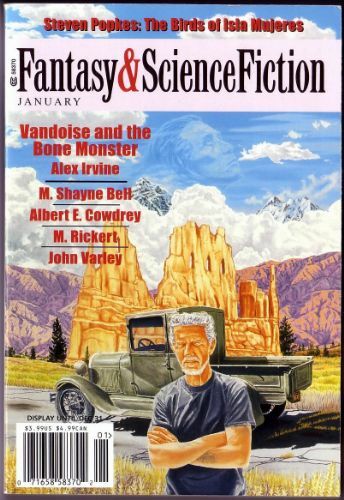 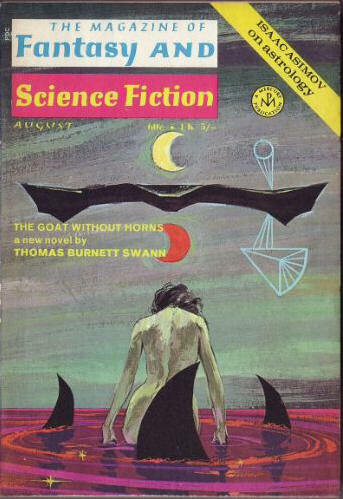 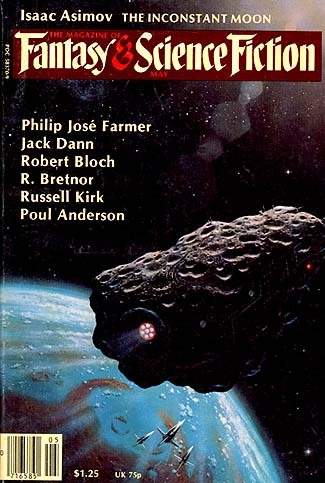 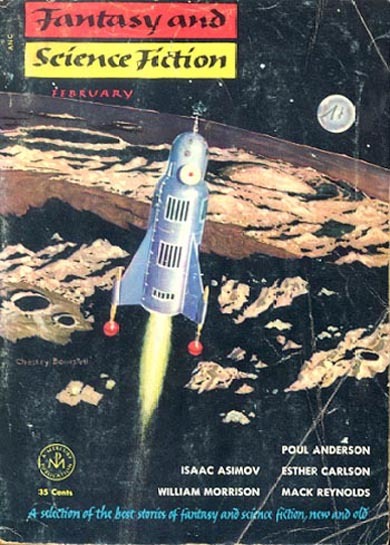 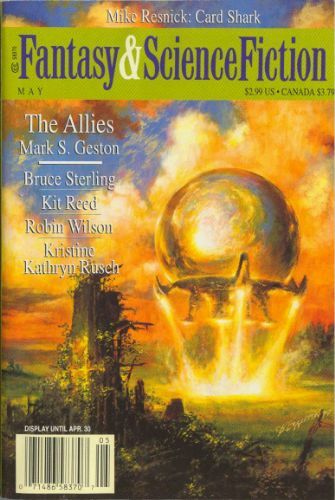 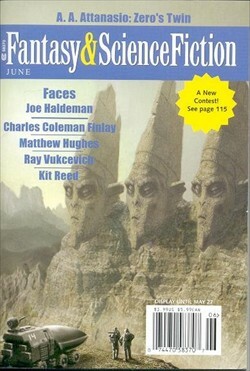 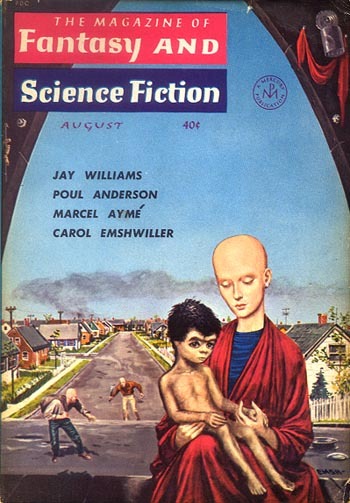 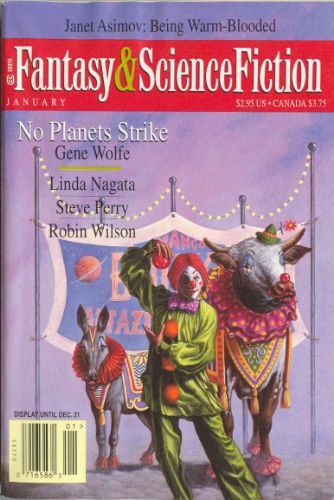 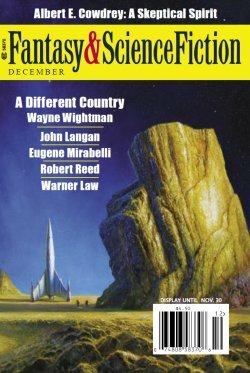 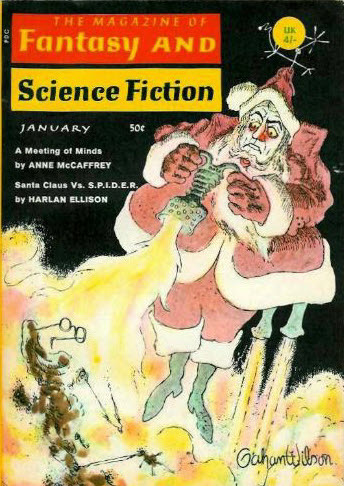 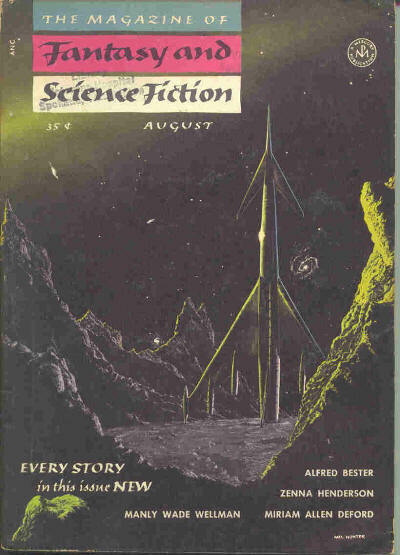 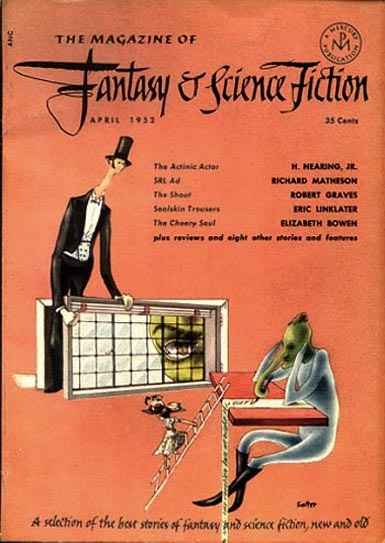 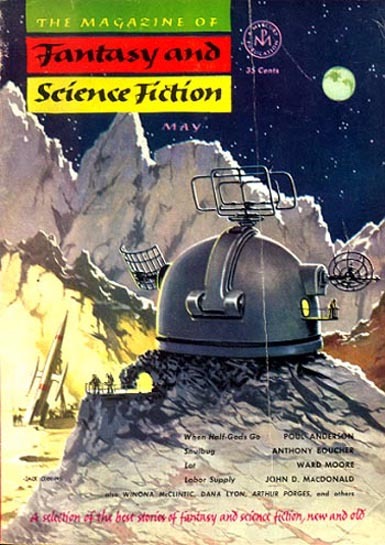 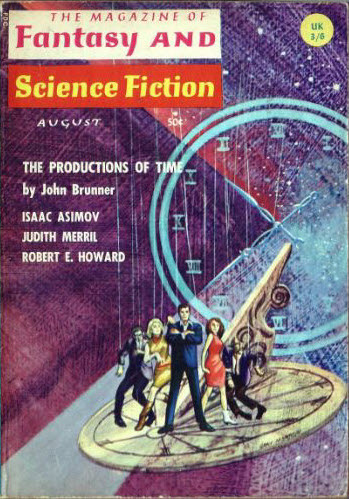 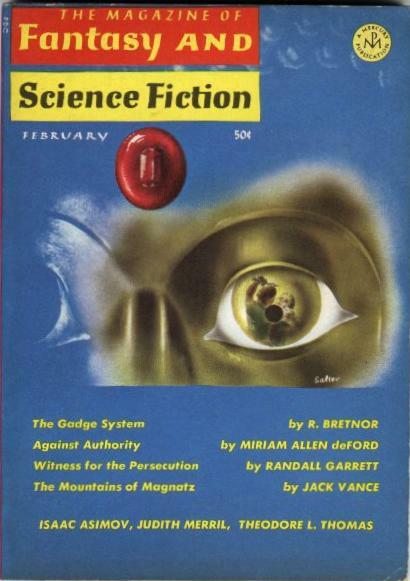 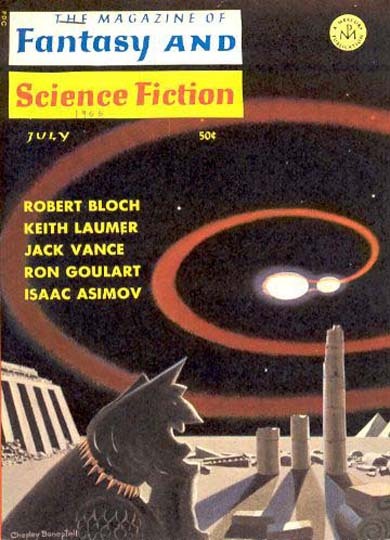 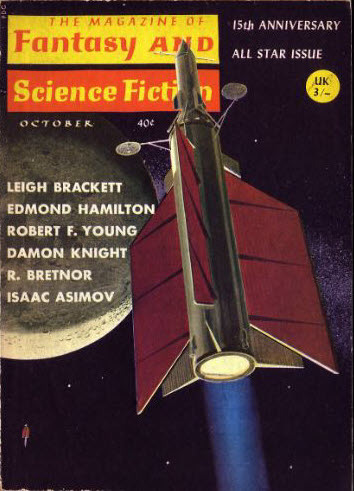 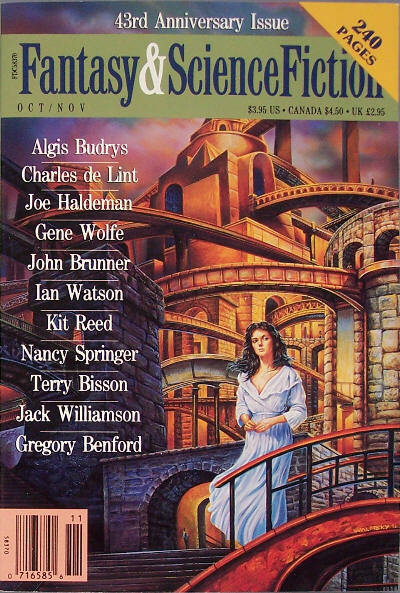 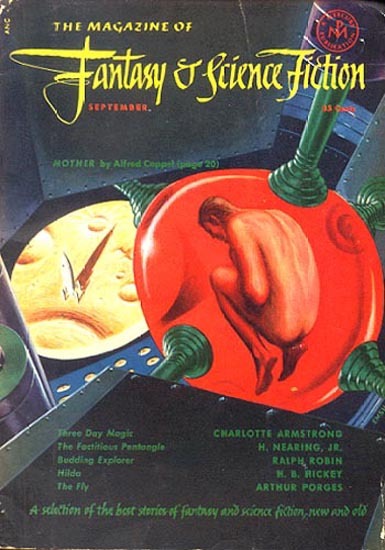 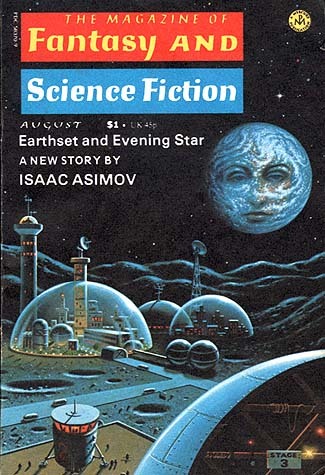 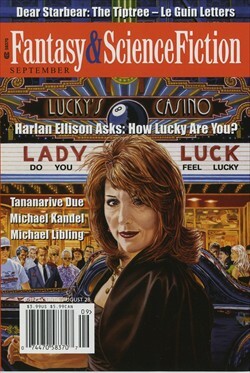 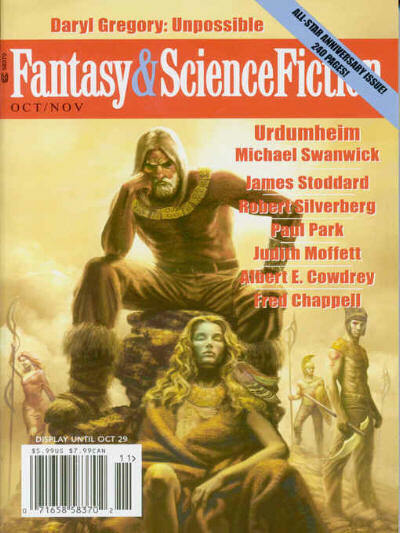 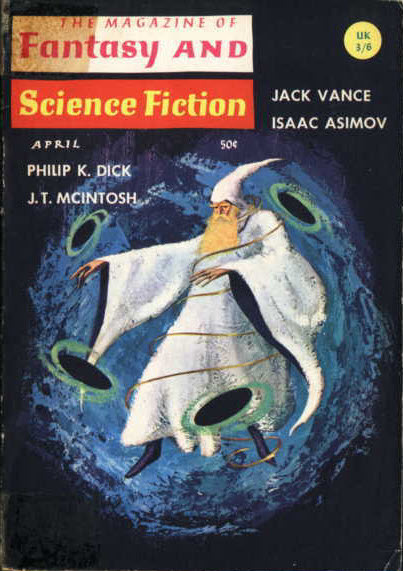 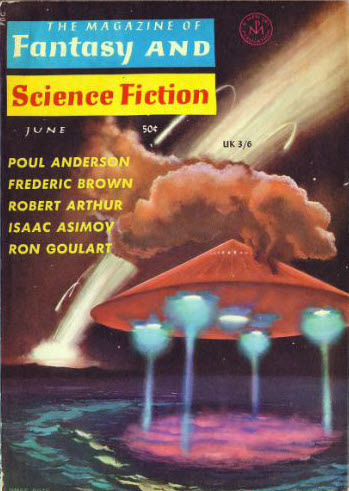 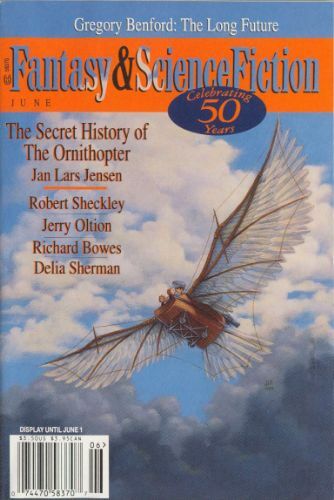 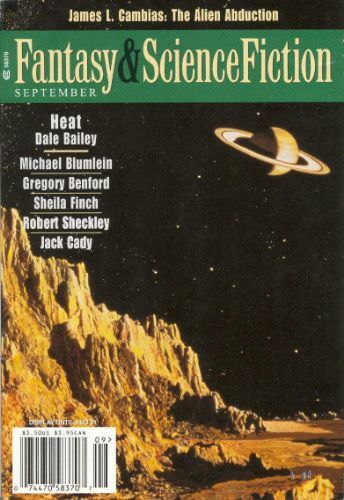 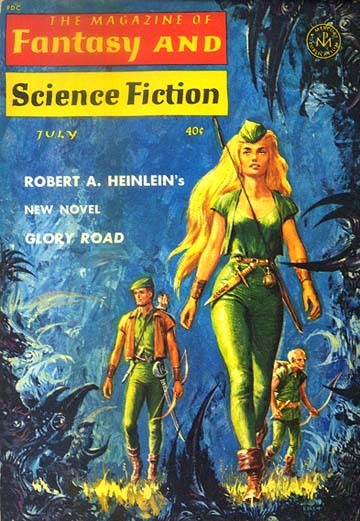 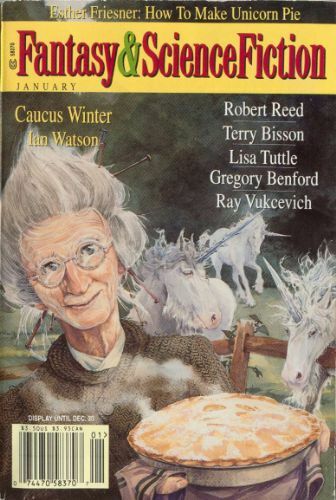 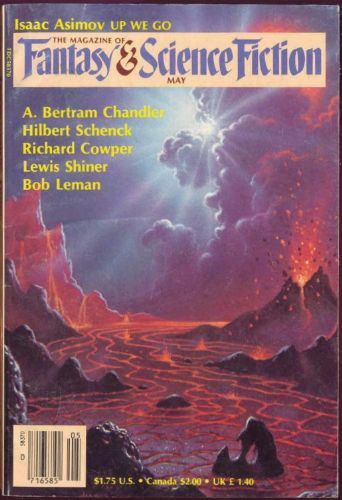 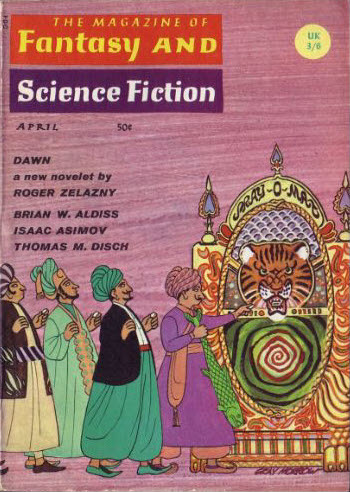 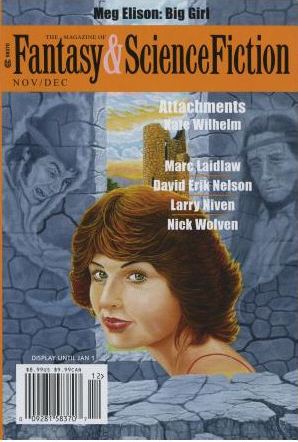 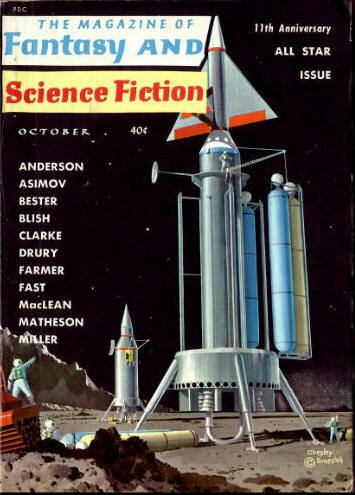 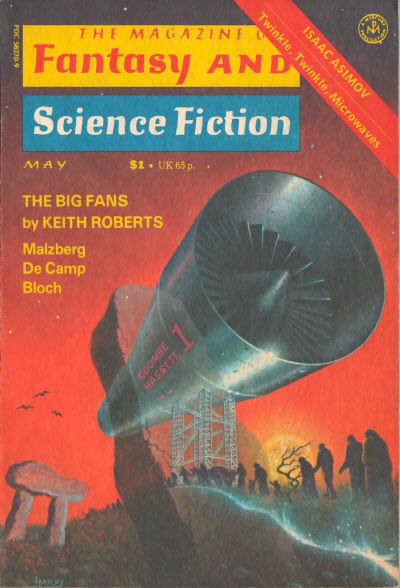 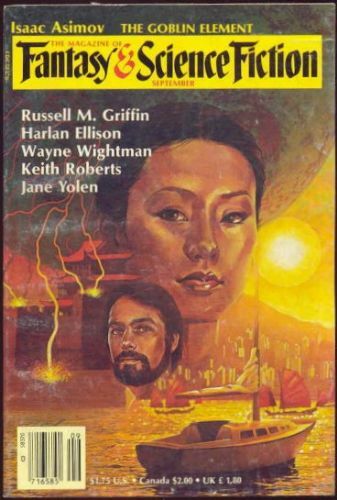 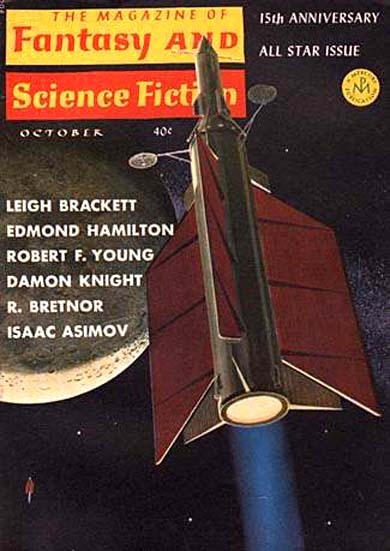 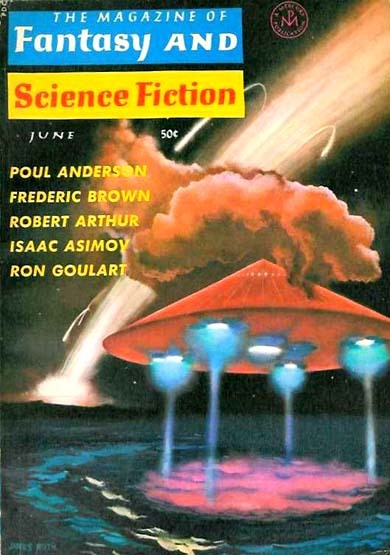 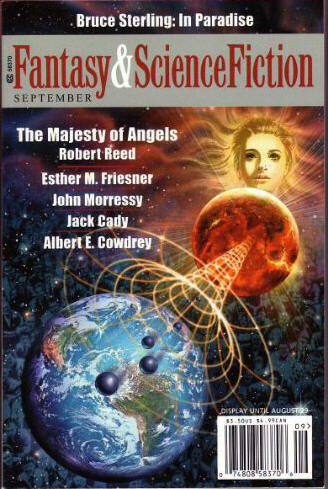 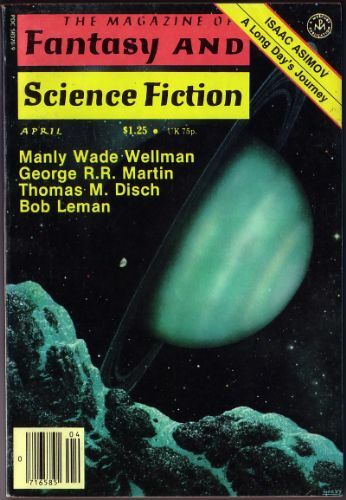 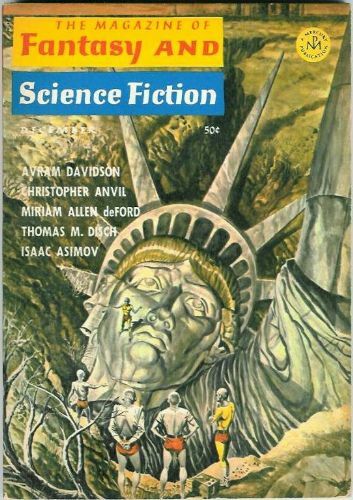 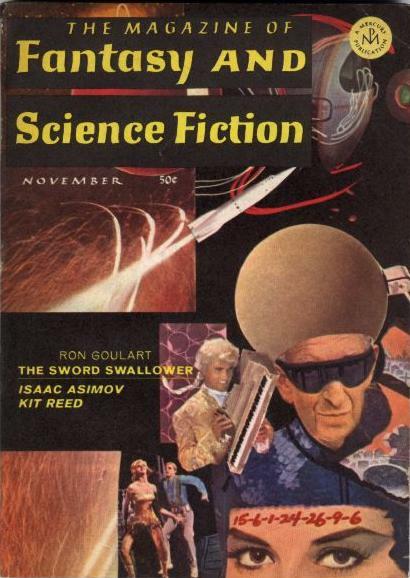 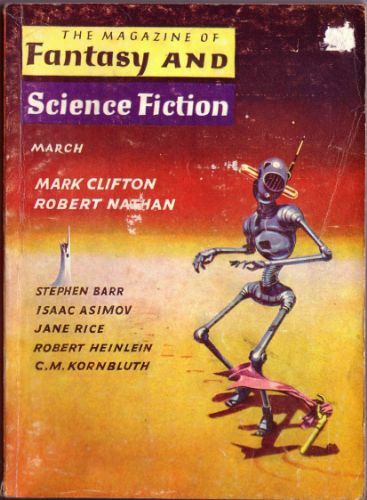 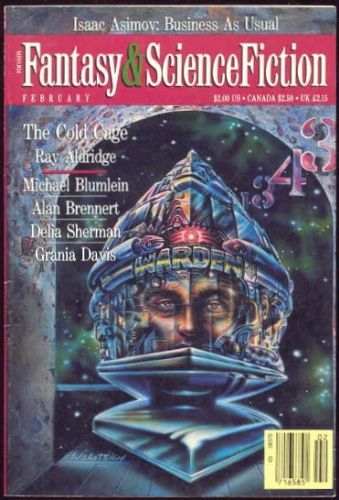 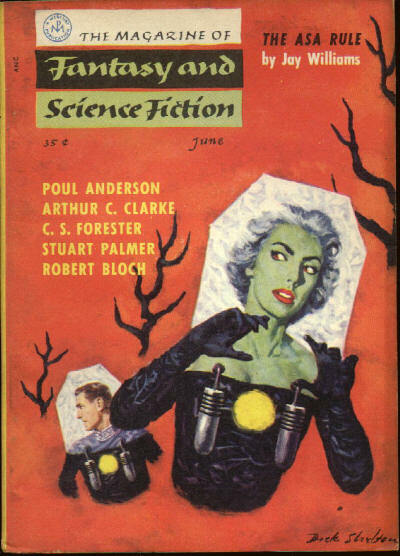 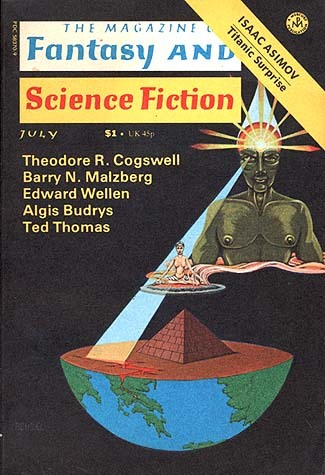 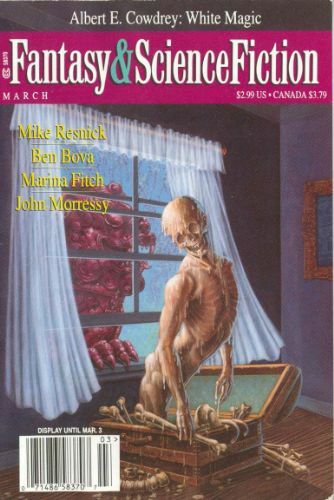 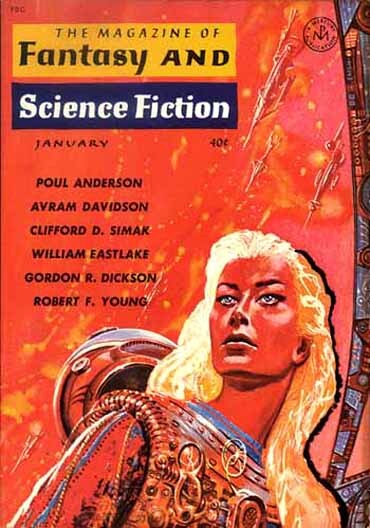 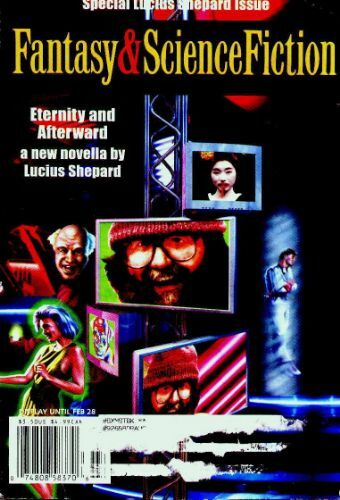 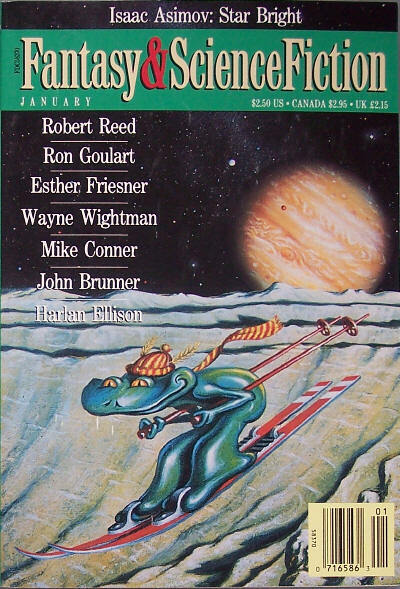 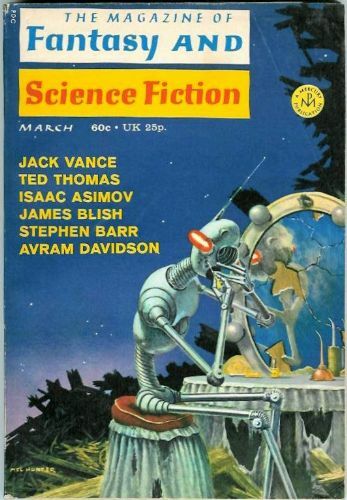 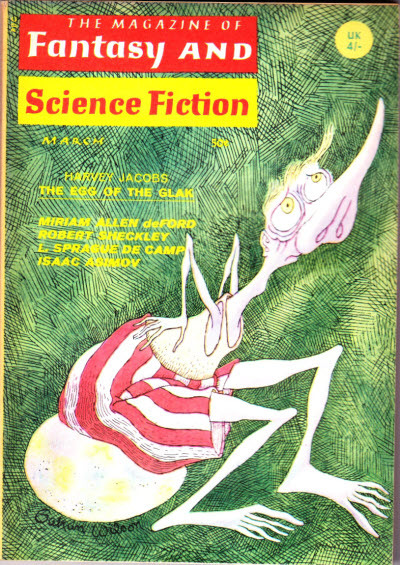 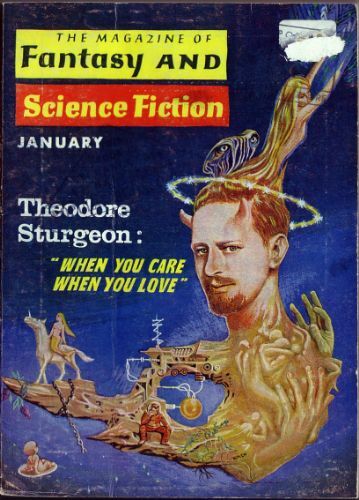 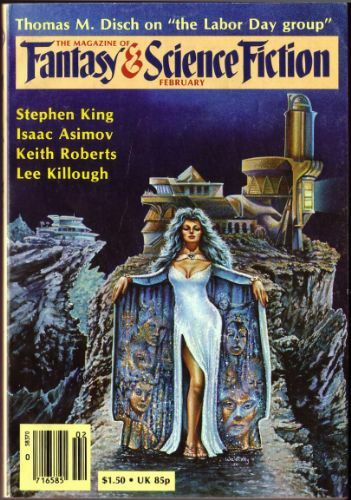 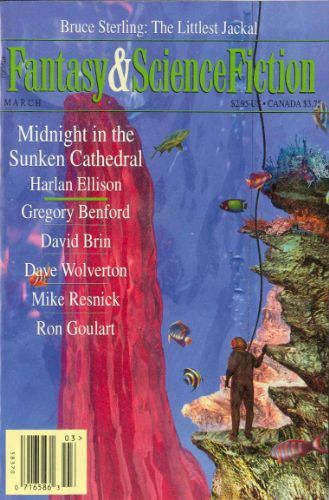 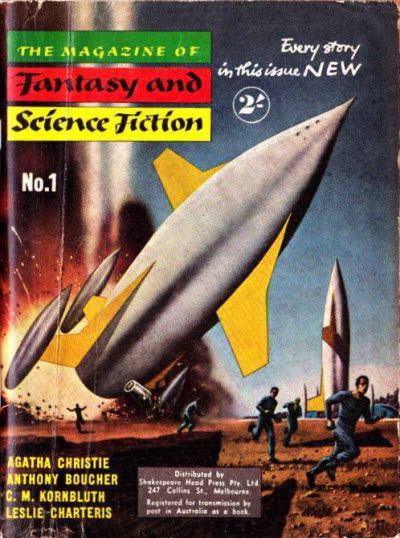 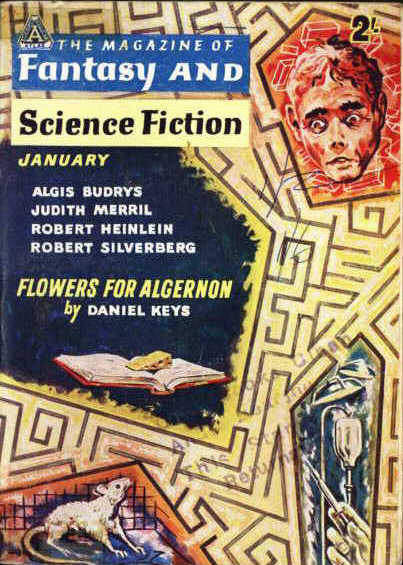 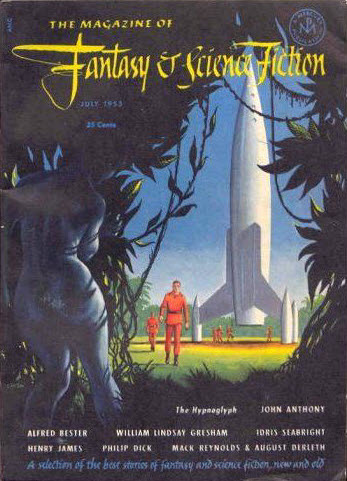 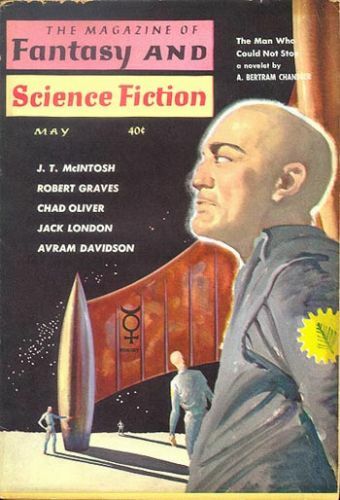 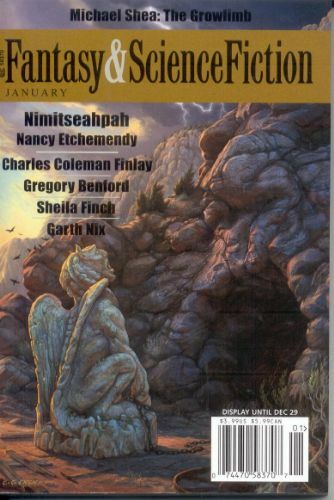 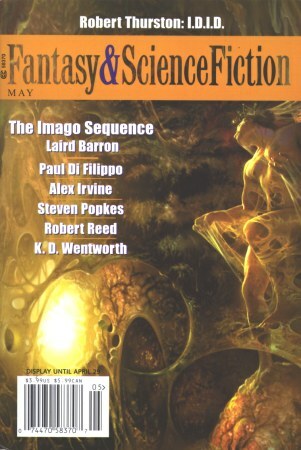 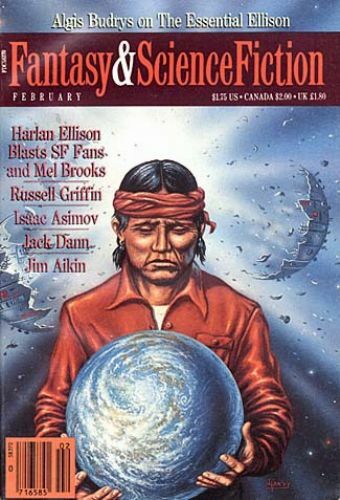 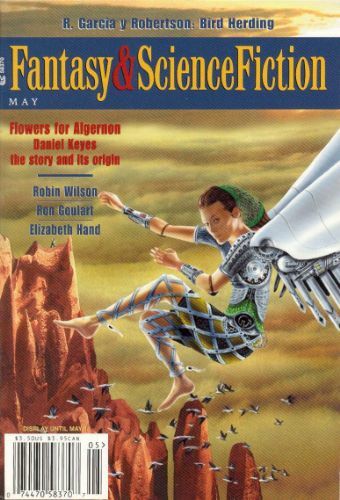 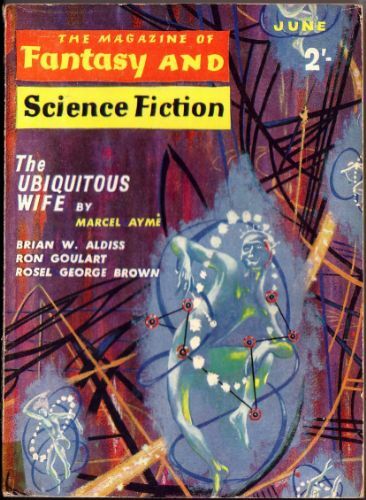 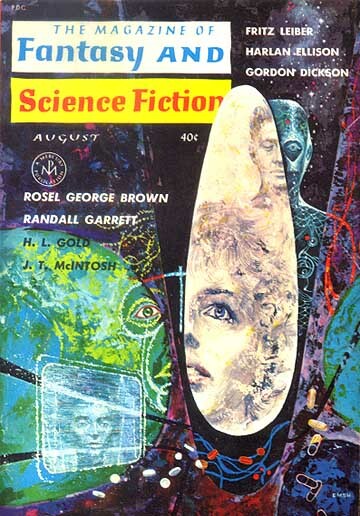 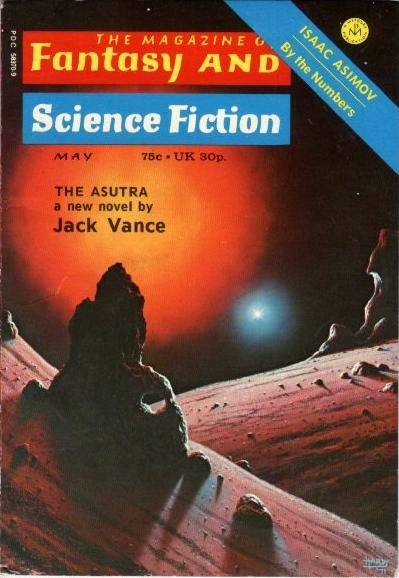 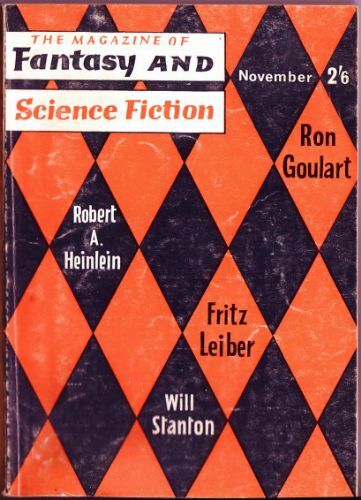 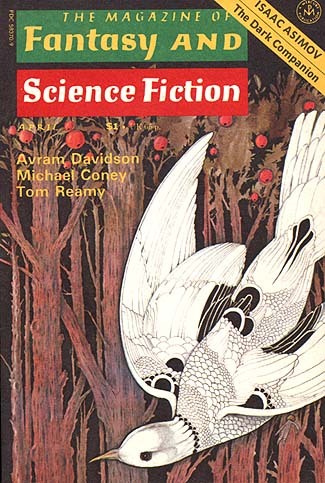 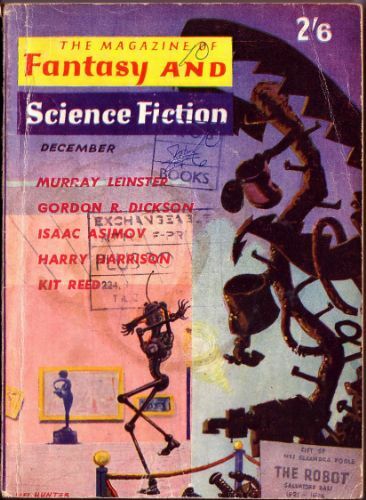 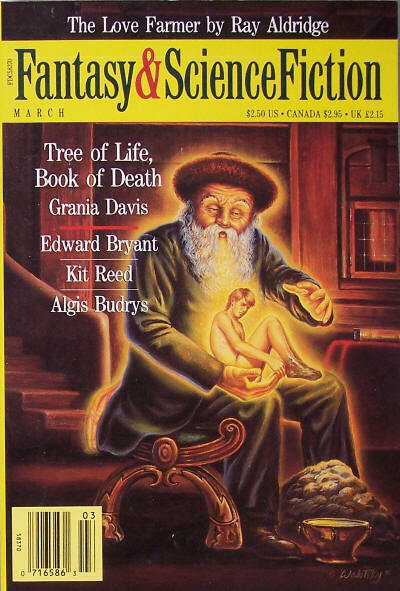 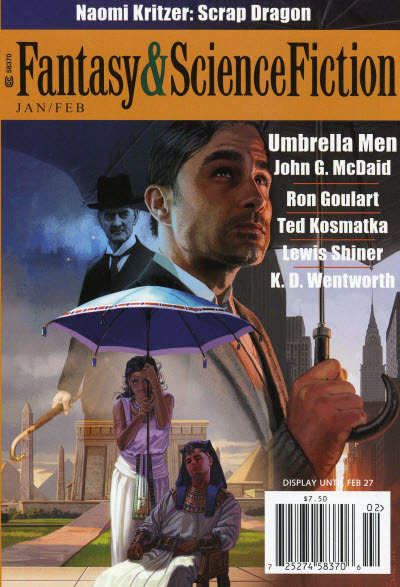 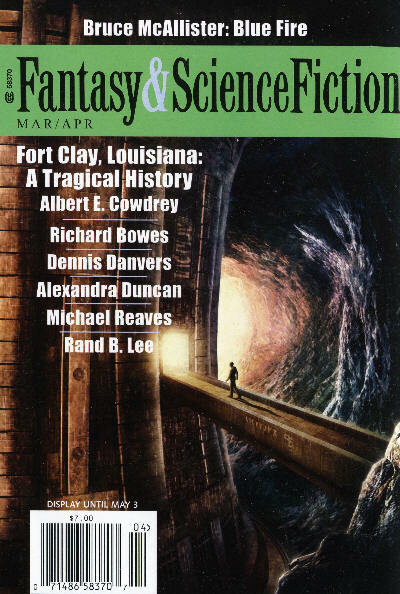 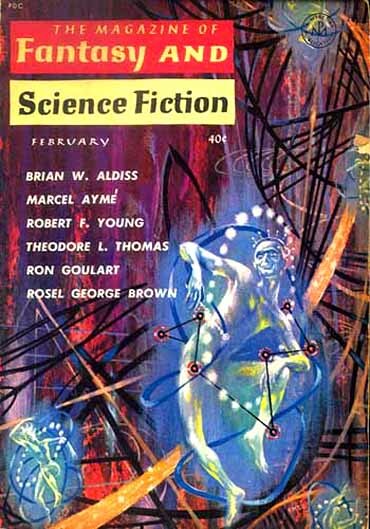 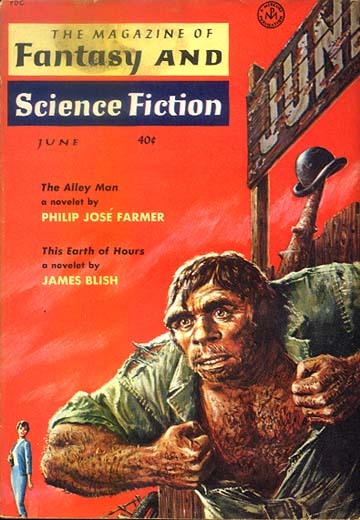 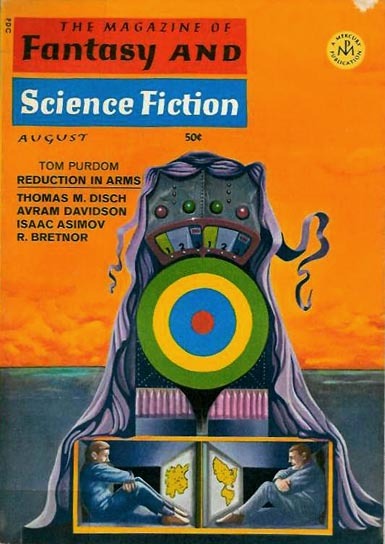 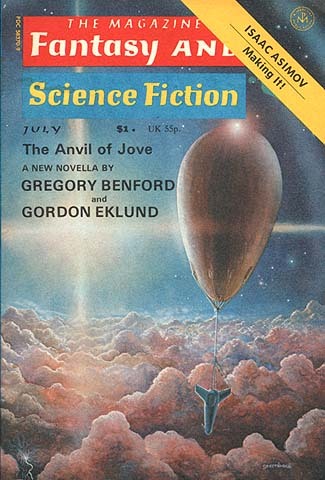 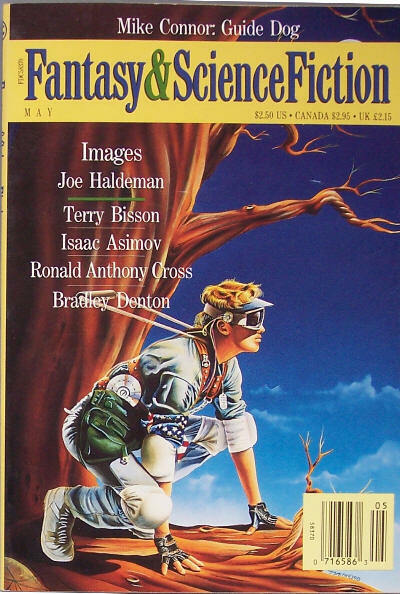 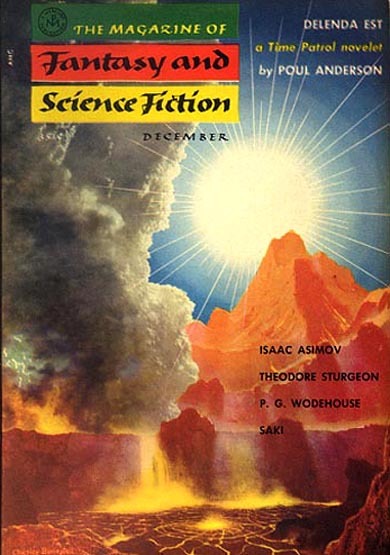 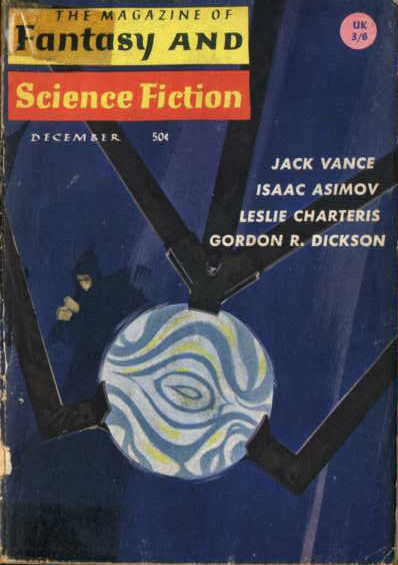 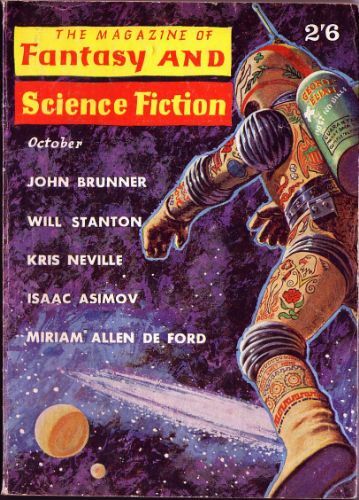 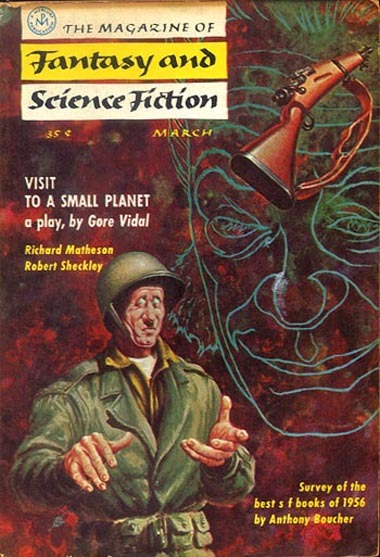 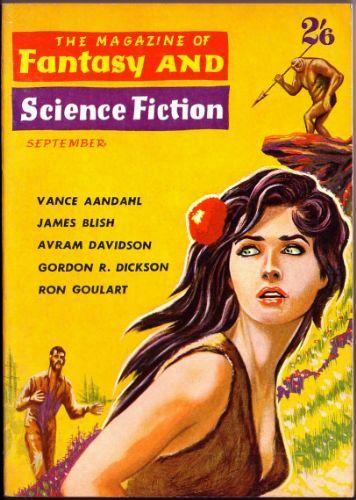 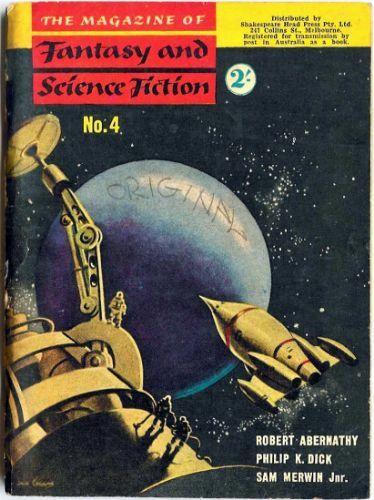 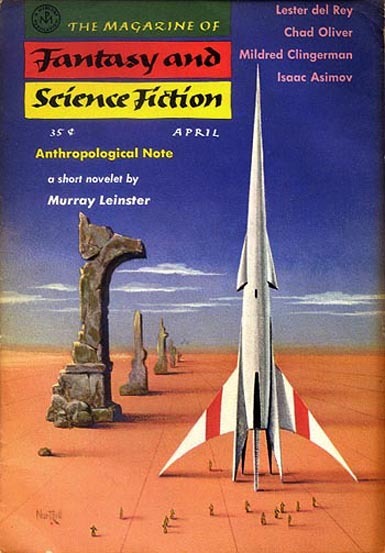 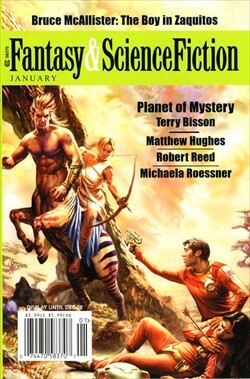 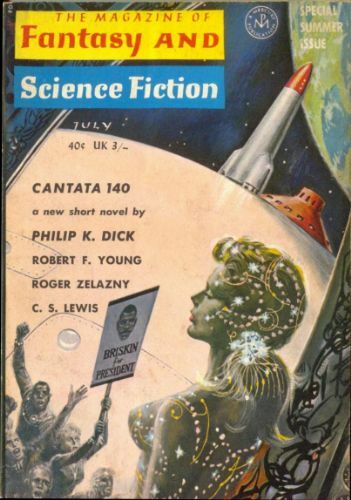 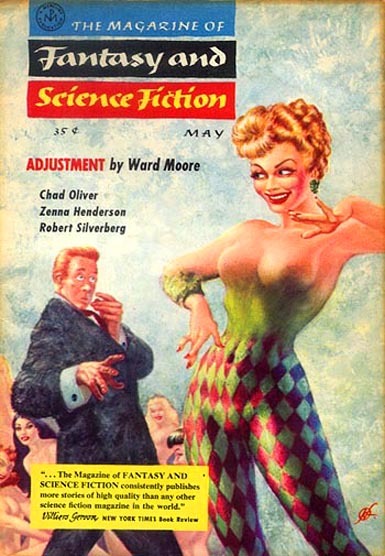 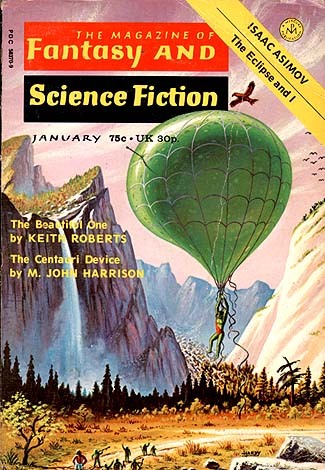 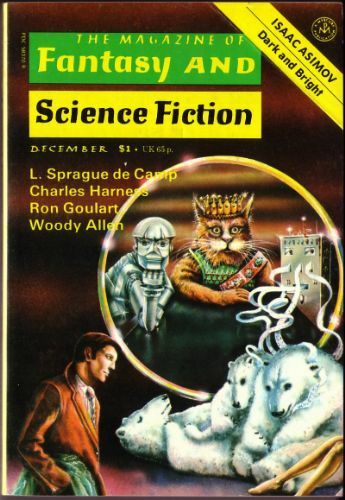 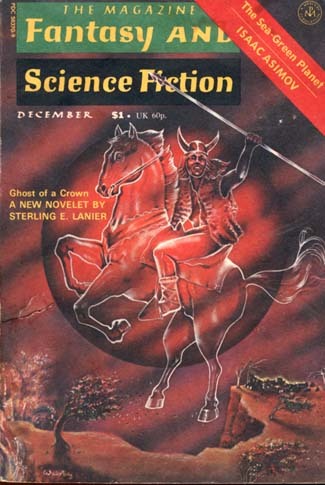 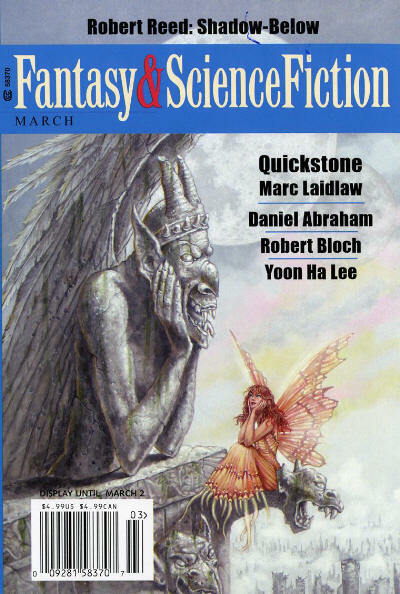 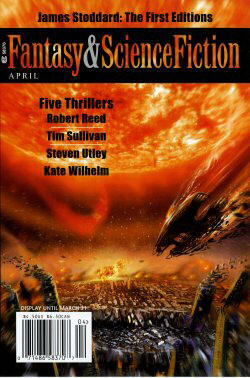 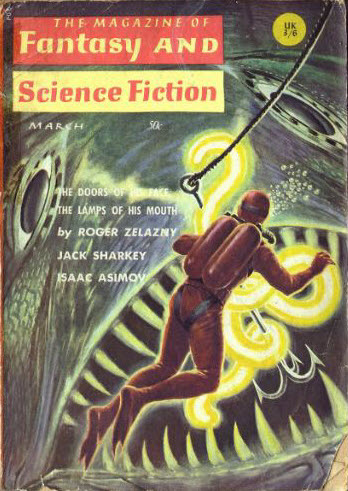 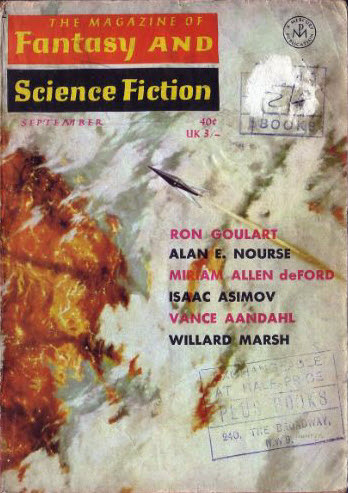 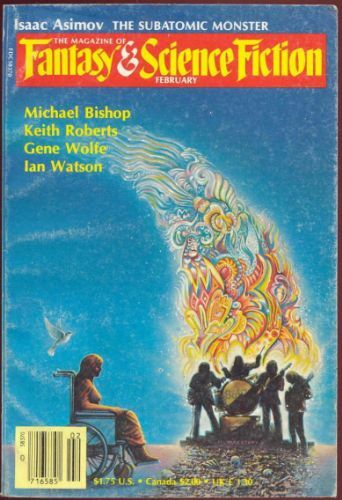 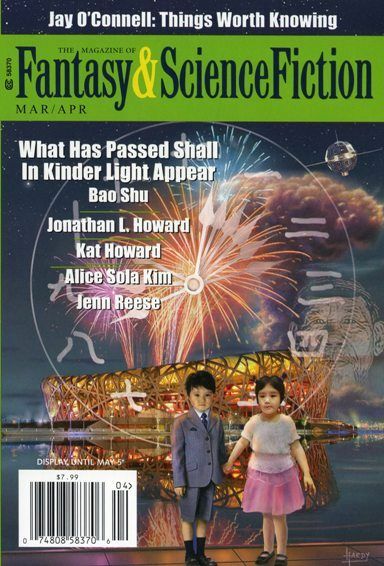 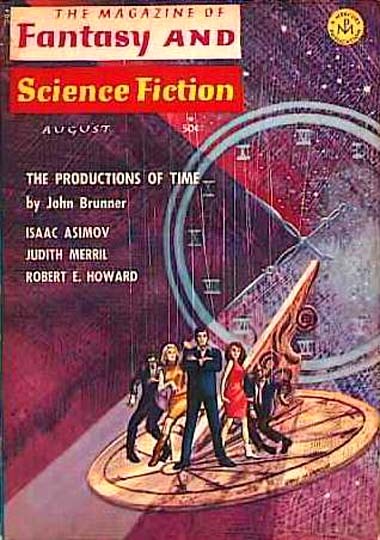 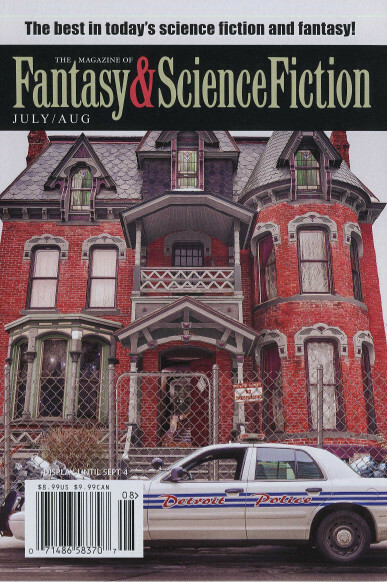 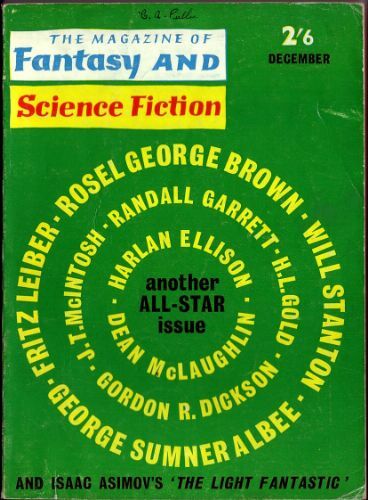 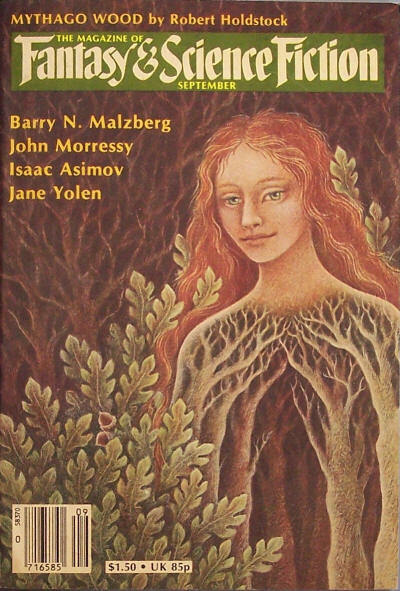 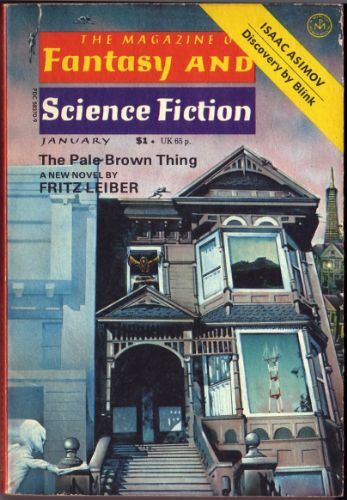 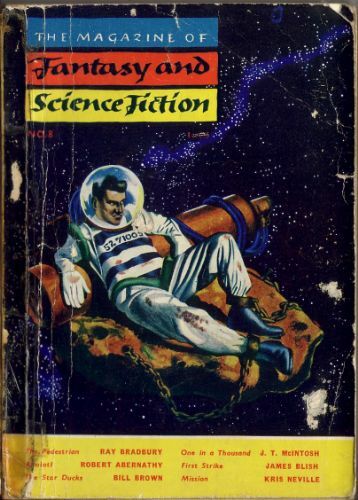 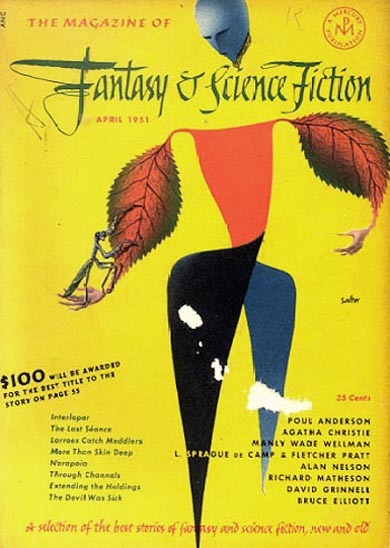 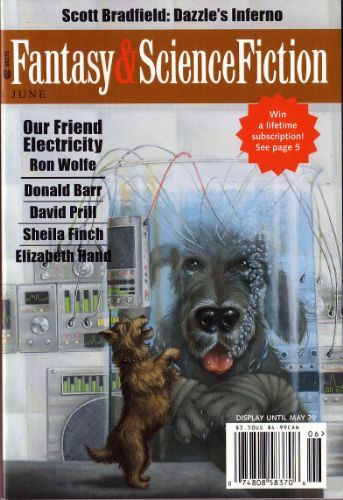 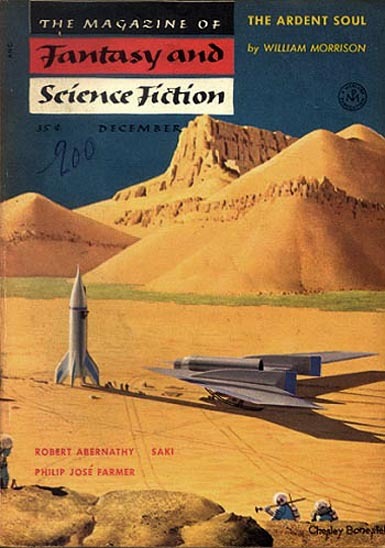 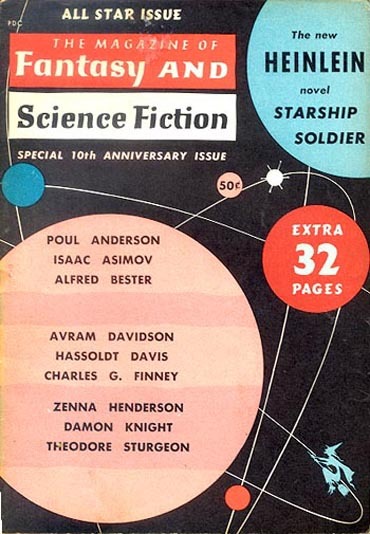 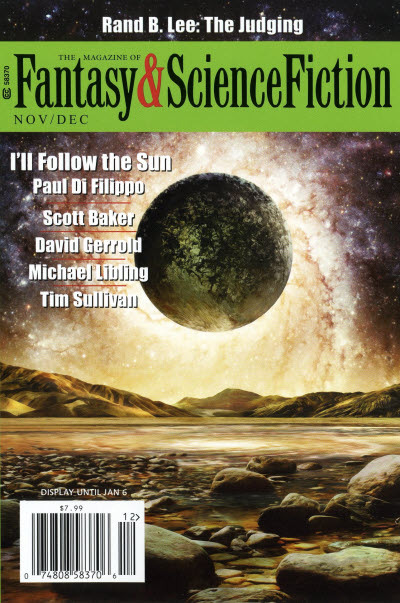 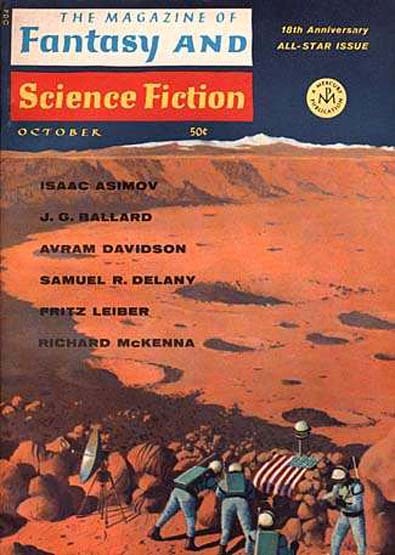 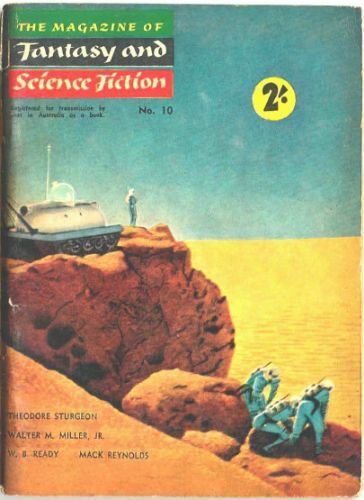 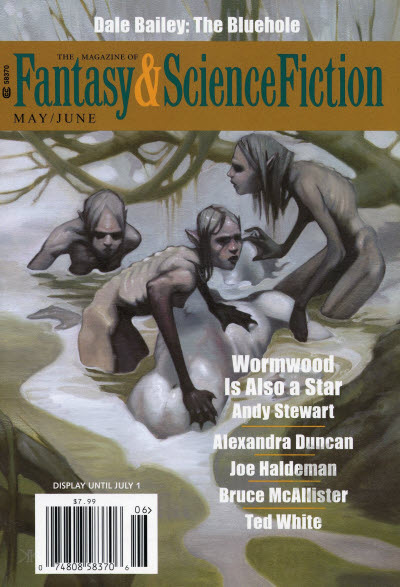 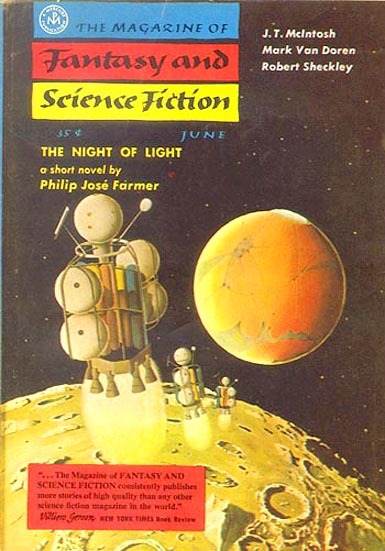 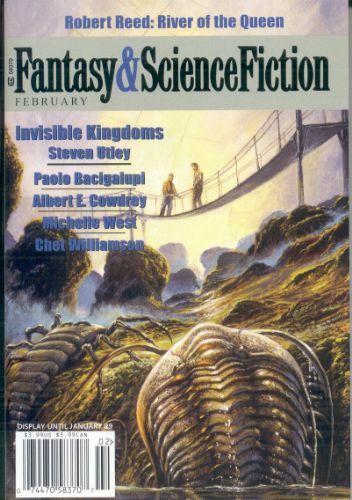 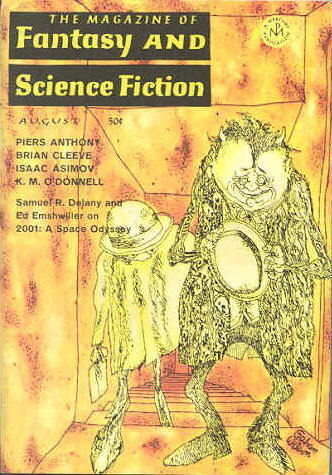 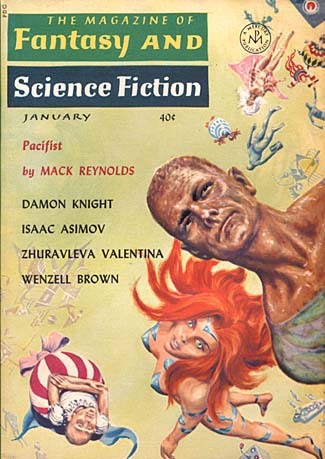 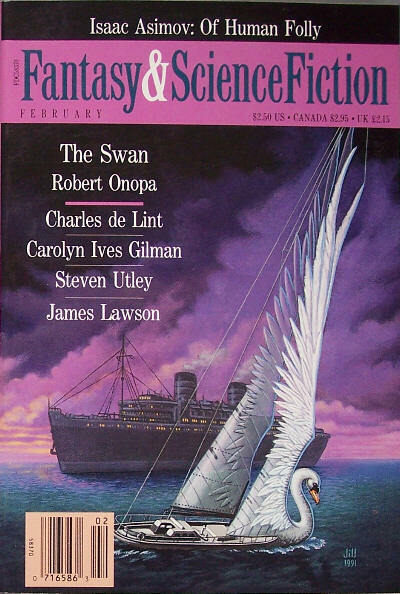 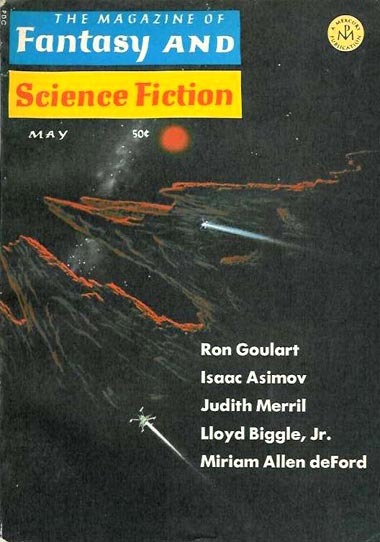 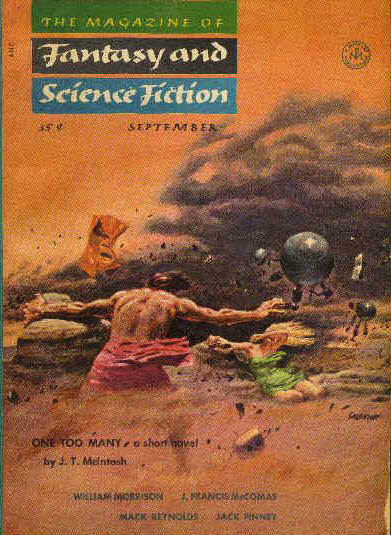 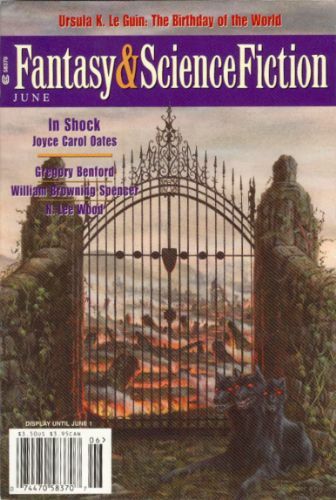 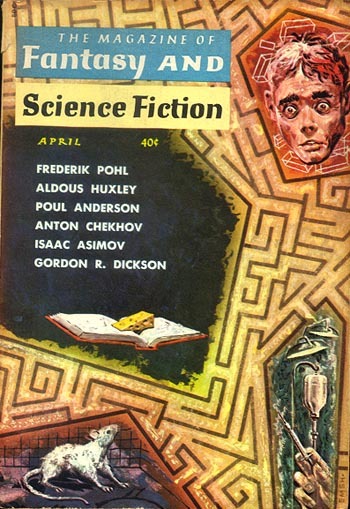 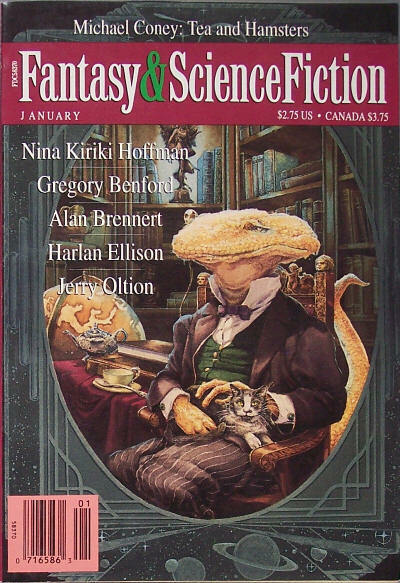 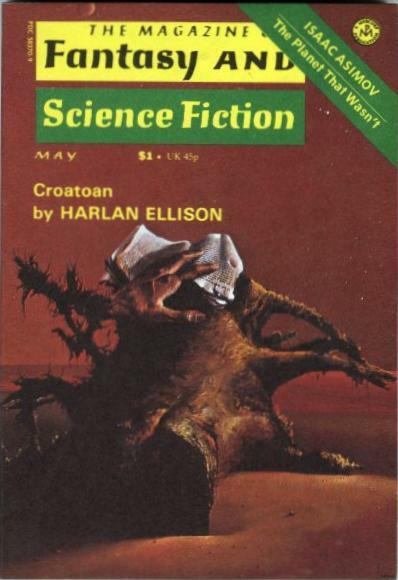 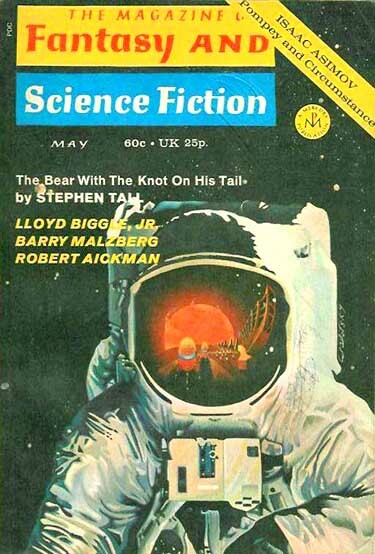 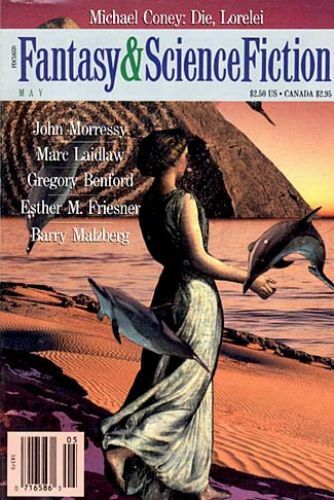 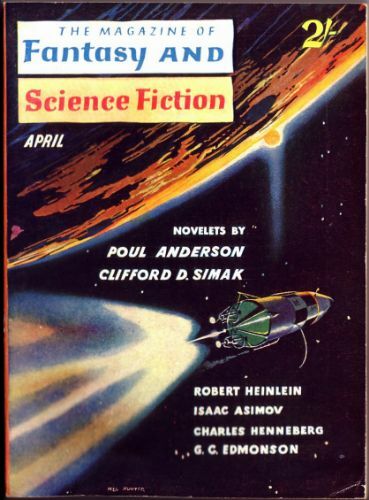 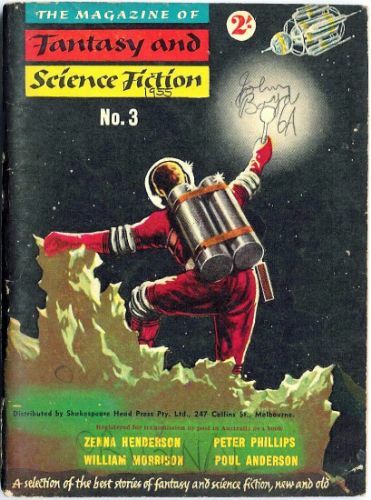 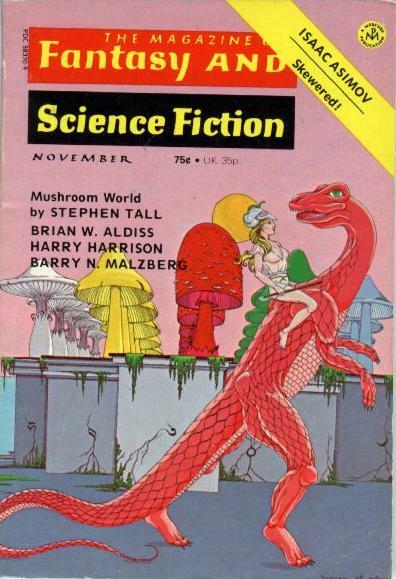 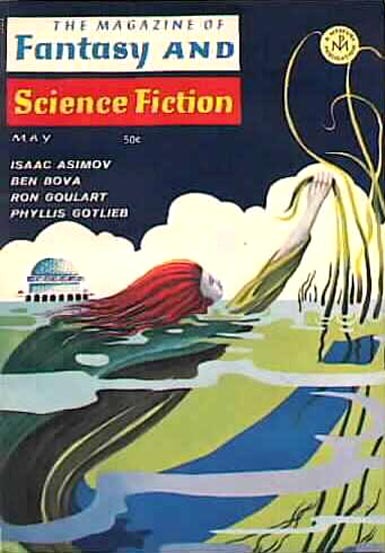 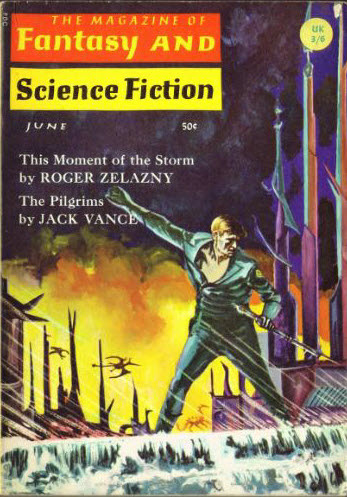 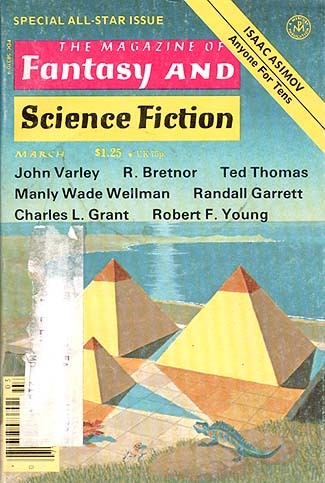 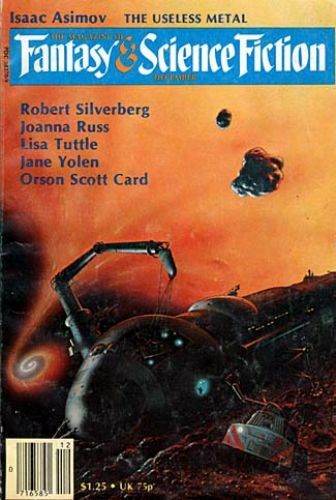 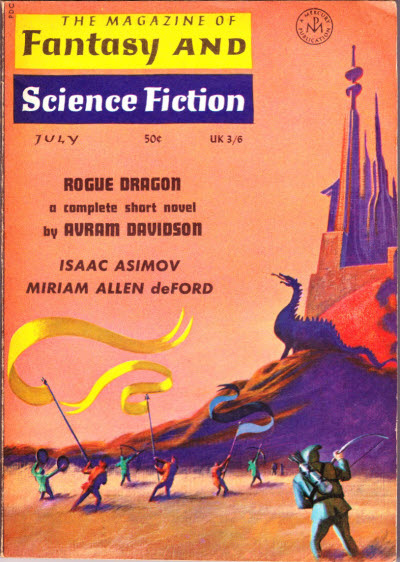 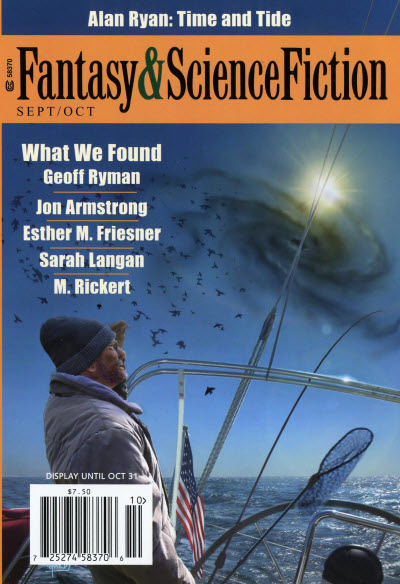 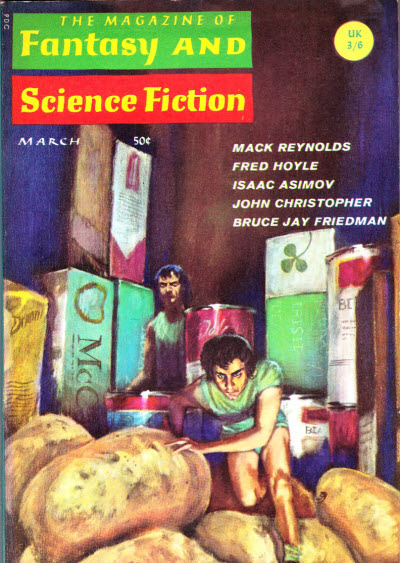 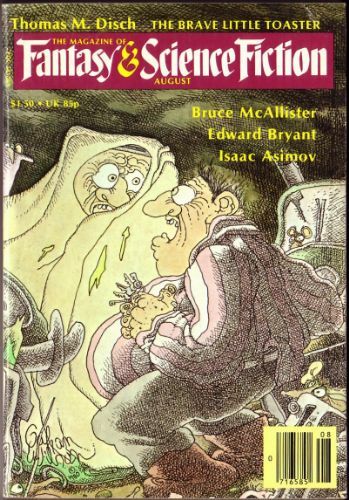 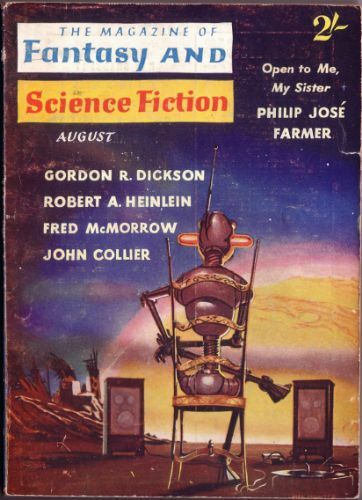 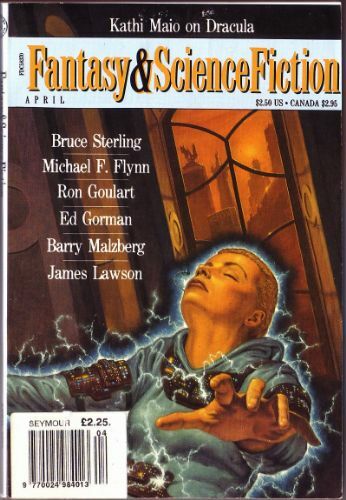 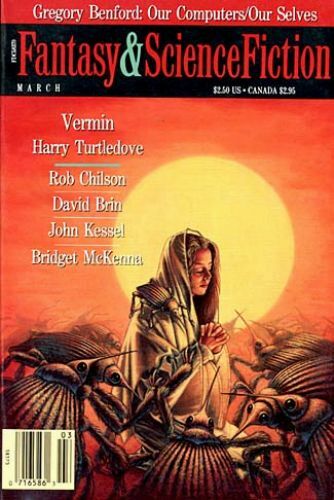 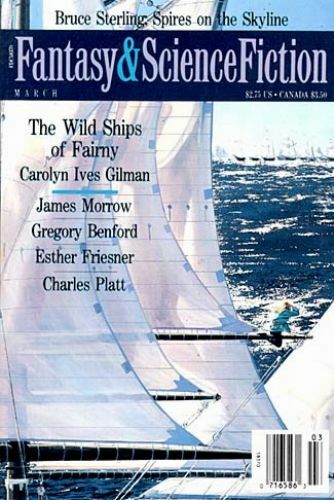 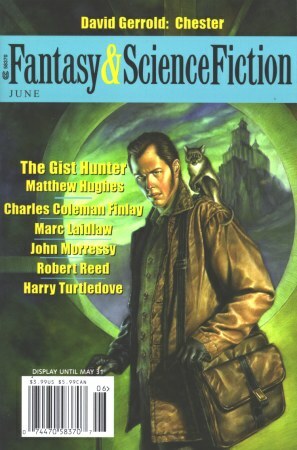 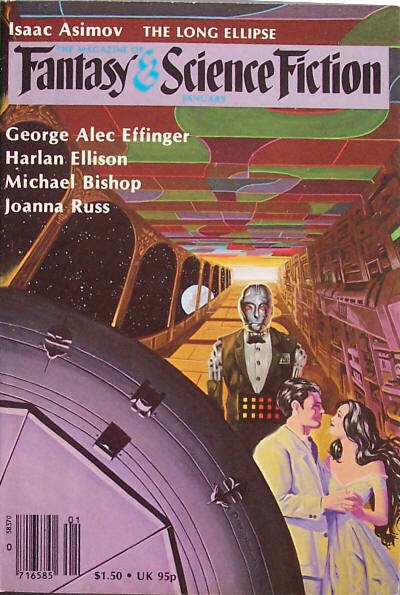 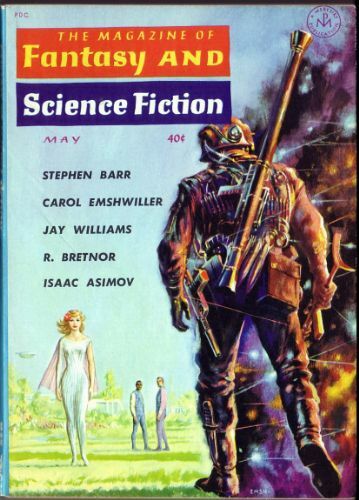 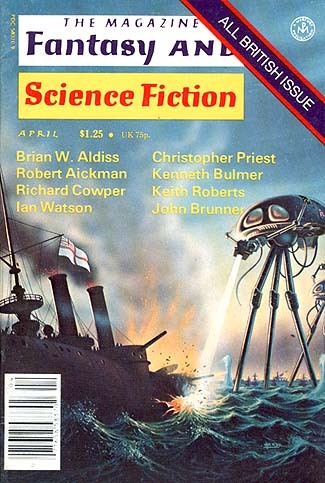 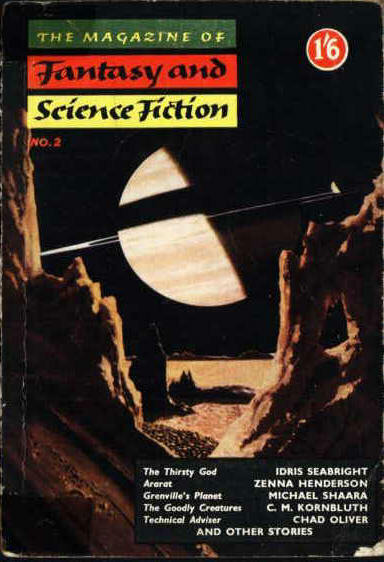 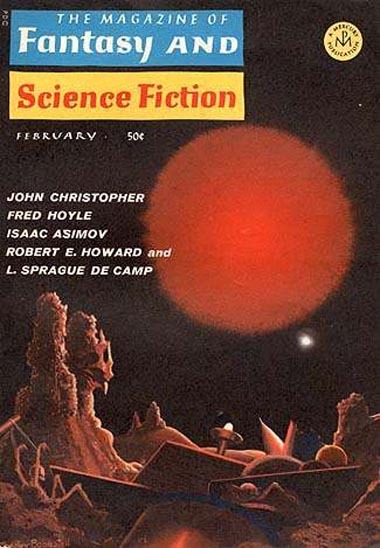 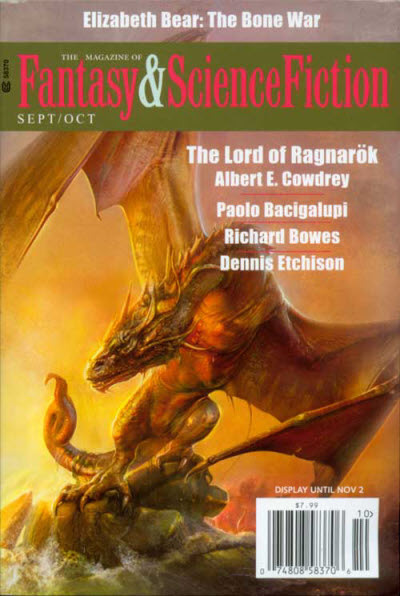 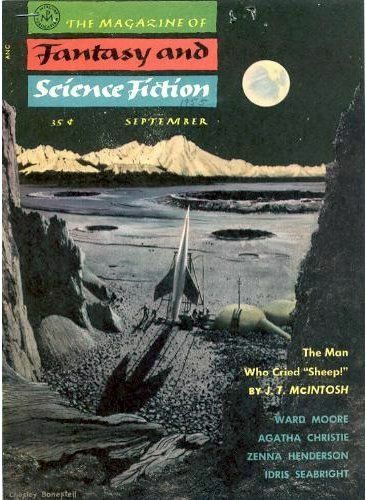 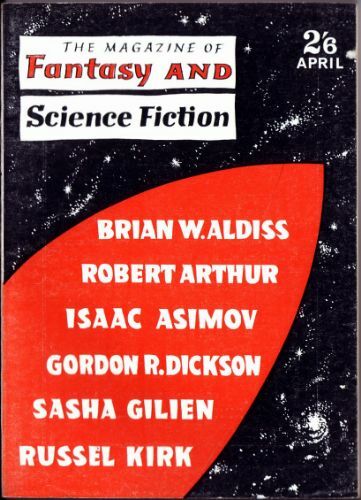 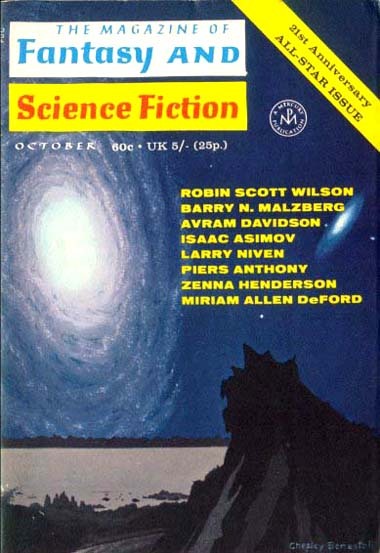 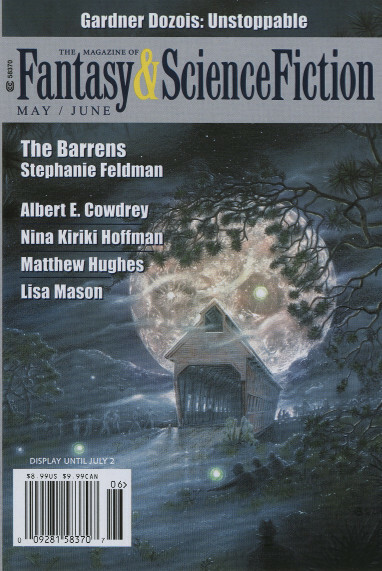 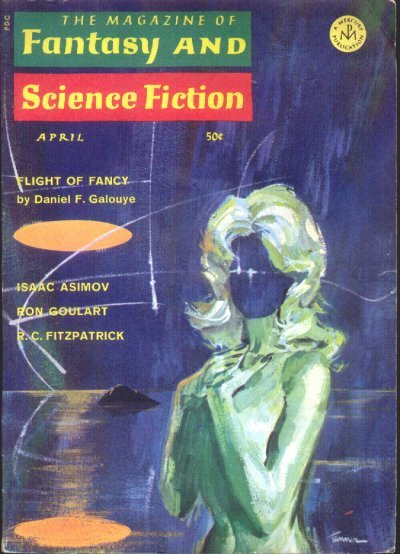 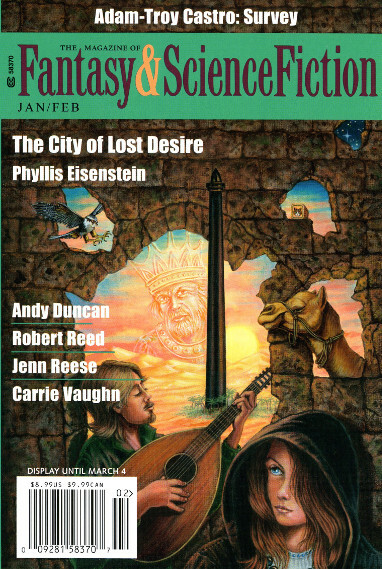 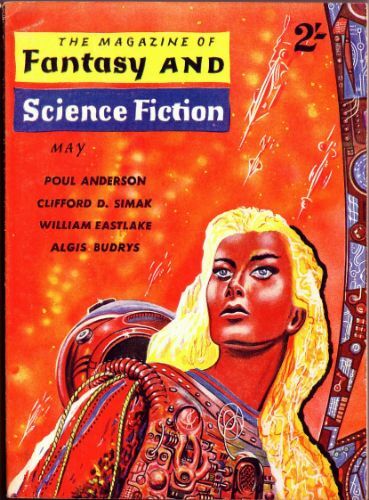 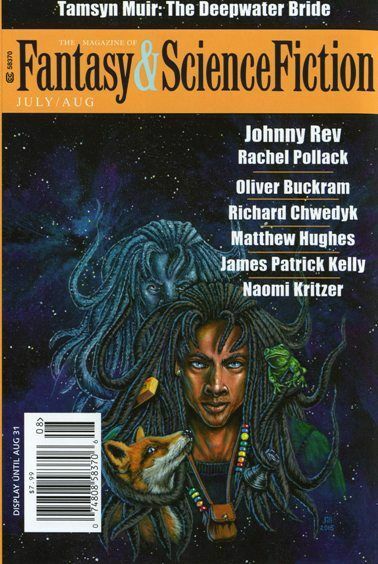 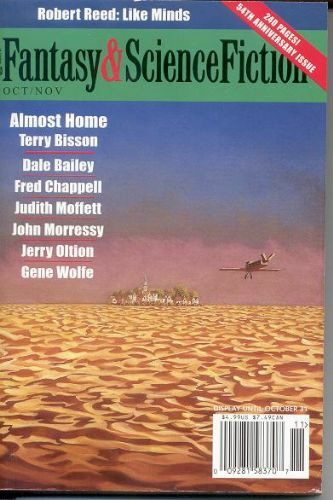 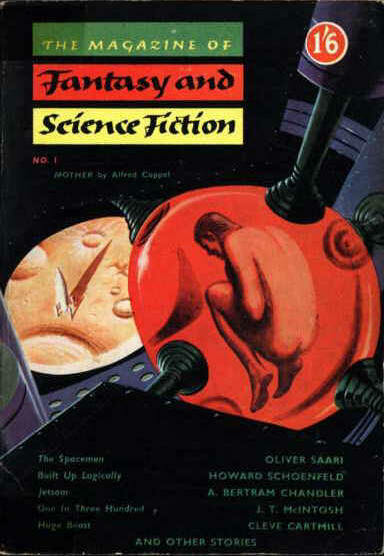 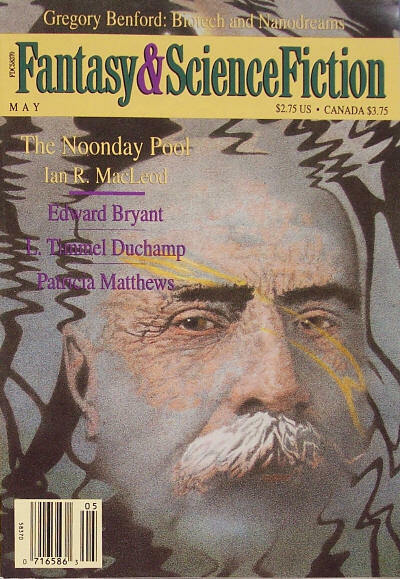 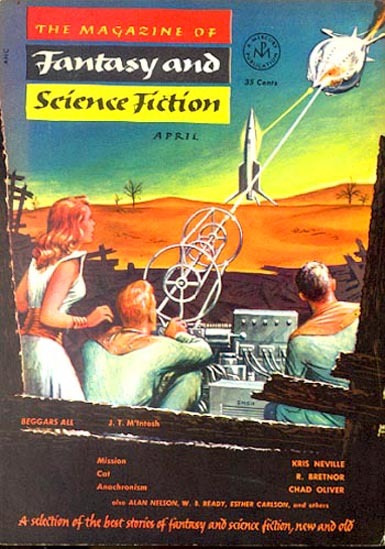 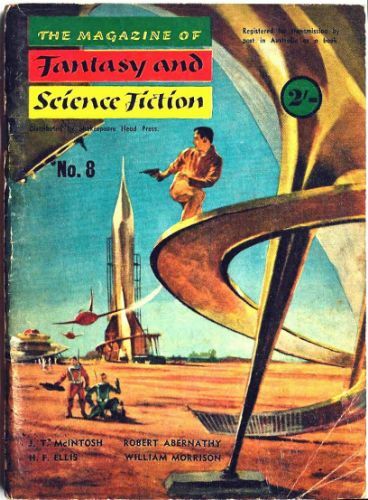 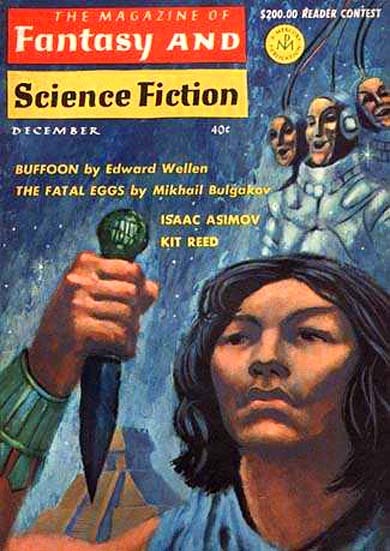 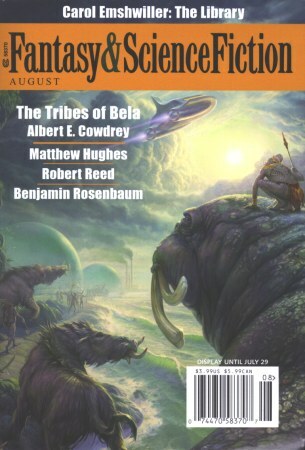 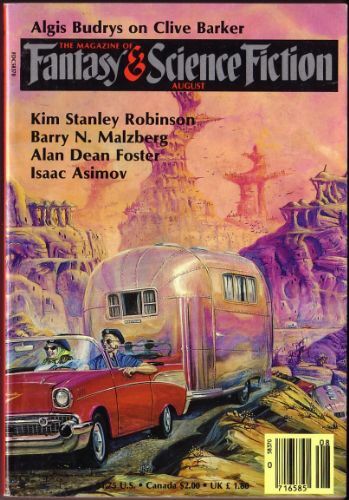 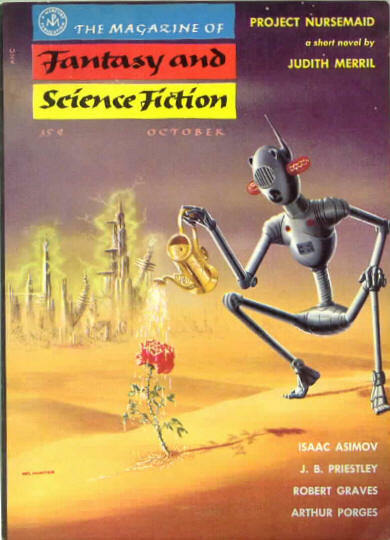 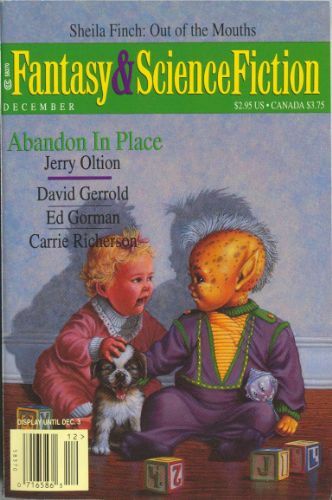 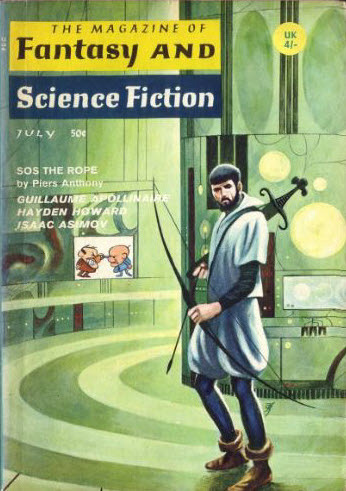 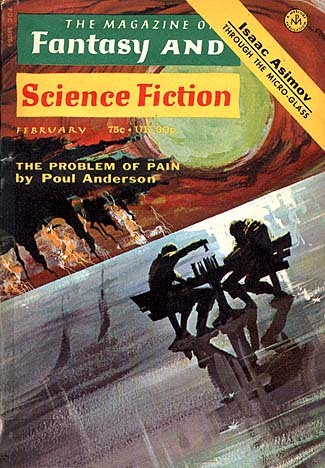 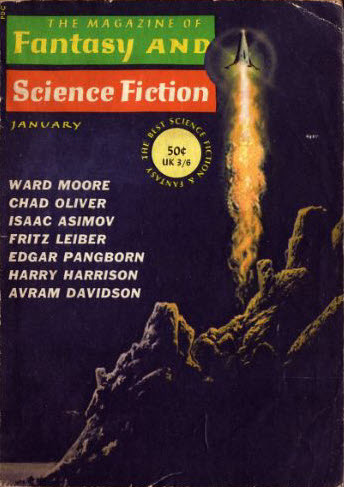 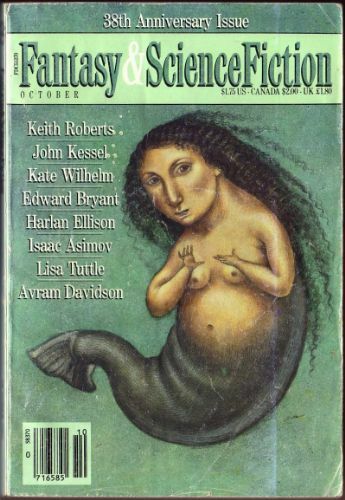 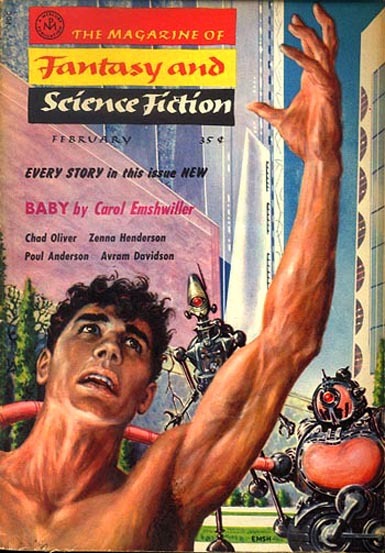 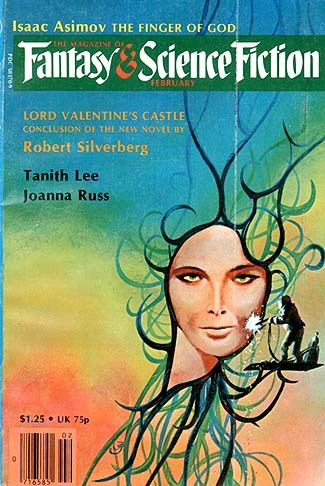 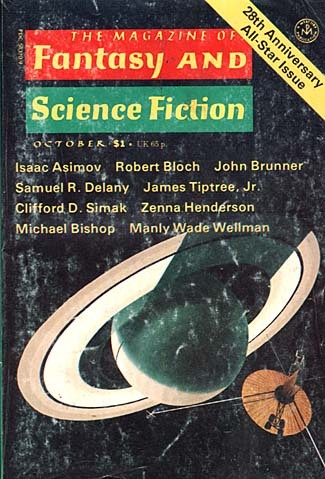 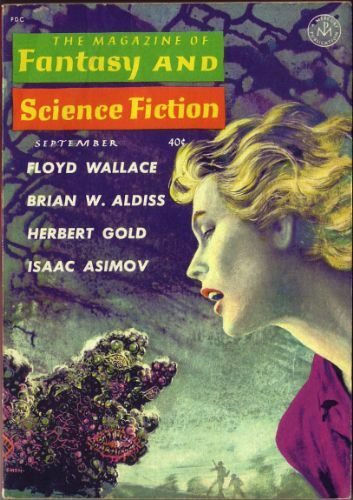 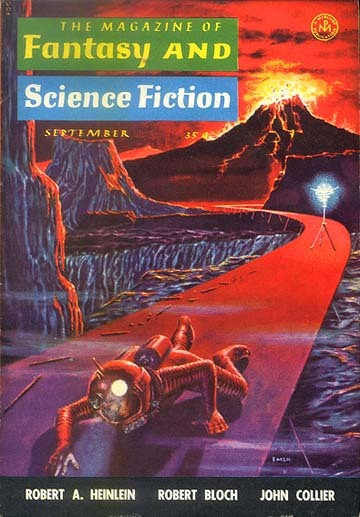 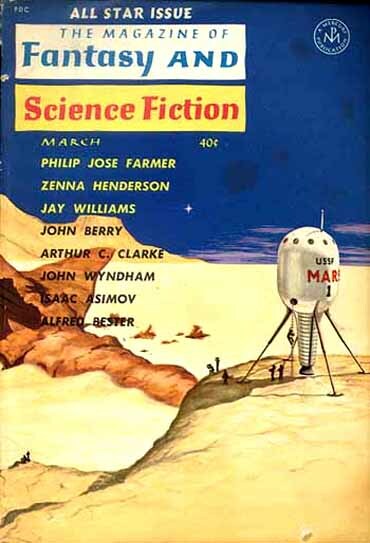 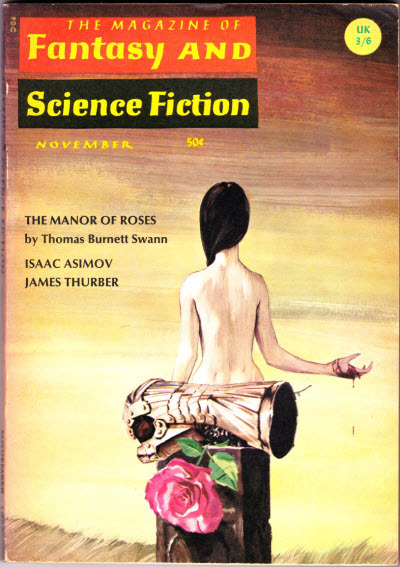 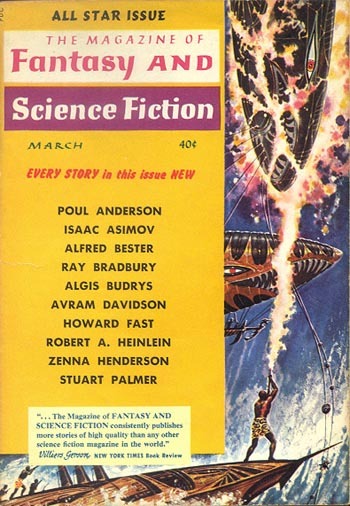 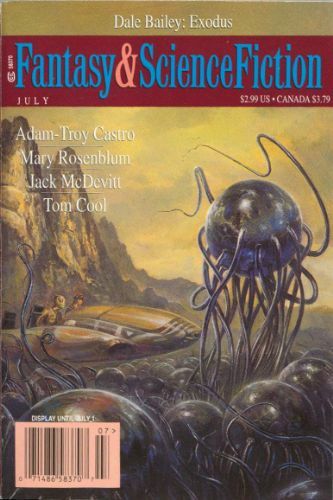 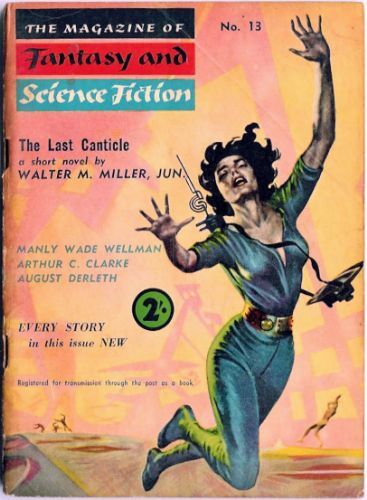 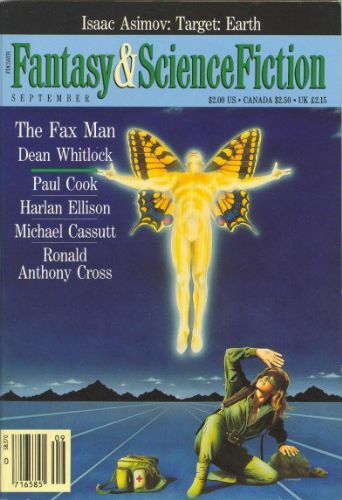 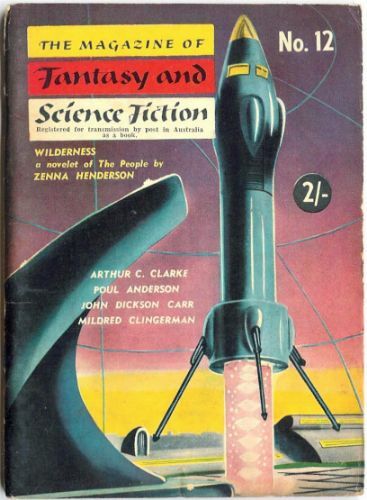 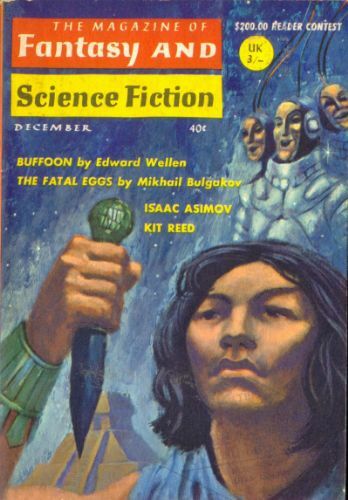 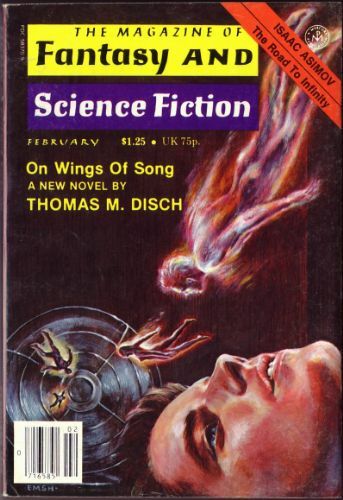 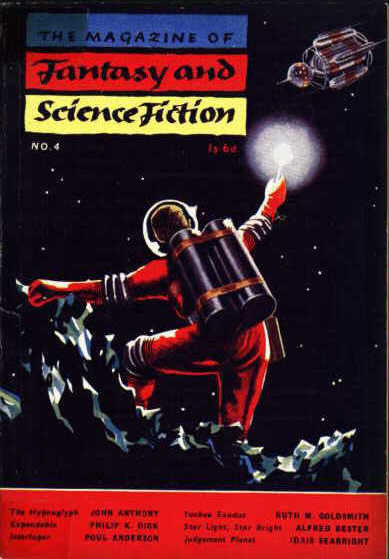 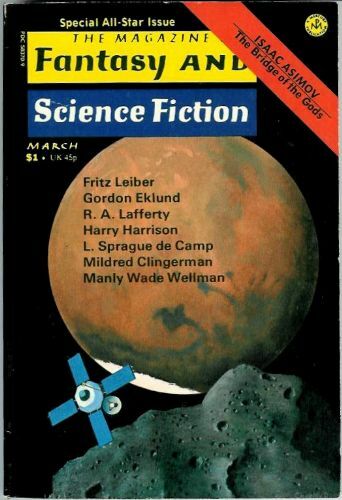 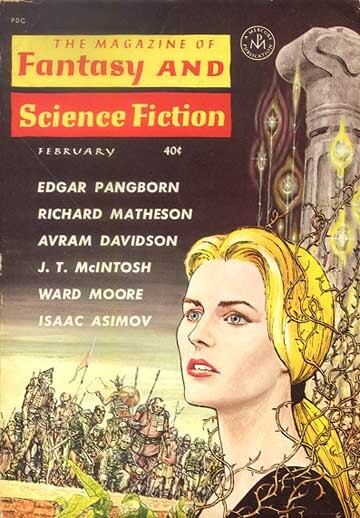 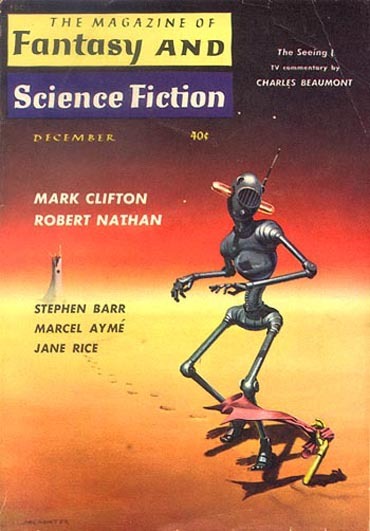 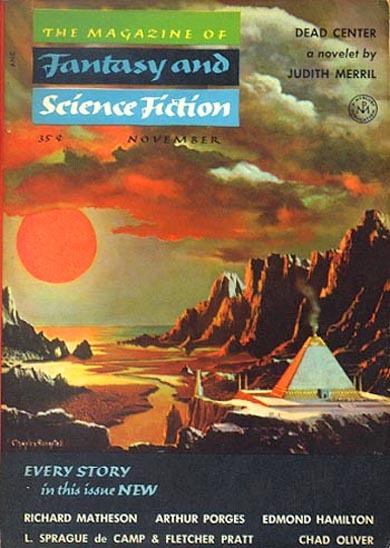 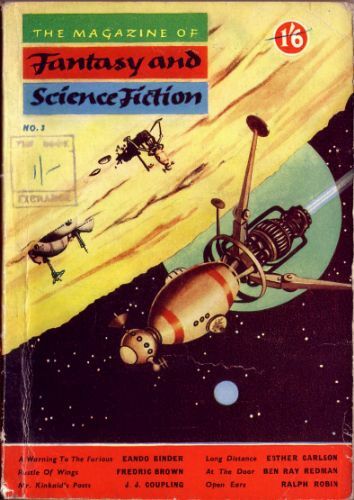 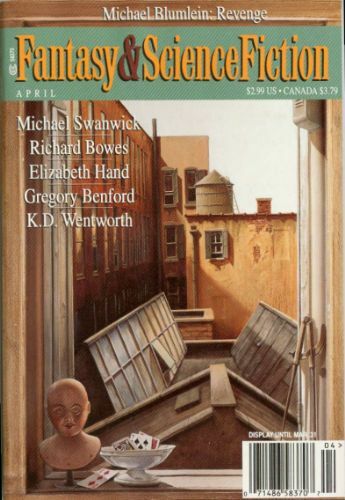 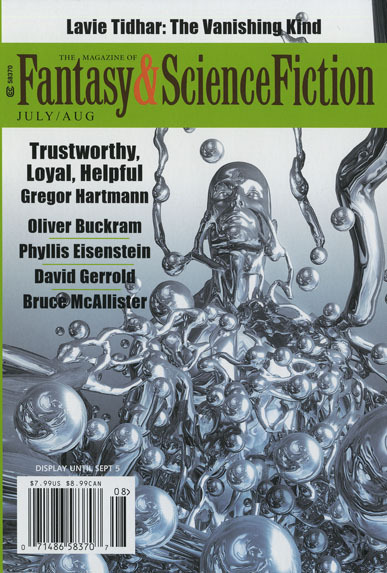 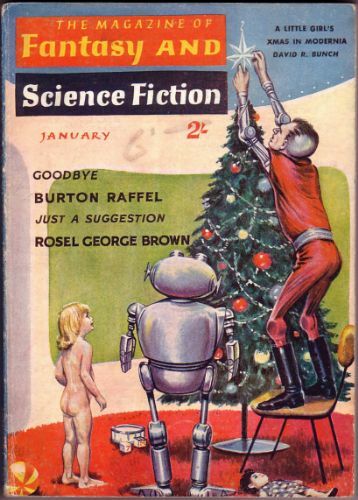 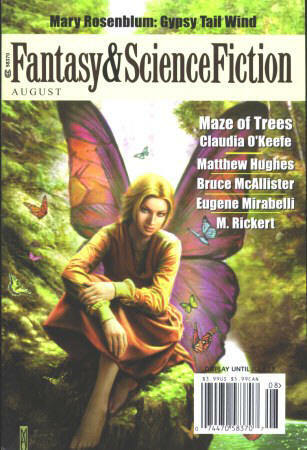 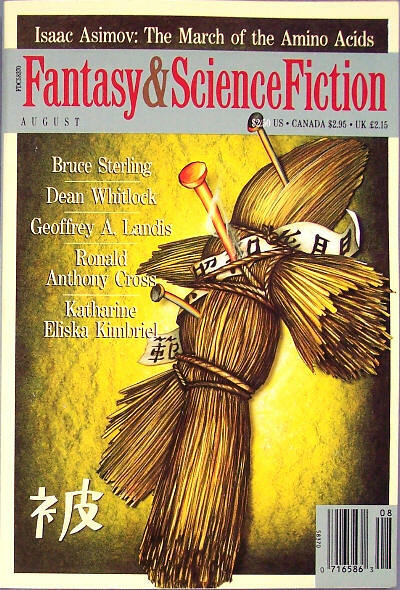 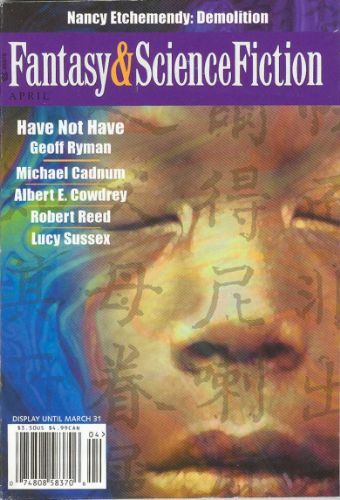 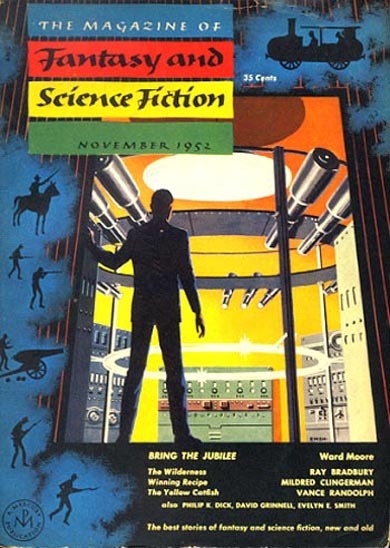 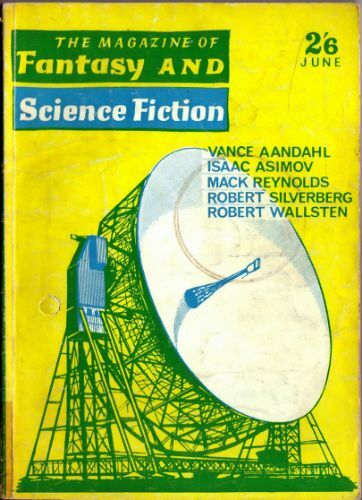 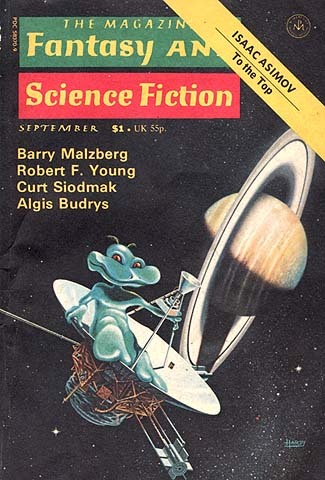 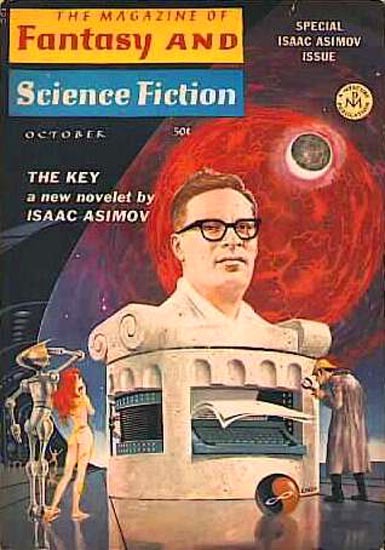 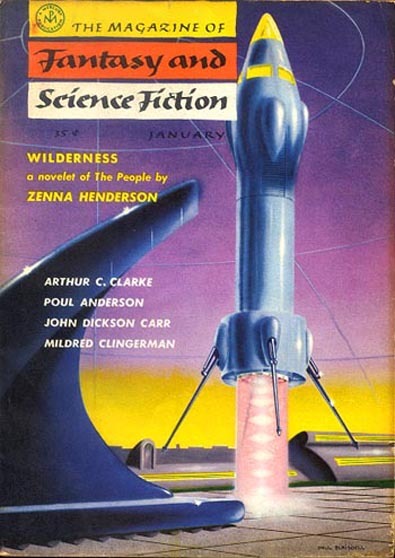 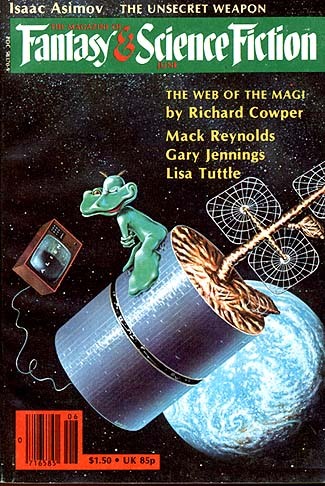 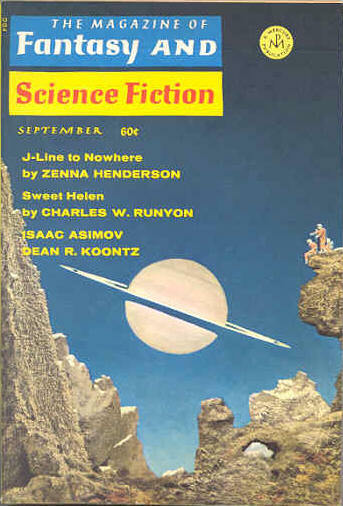 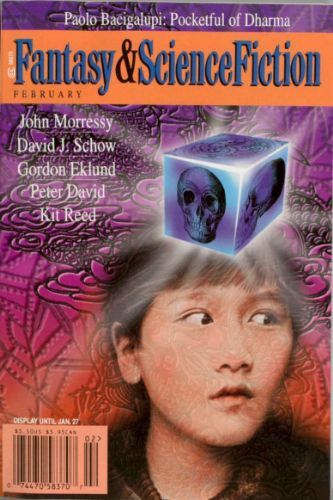 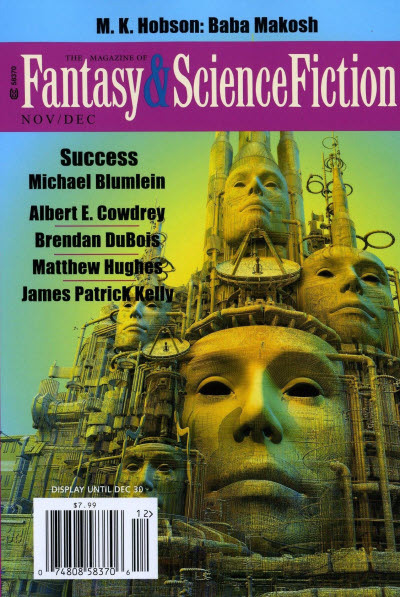 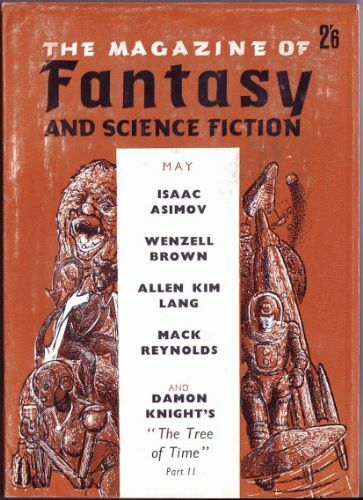 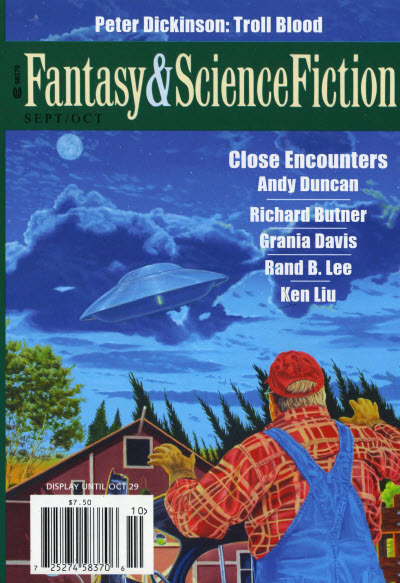 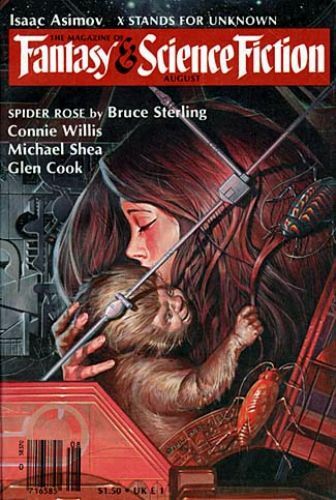 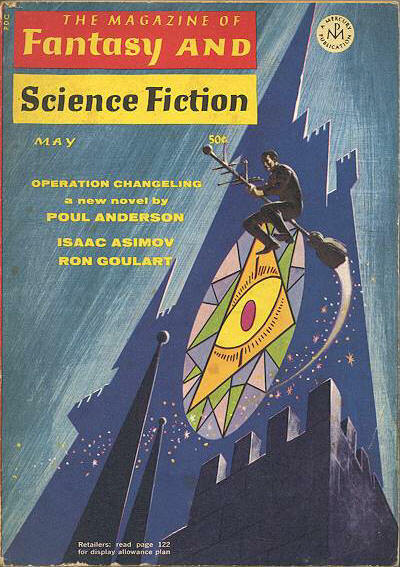 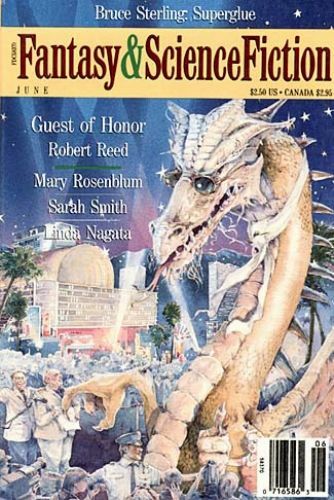 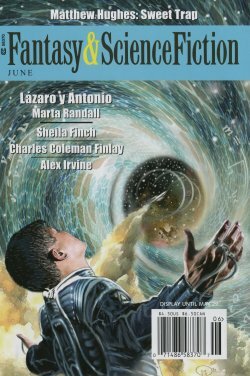 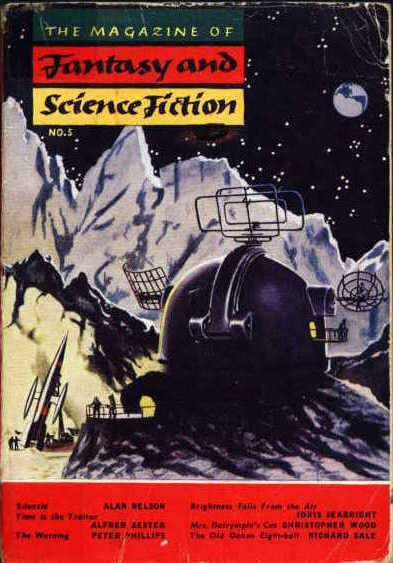 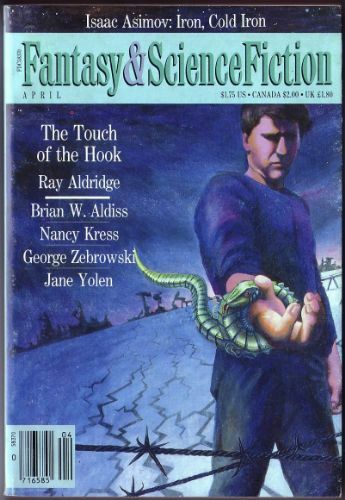 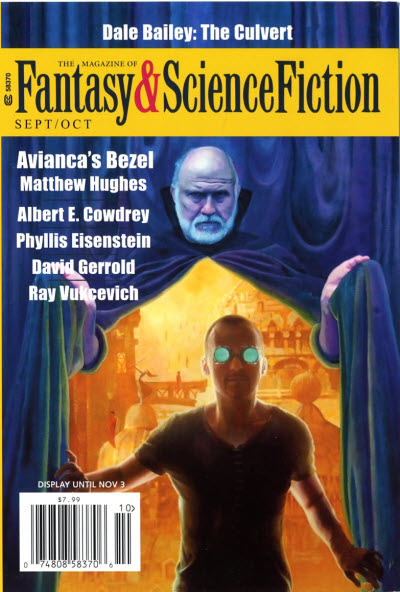 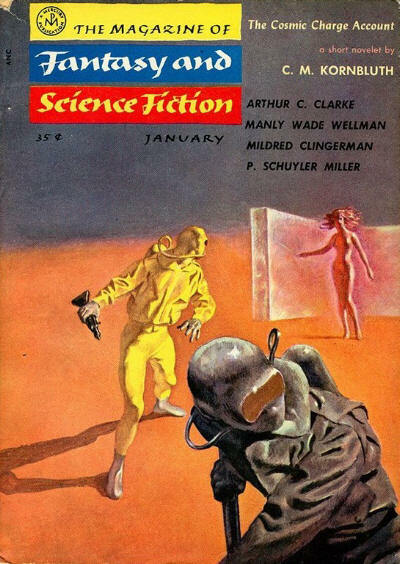 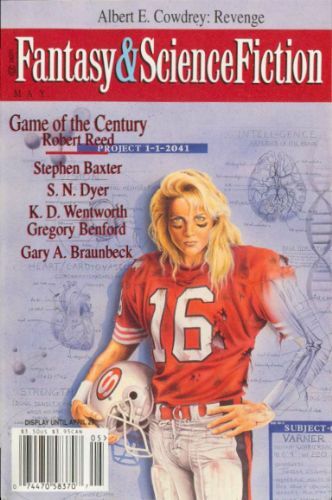 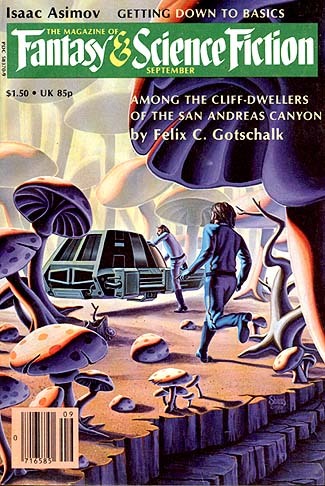 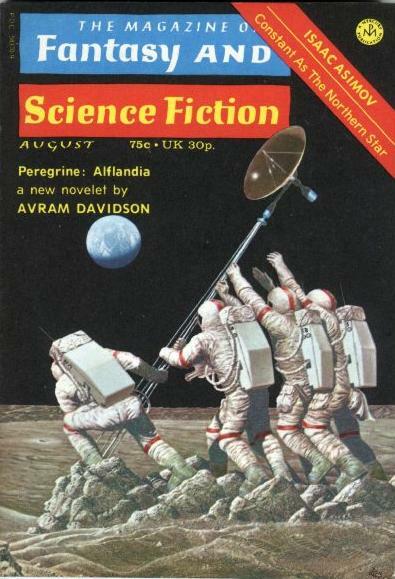 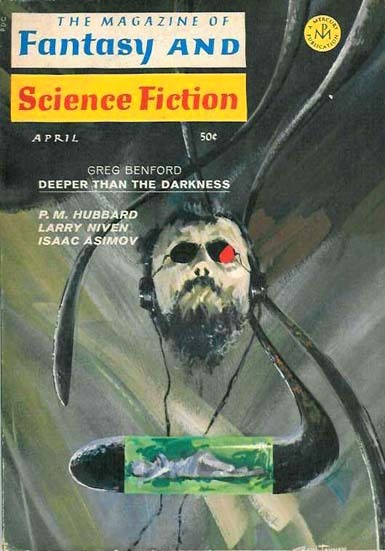 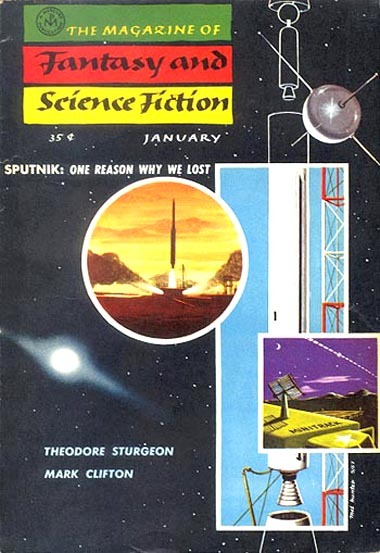 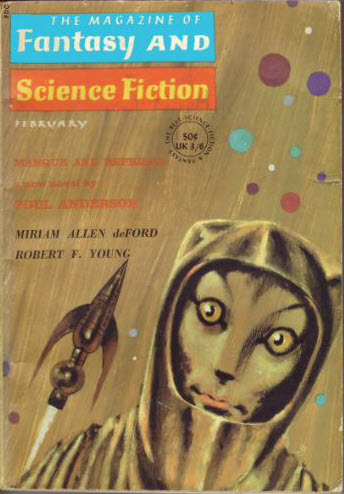 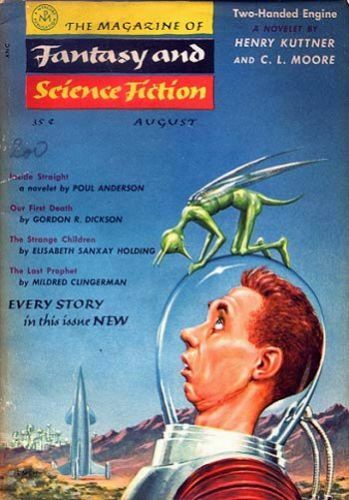 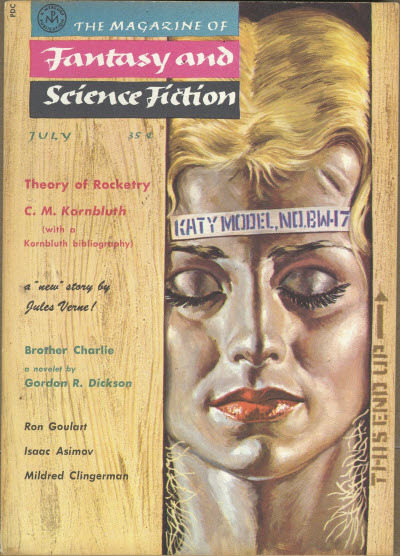 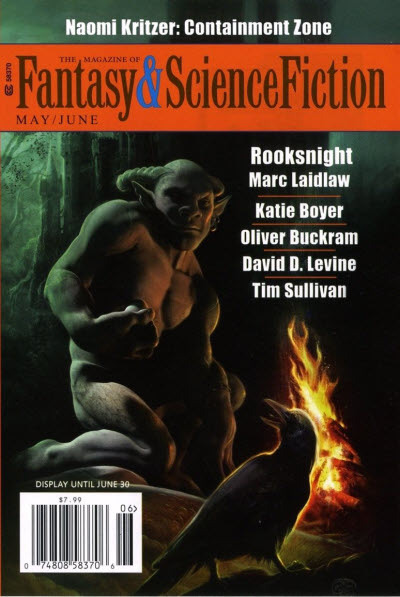 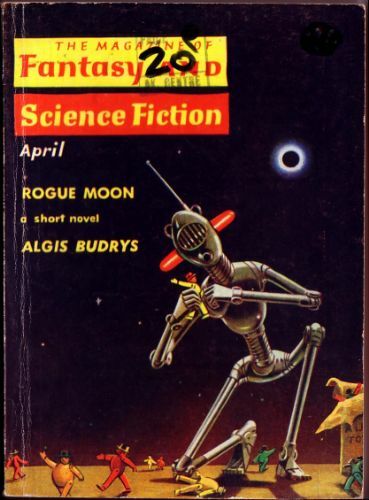 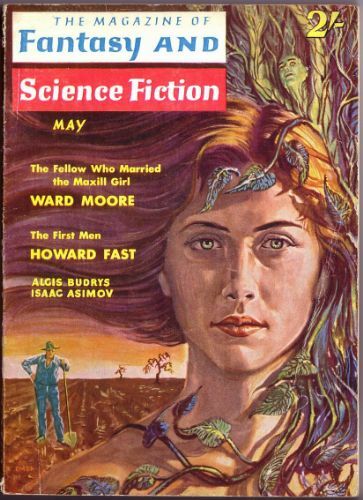 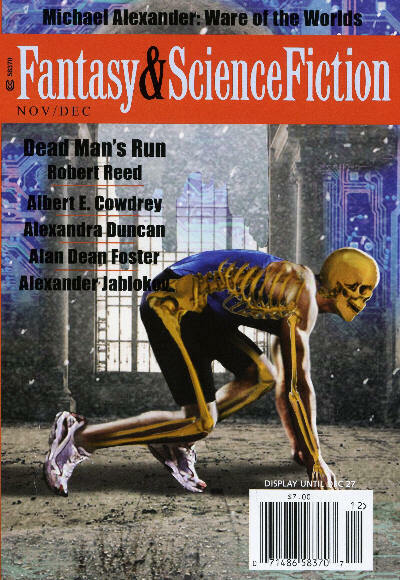 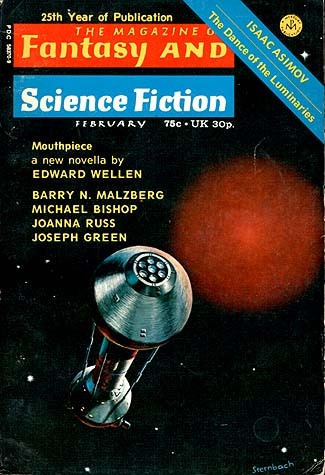 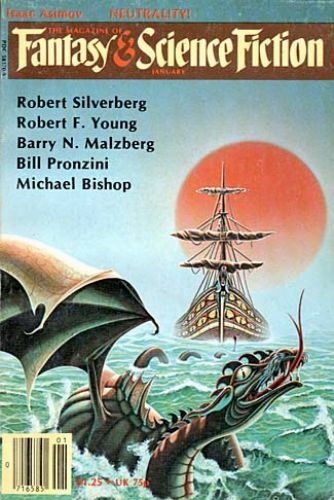 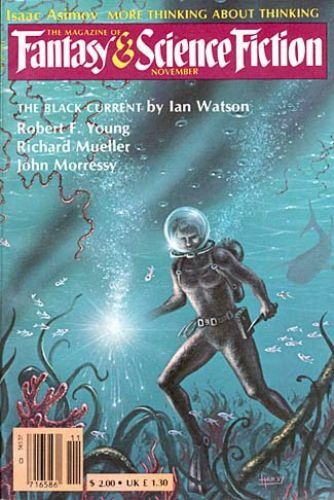 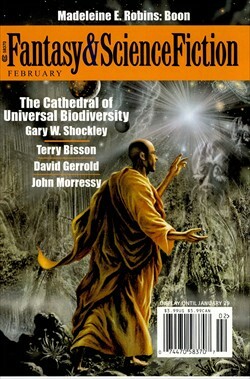 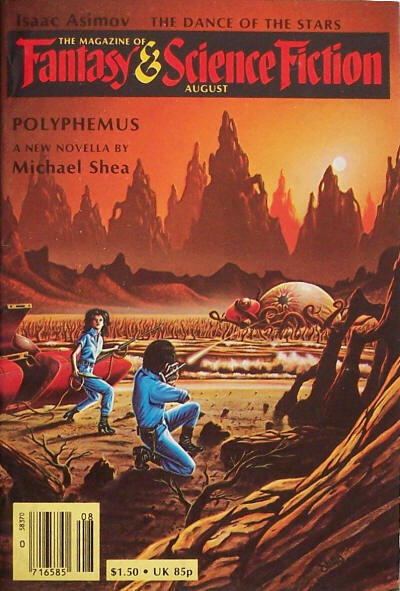 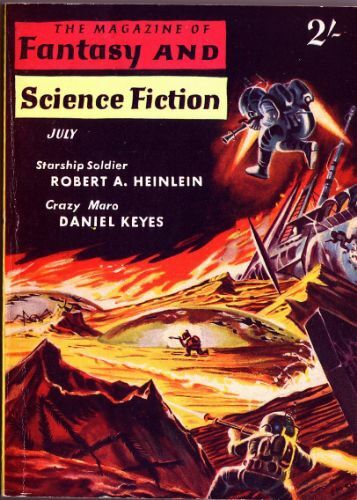 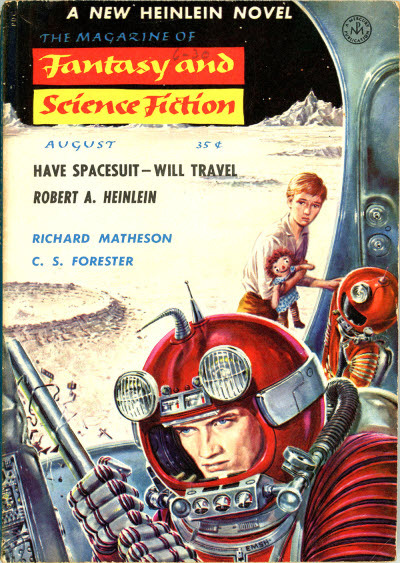 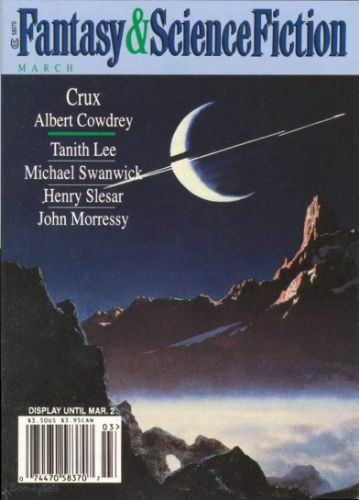 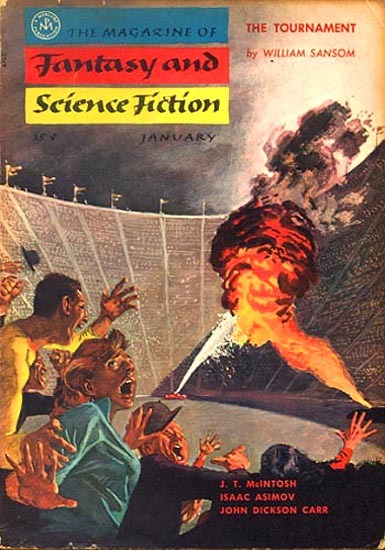 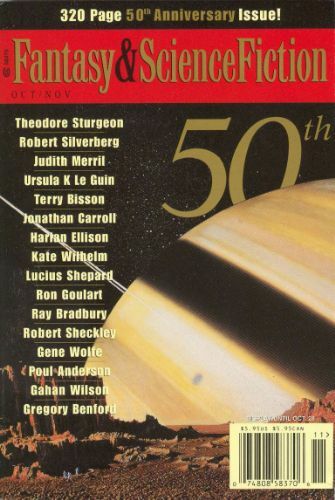 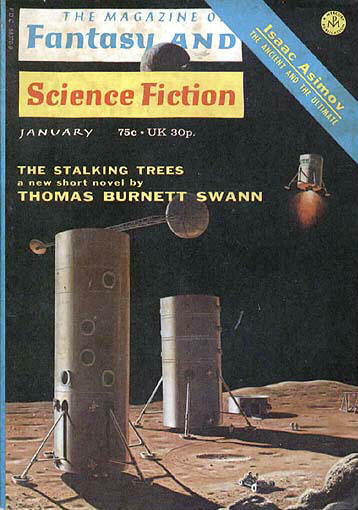 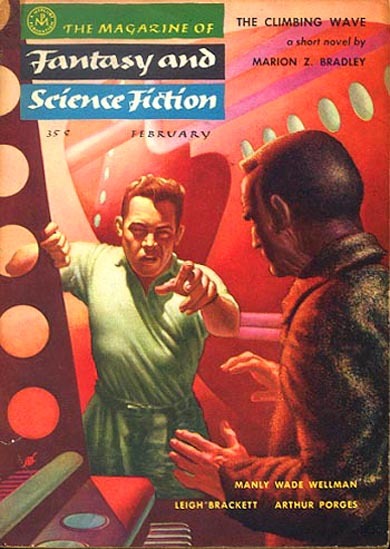 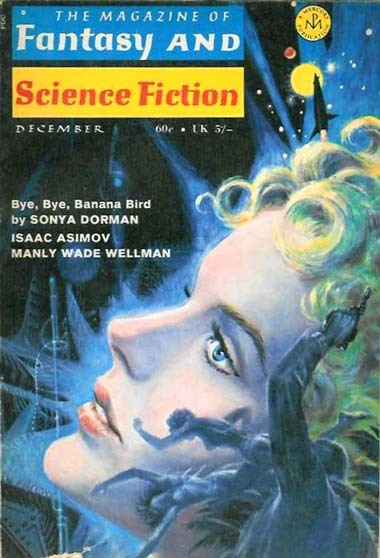 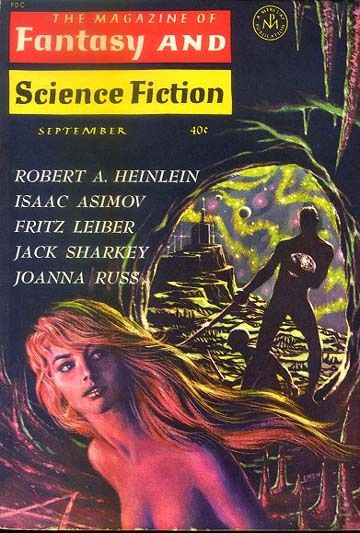 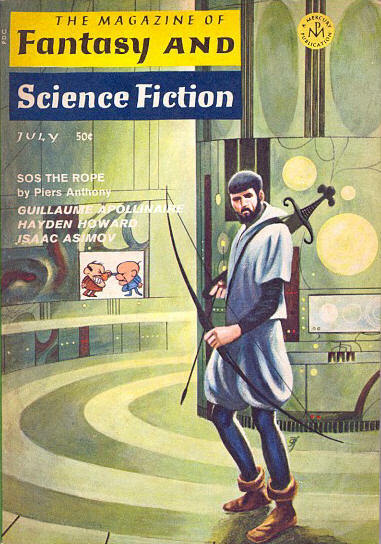 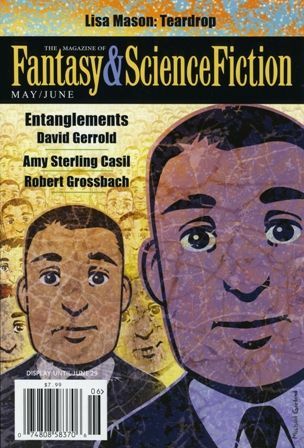 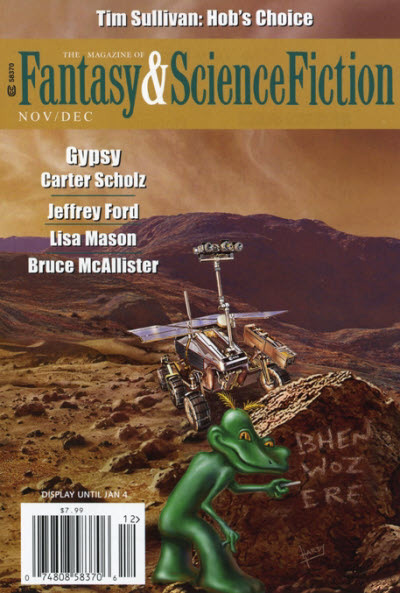 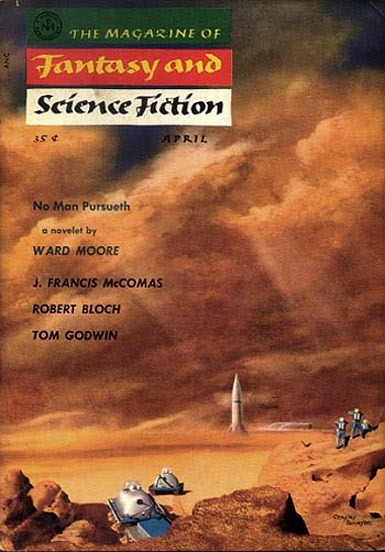 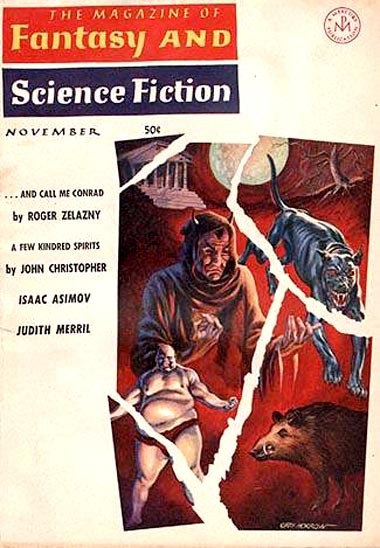 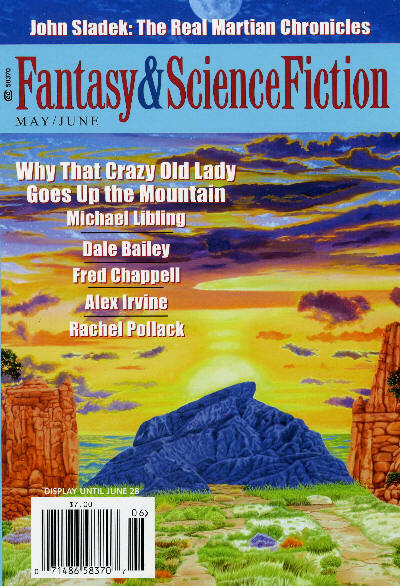 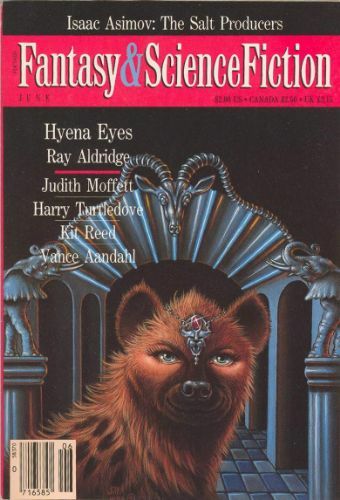 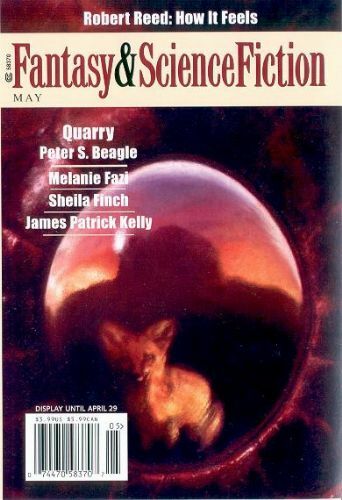 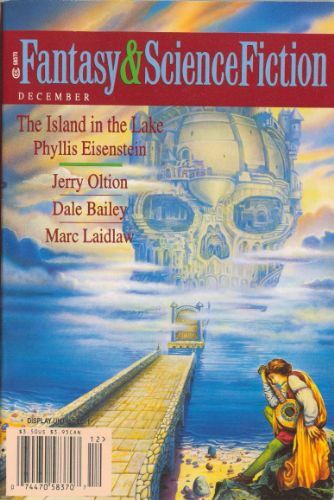 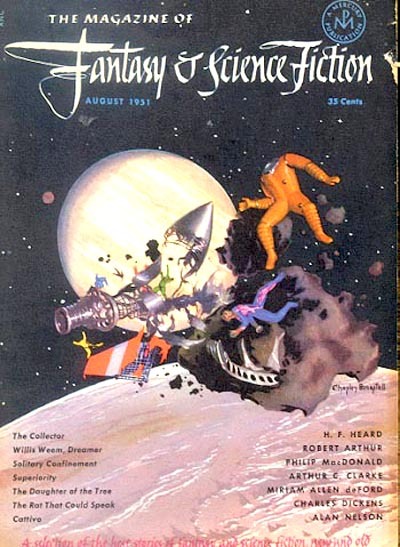 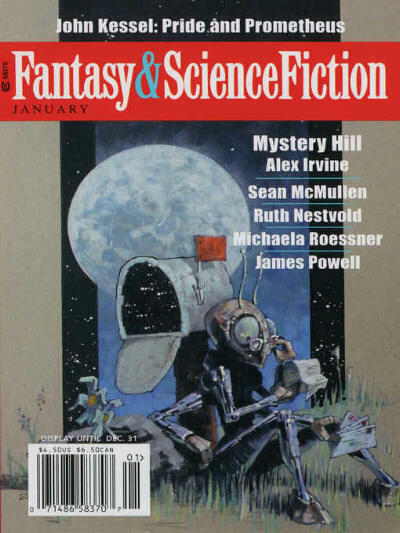 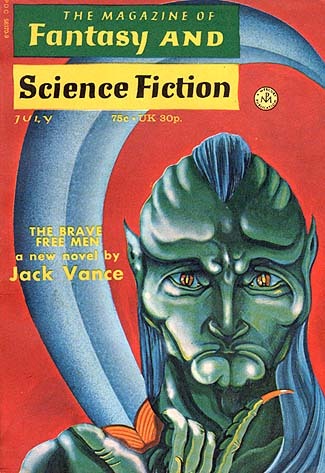 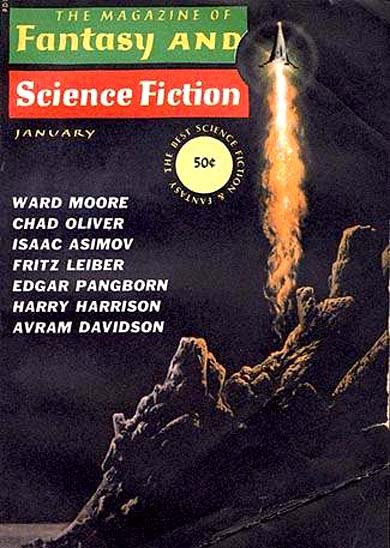 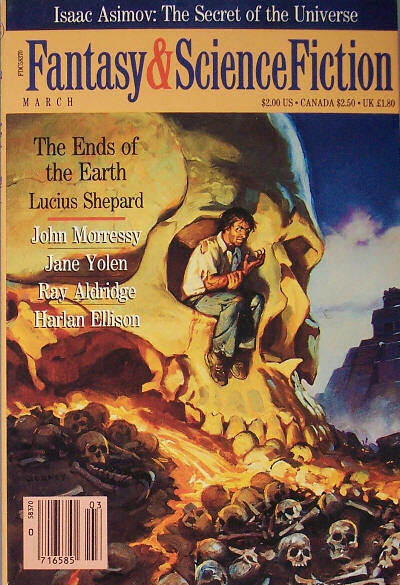 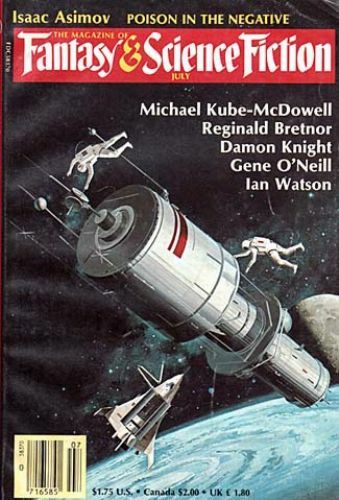 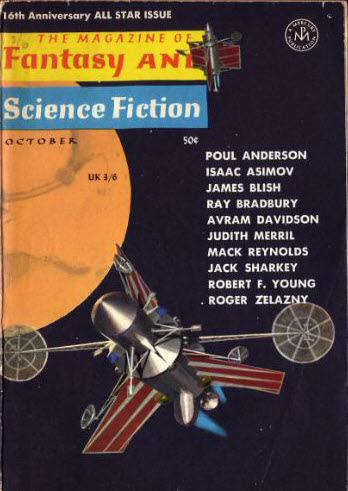 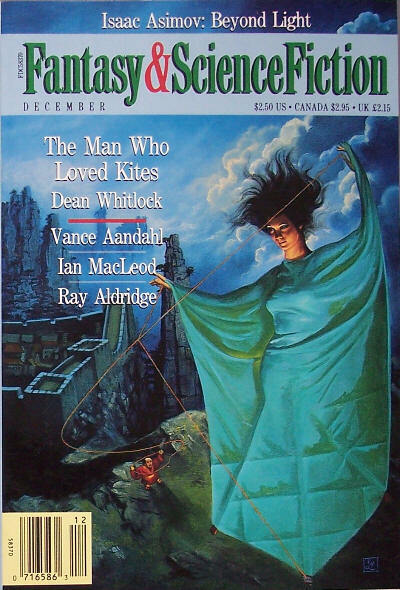 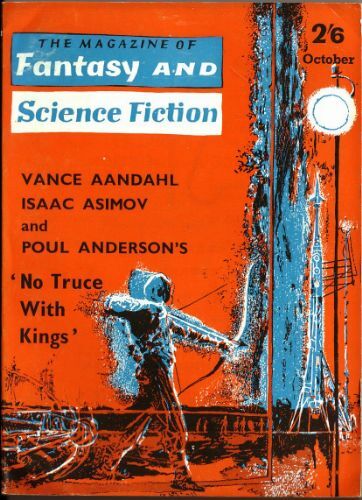 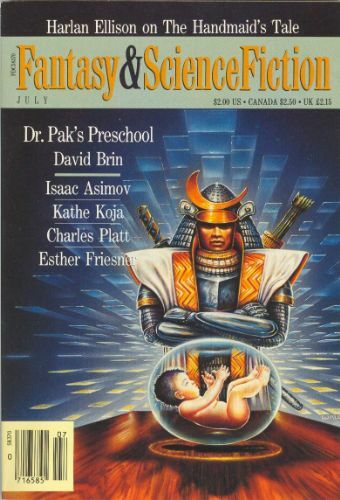 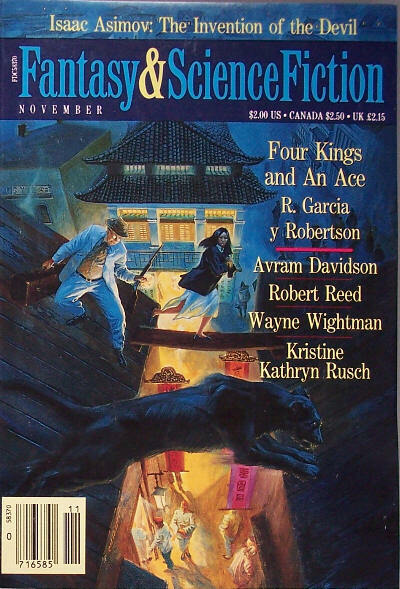 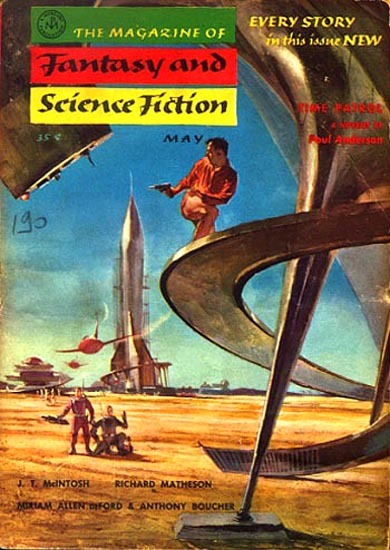 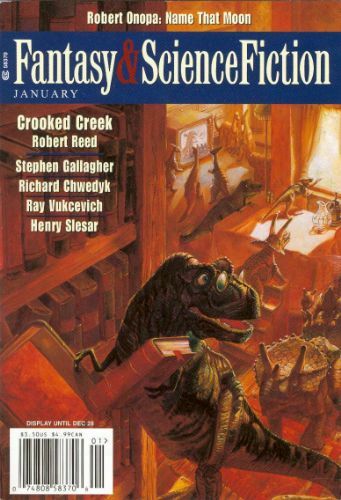 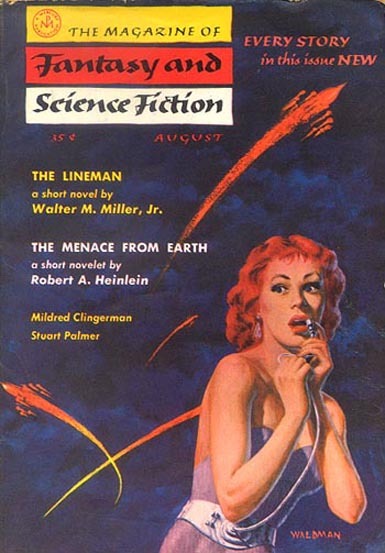 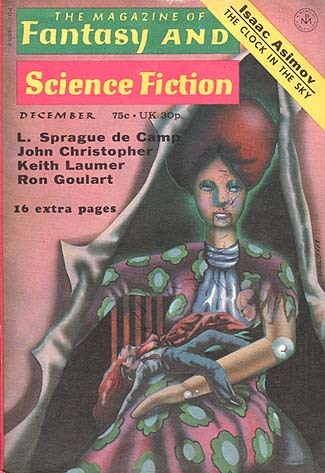 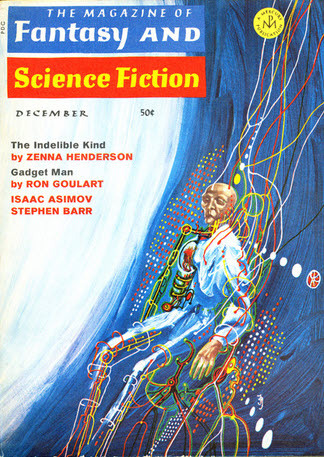 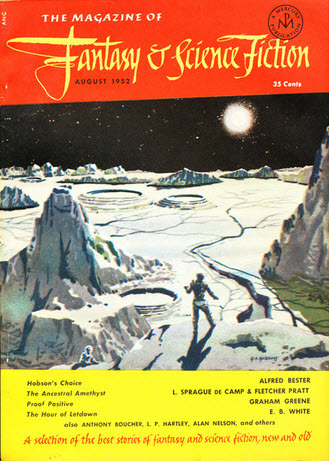 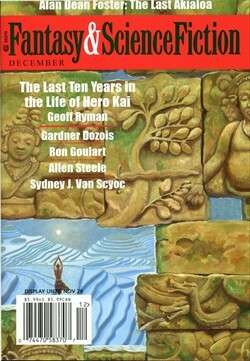 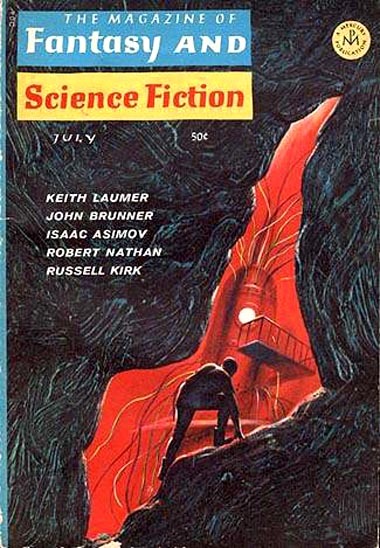 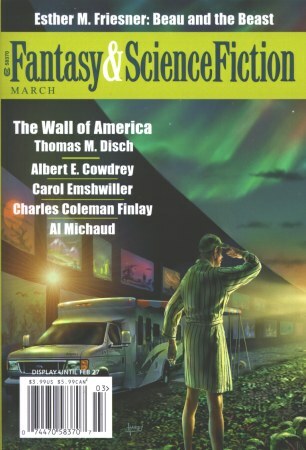 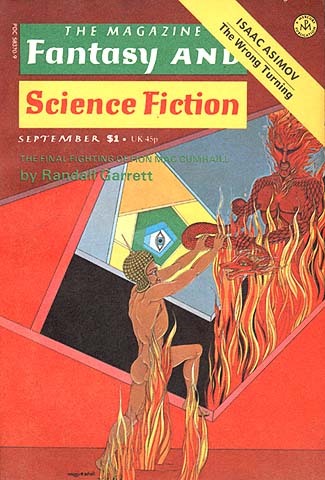 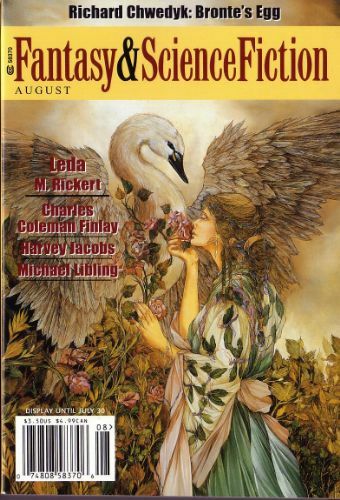 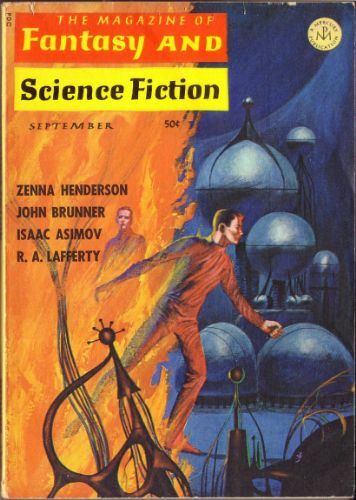 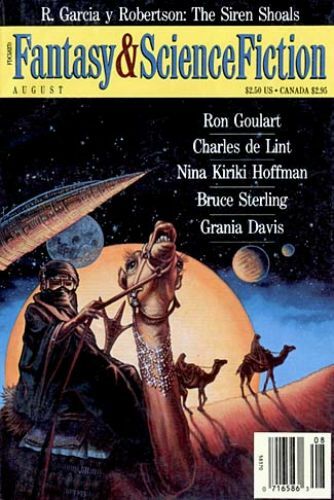 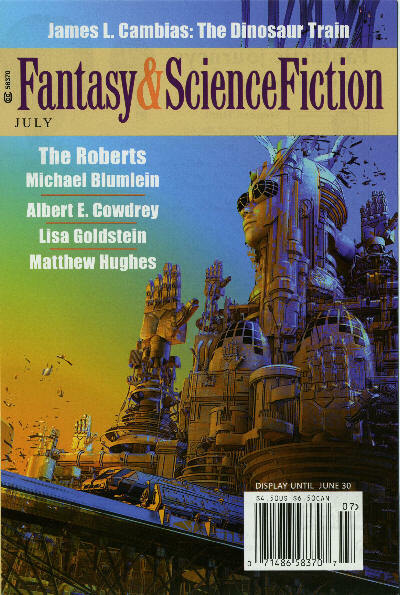 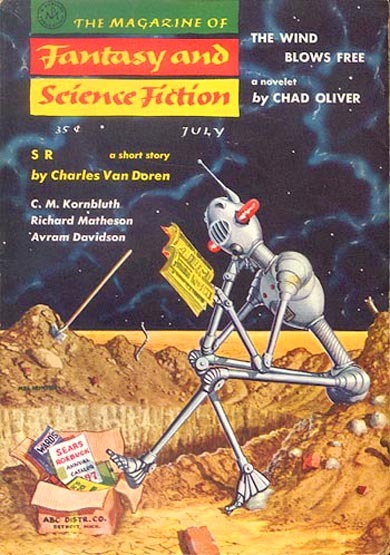 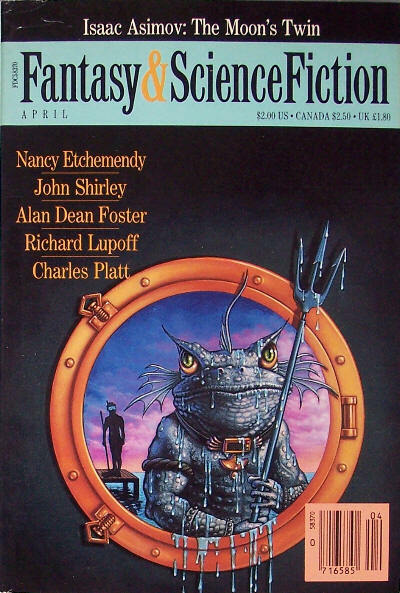 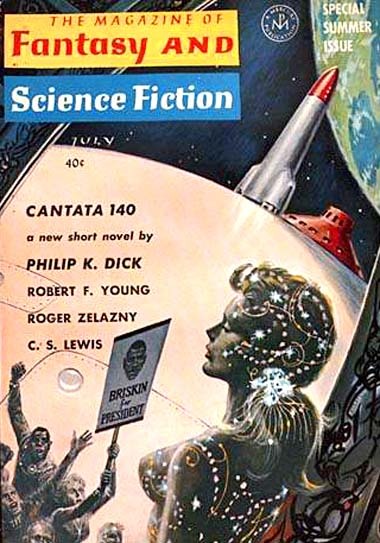 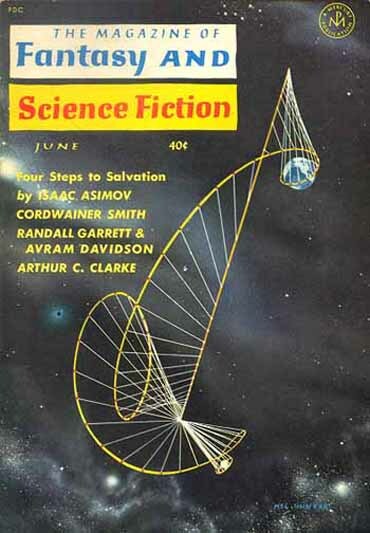 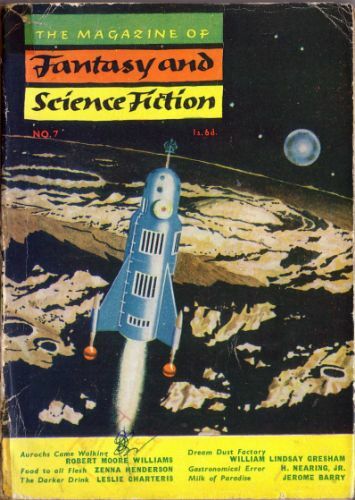 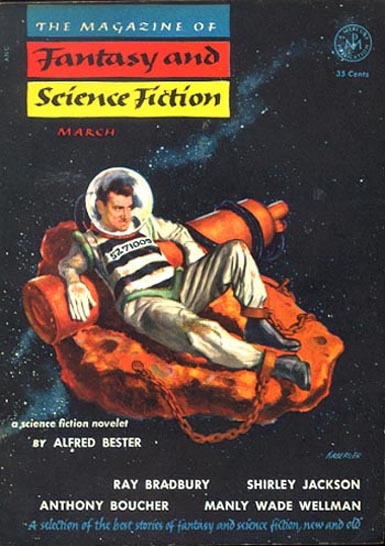 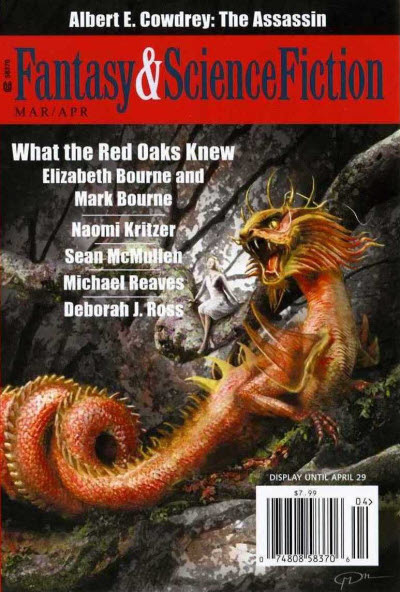 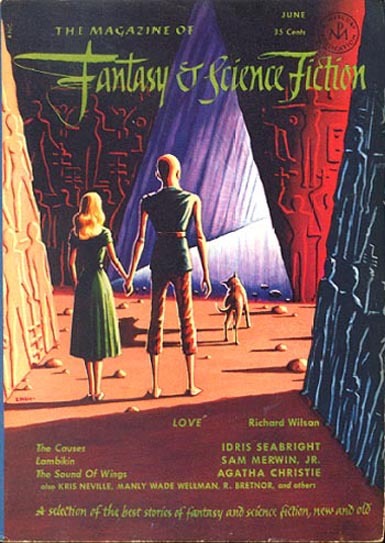 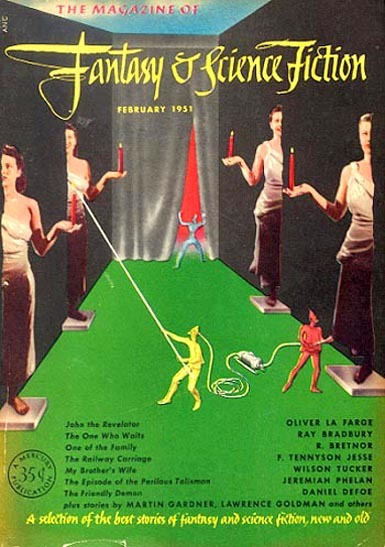 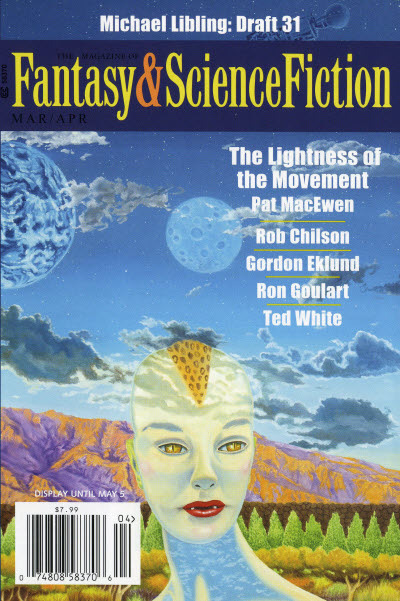 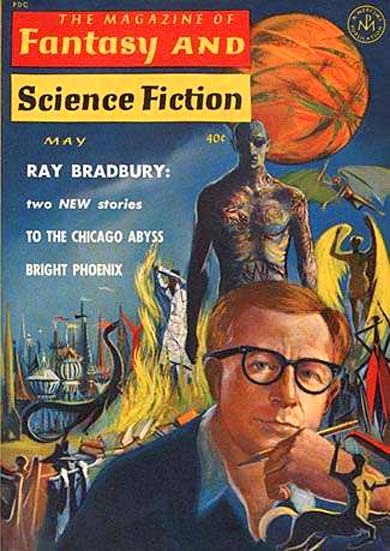 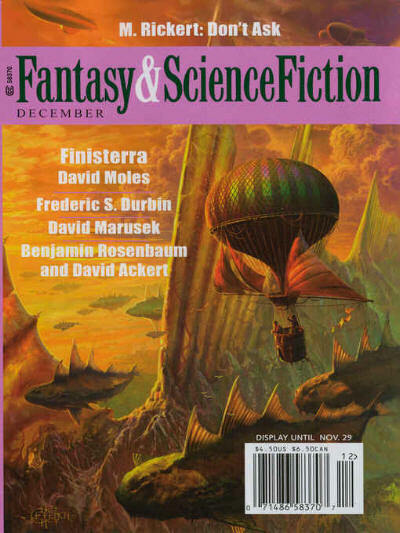 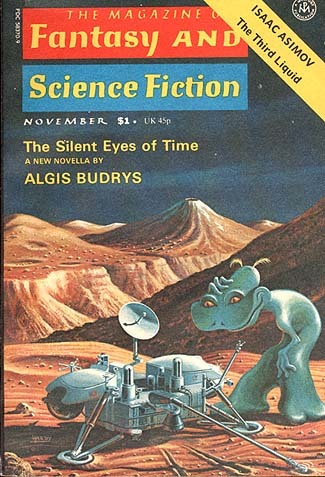 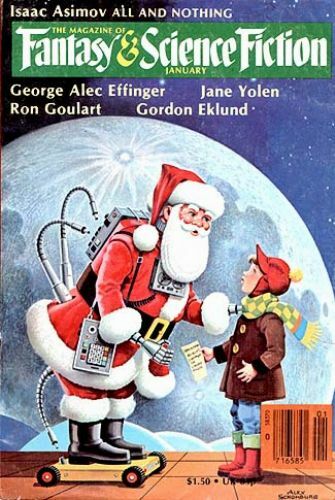 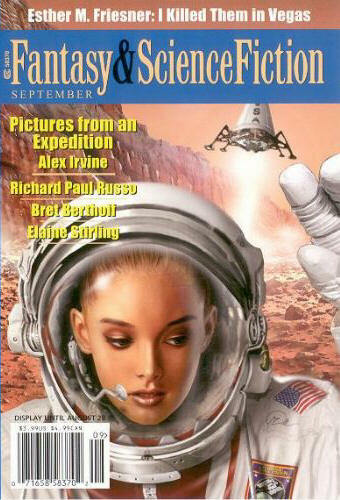 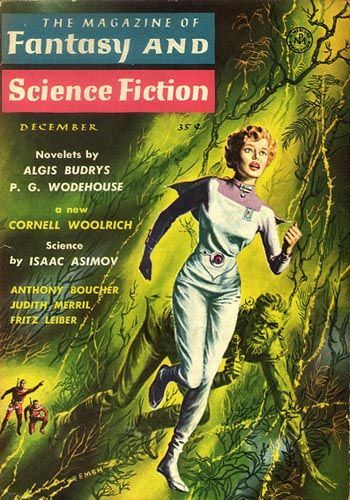 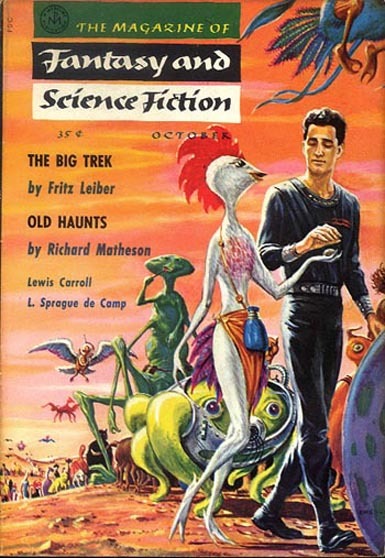 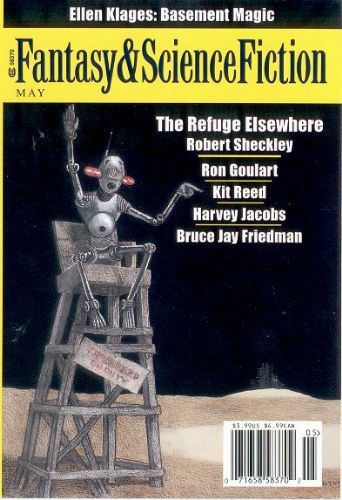 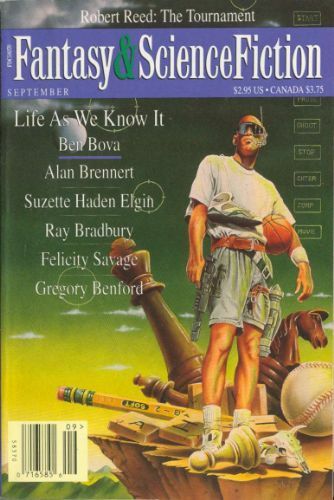 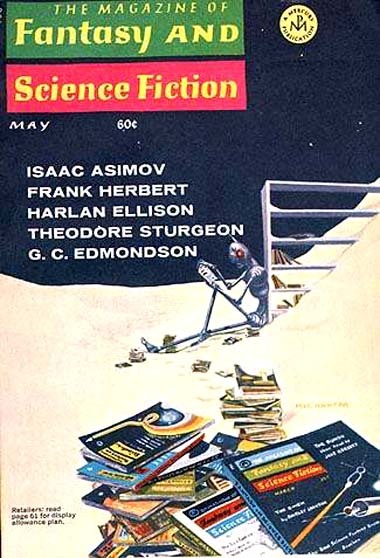 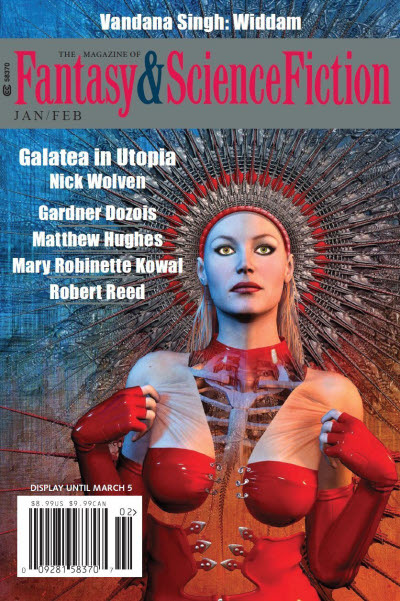 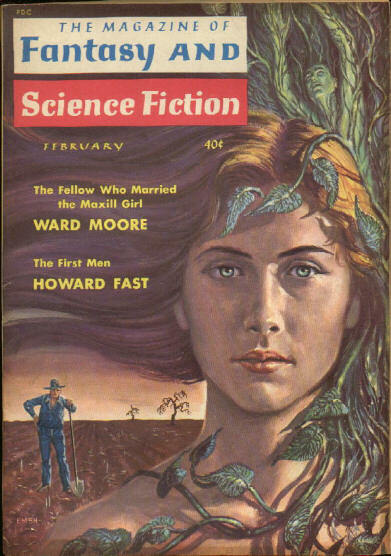 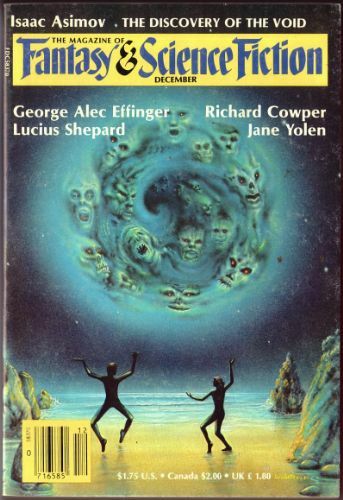 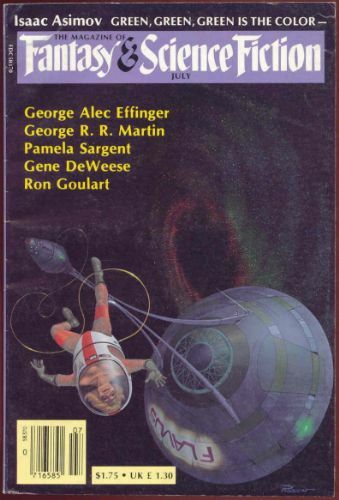 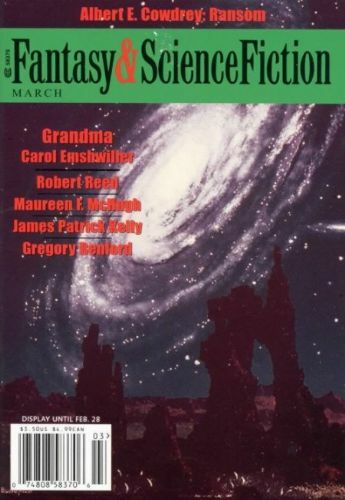 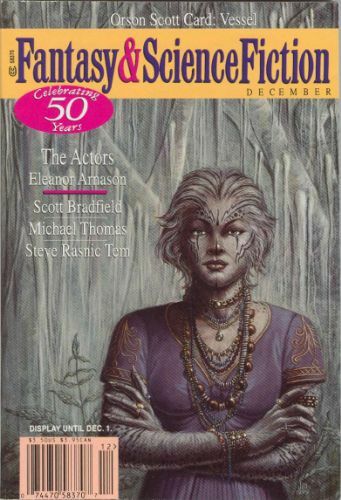 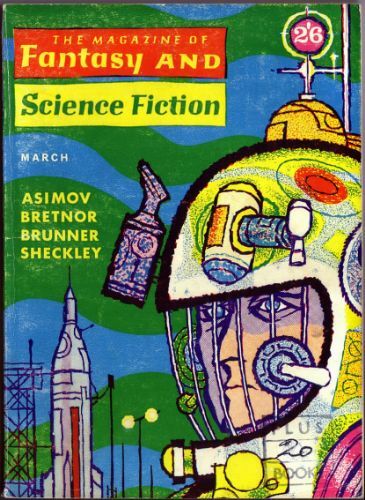 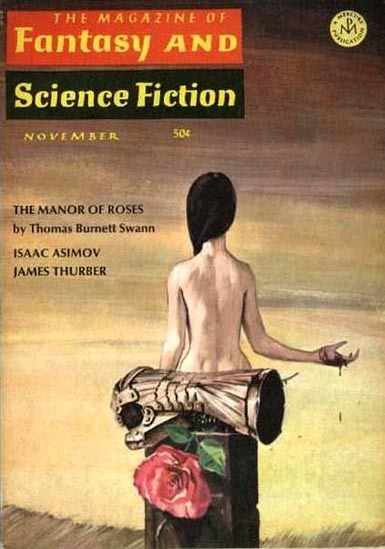 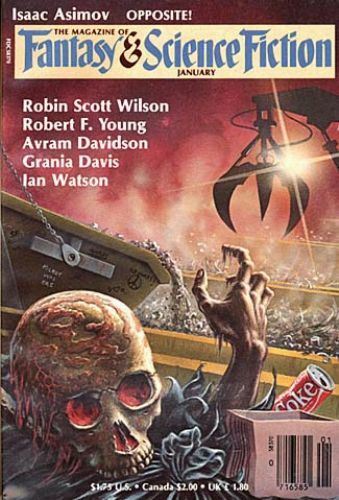 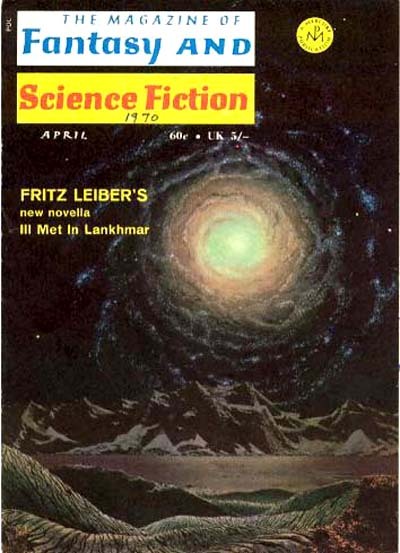 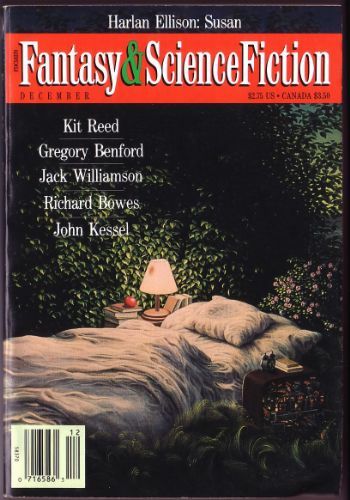 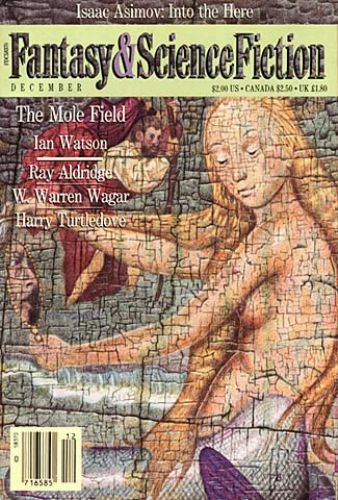 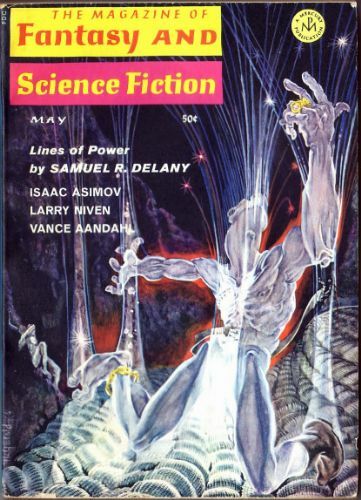 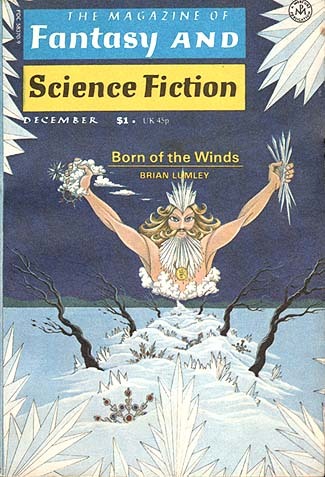 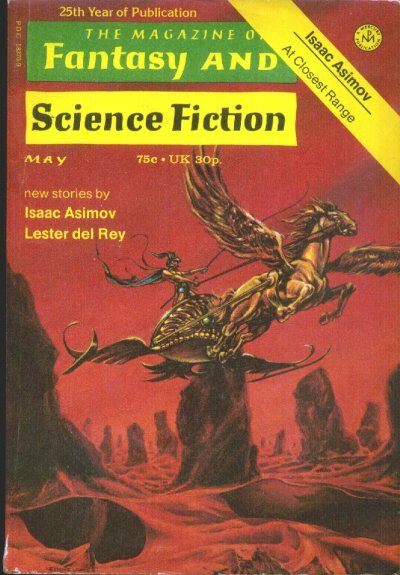 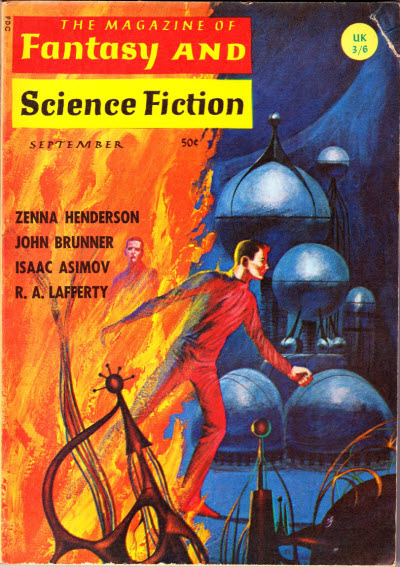 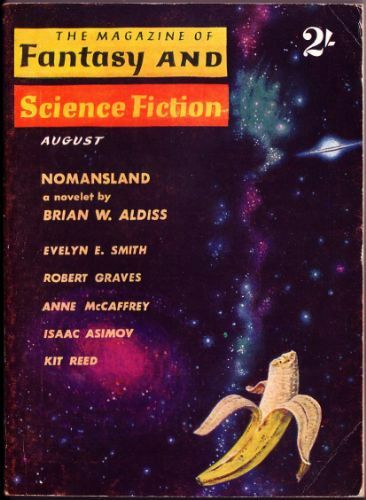 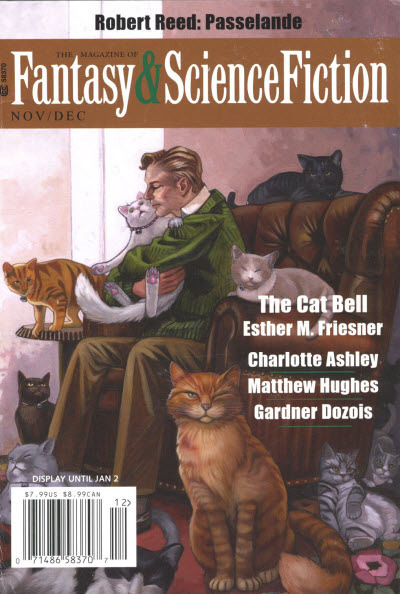 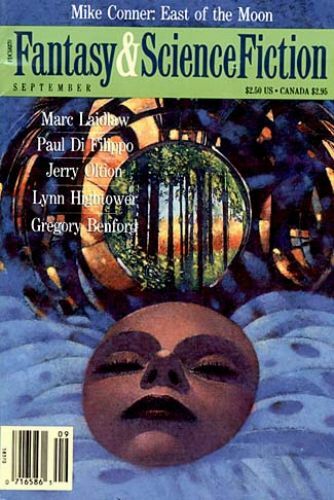 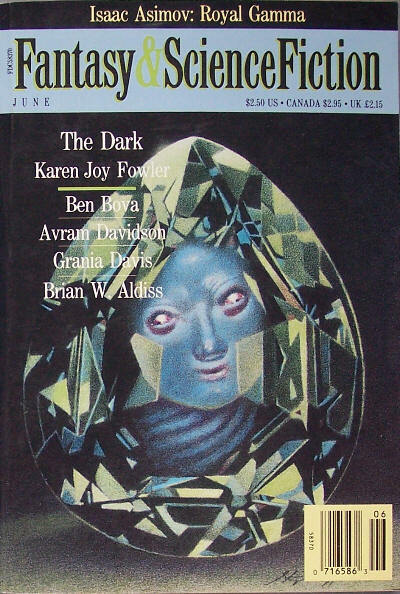 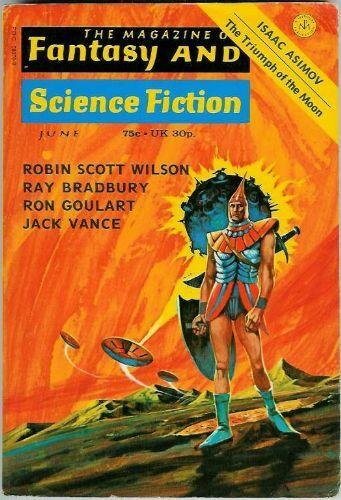 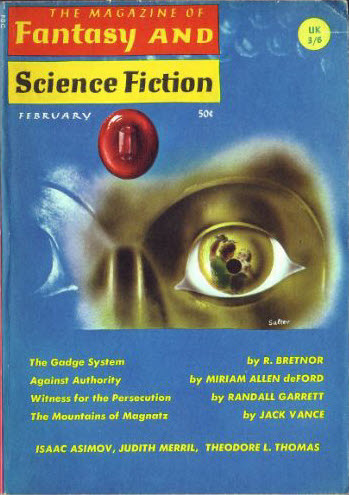 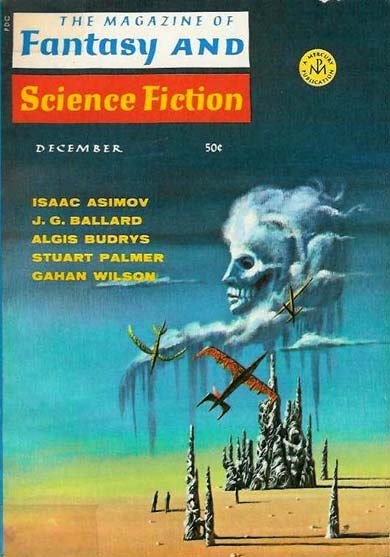 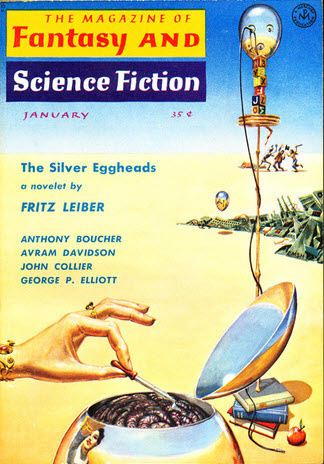 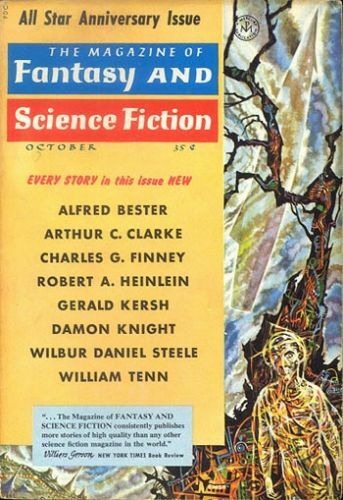 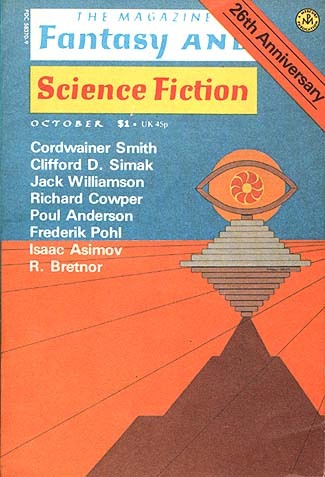 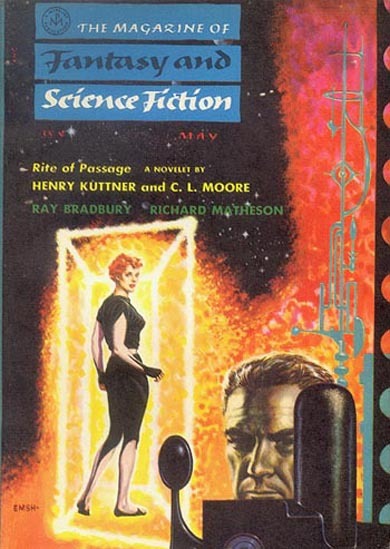 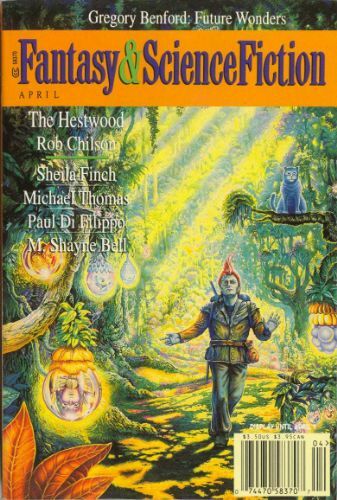 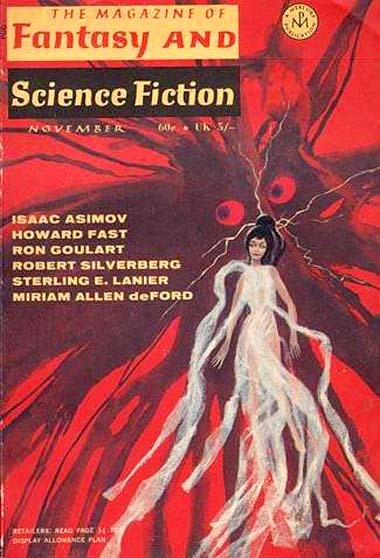 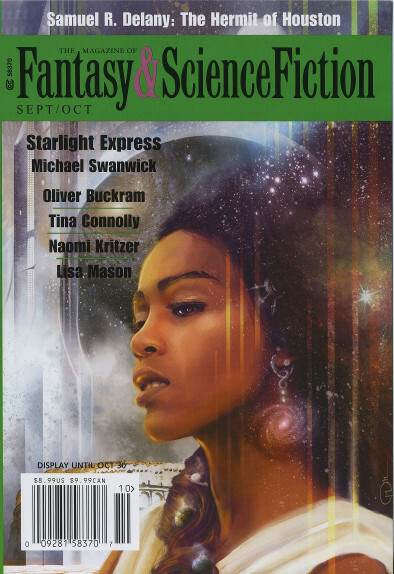 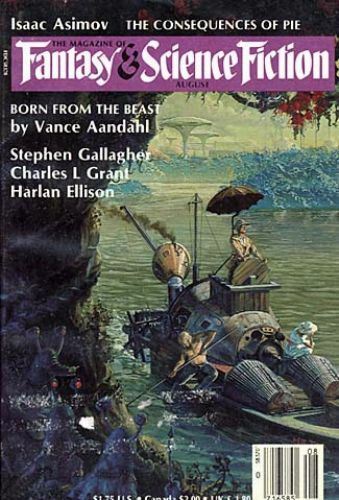 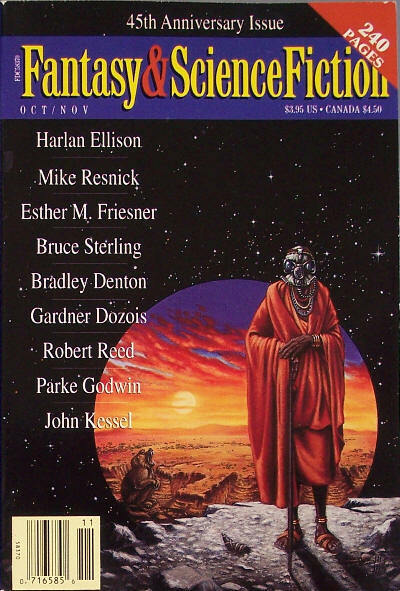 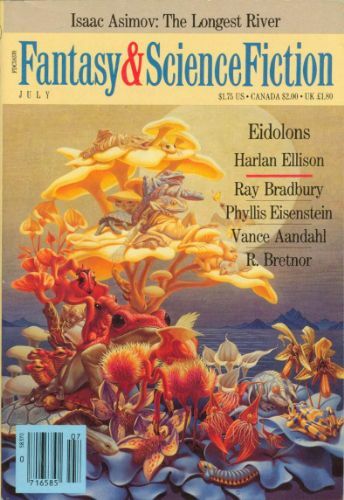 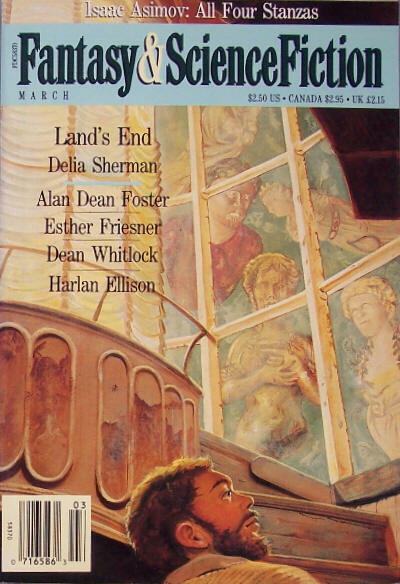 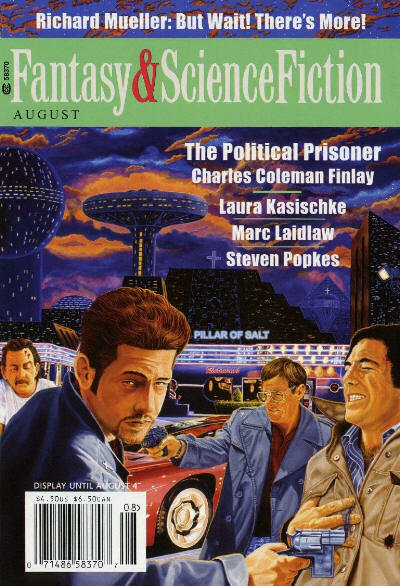 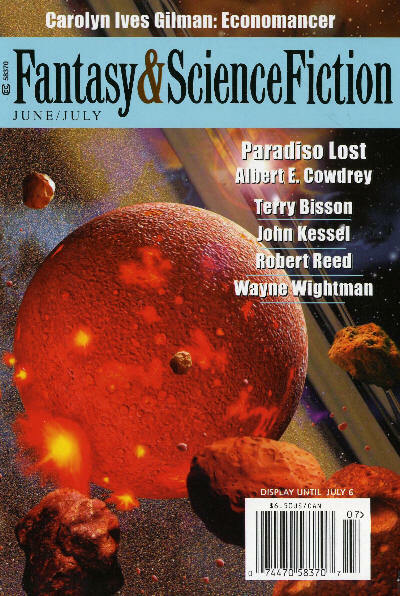 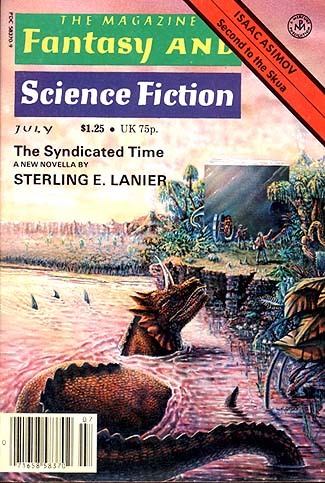 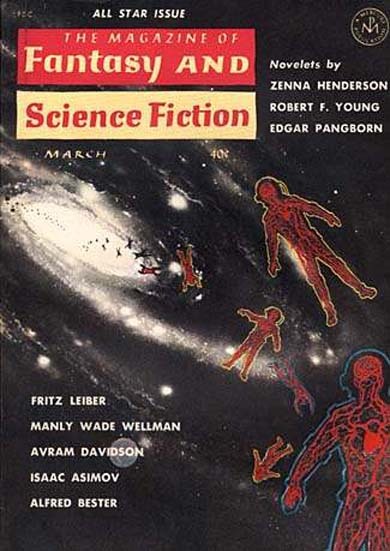 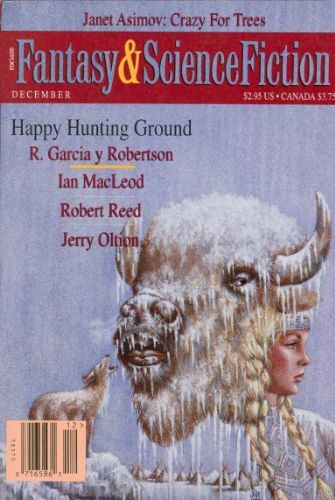 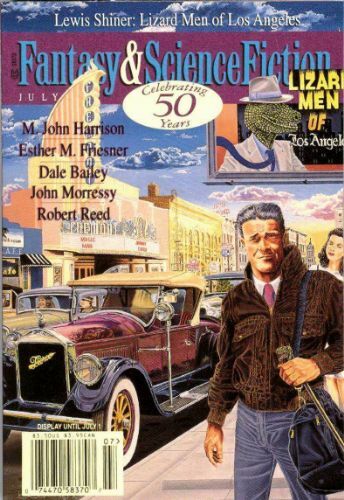 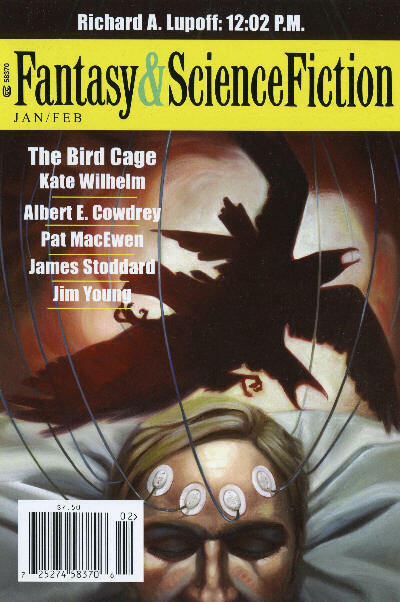 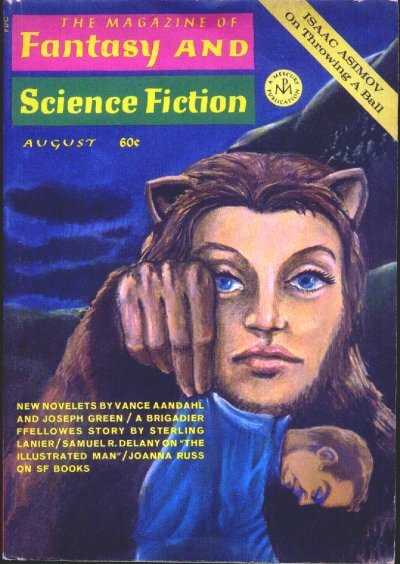 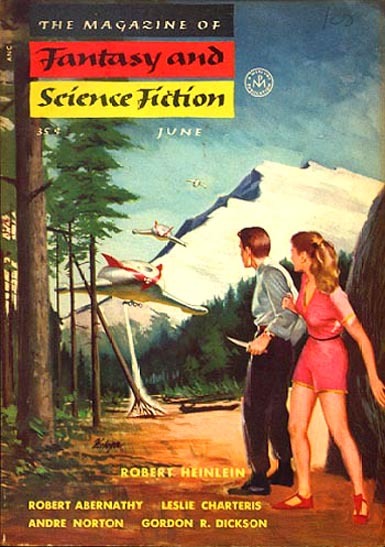 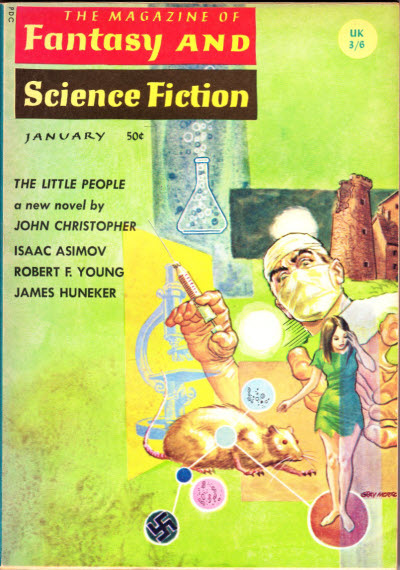 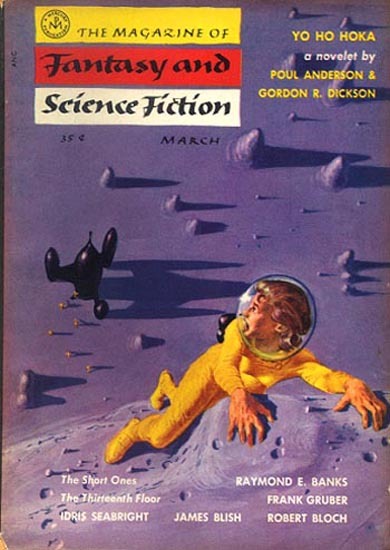 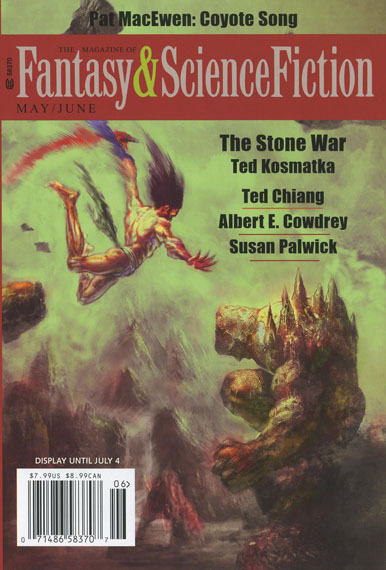 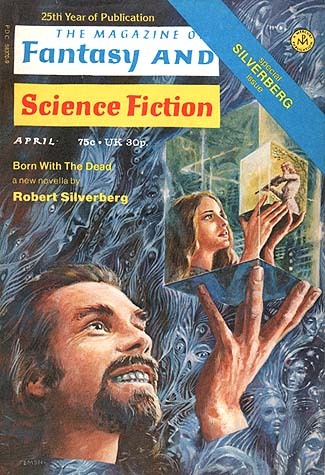 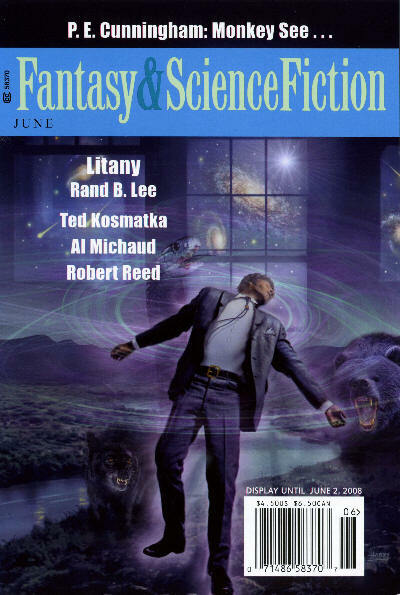 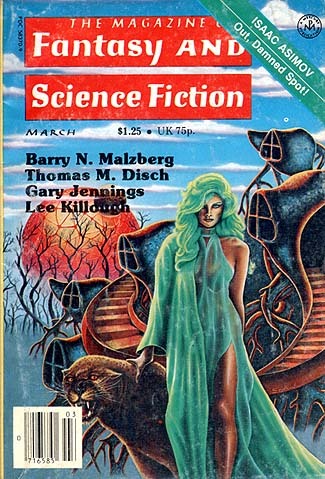 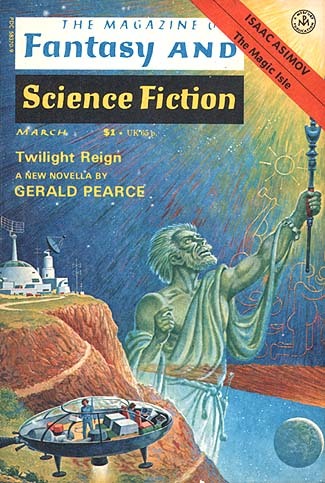 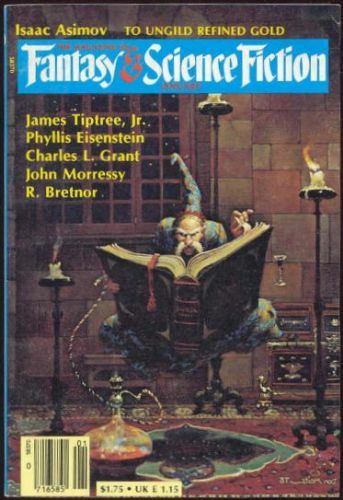 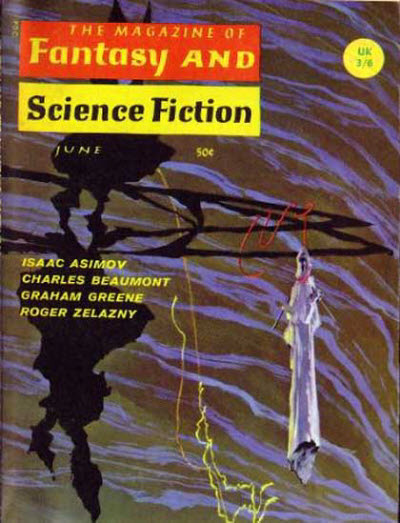 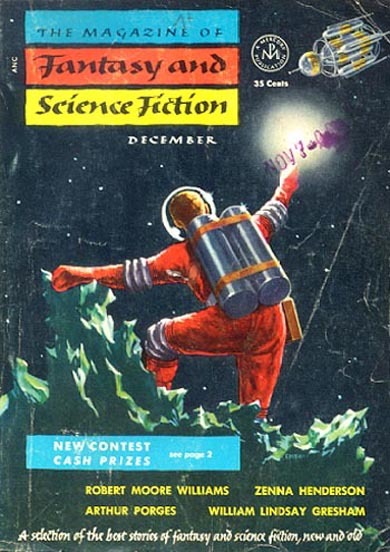 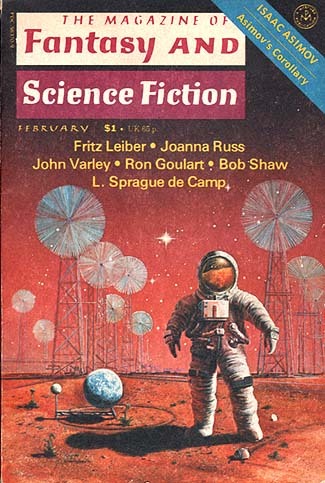 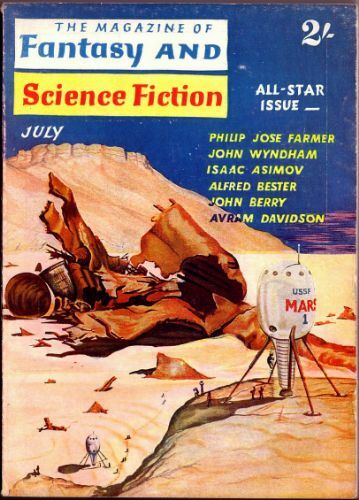 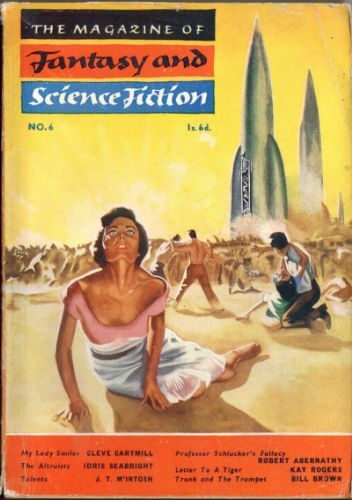 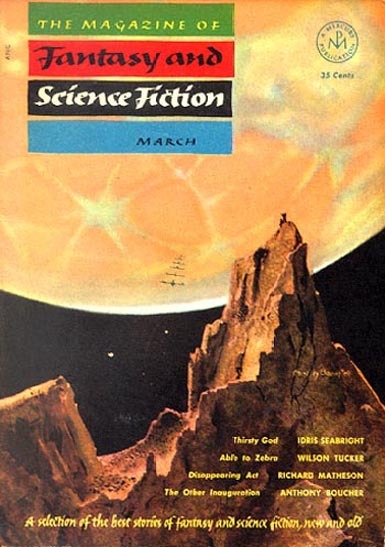 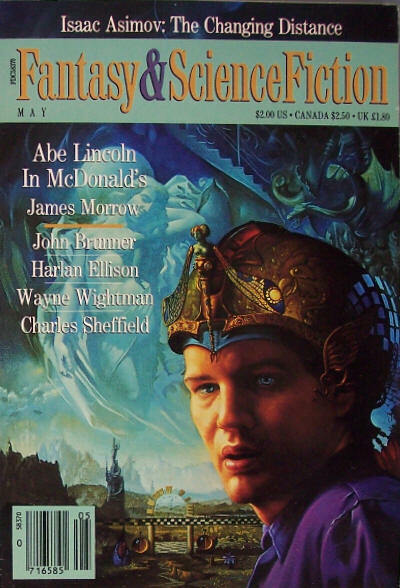 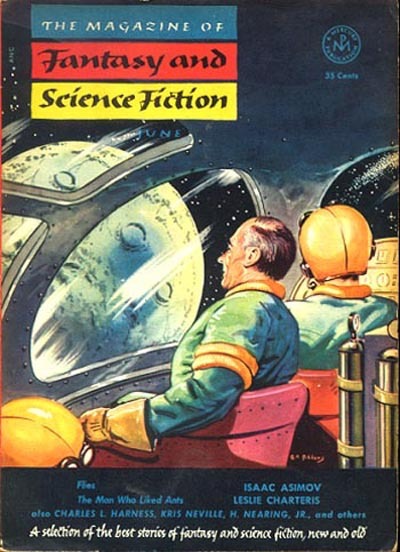 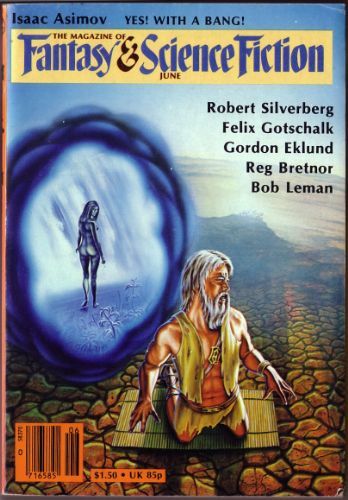 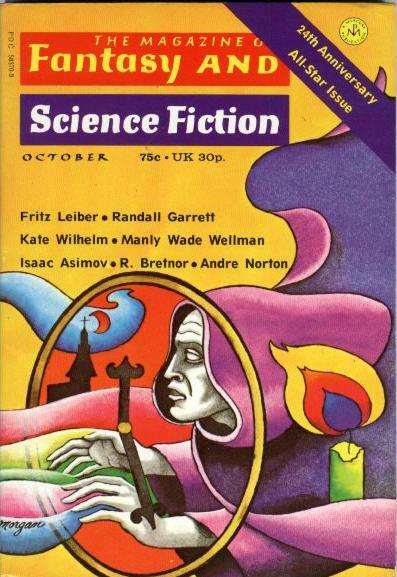 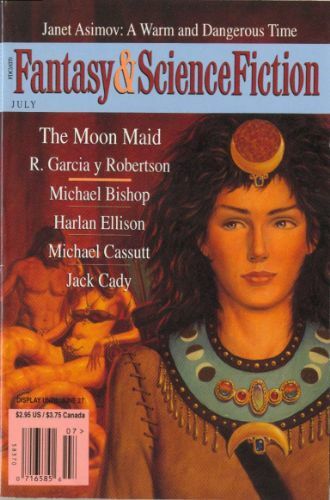 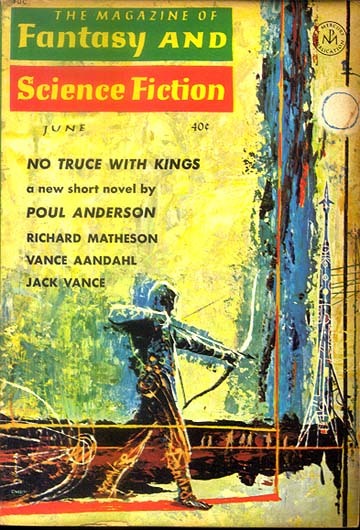 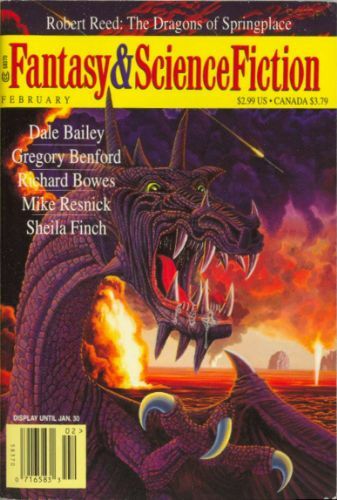 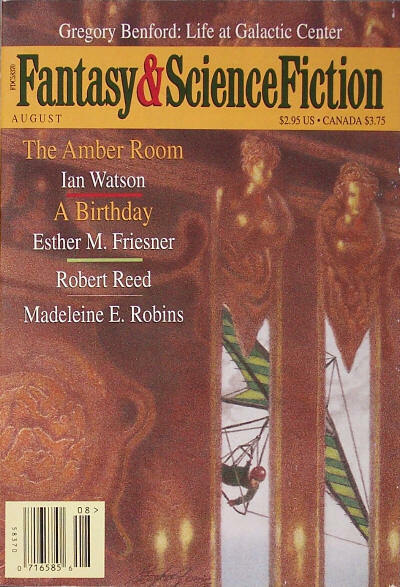 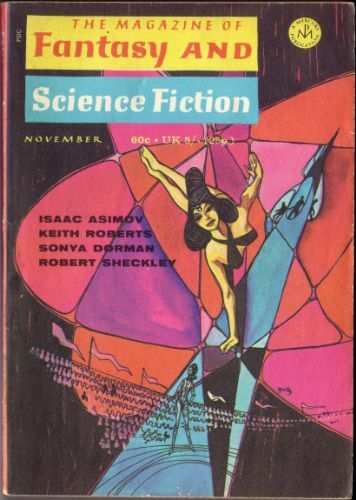 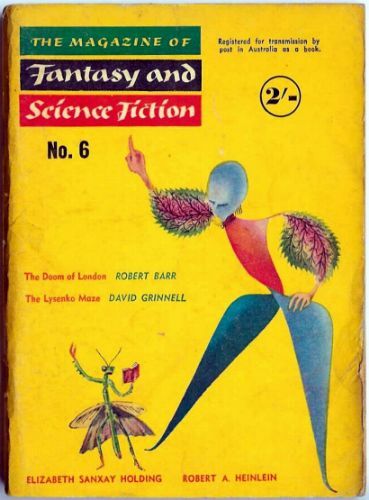 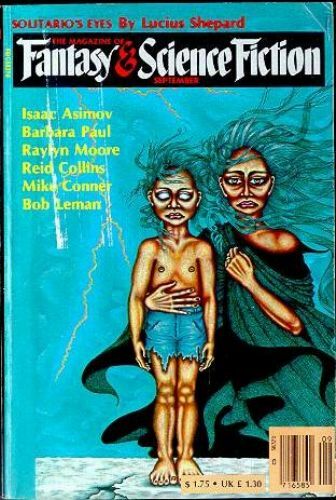 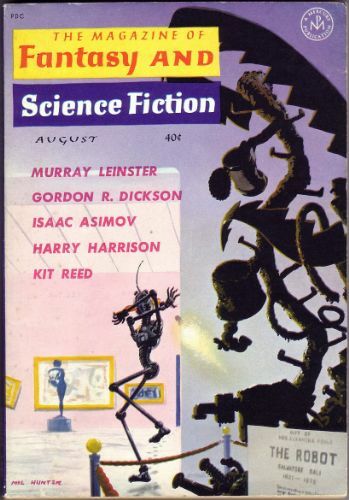 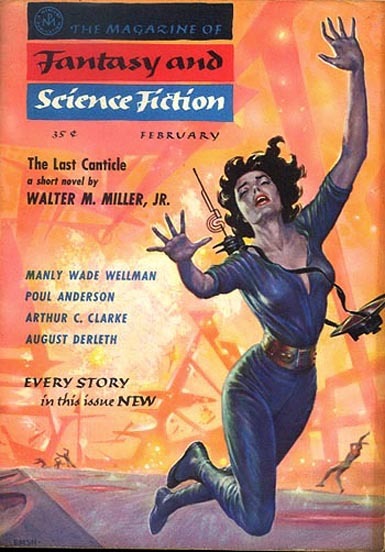 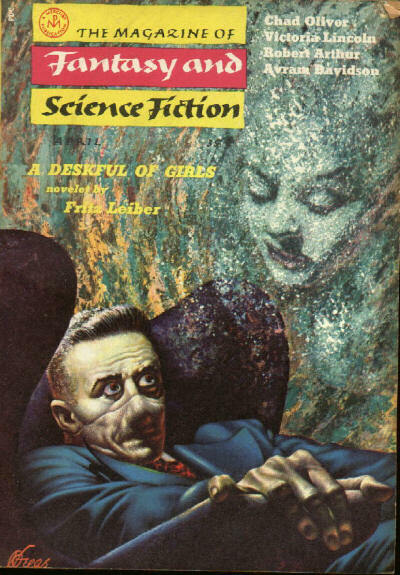 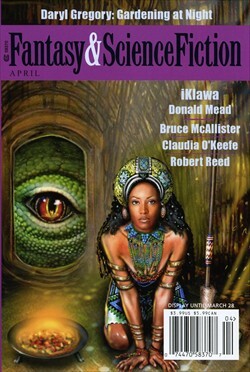 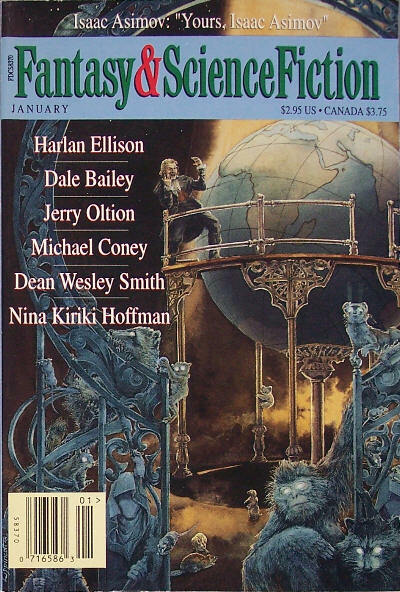 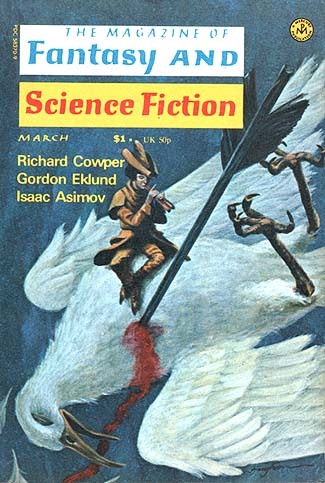 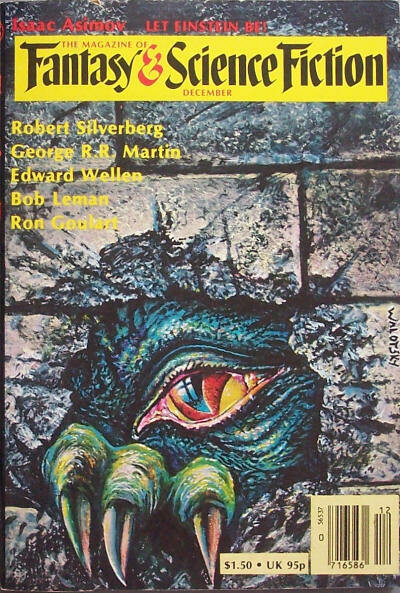 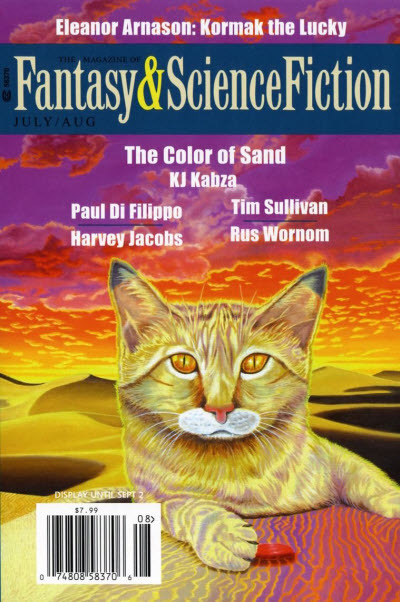 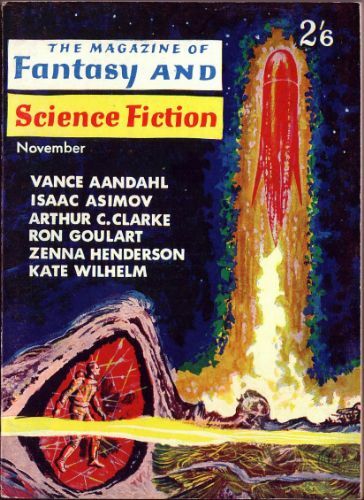 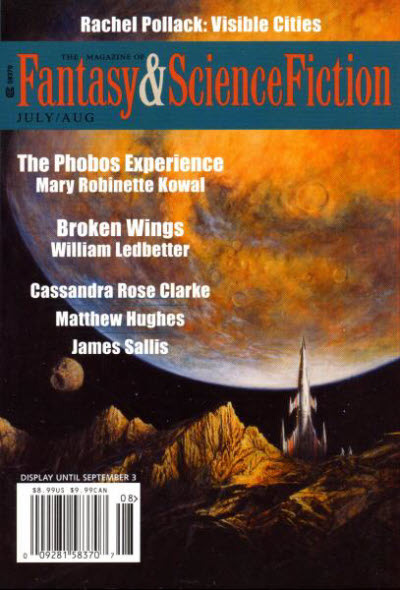 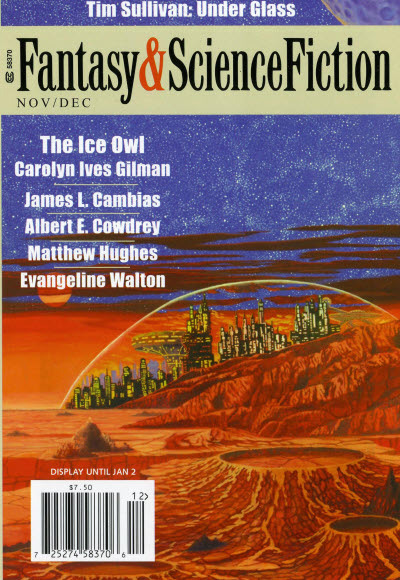 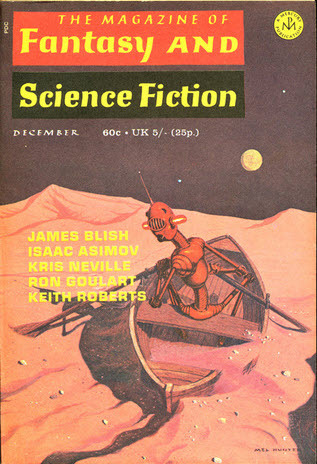 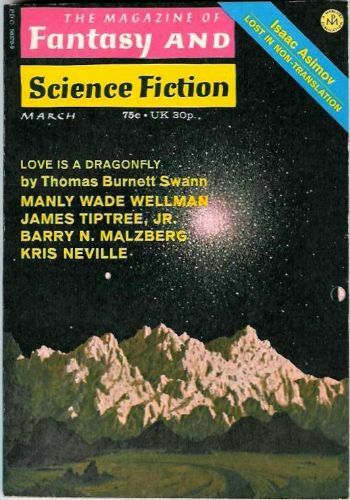 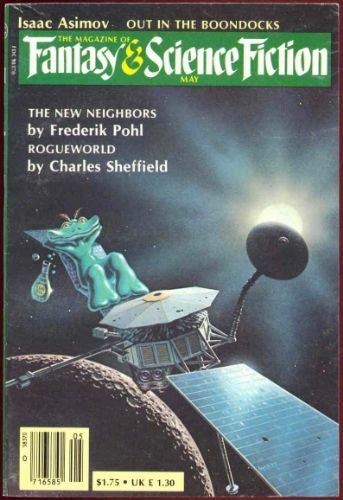 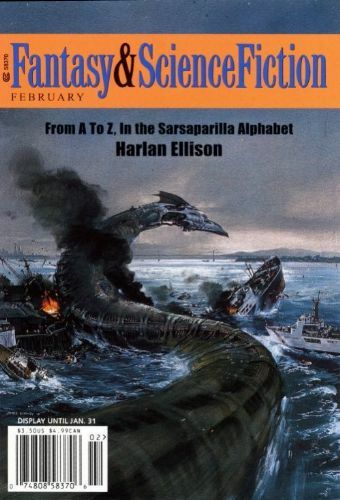 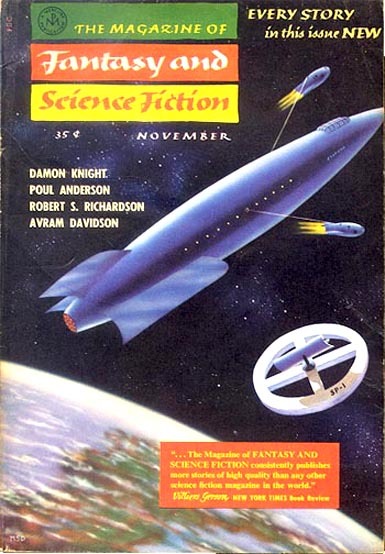 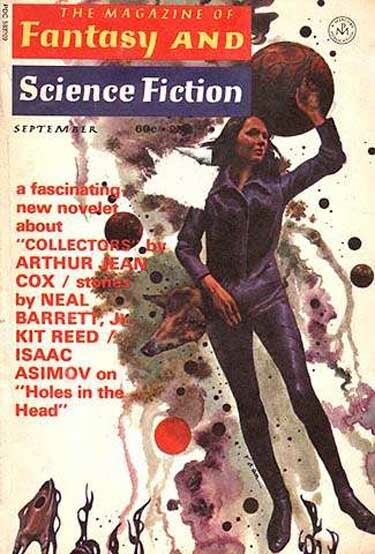 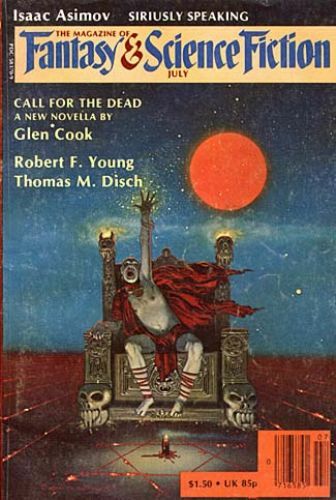 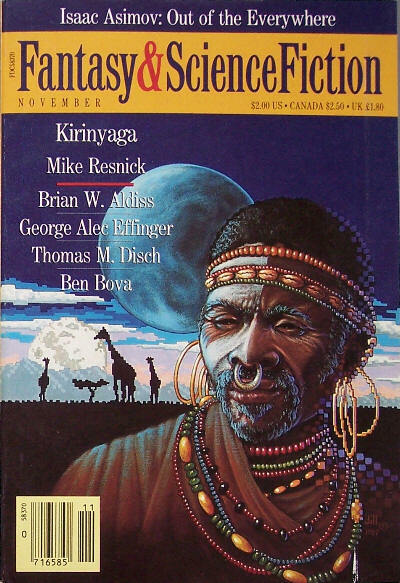 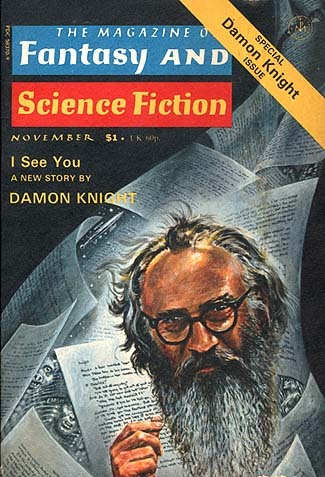 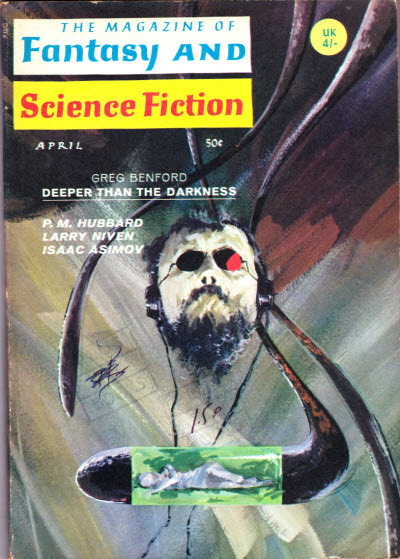 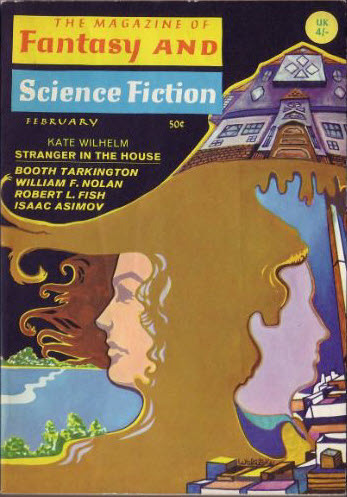 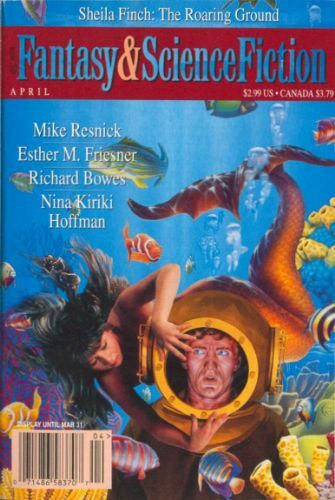 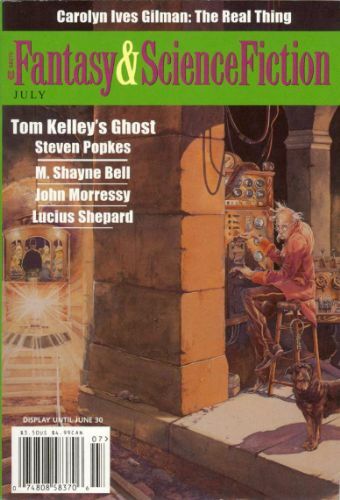 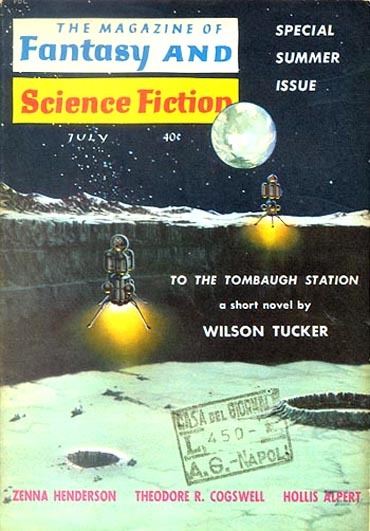 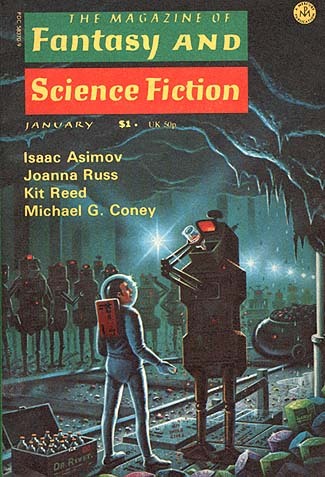 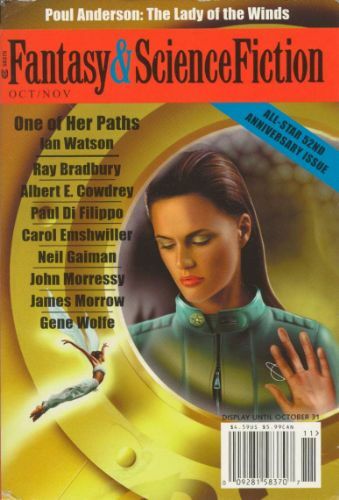 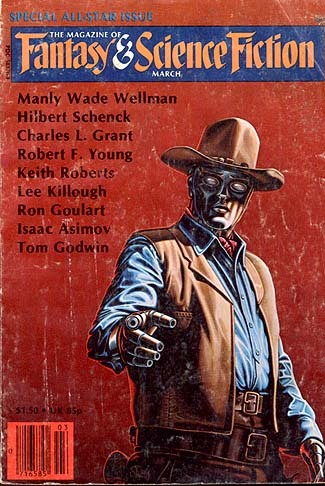 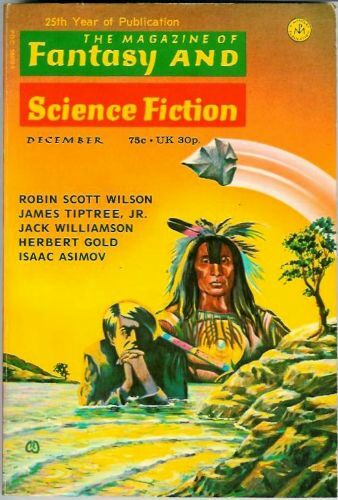 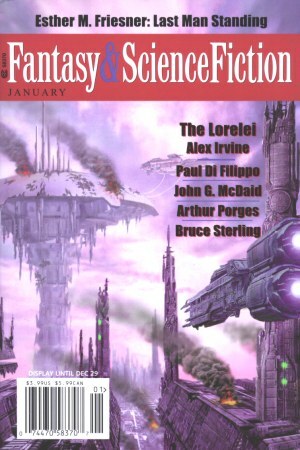 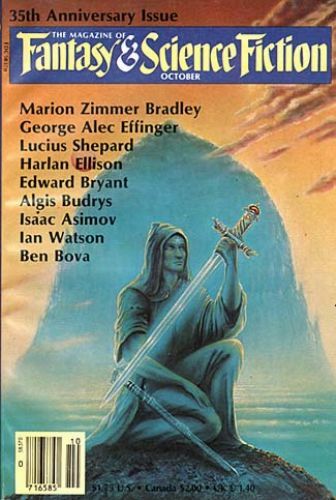 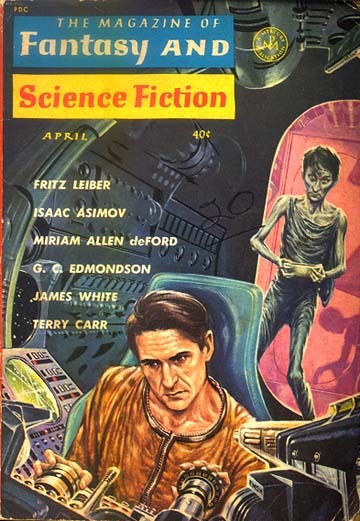 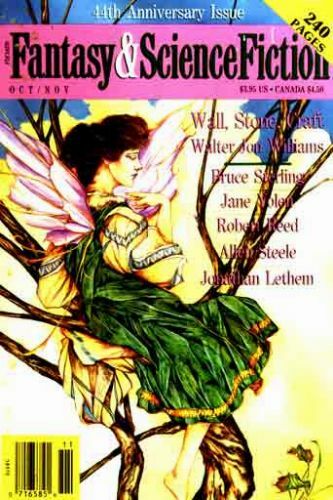 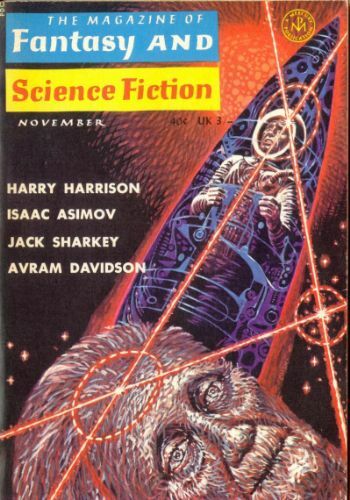 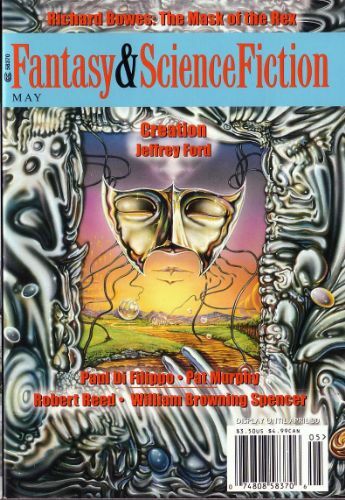 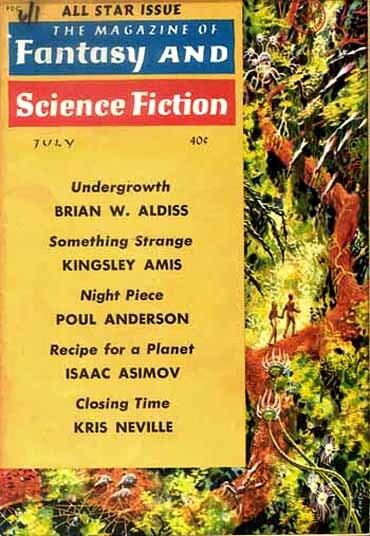 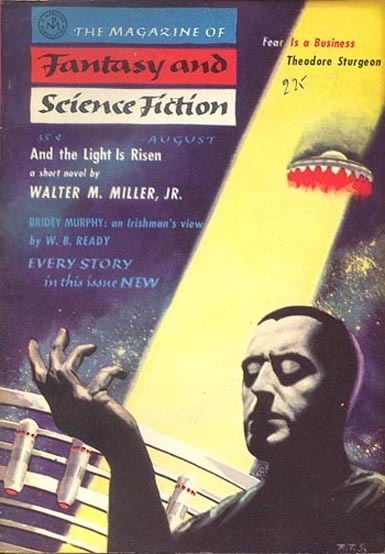 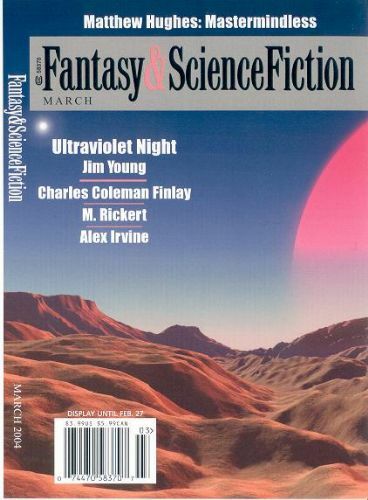 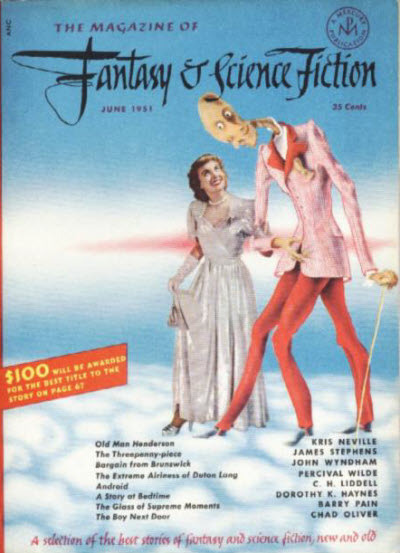 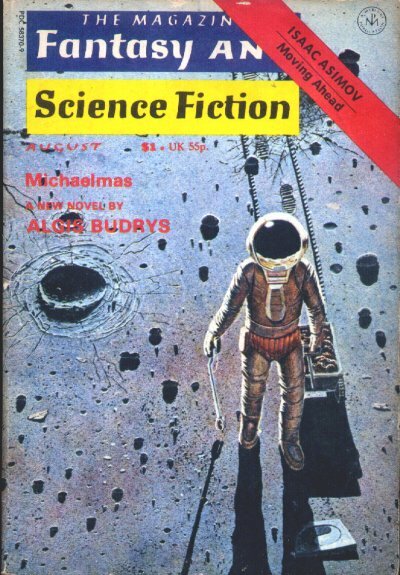 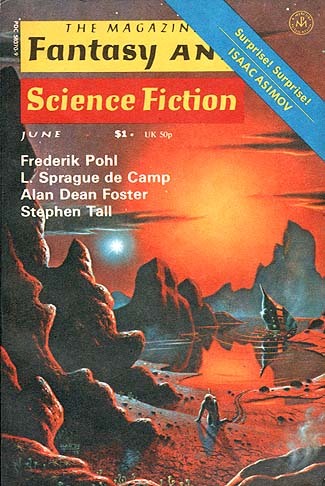 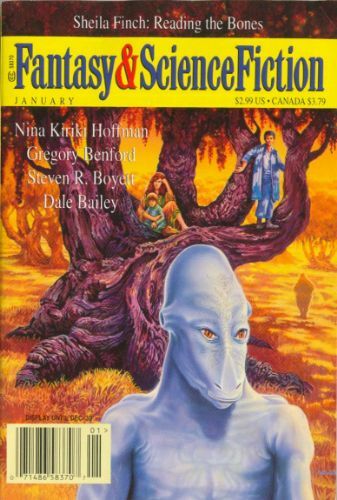 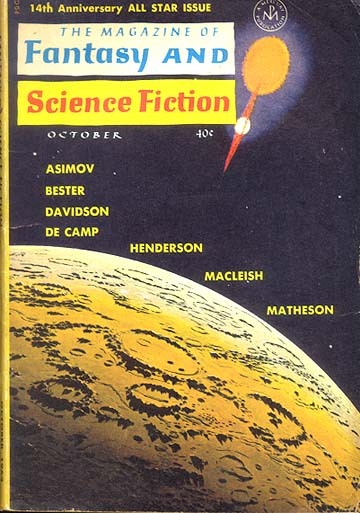 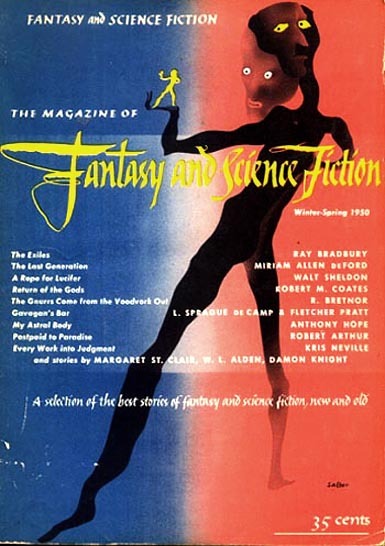 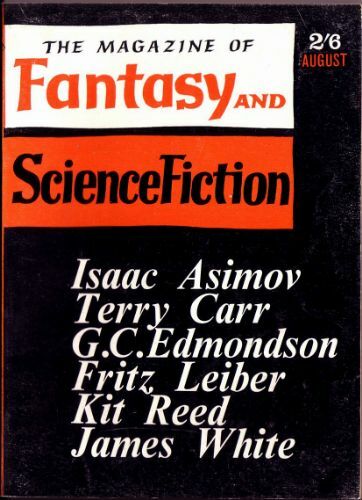 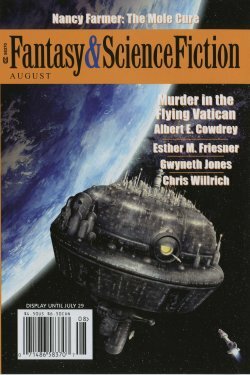 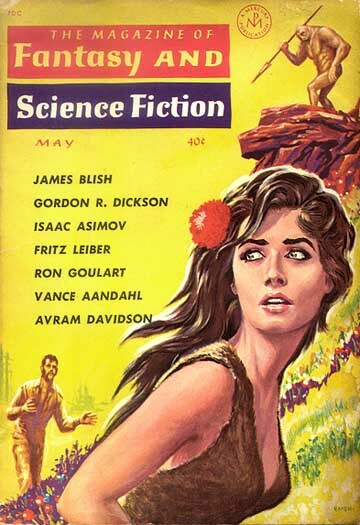 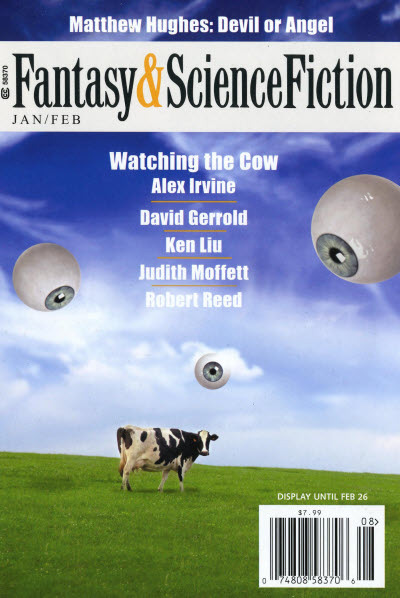 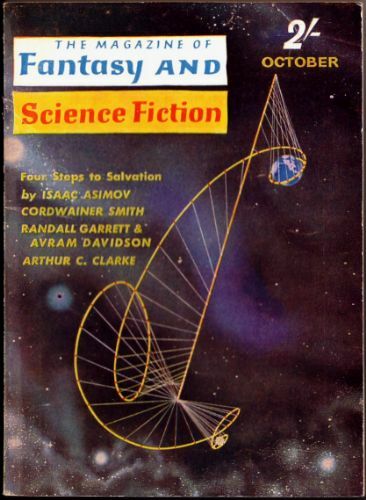 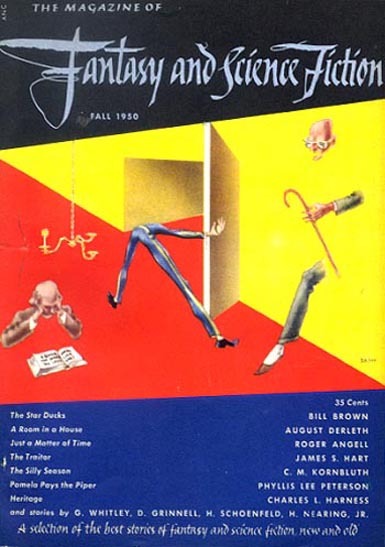 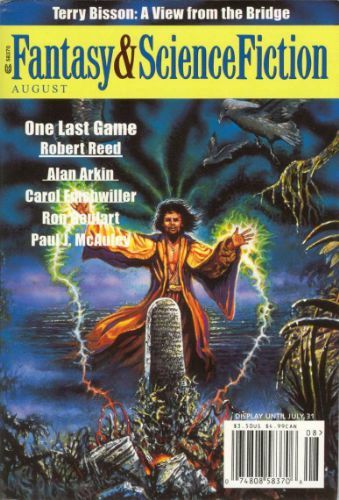 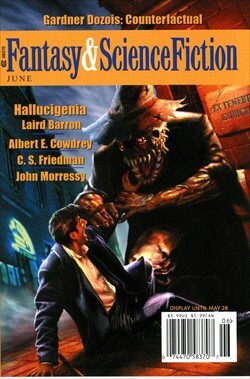 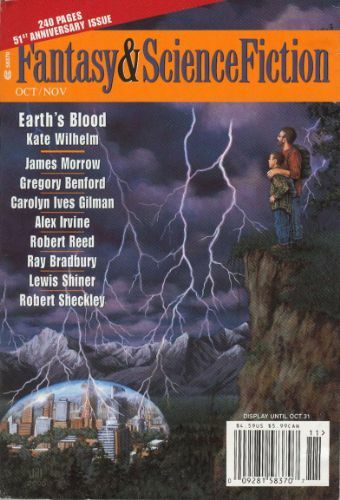 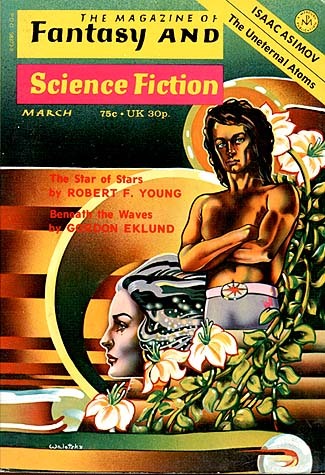 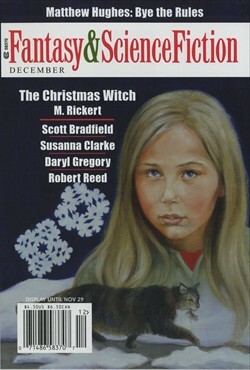 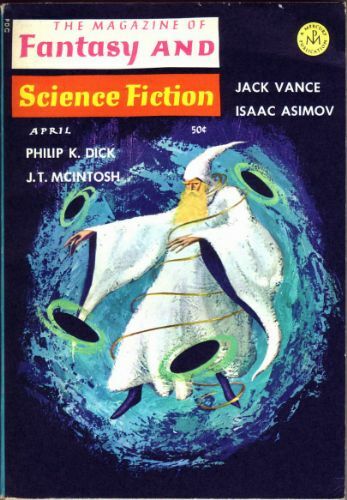 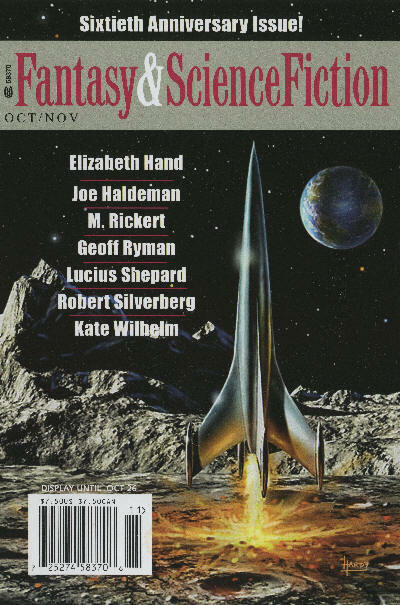 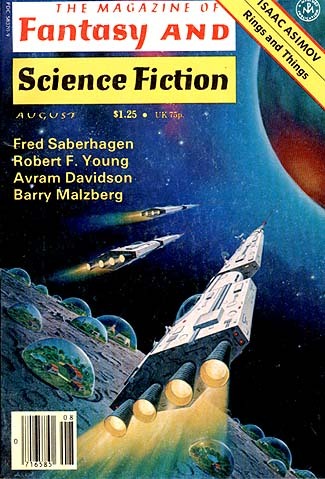 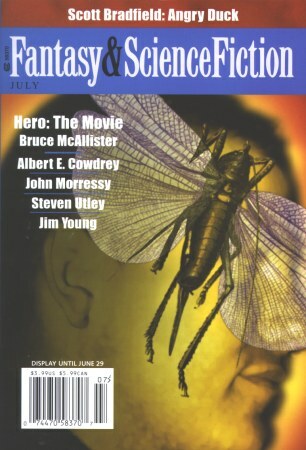 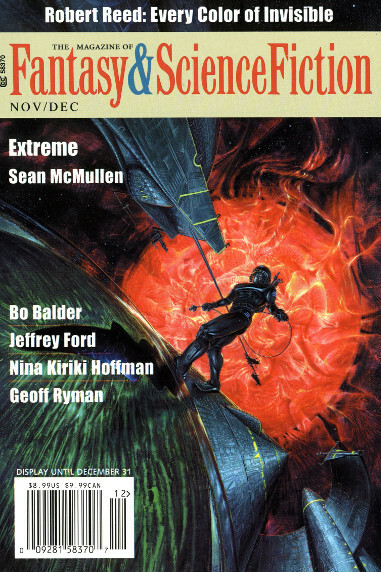 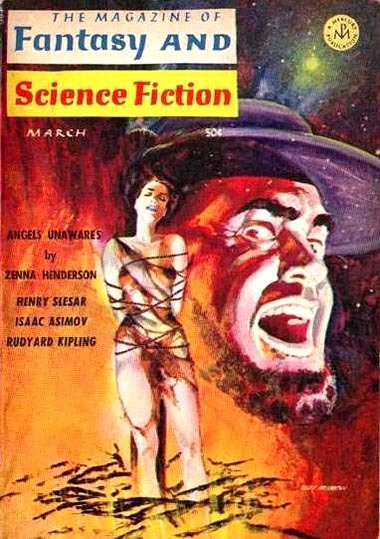 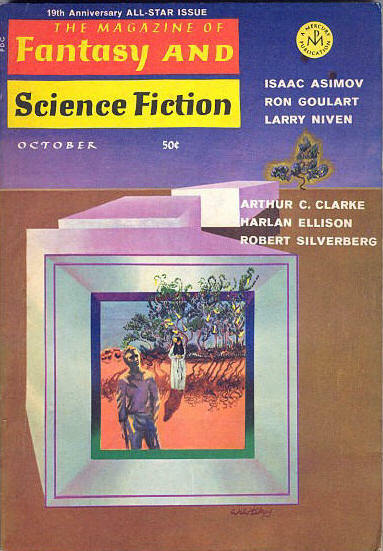 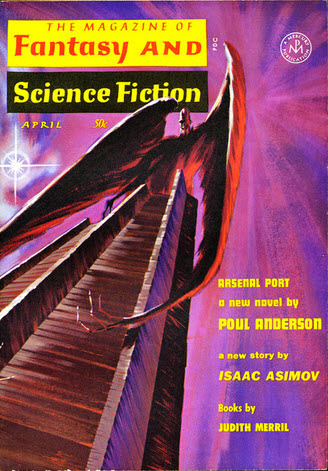 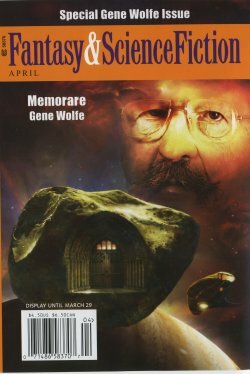 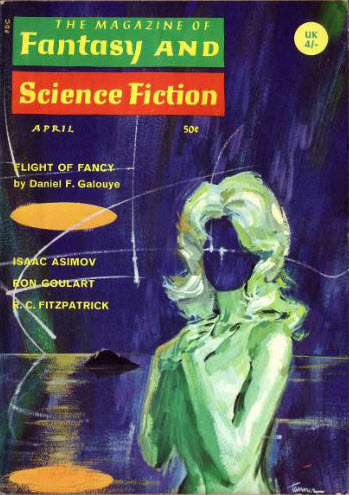 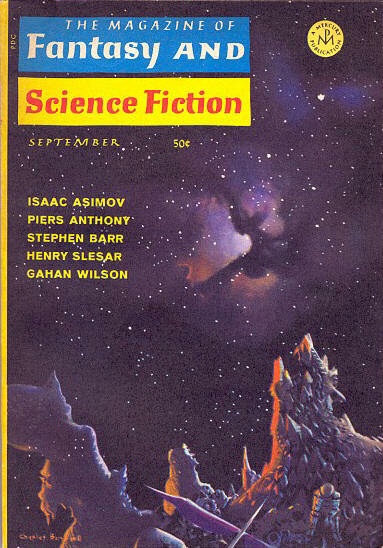 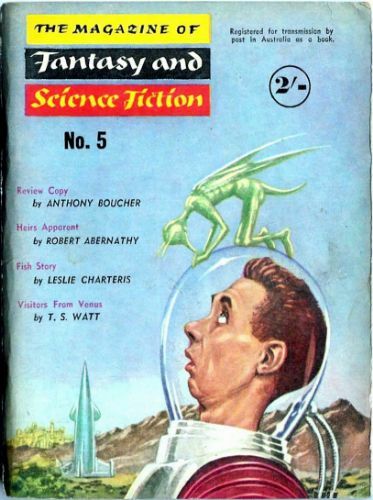 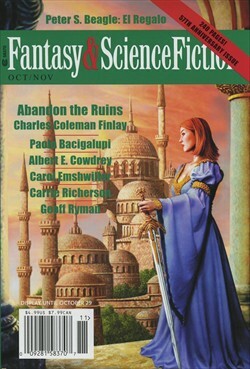 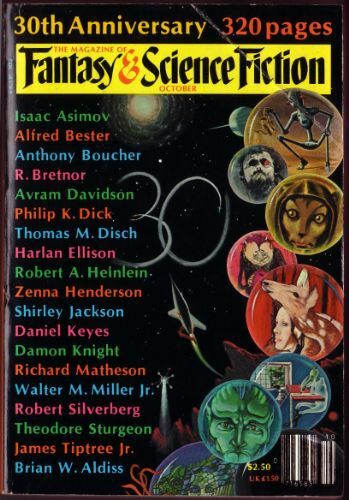 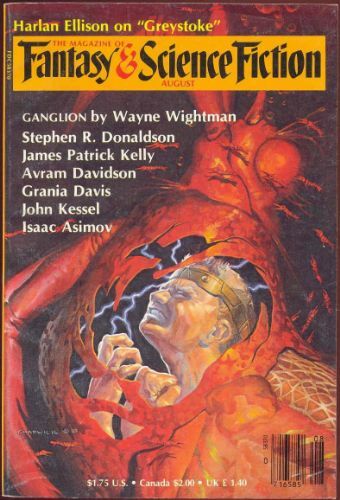 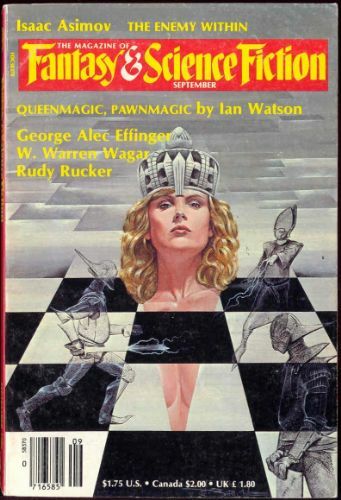 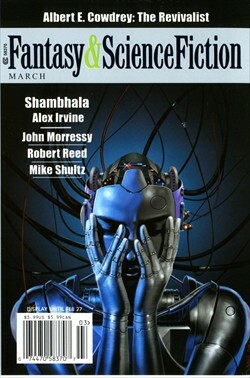 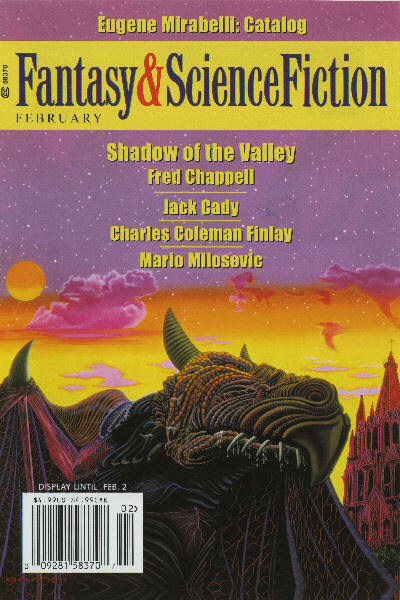 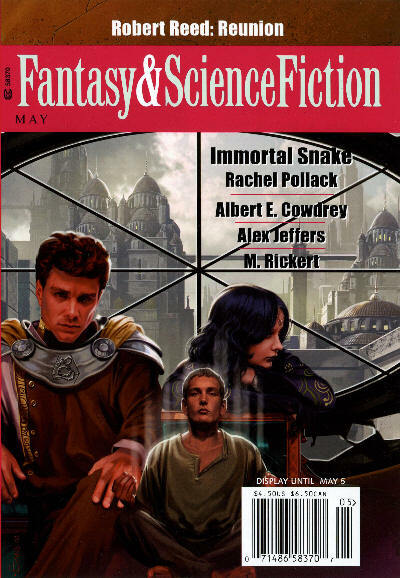 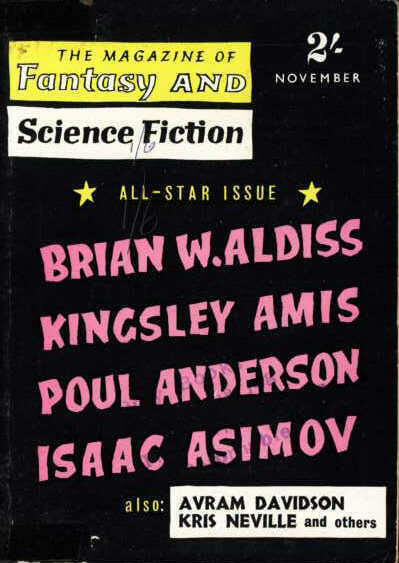 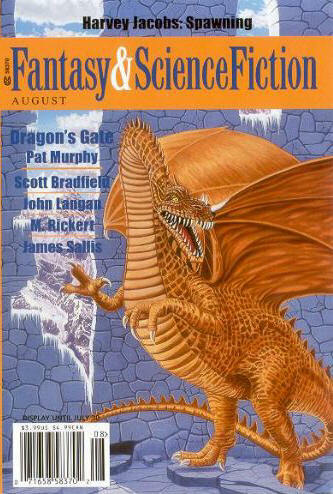 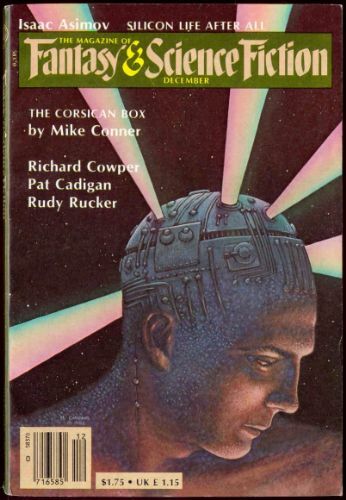 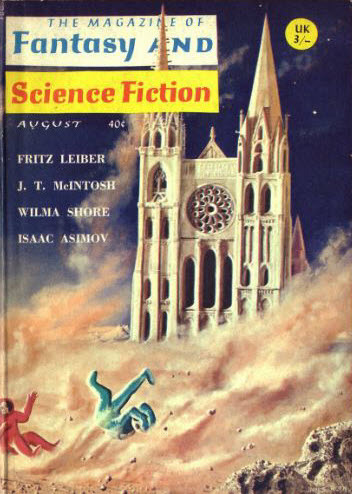 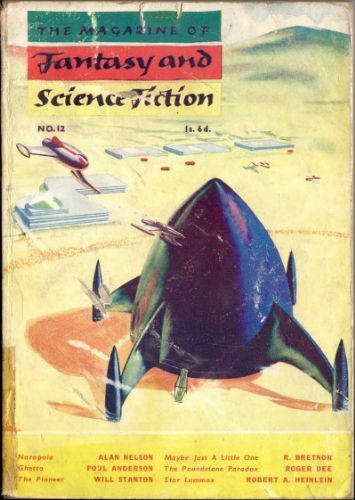 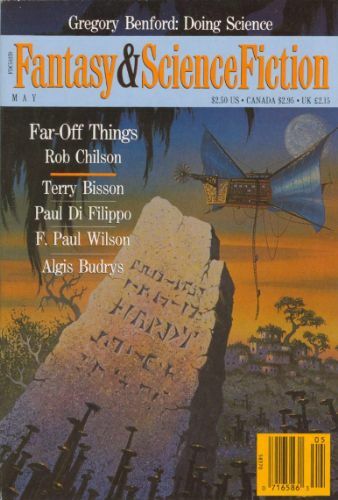 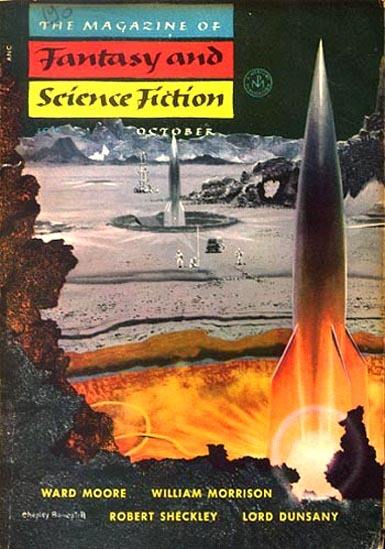 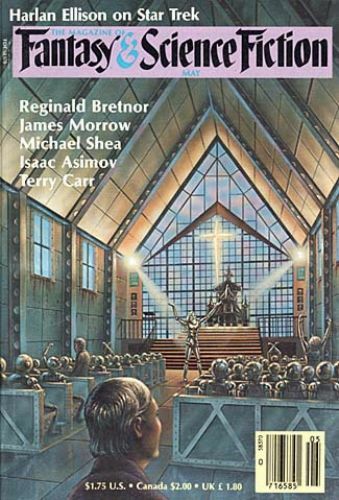 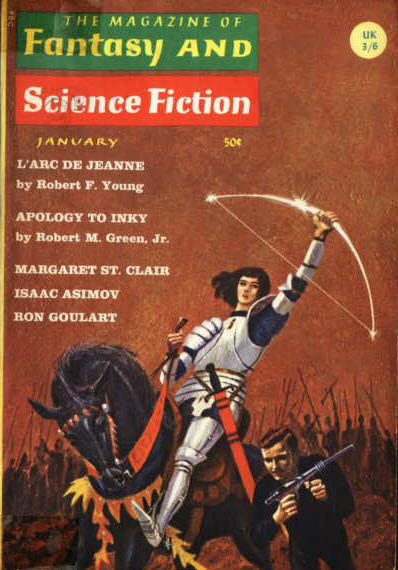 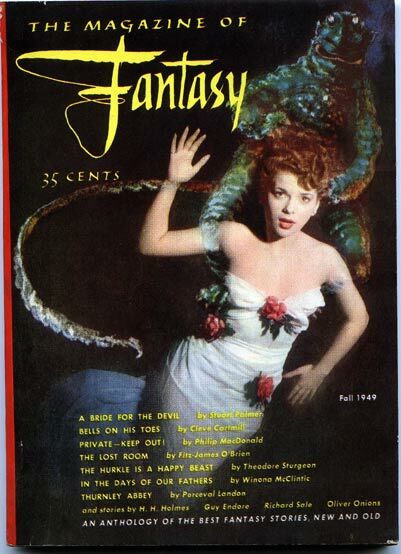 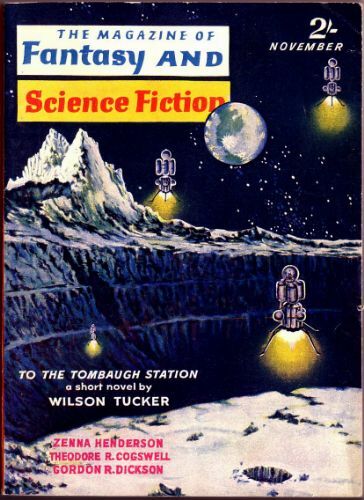 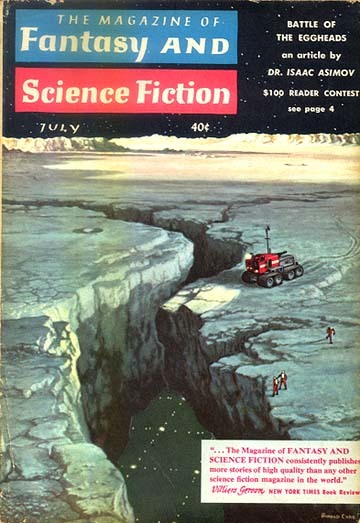 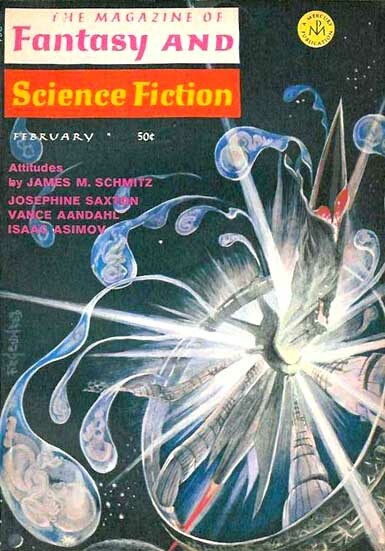 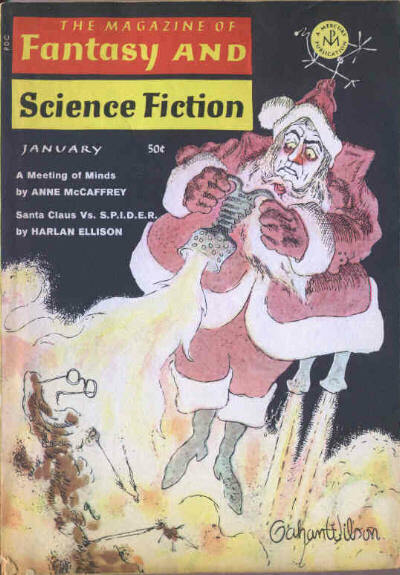 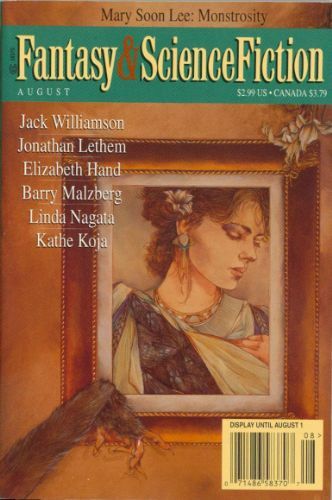 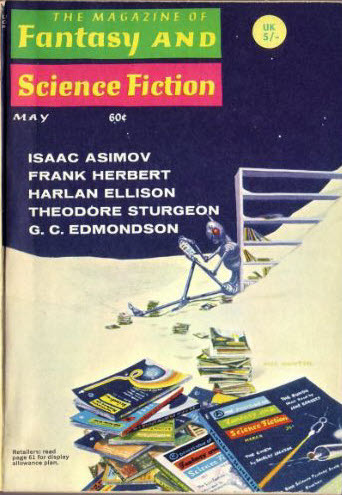 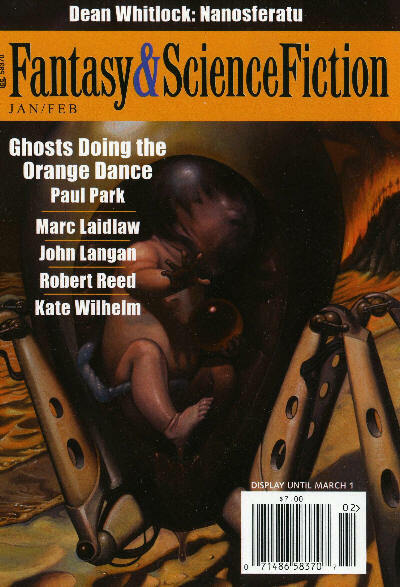 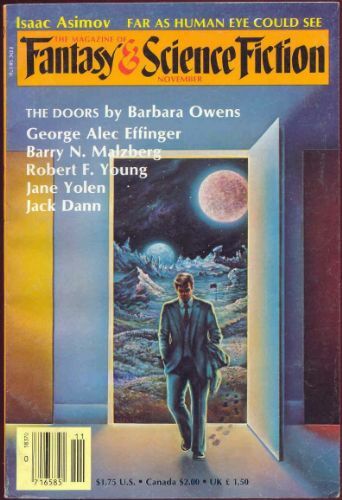 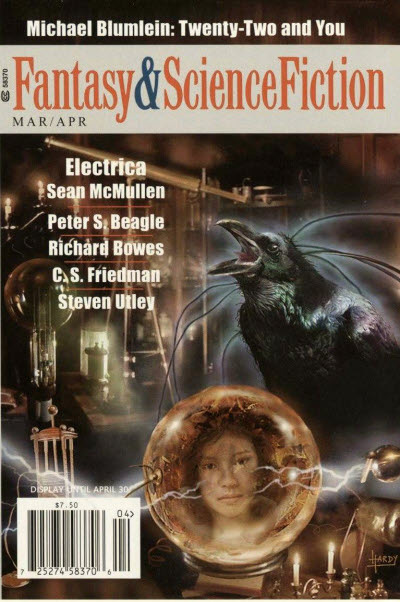 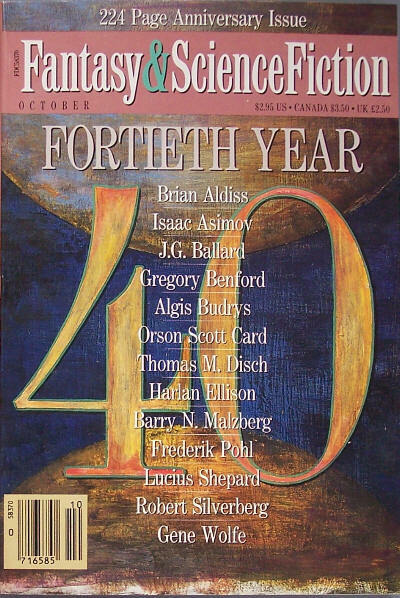 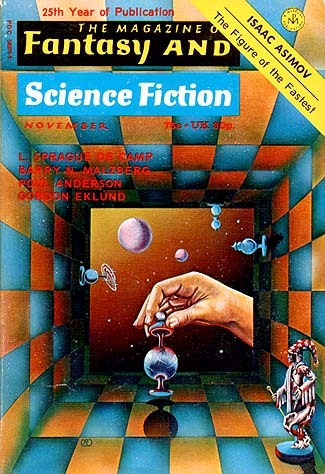 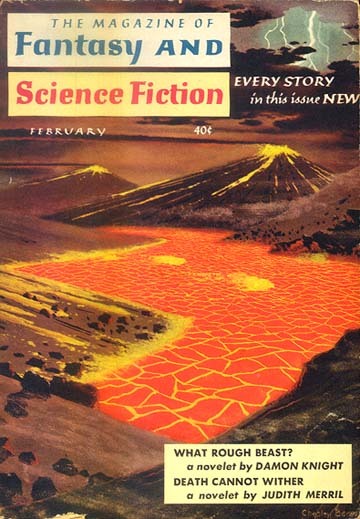 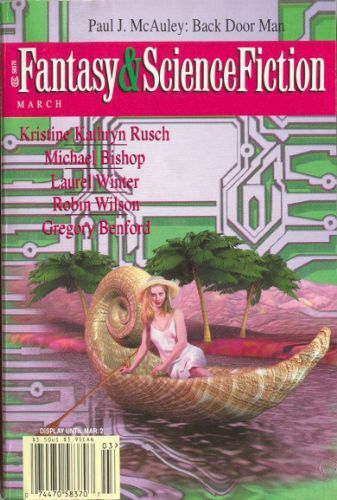 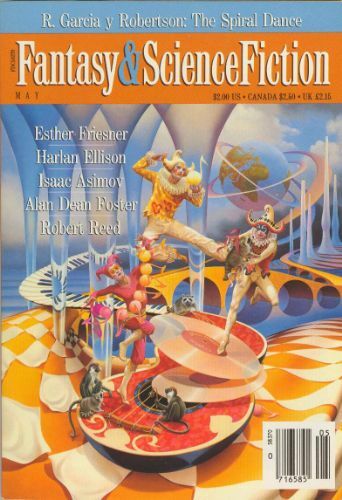 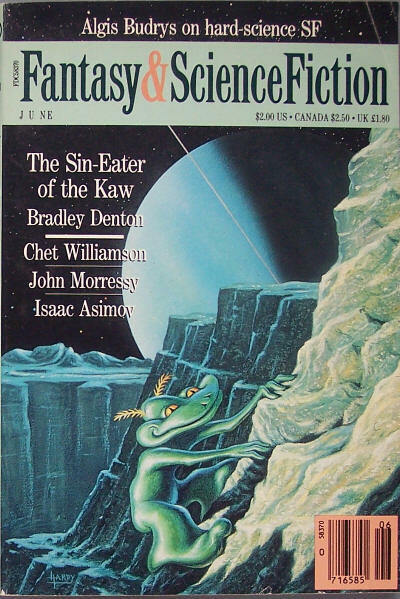 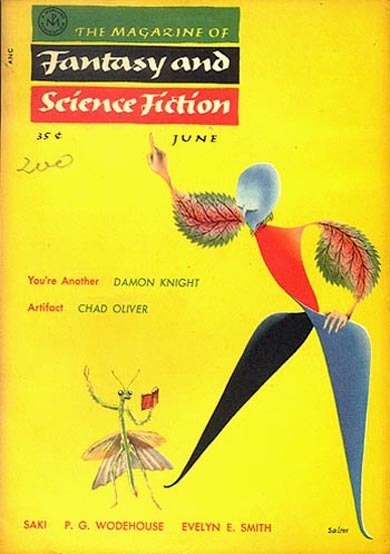 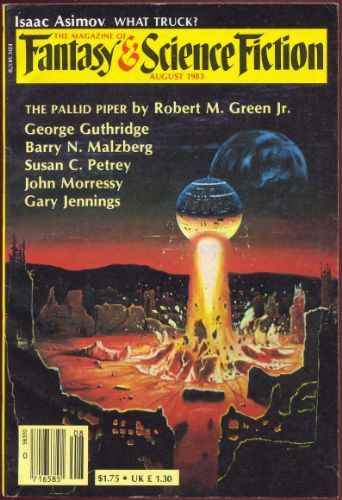 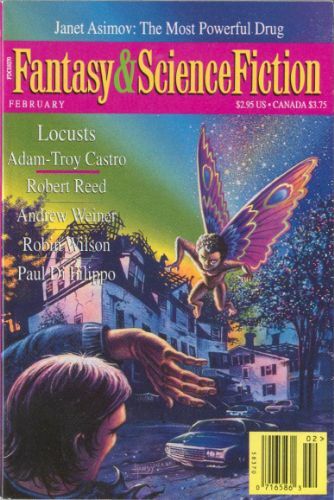 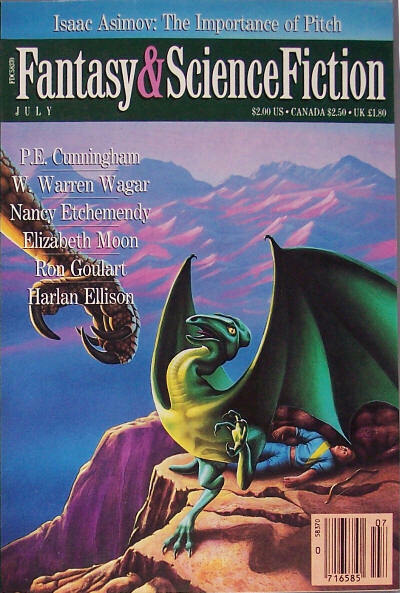 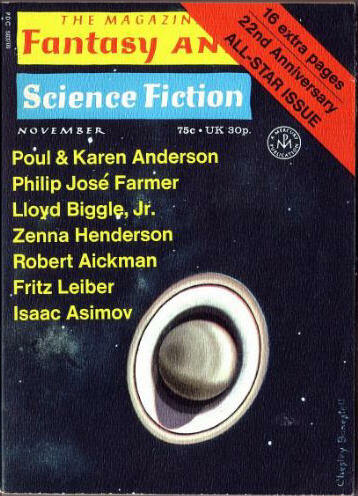 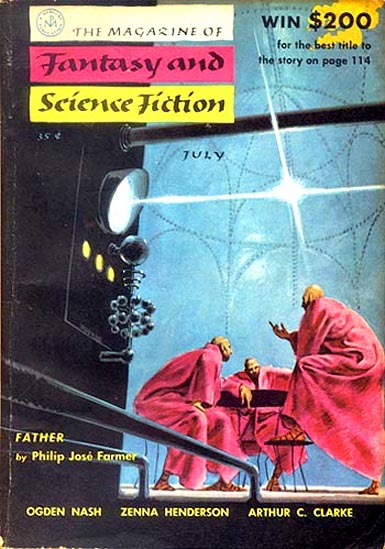 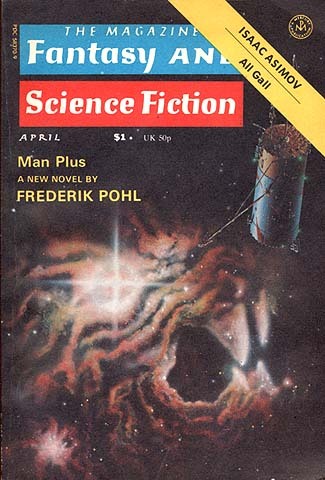 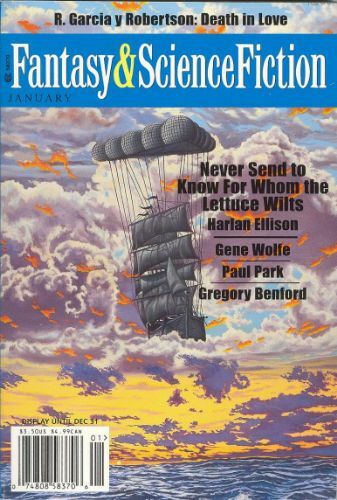 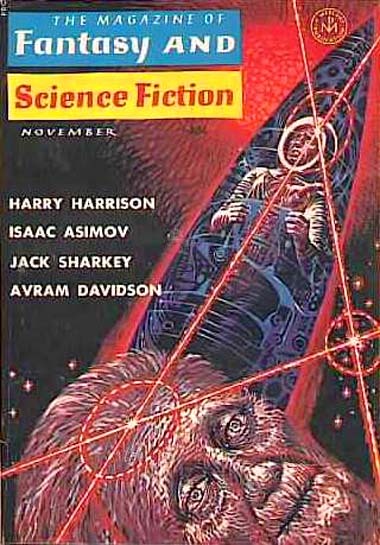 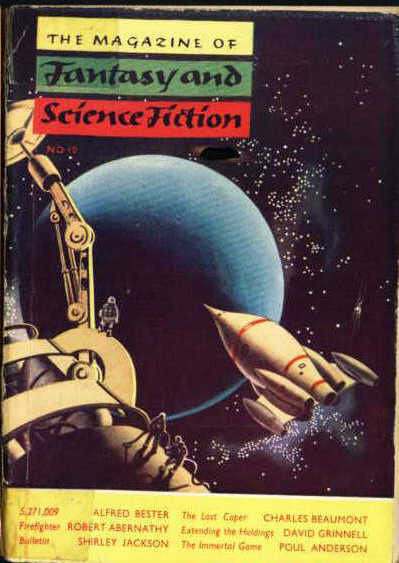 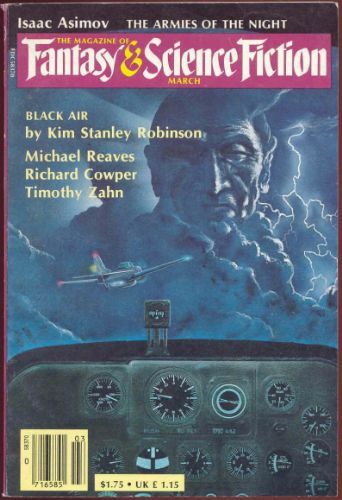 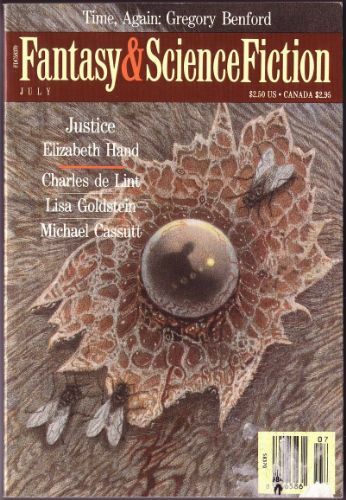 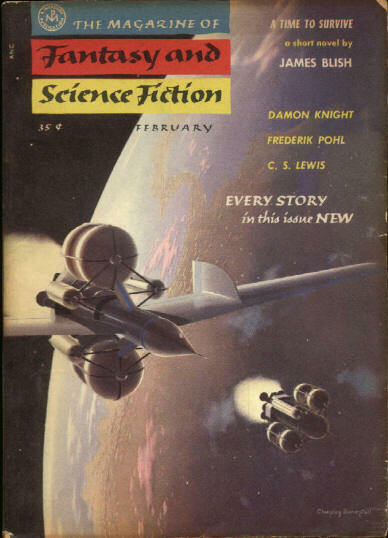 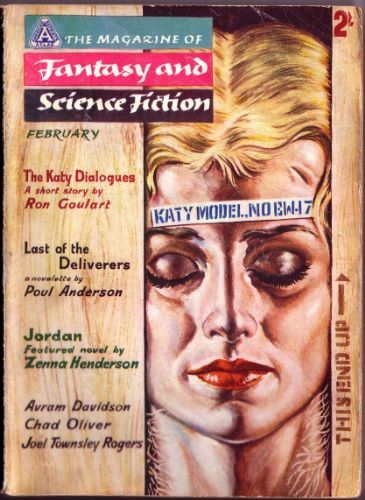 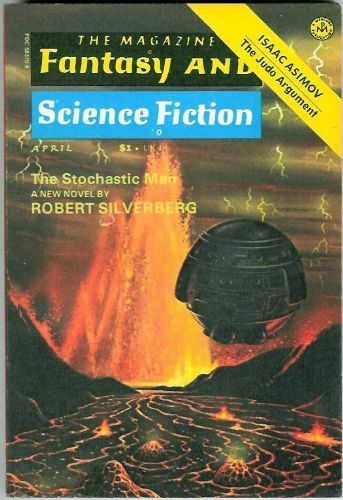 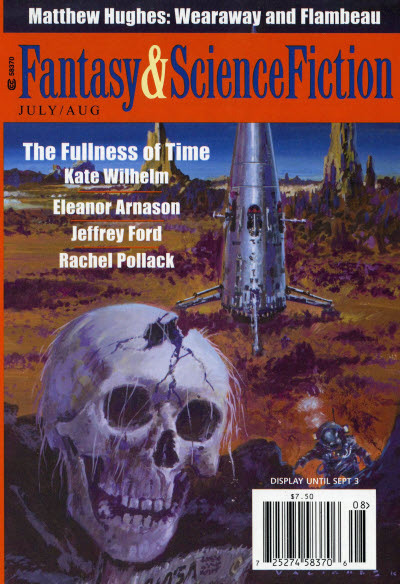 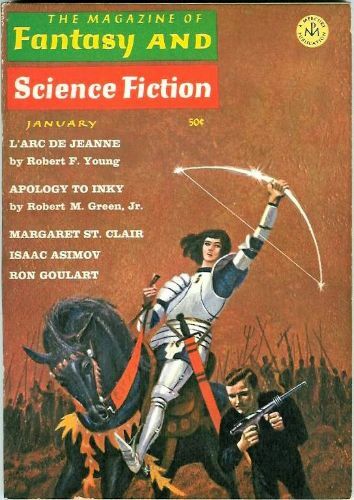 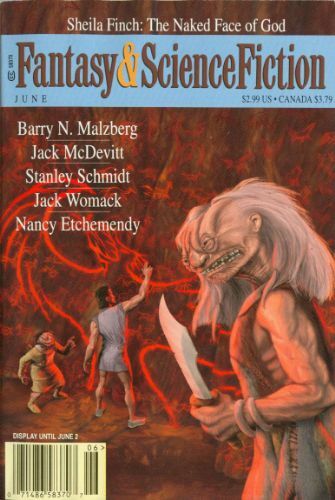 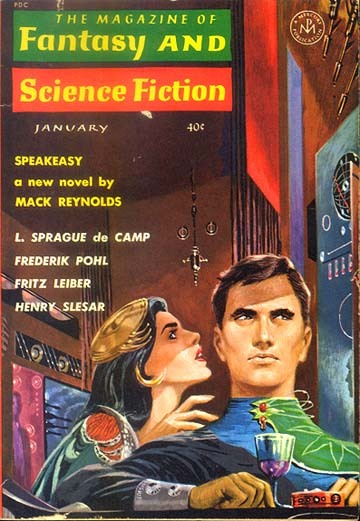 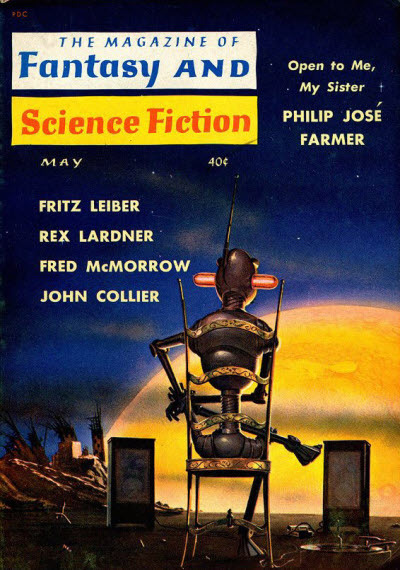 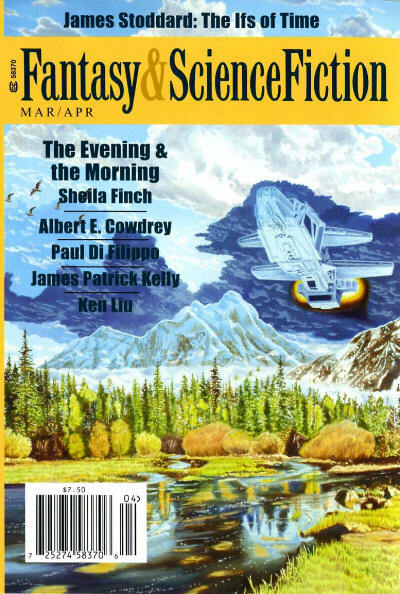 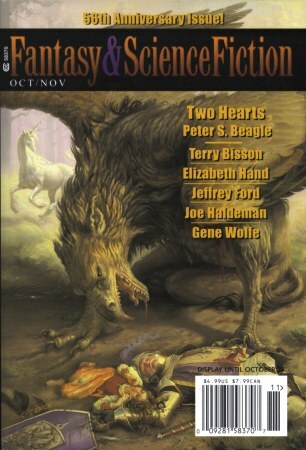 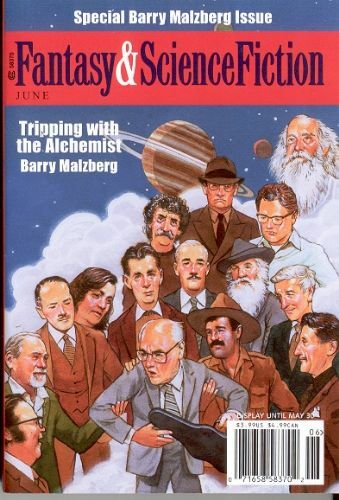 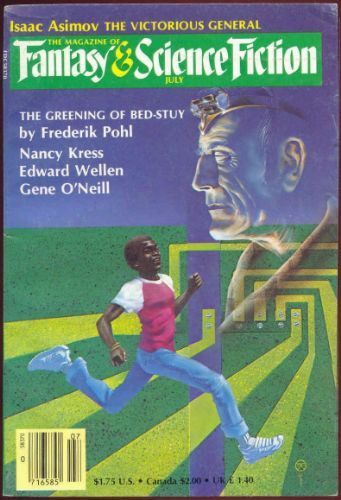 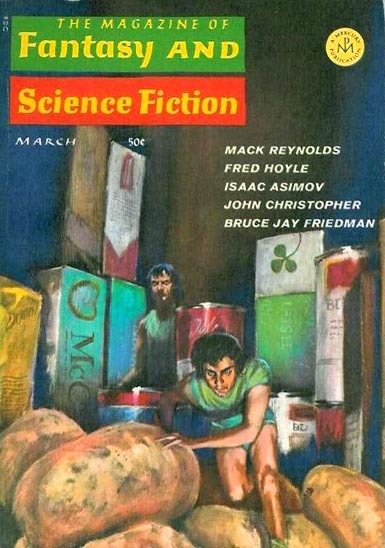 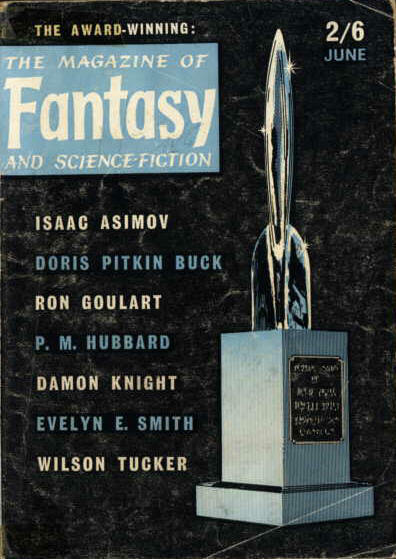 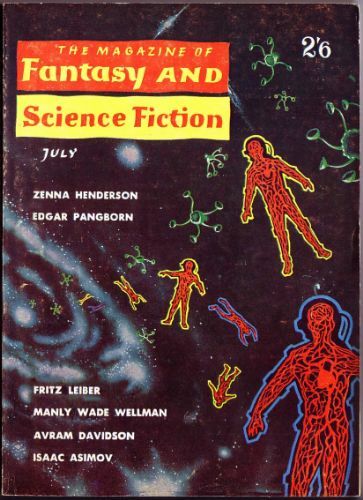 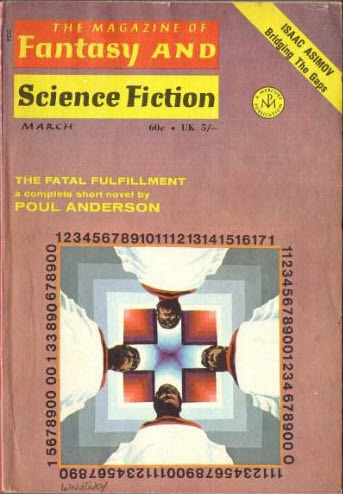 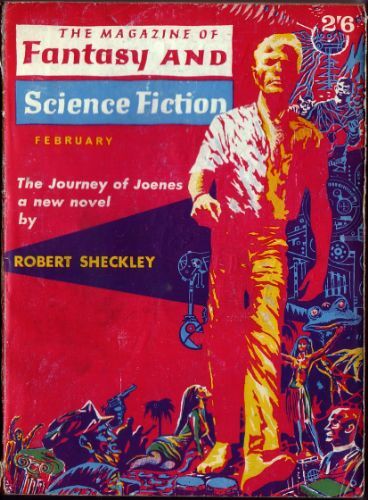 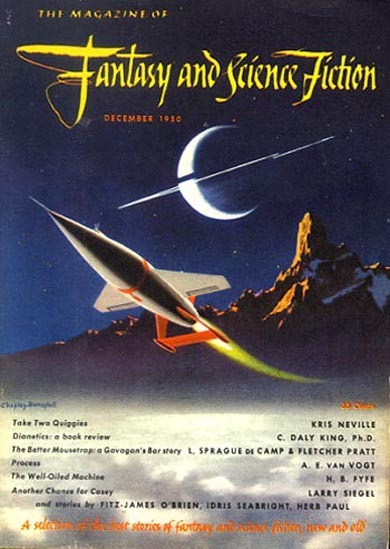 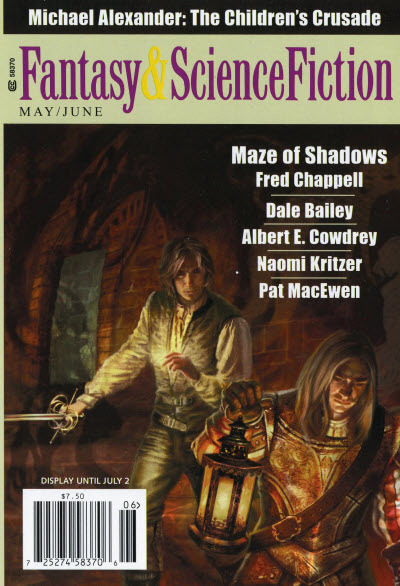 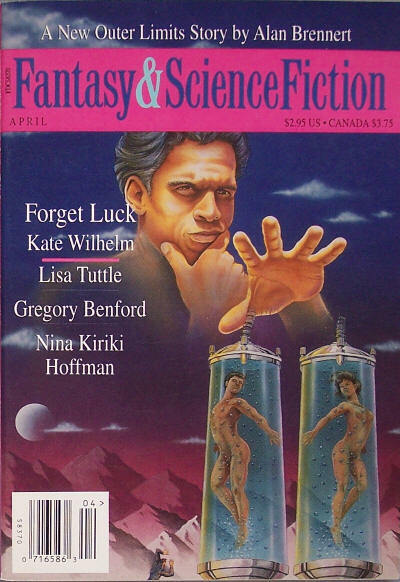 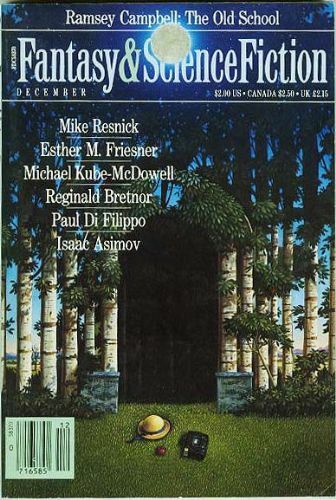 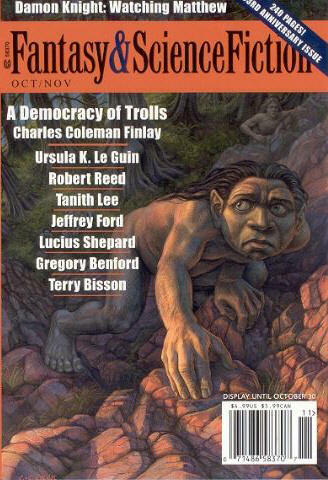 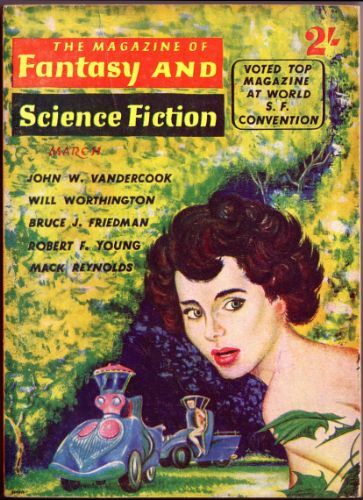 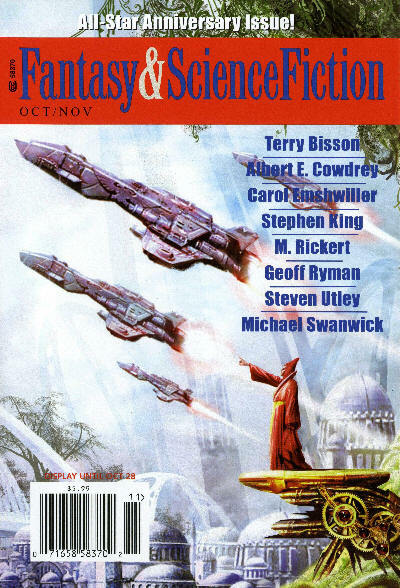 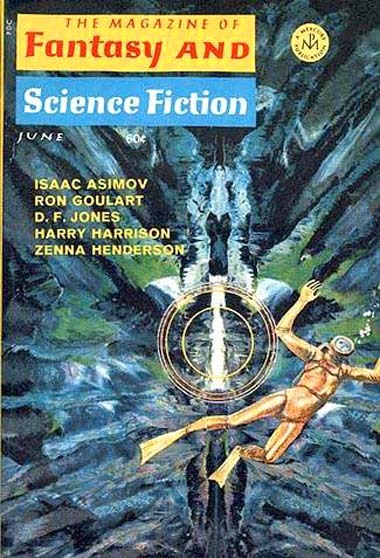 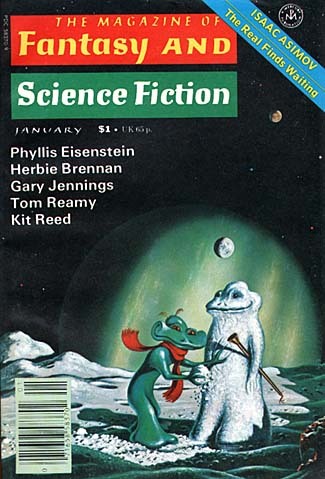 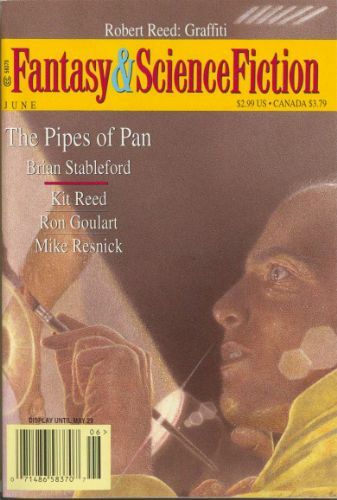 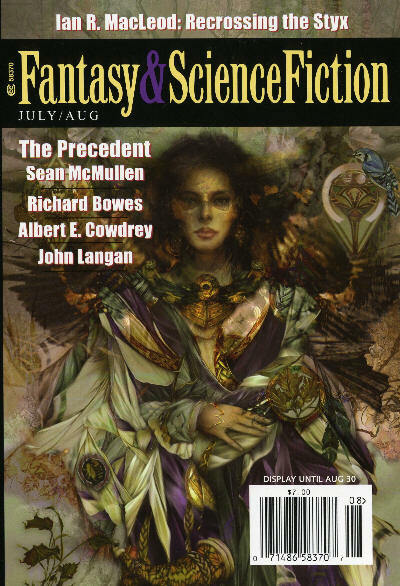 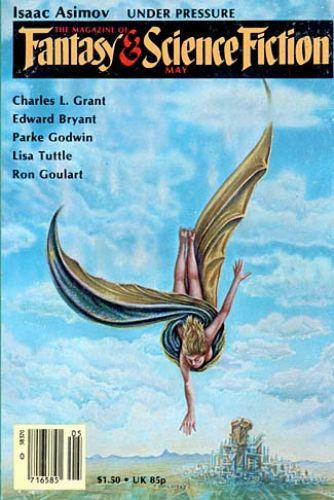 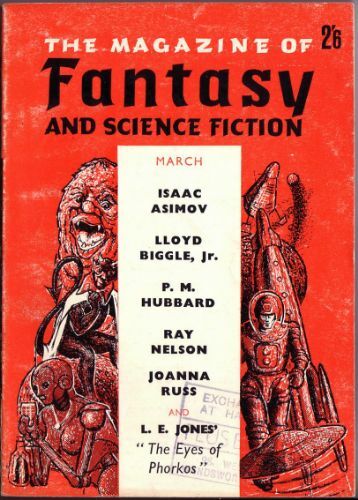 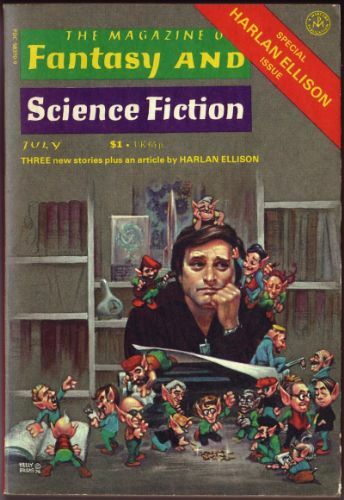 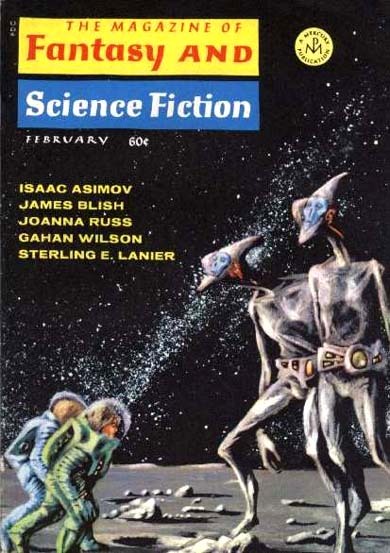 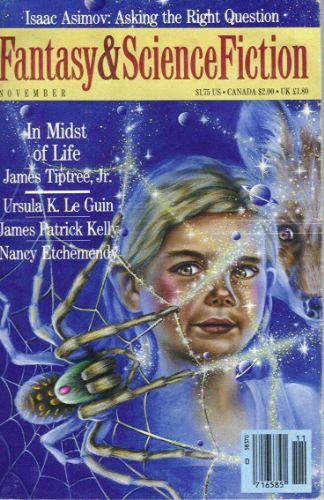 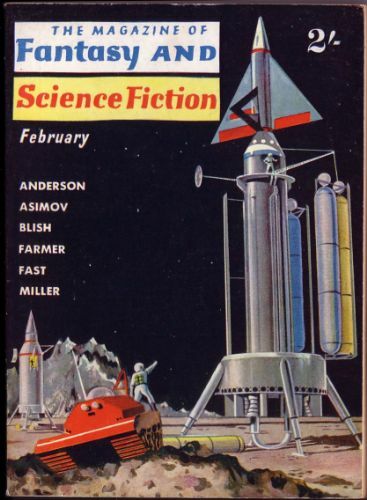 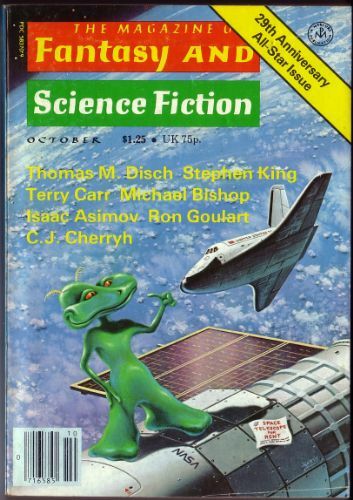 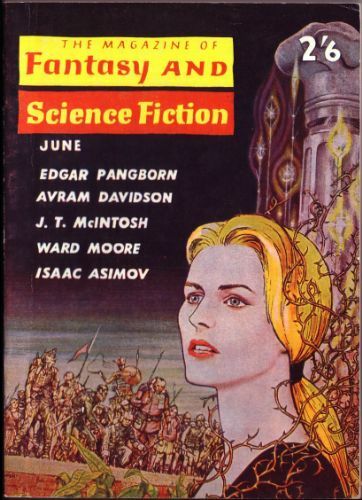 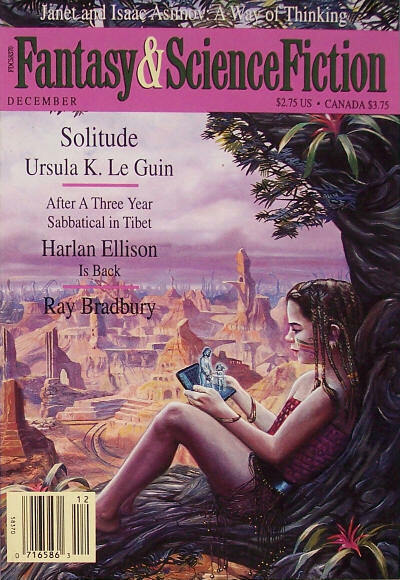 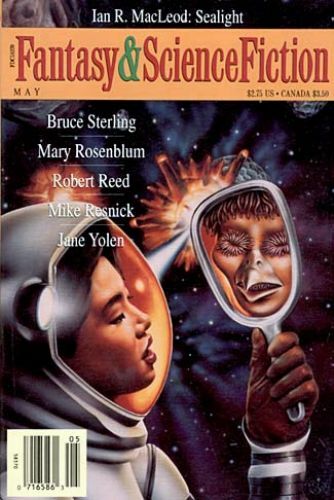 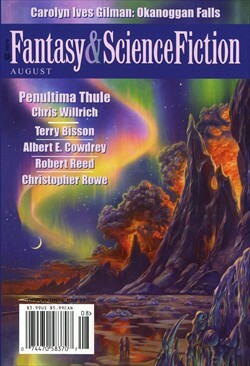 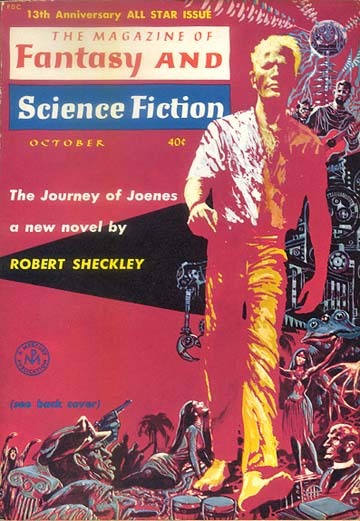 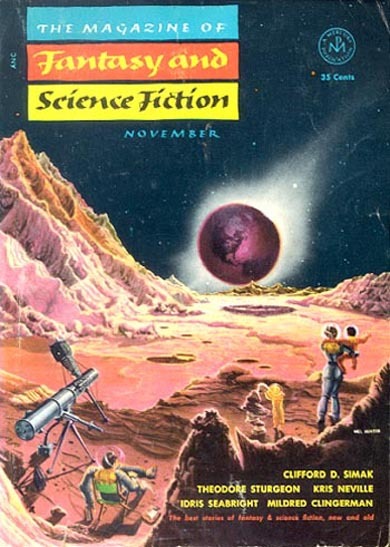 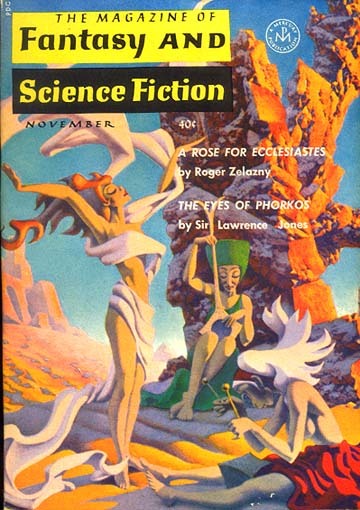 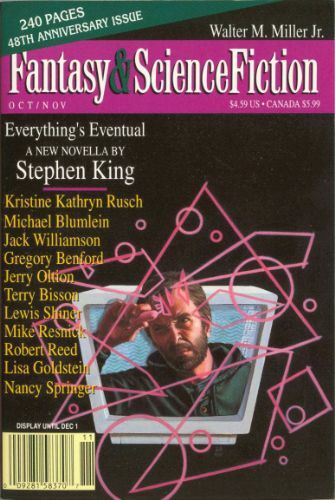 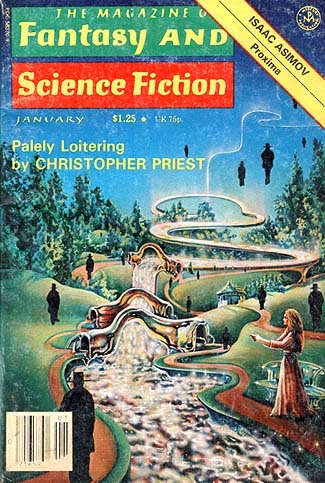 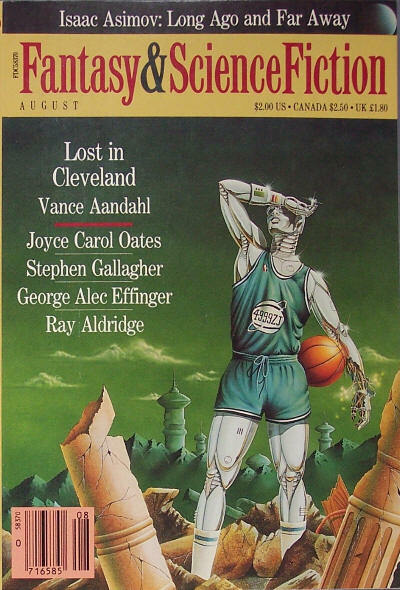 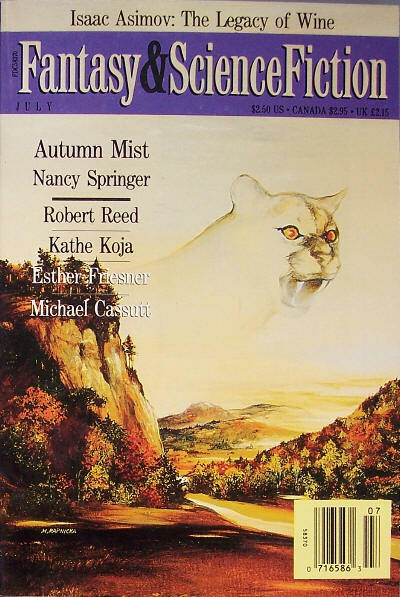 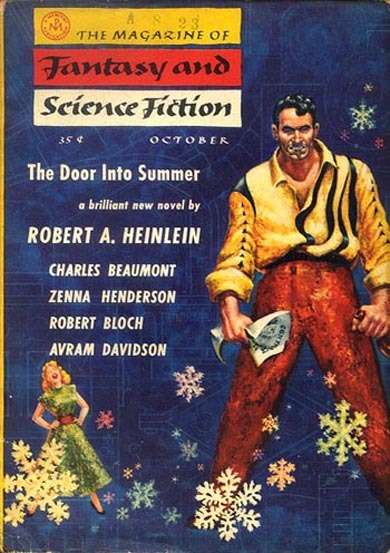 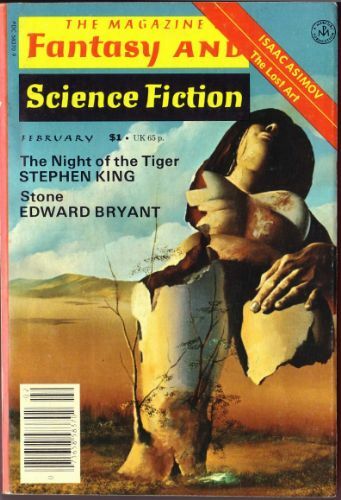 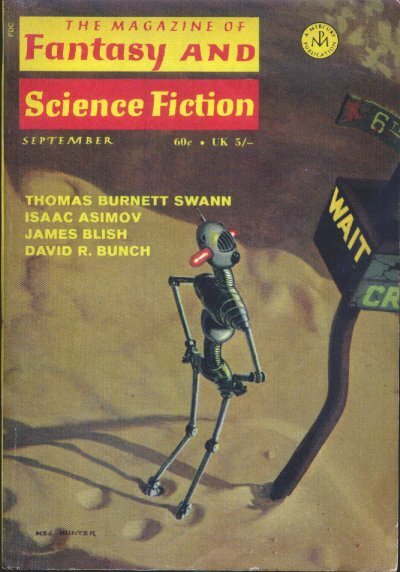 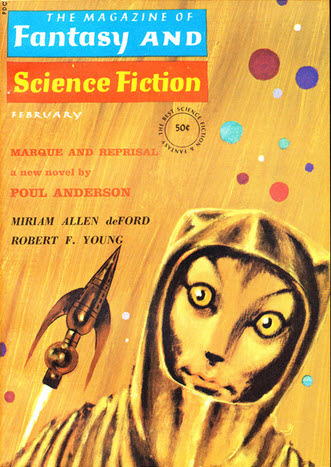 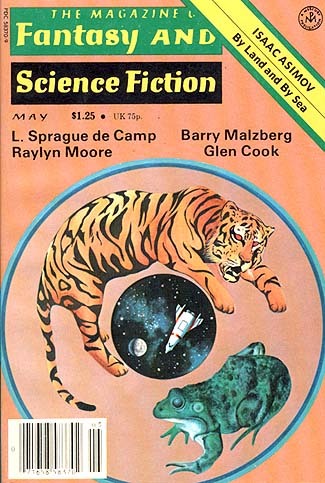 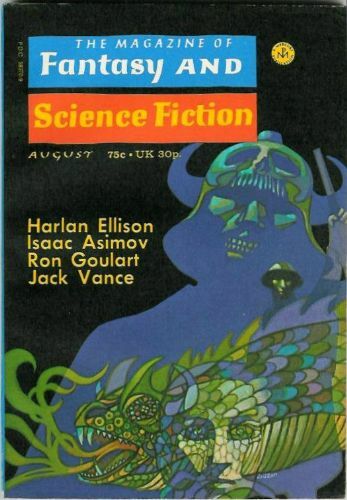 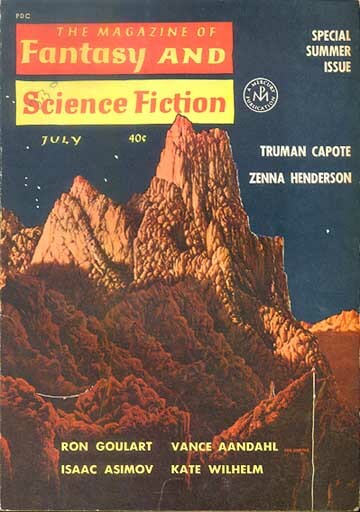 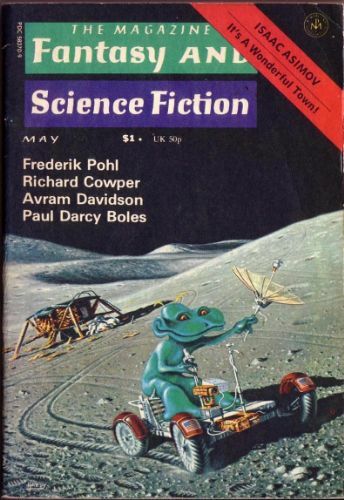 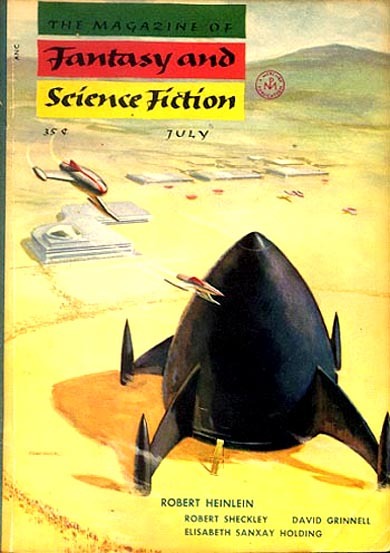 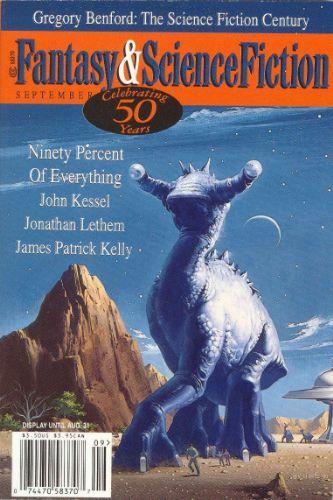 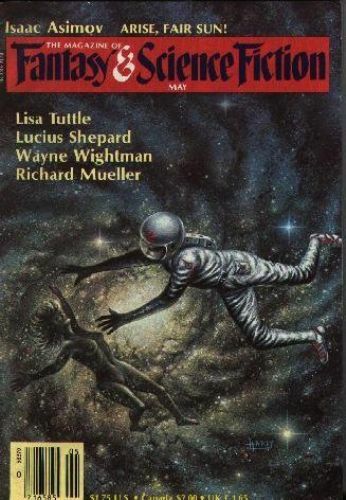 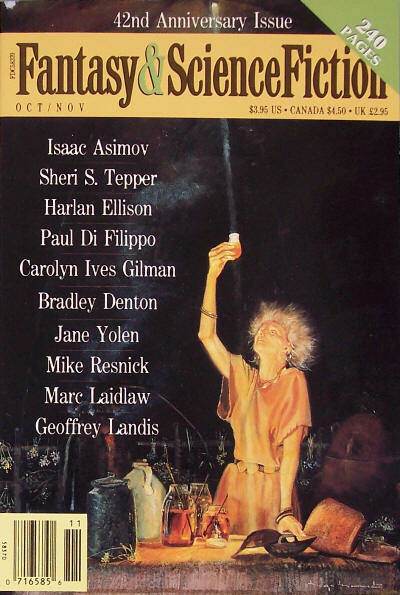 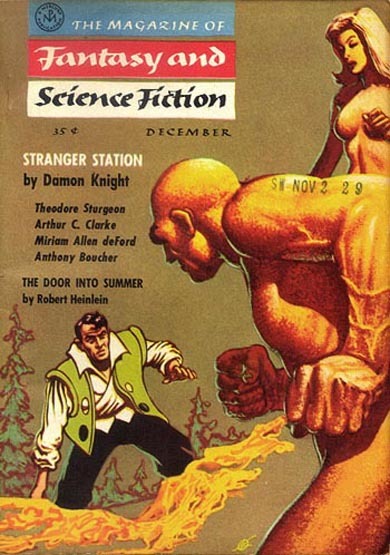 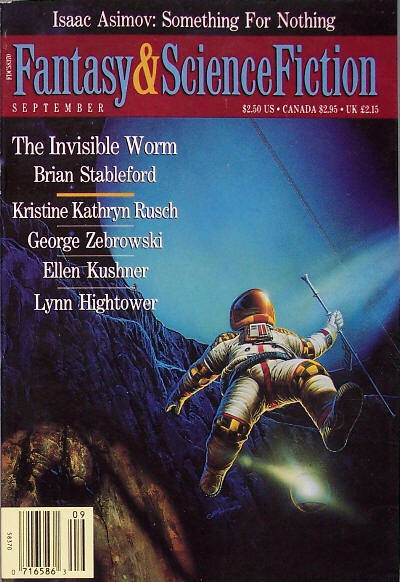 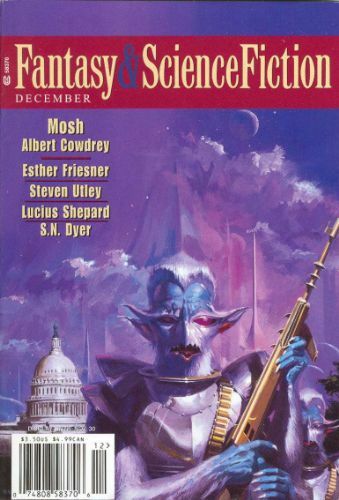 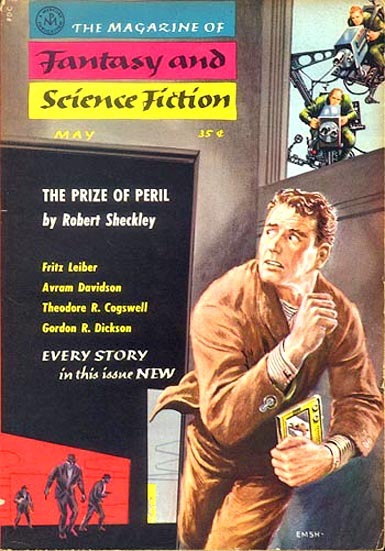 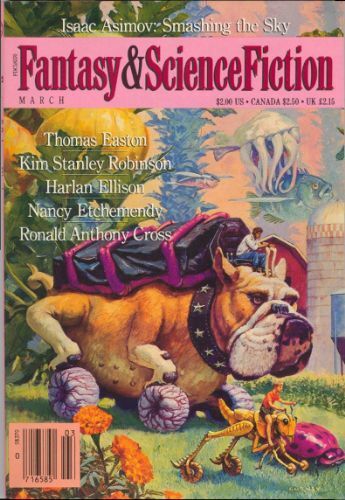 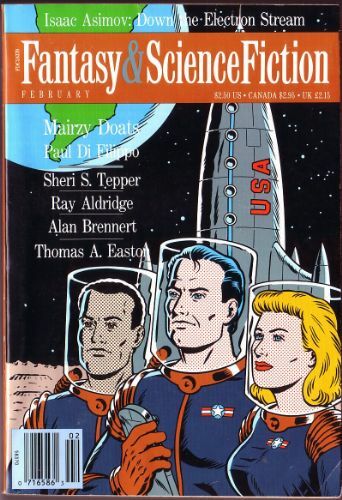 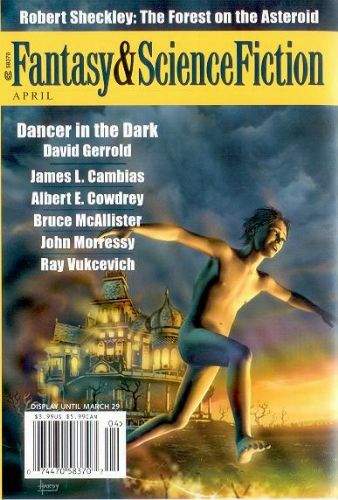 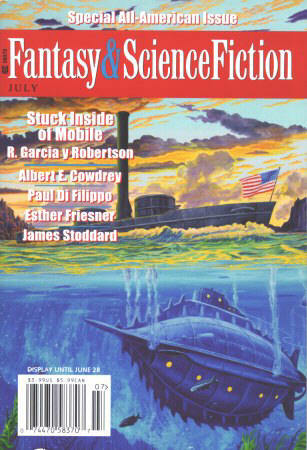 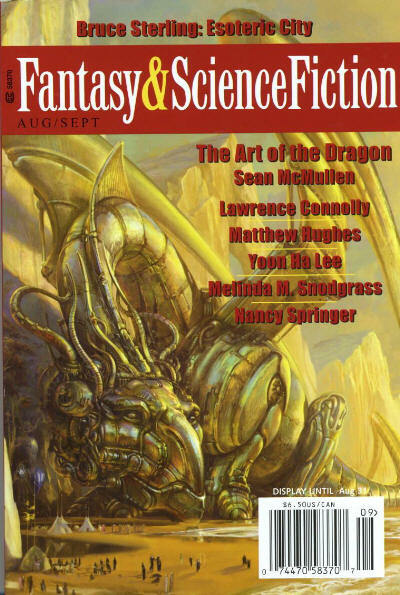 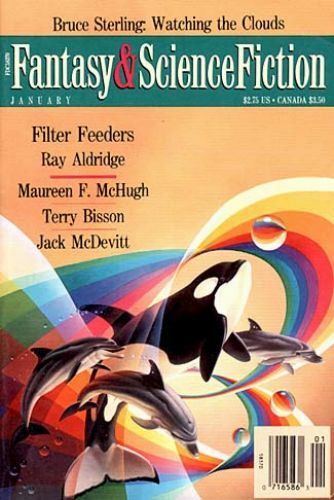 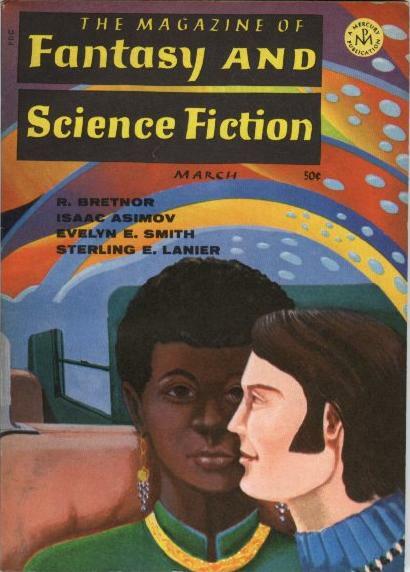 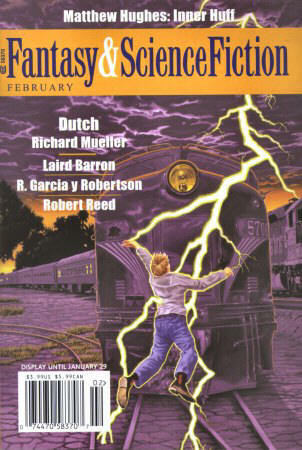 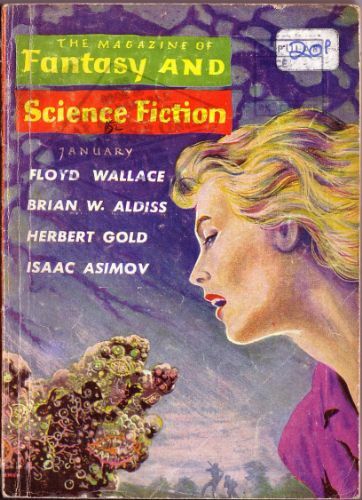 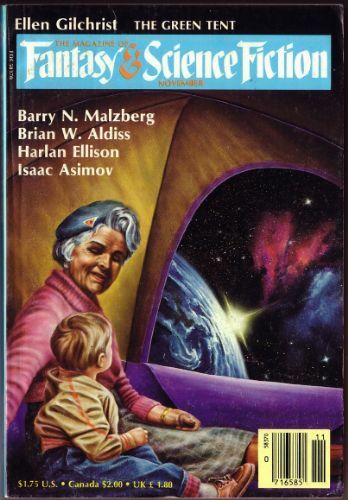 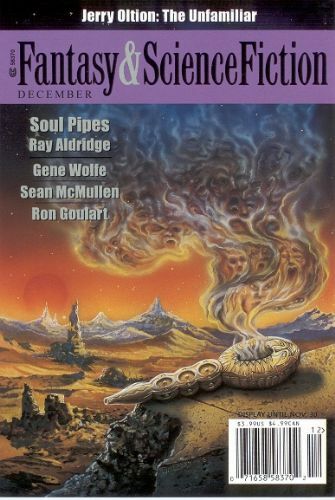 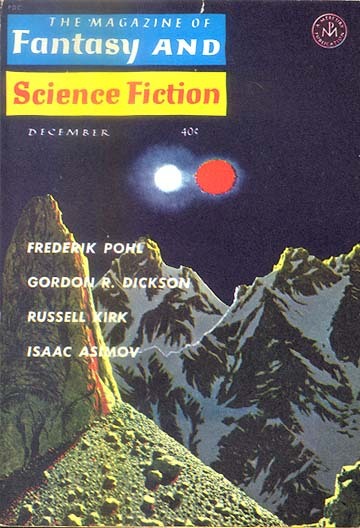 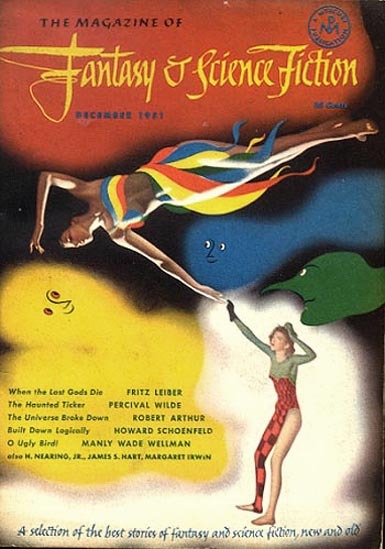 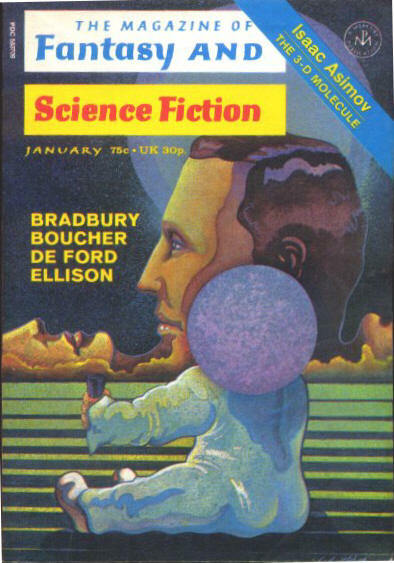 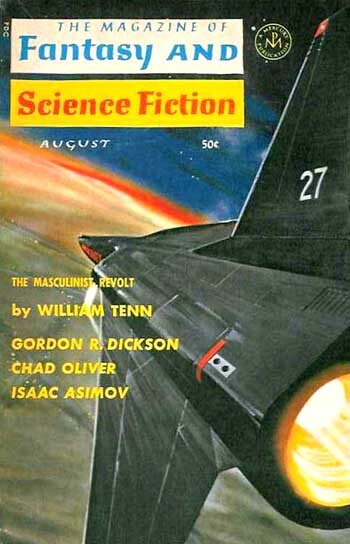 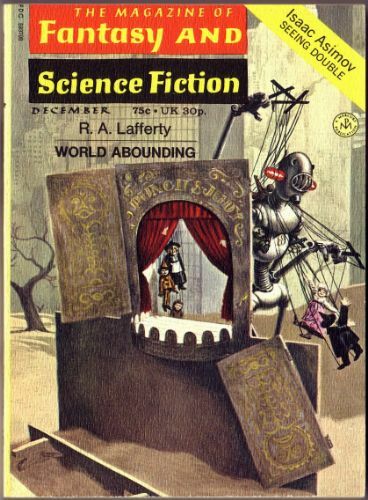 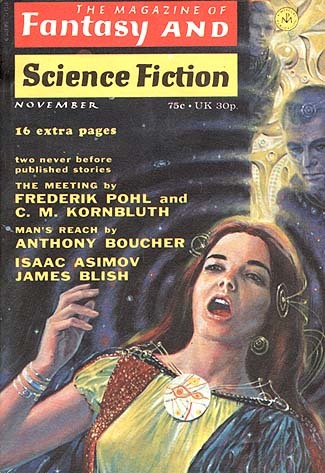 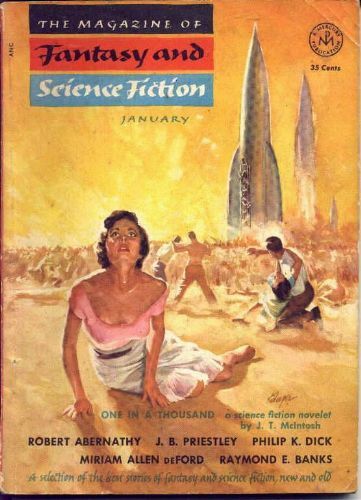 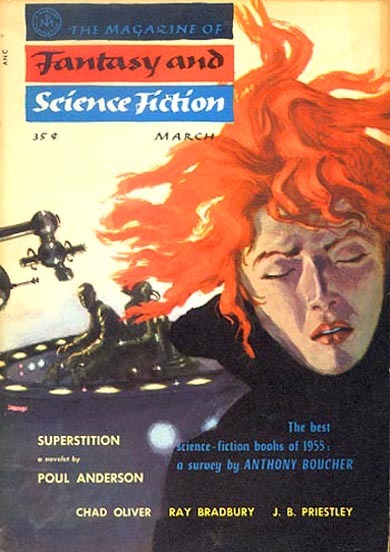 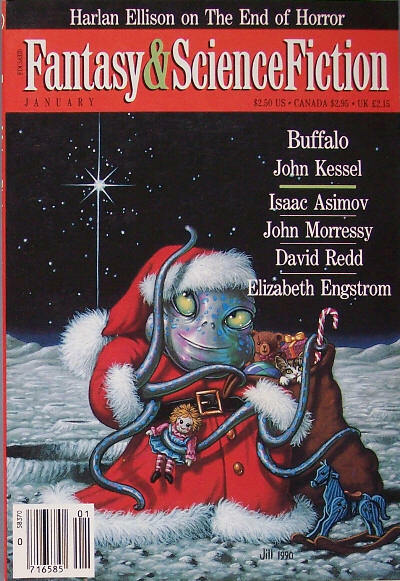 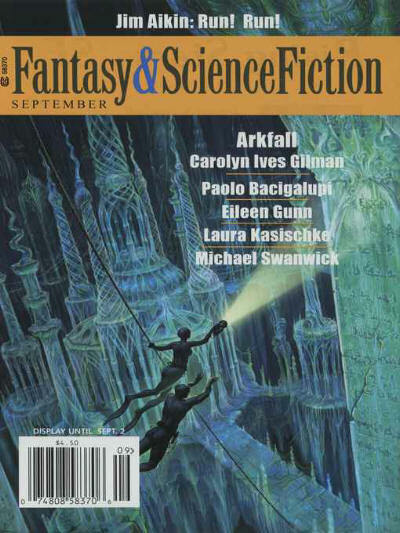 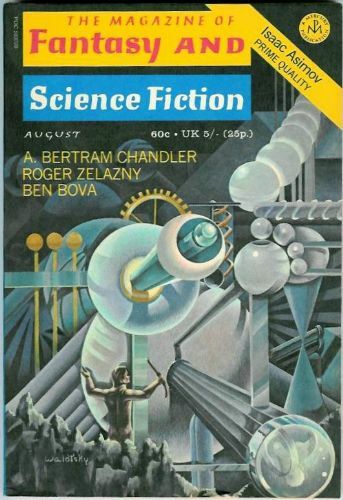 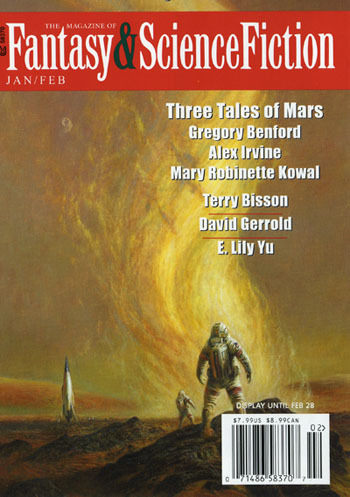 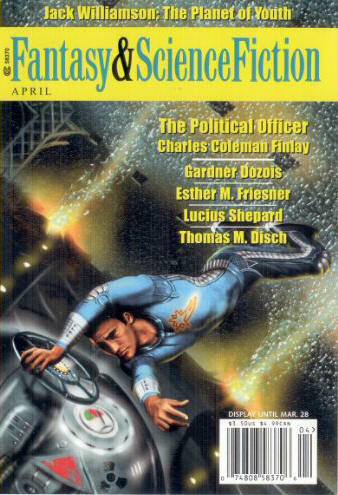 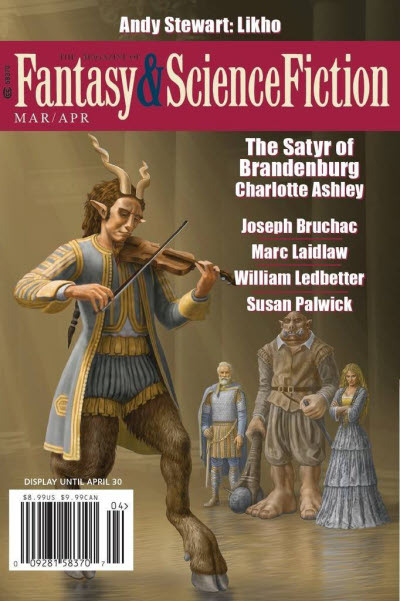 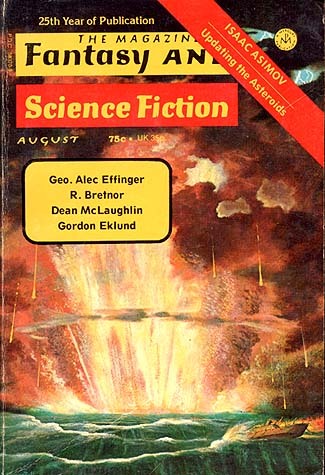 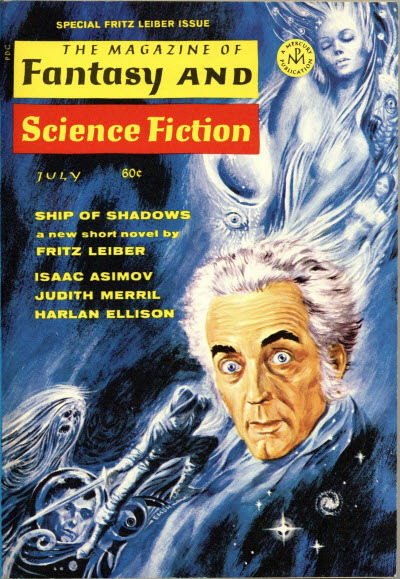 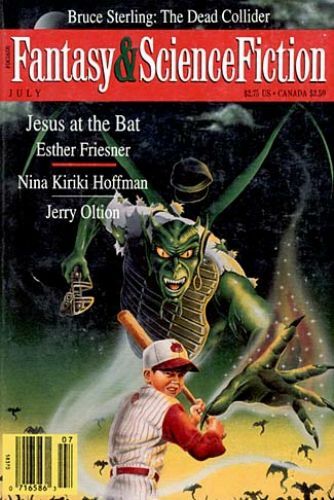 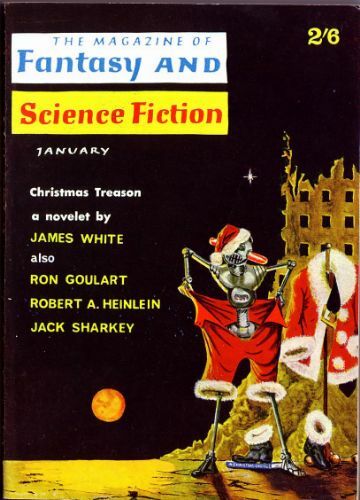 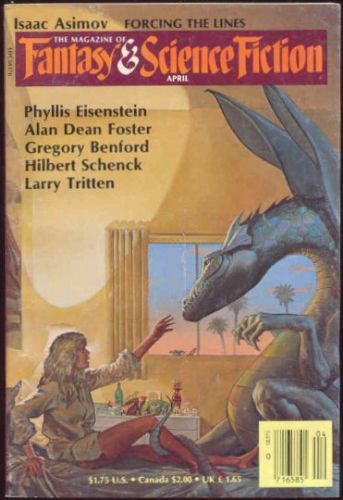 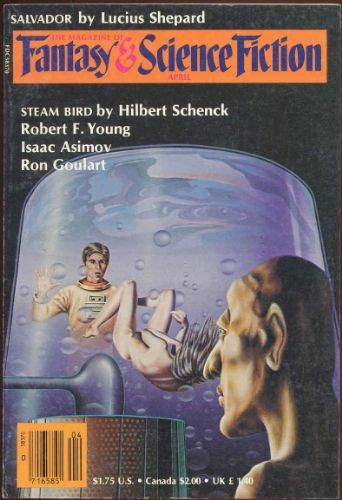 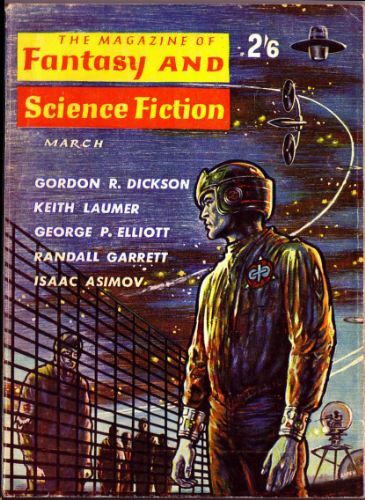 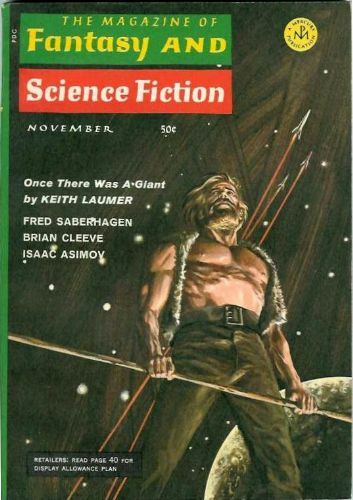 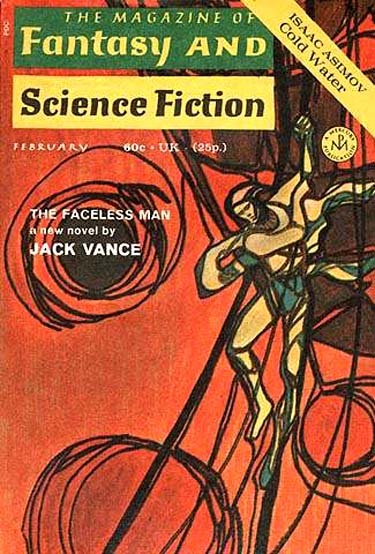 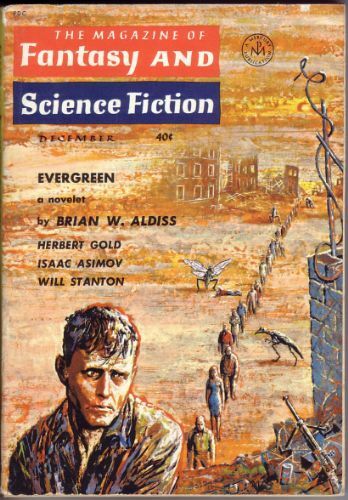 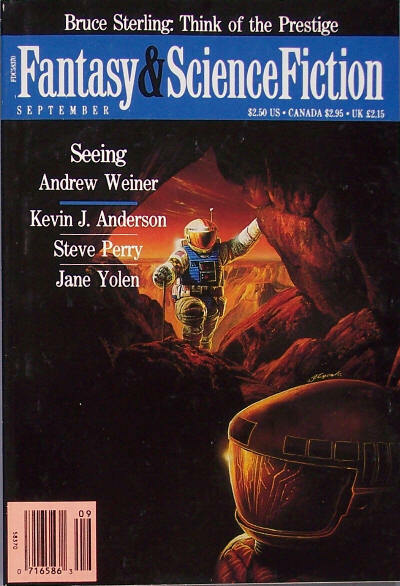 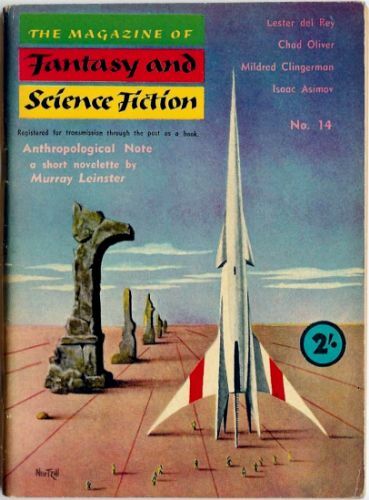 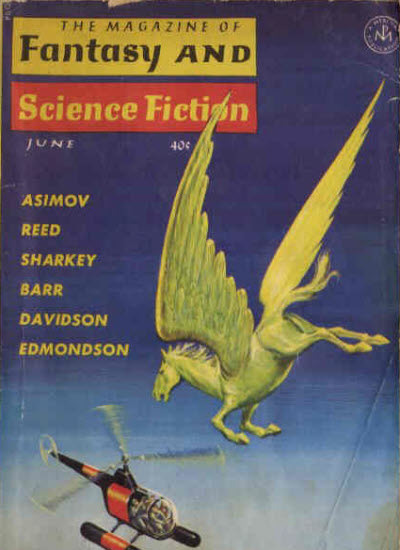 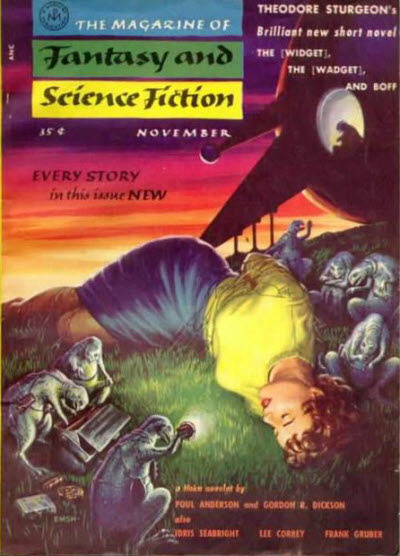 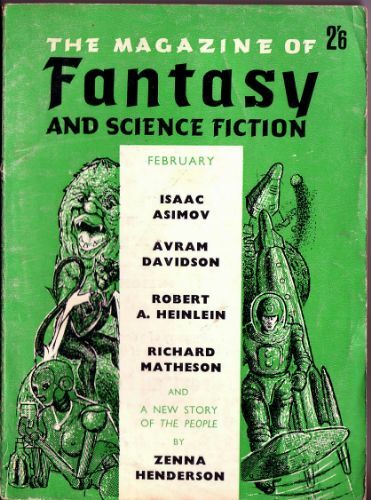 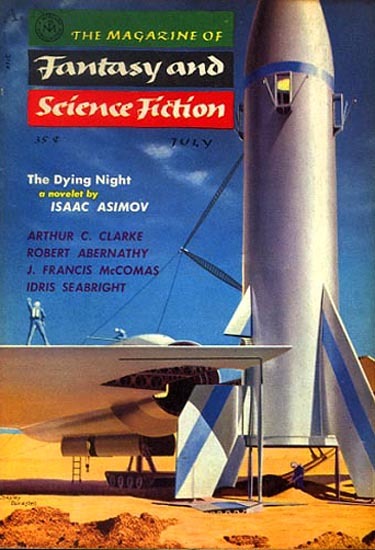 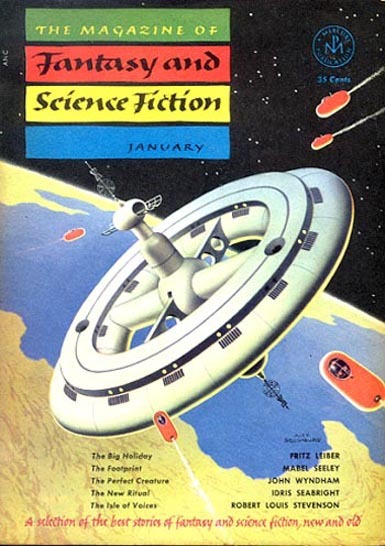 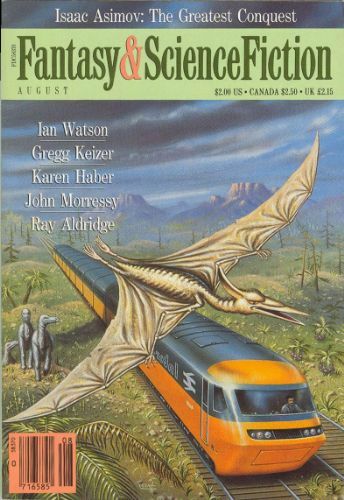 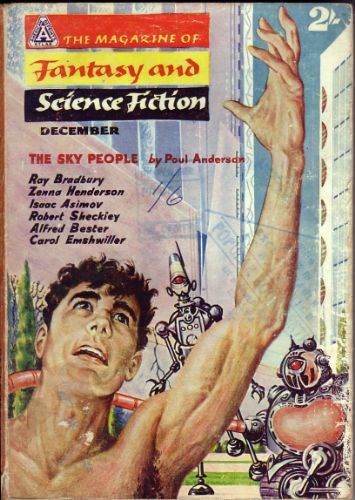 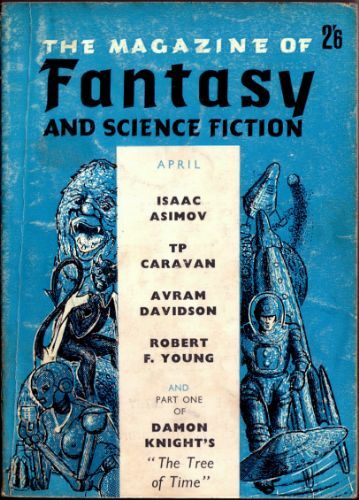 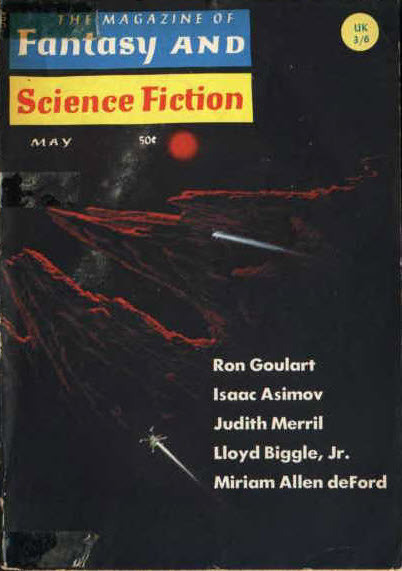 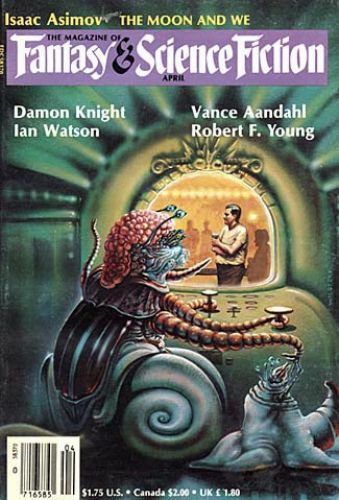 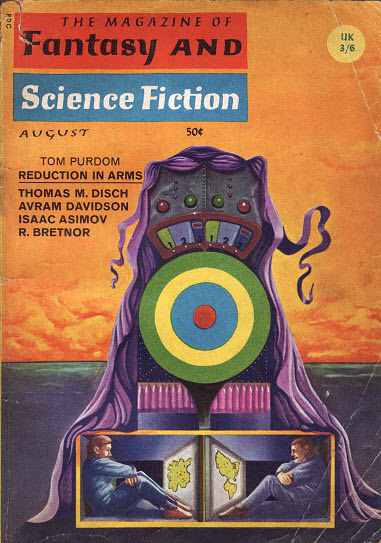 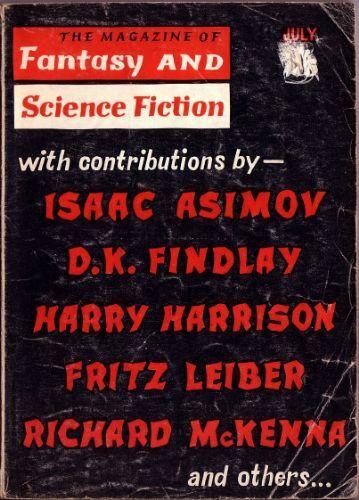 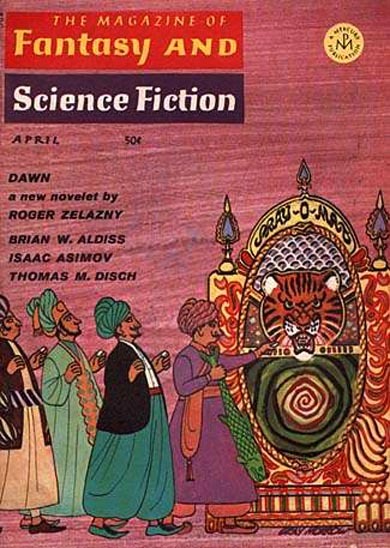 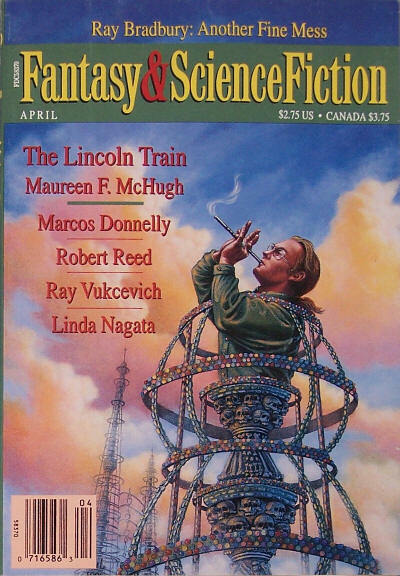 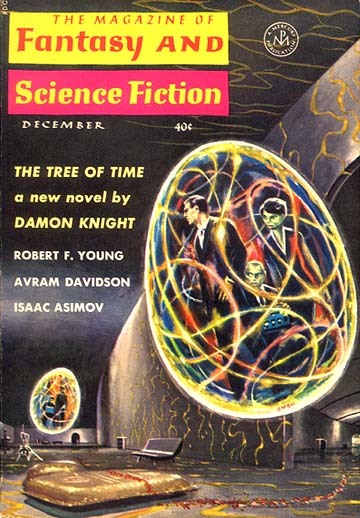 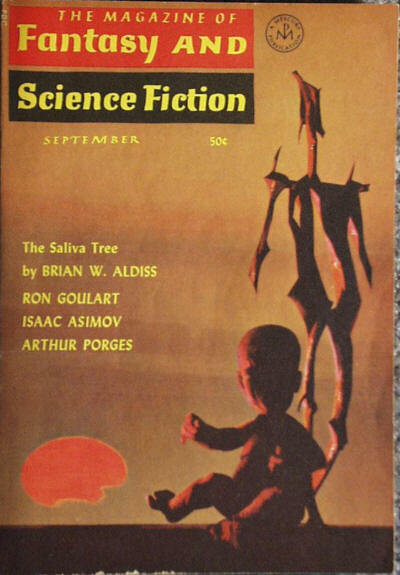 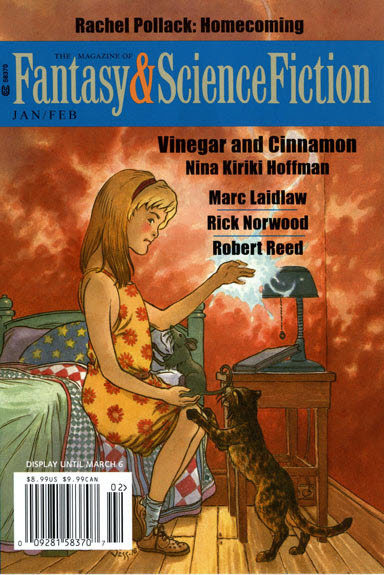 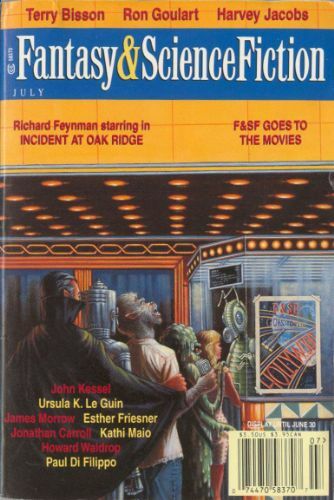 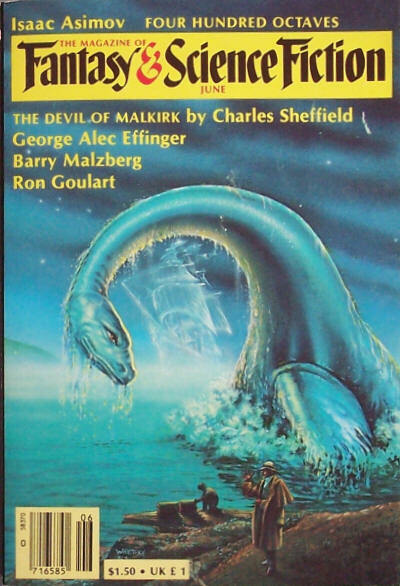 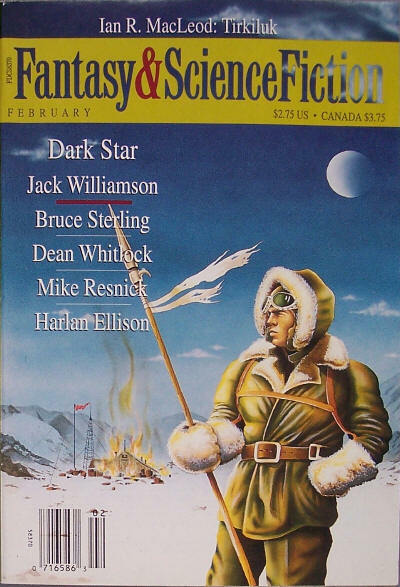 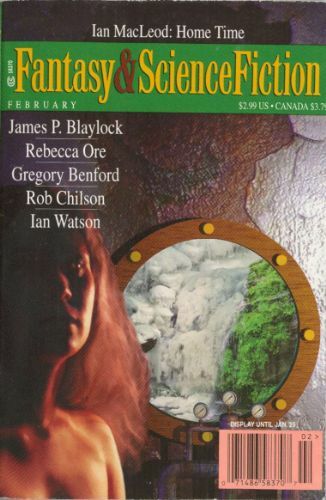 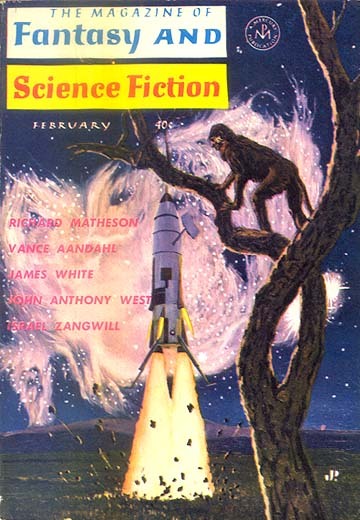 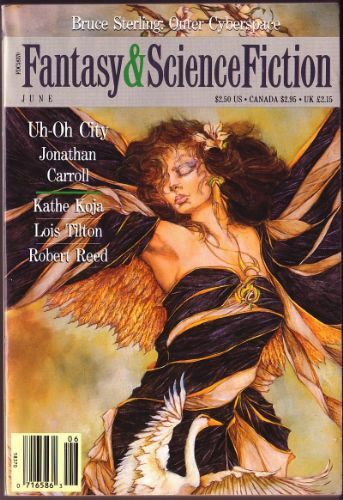 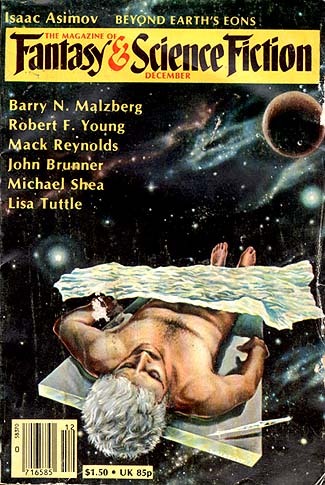 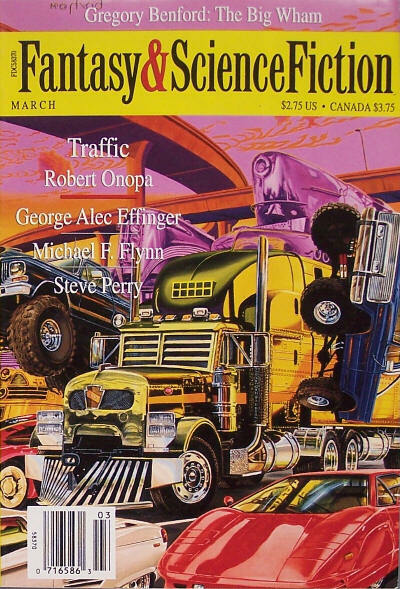 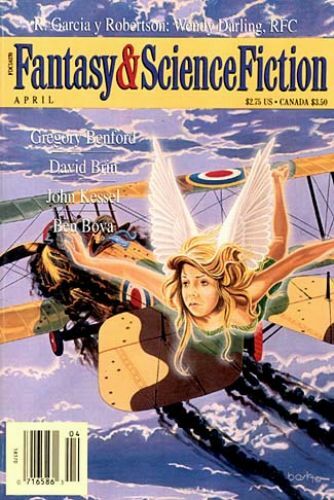 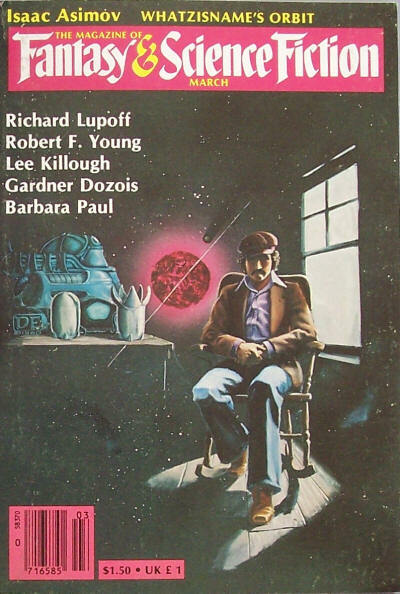 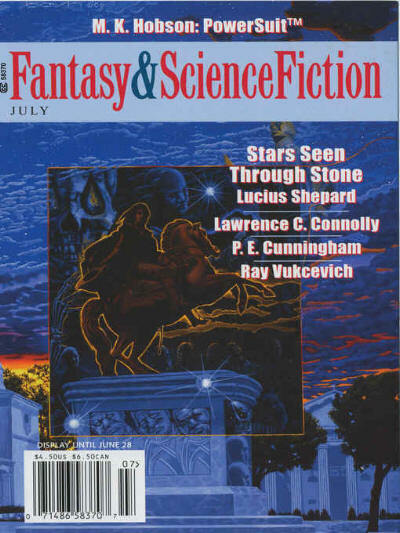 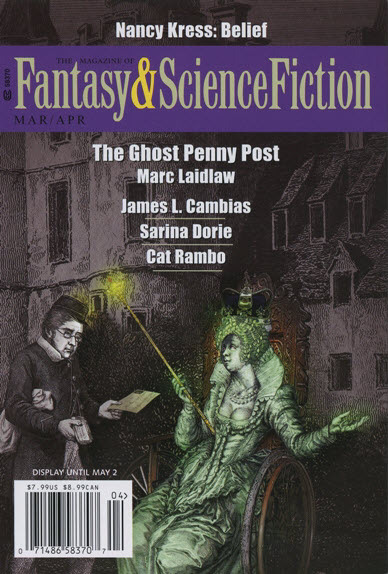 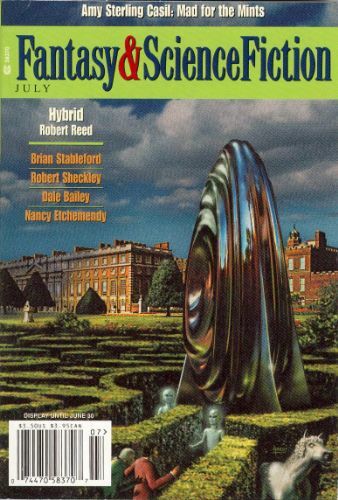 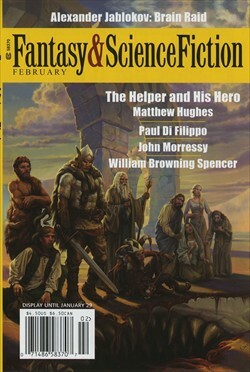 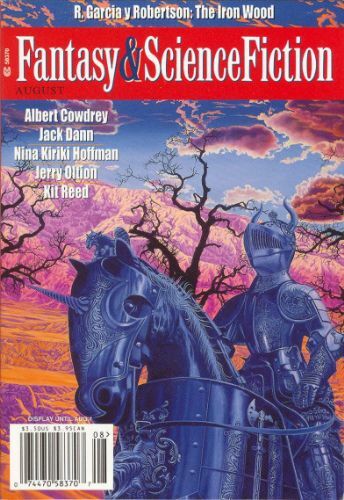 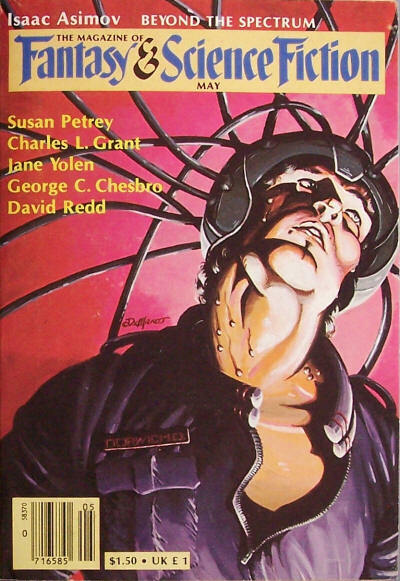 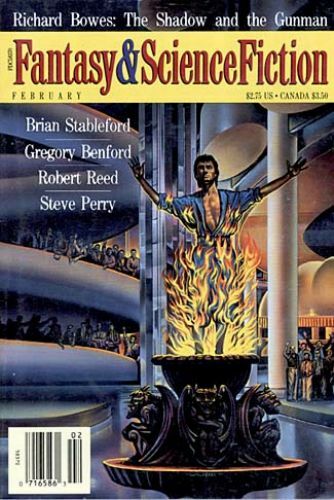 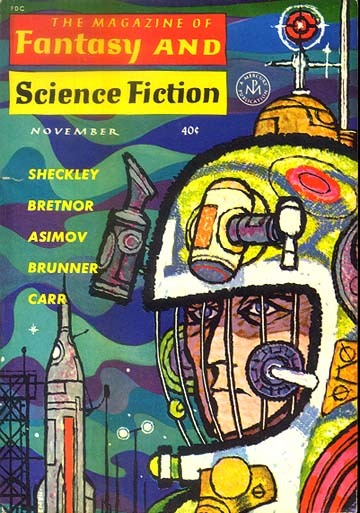 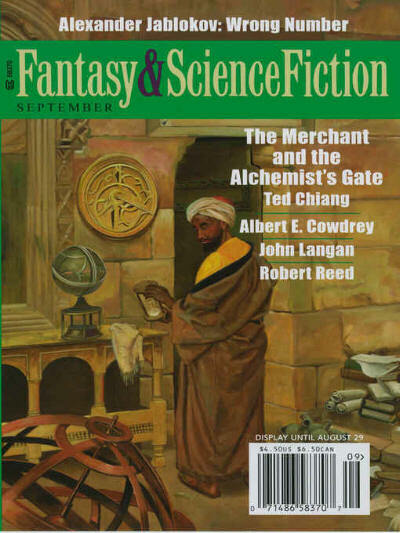 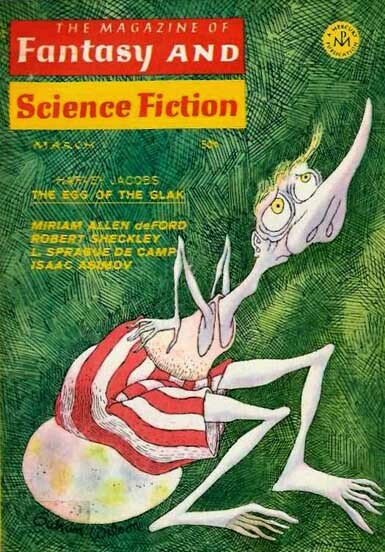 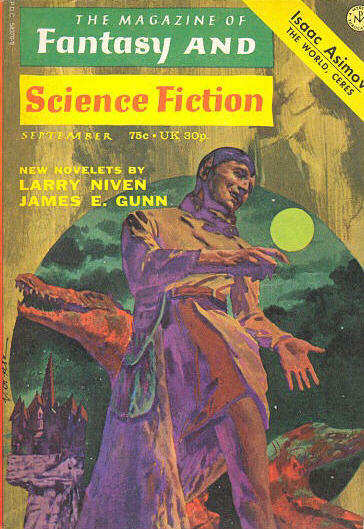 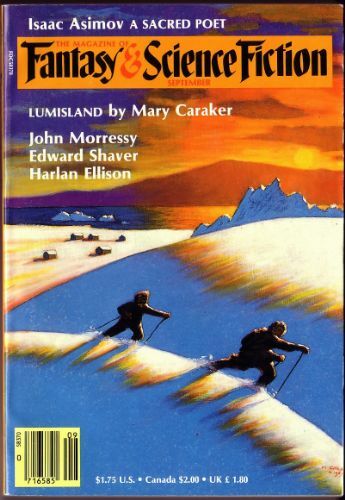 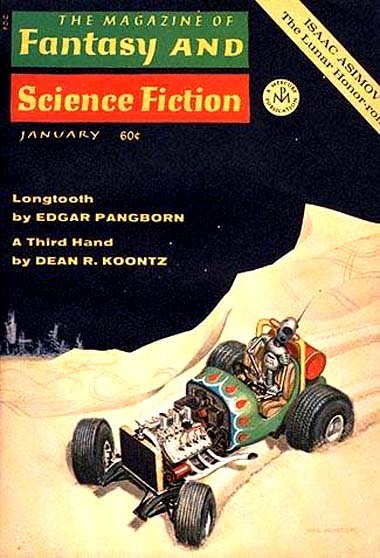 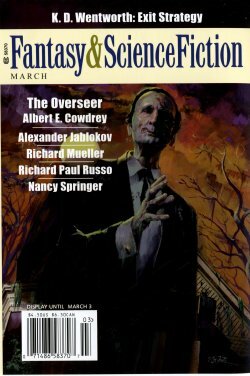 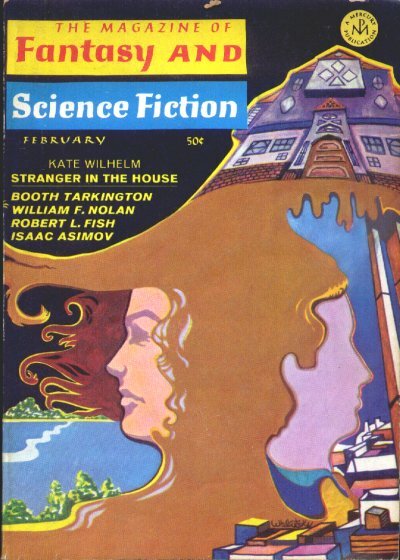 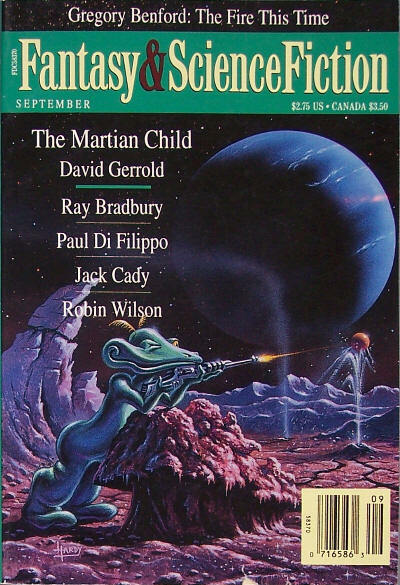 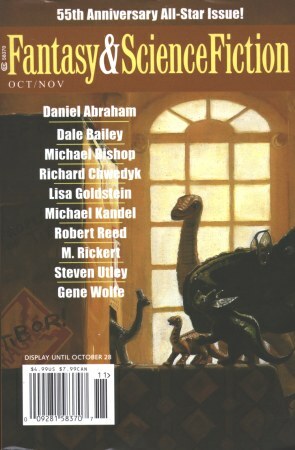 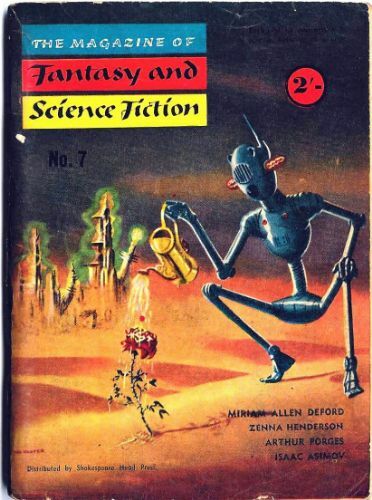 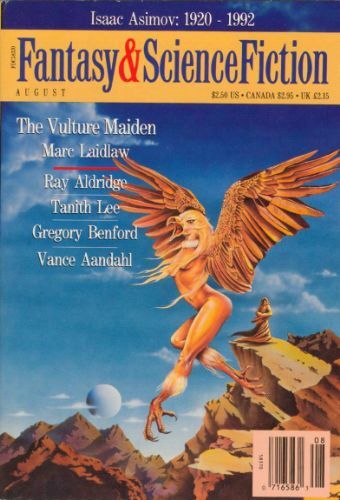 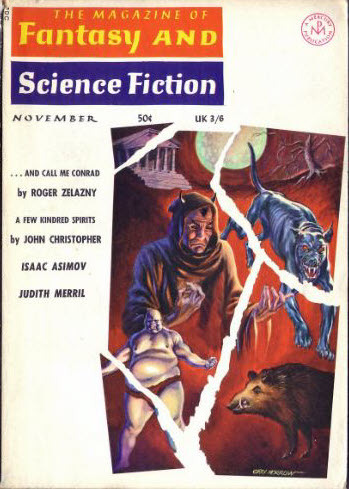 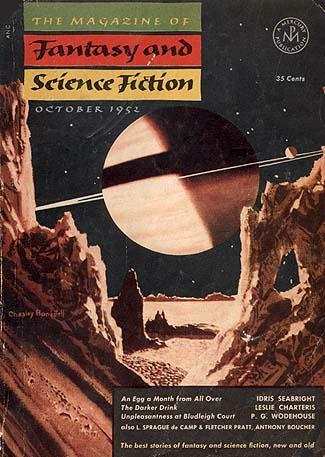 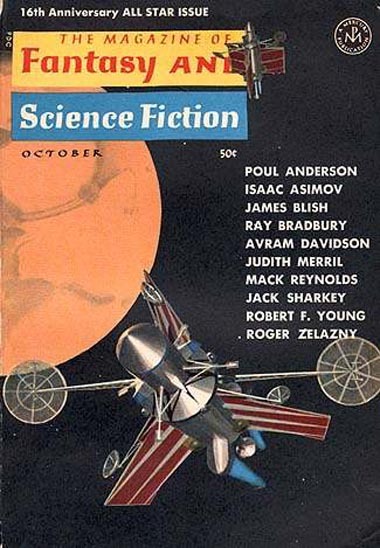 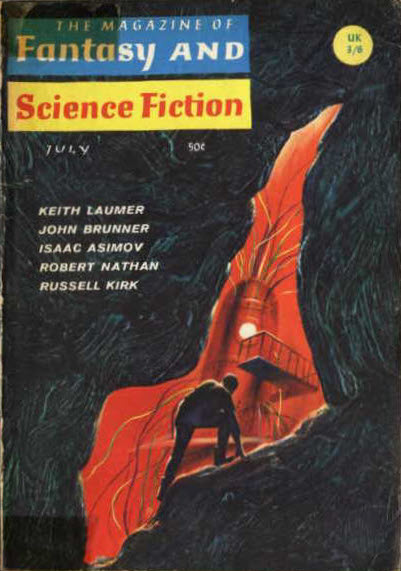 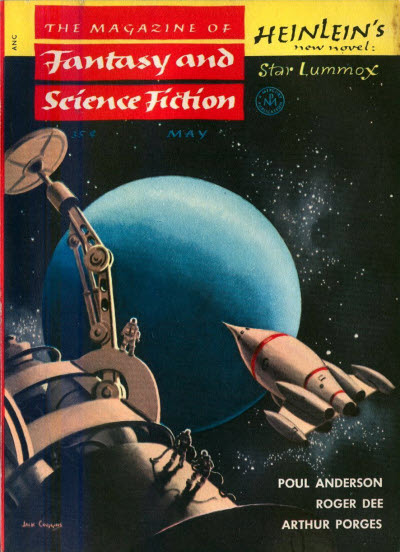 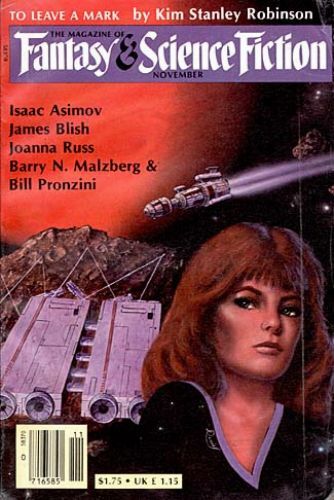 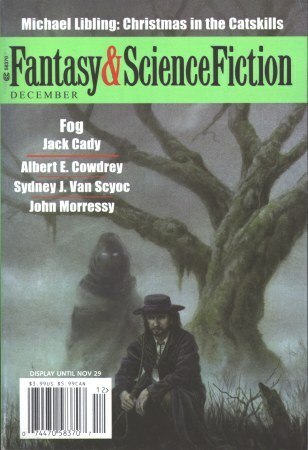 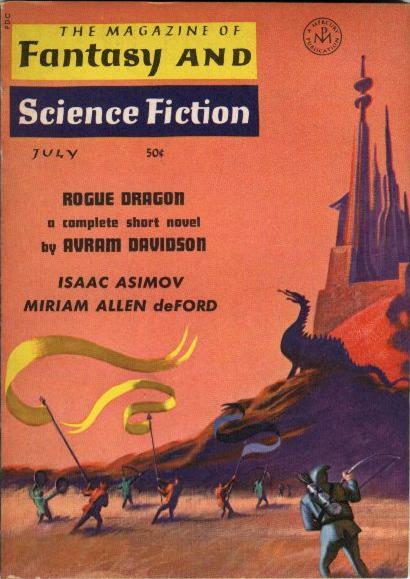 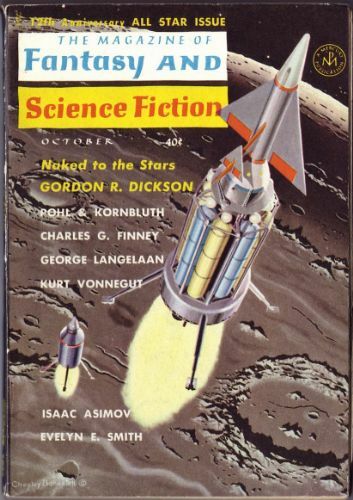 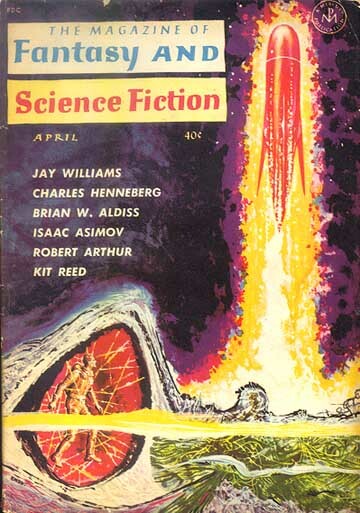 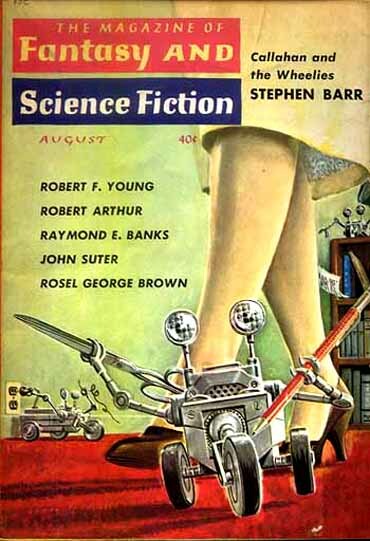 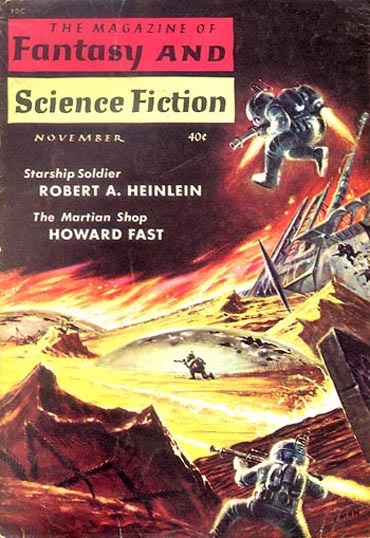 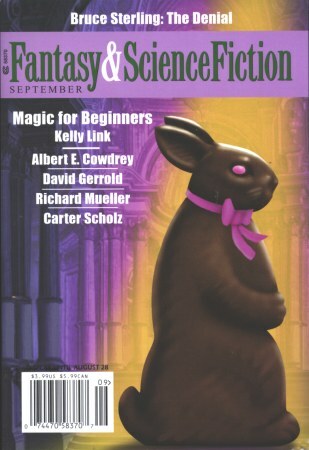 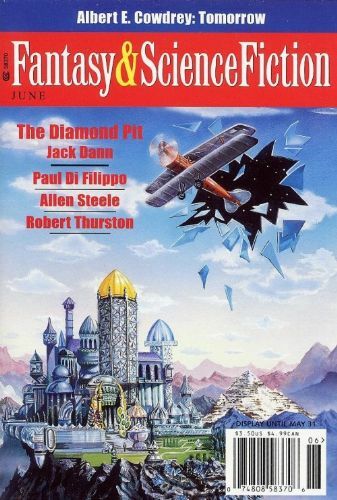 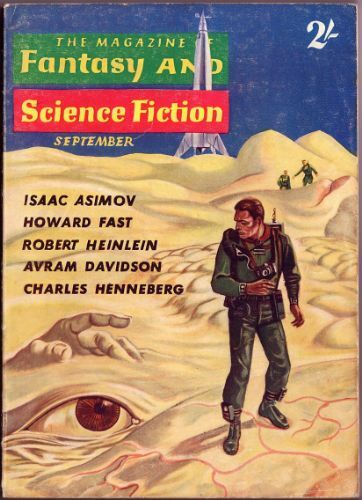 One of the most important science fiction and fantasy magazines, The Magazine of Fantasy and Science Fiction started life as a quarterly magazine titled The Magazine of Fantasy, switched to the current title with its second issue, shifted to a bimonthly scheduled with its fifth issue and a monthly schedule with its 15th issue, which it then maintained for 38 years before dropping back to 11 issues a year in 1991, a schedule that it maintained until 2008. 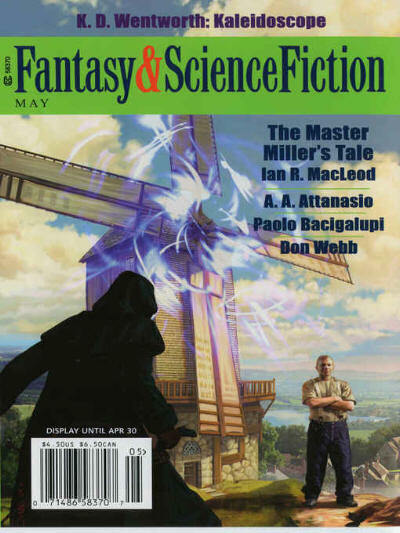 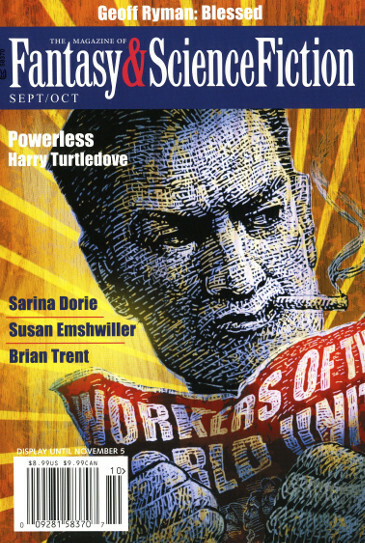 In April/May 2009 the frequency dropped to bi-monthly. 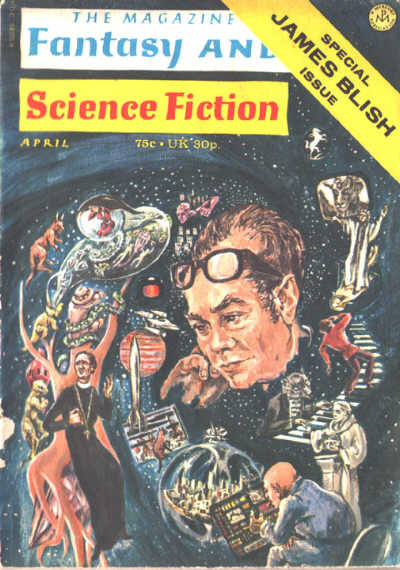 There were two separate British reprint editions, one running for 12 issues in 1953/54 and the other for 55 issues between 1959 and 1964. 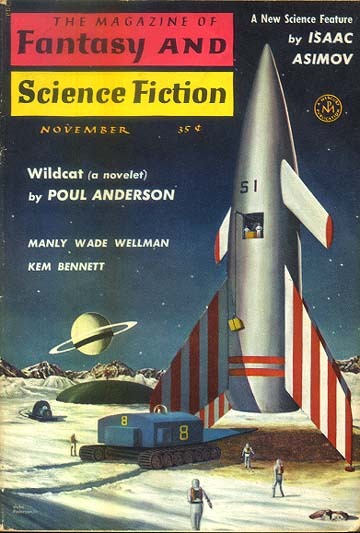 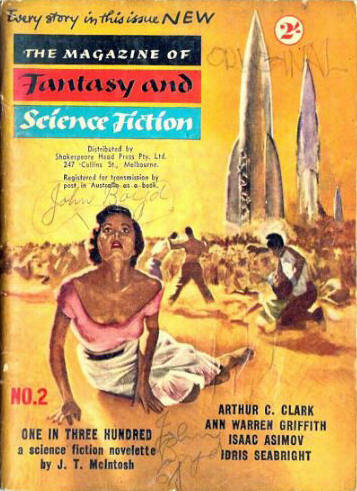 There were also 14 issues of an Australian reprint edition between 1954 and 1958. 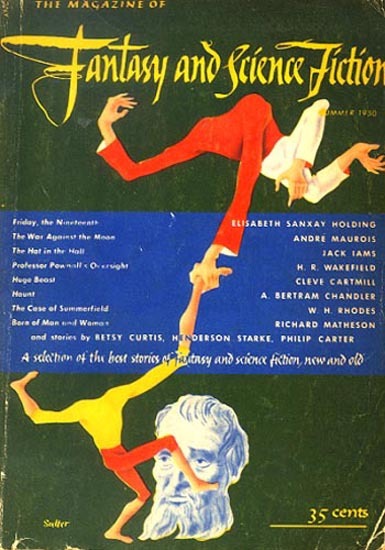 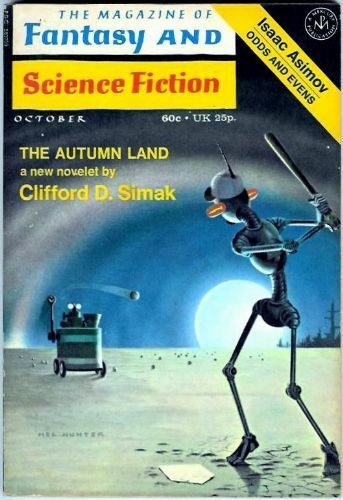 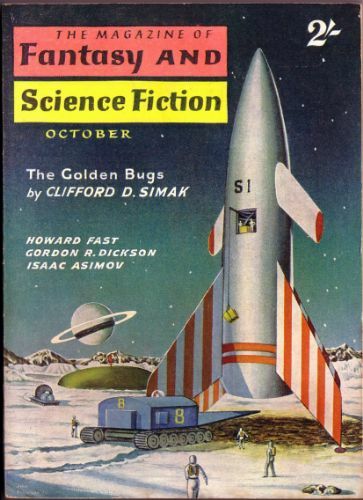 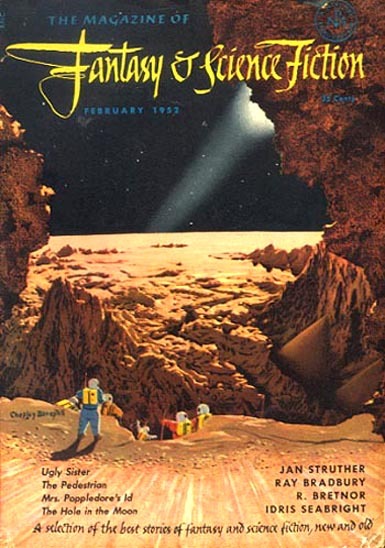 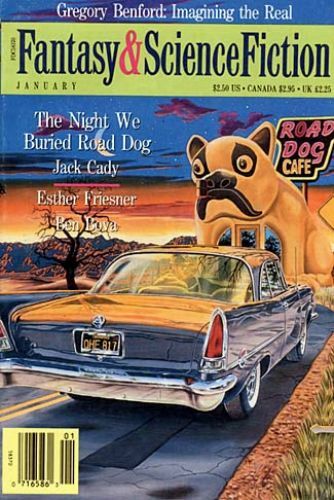 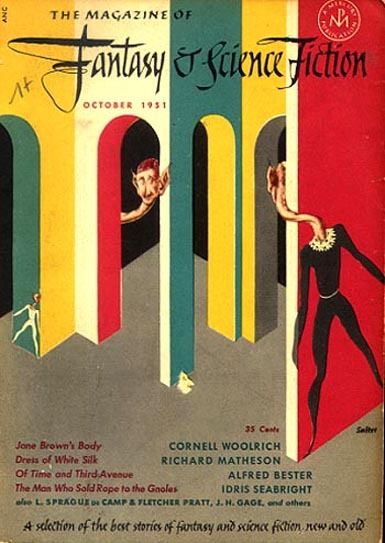 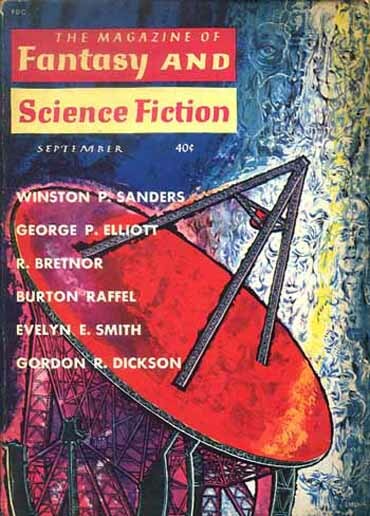 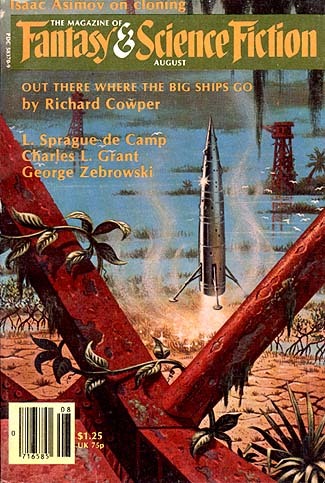 One curiosity is that, although the cover style changed in October 1952, copies of the July 1953 issue were published with both old and new cover styles. 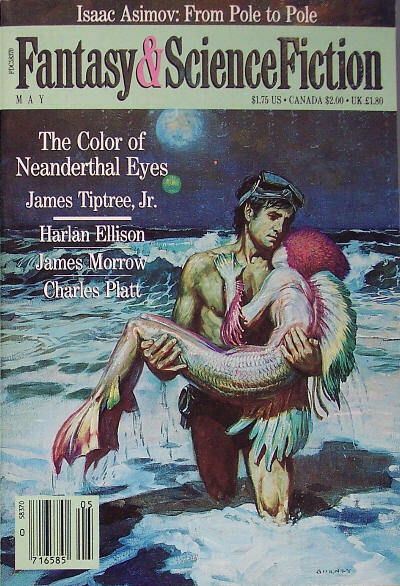 It is unclear what the purpose of this was. 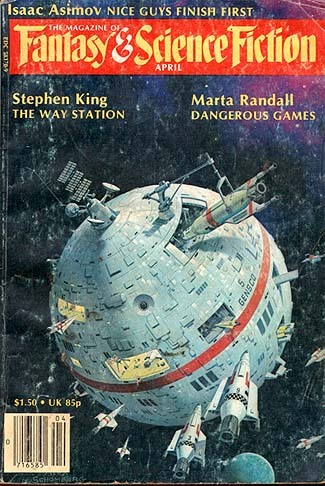 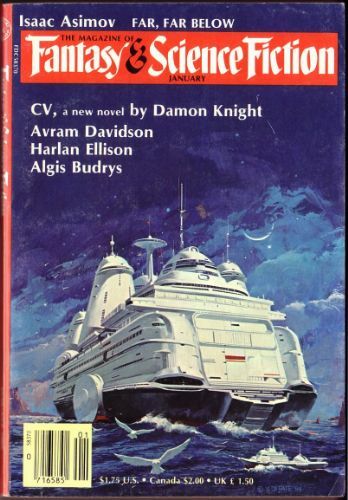 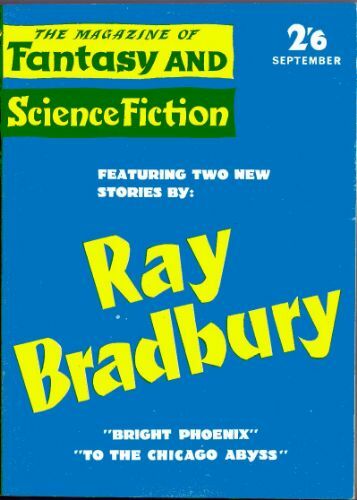 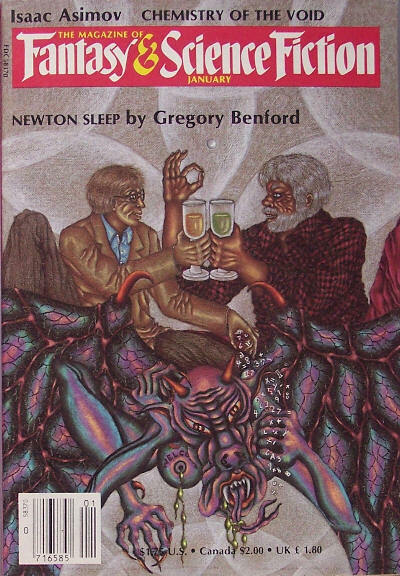 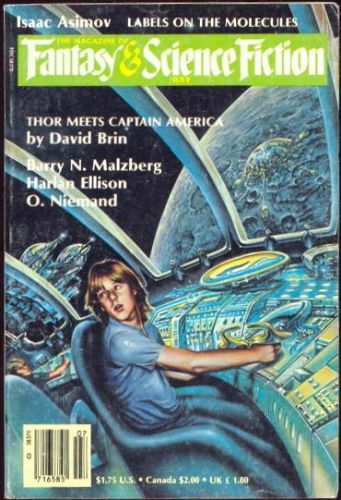 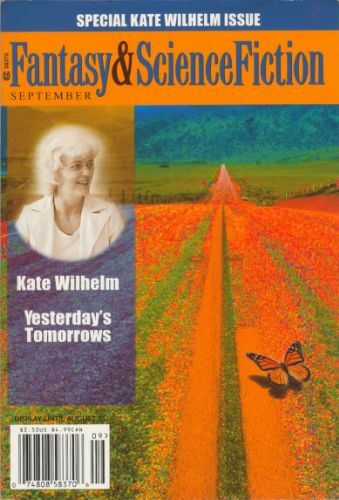 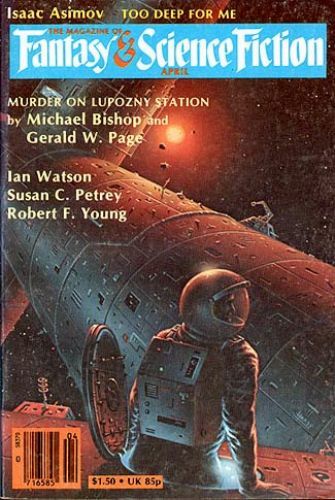 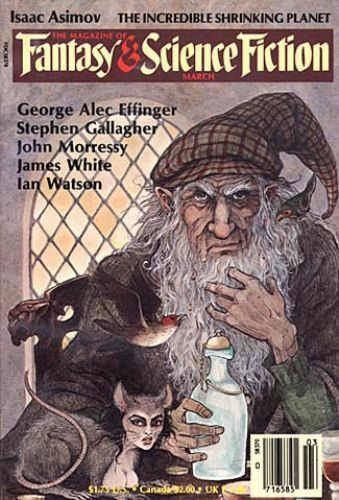 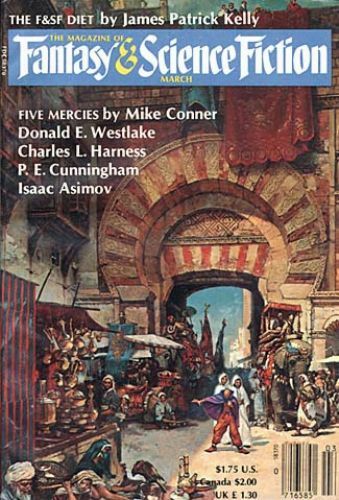 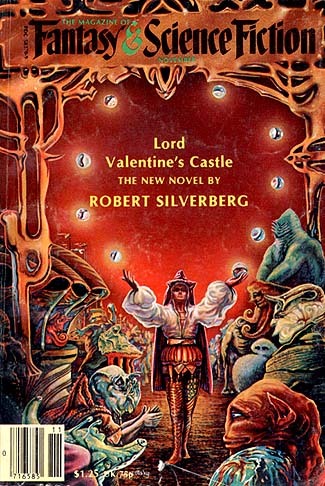 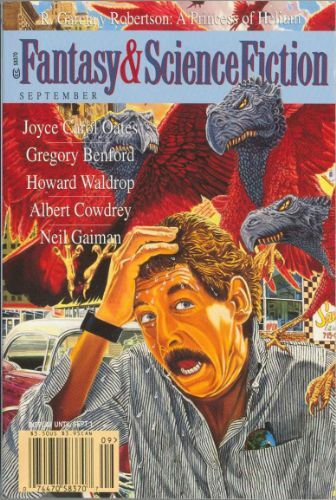 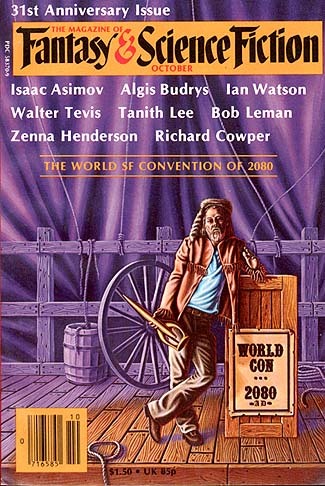 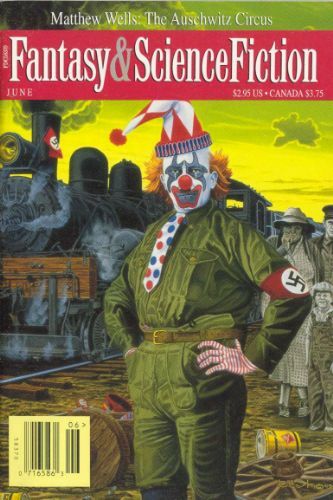 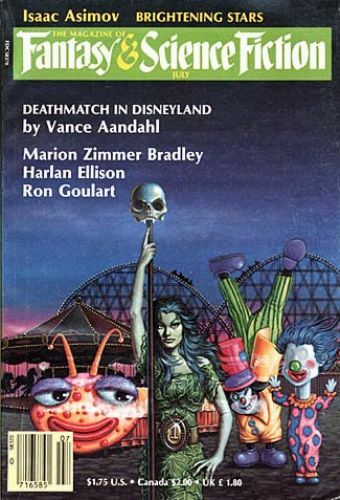 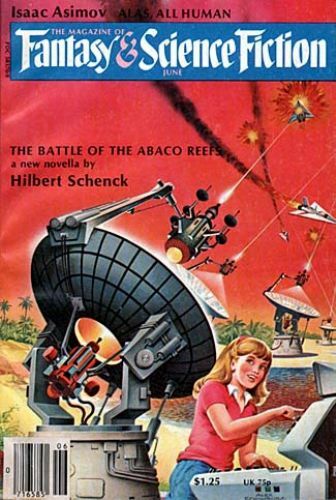 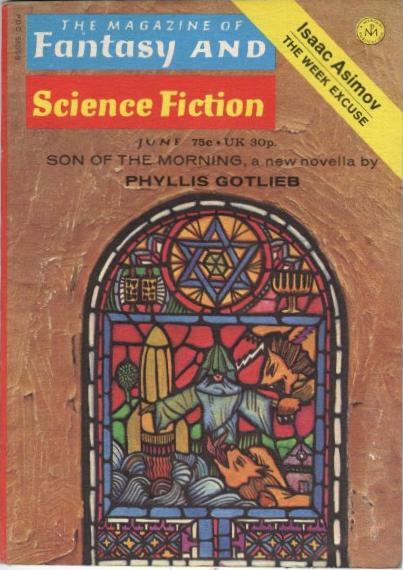 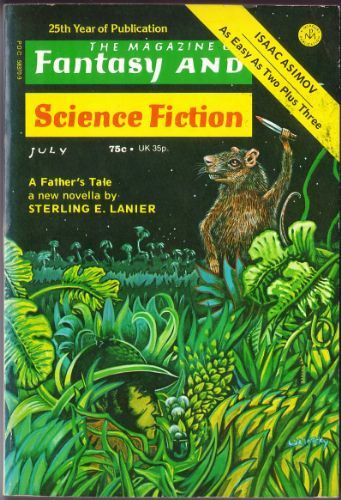 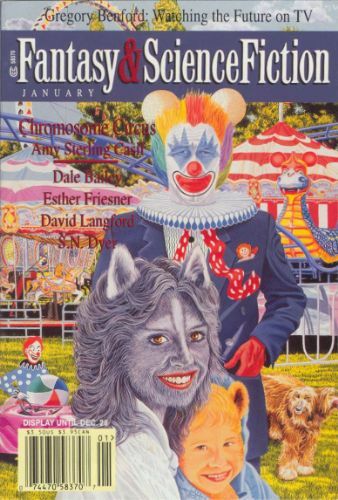 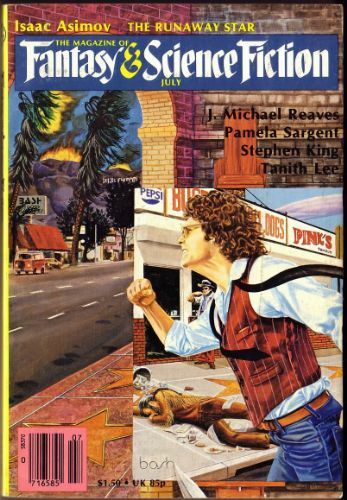 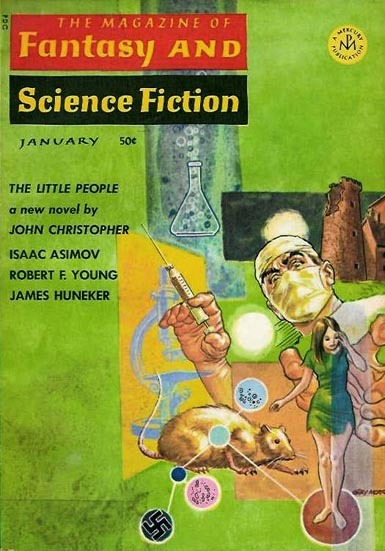 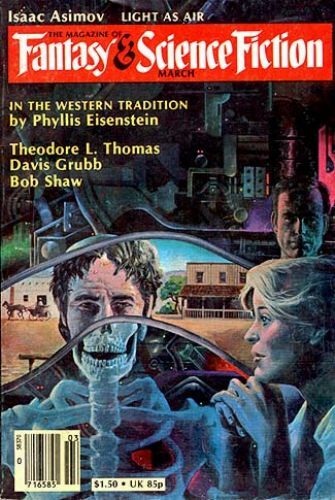 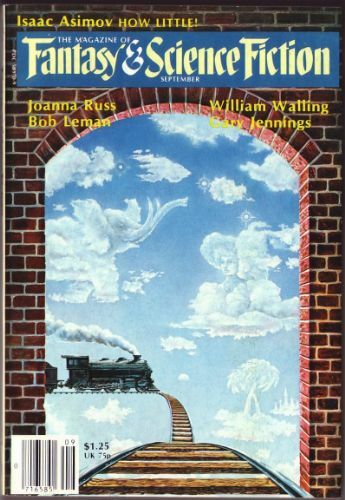 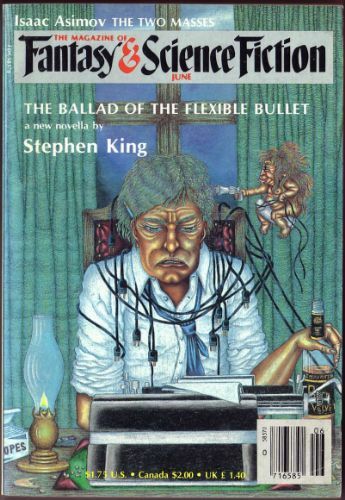 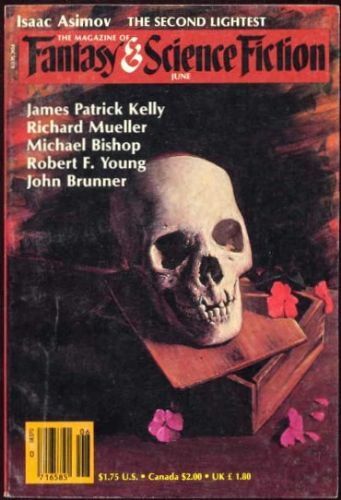 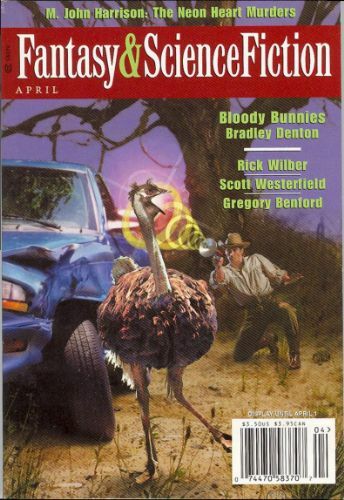 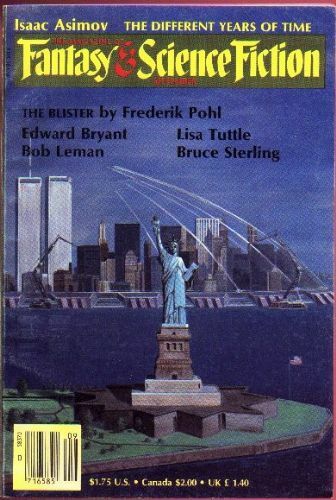 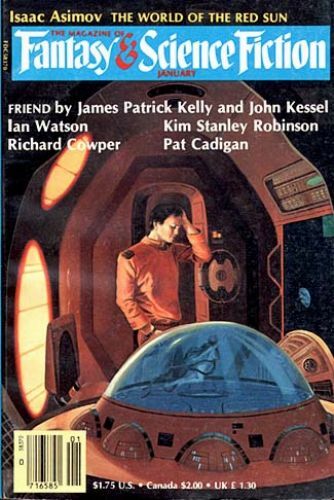 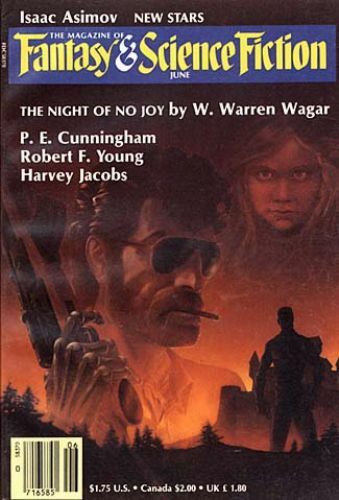 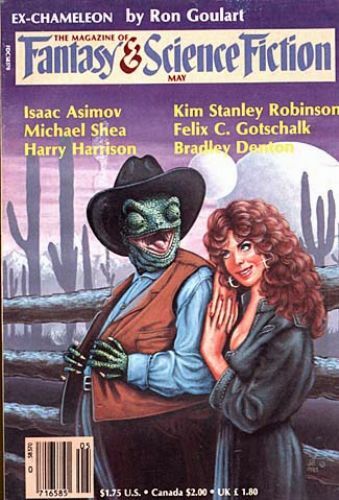 This edition may have been distributed in Australia with different cover prices, but no other differences, although this cannot be confirmed (and would have caused some confusion as the same covers were reused in the later Australian edition). 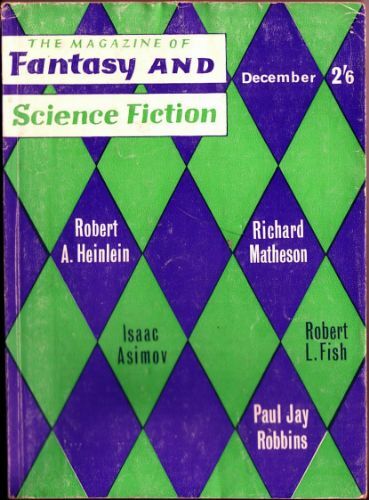 From December 1959 to June 1964 the British edition was printed in the UK and contained different contents from the US edition. 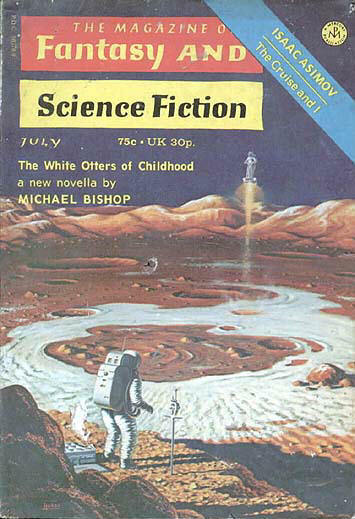 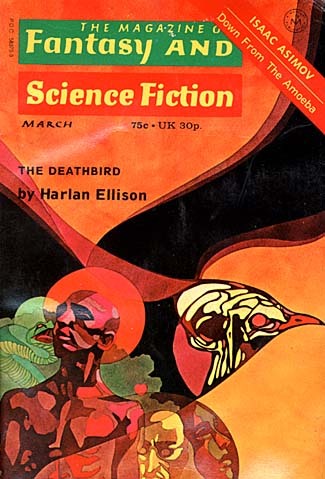 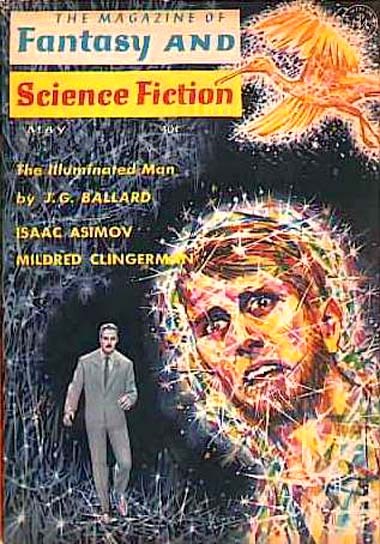 After June 1964 the US edition was imported directly to the UK but, for a number of years, had a UK price printed on the cover (in addition to the US price). 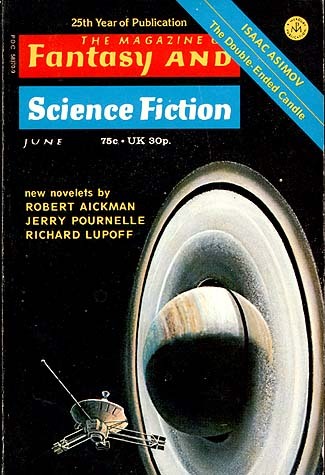 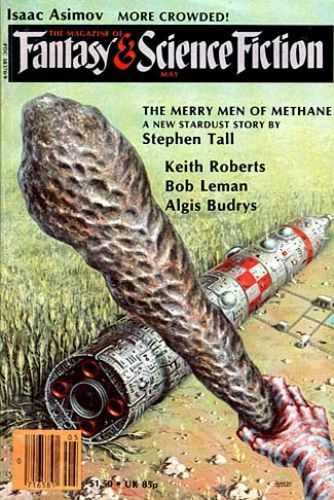 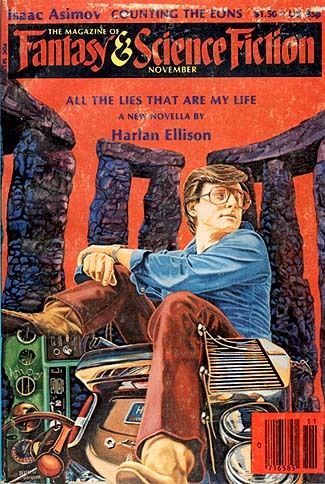 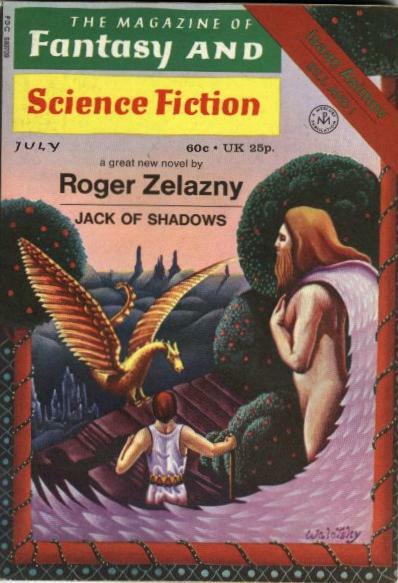 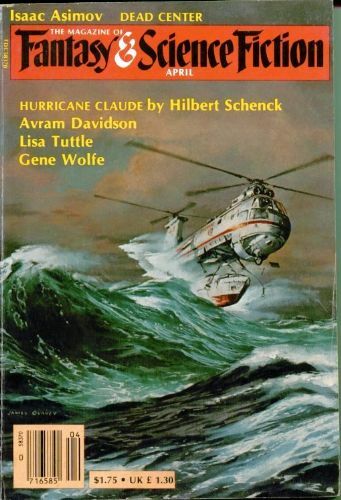 The precise details of this variation is currently unclear - it appears that from August 1970 all worldwide editions also listed a UK price on the cover and four earlier covers (October and November 1969 and March and April 1970) have so far only been located with both US and UK prices (and are shown above). 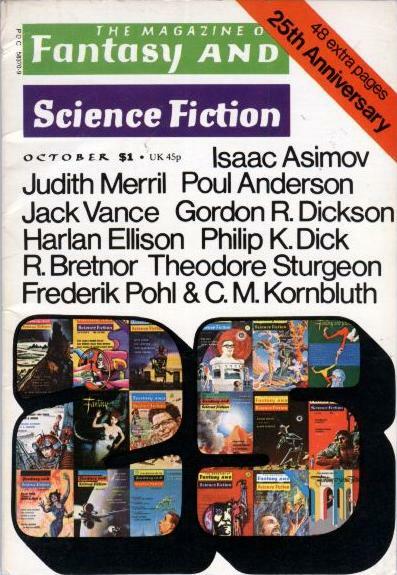 As such, it is possible that some of the gaps in the following table correspond to issues that were never distributed with a UK price variant.